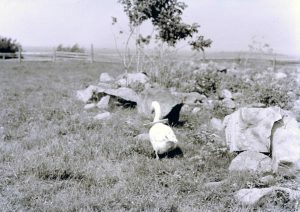 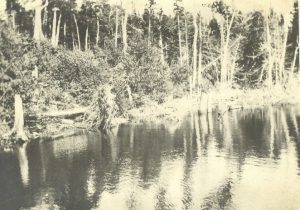 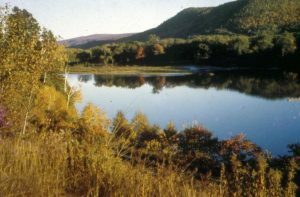 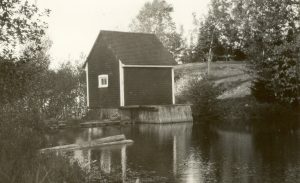 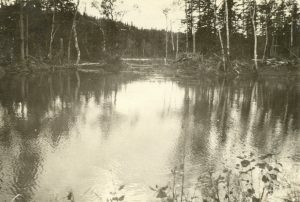 Photograph showing the pond near the lighthouse. 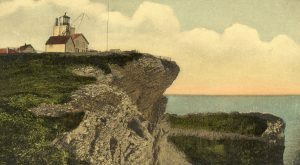 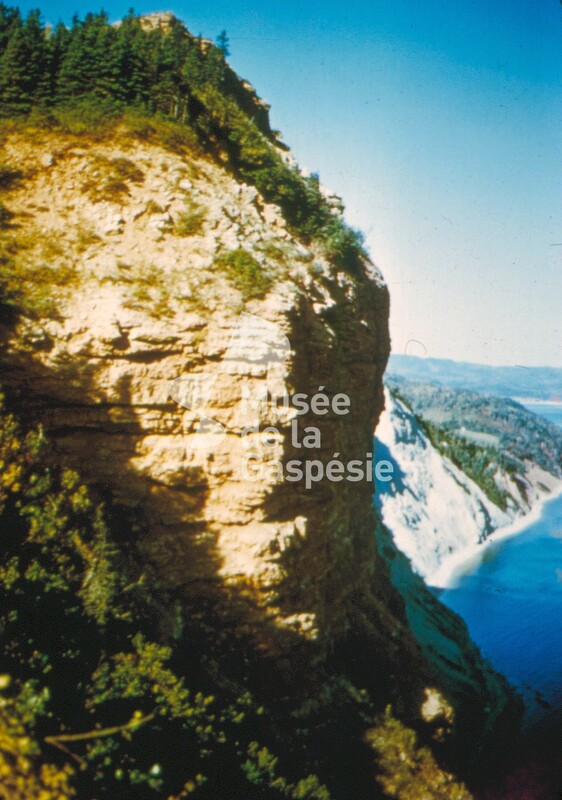 The descent to Cannes-de-Roches. 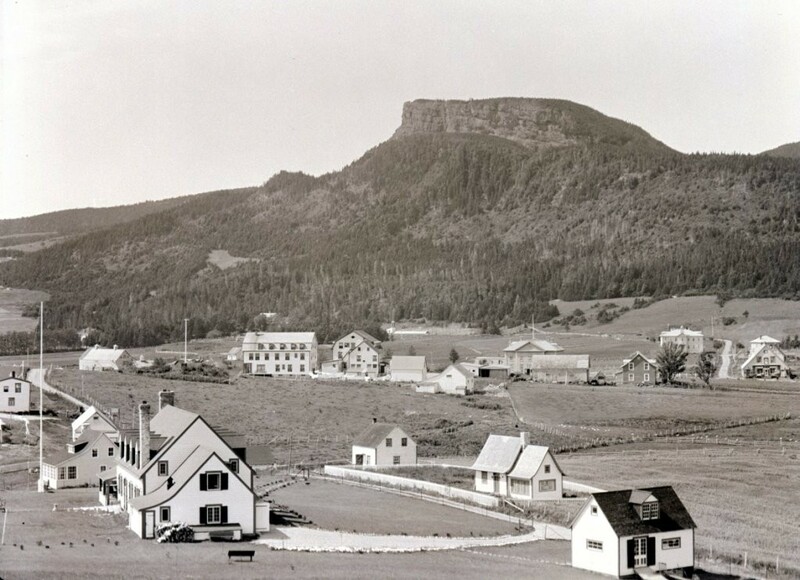 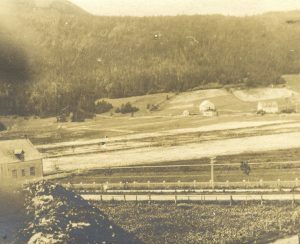 The building in the foreground was a part of the World War I military camp. 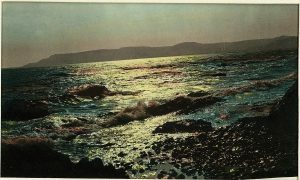 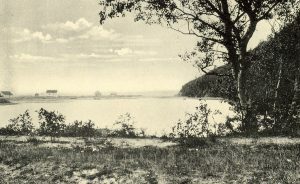 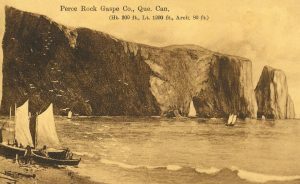 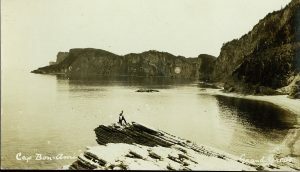 The postcard shows a view of the cove at Grand-Étang. 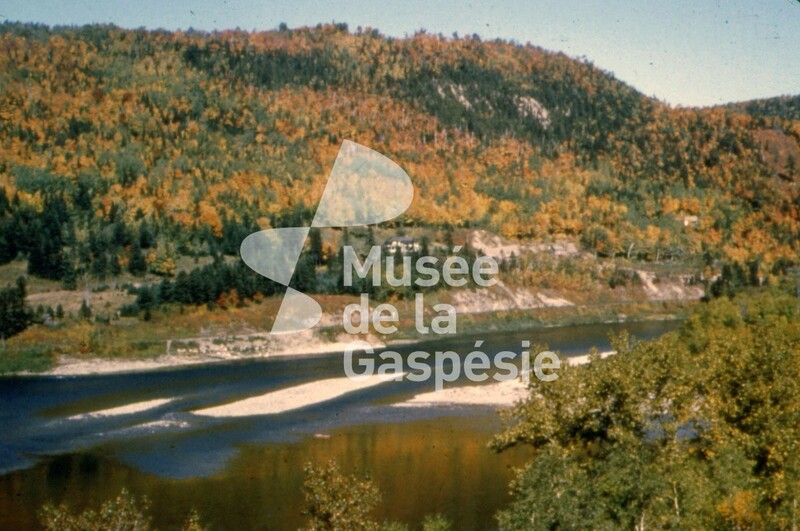 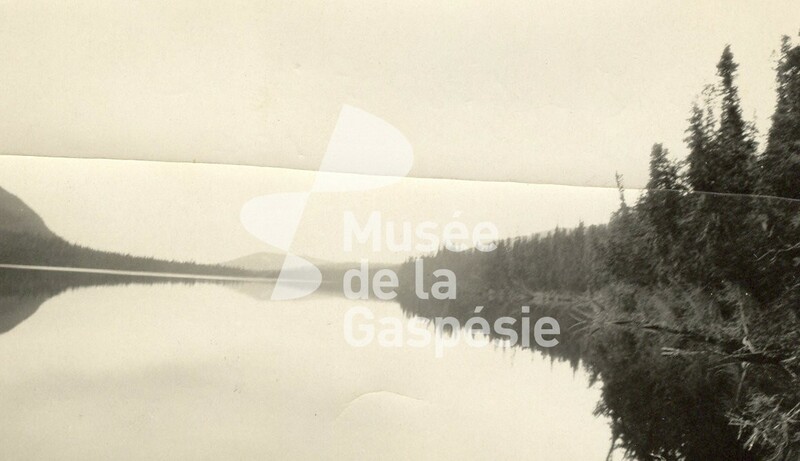 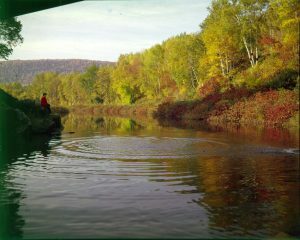 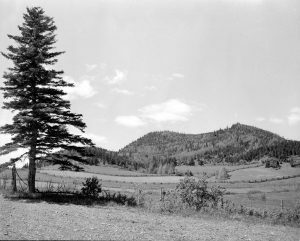 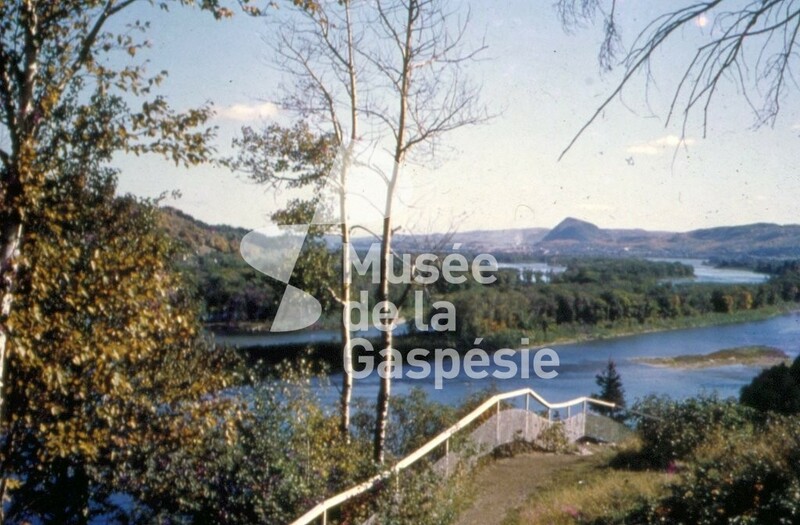 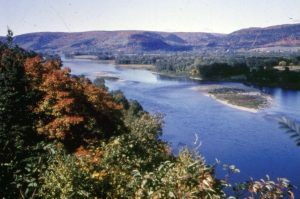 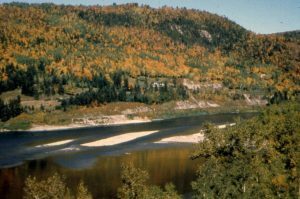 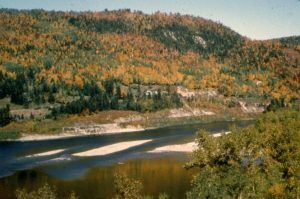 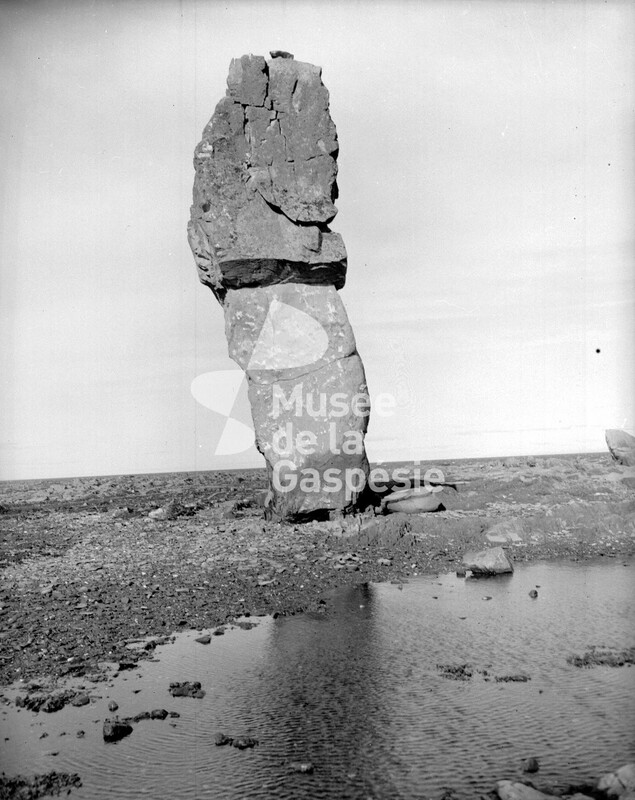 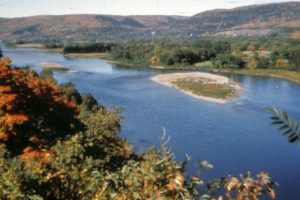 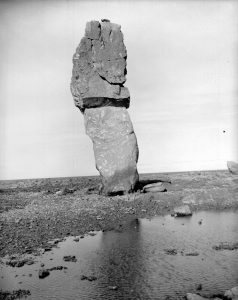 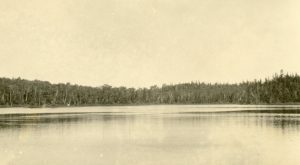 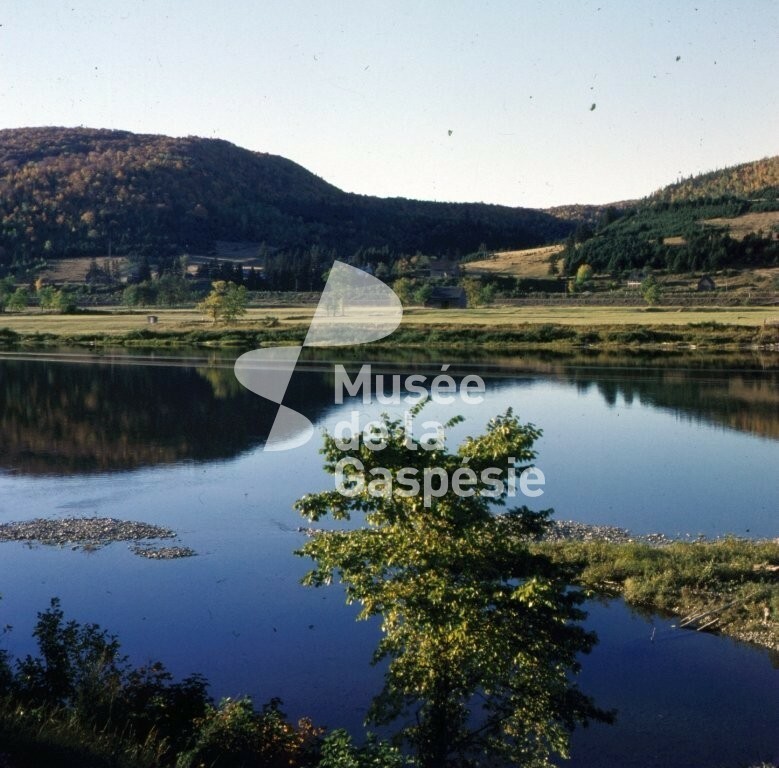 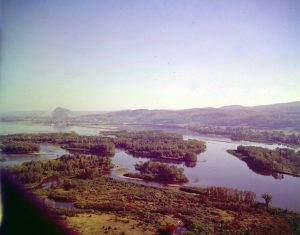 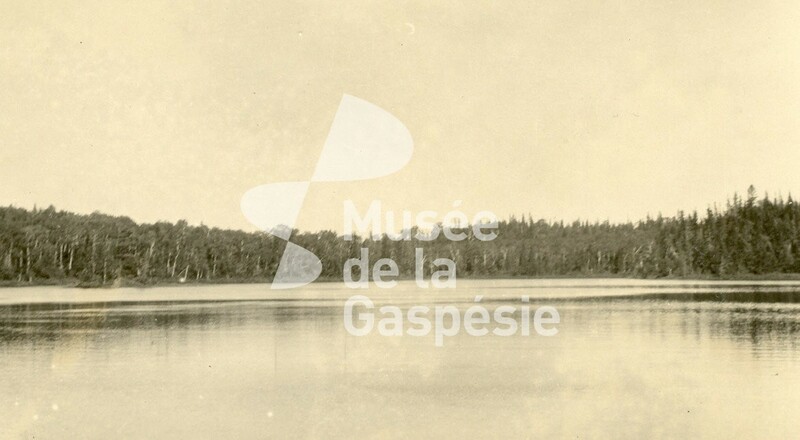 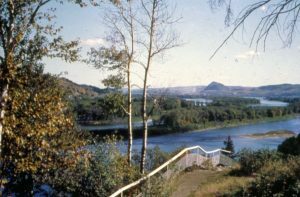 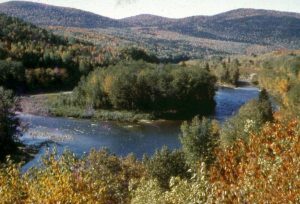 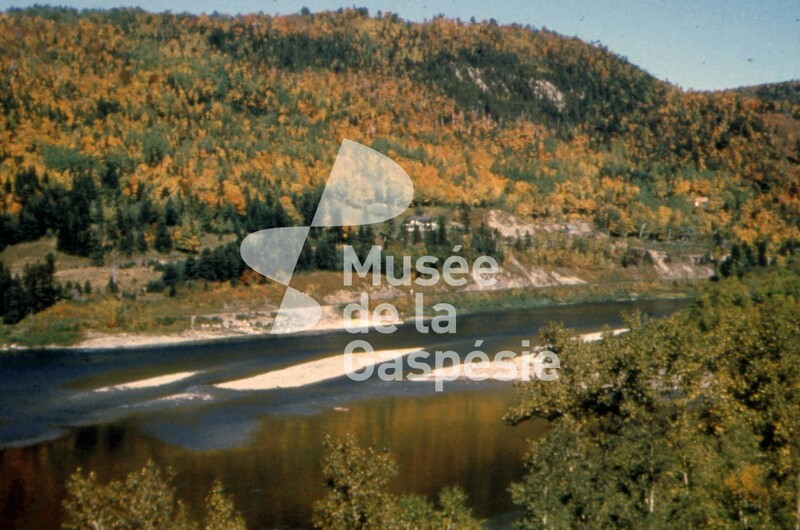 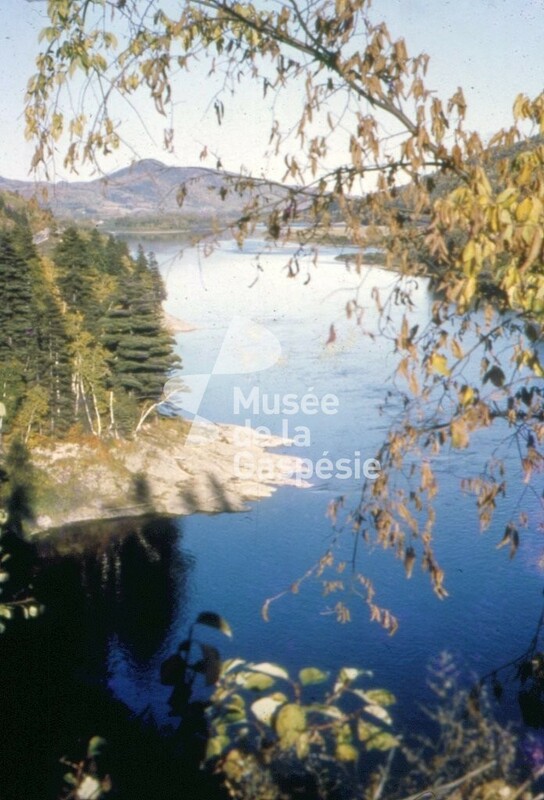 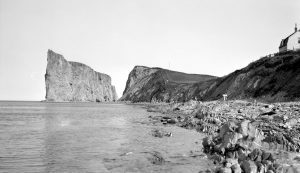 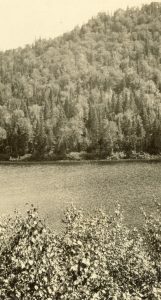 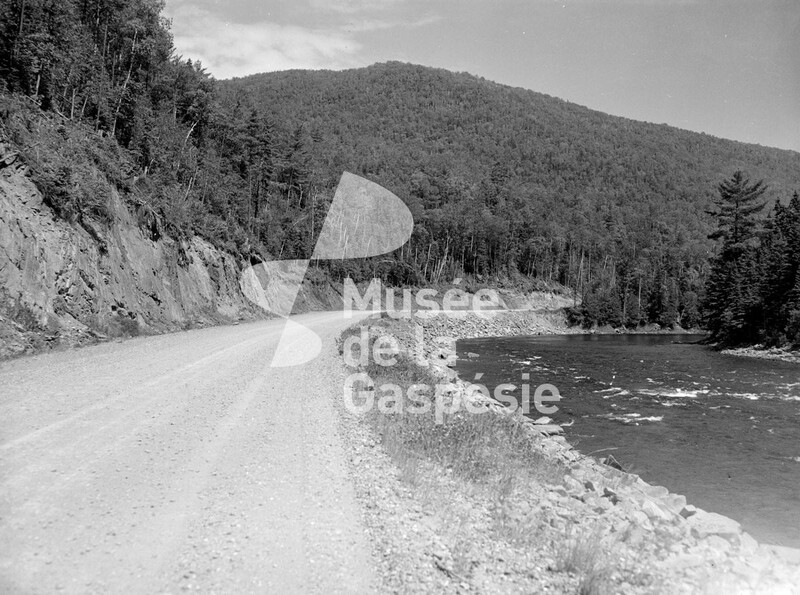 Negative showing a view of the Morissey Rock islands in the Restigouche river, near Campbellton, N.B. 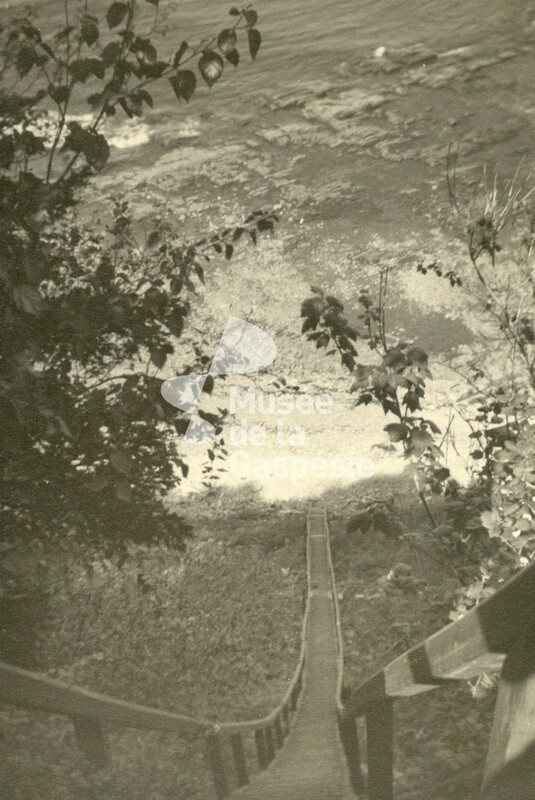 Negative showing a view of a part of Saint-Omer village. 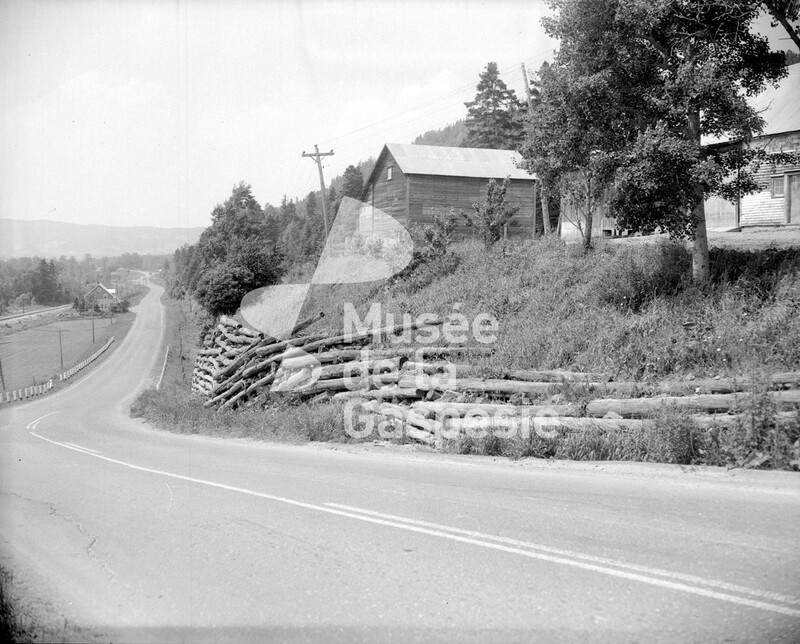 Negative showing a view of Carleton village from Mont Saint-Joseph. 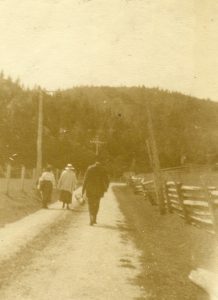 Bishop Charles-Eugène Roy, in the foreground, is talking to a woman. 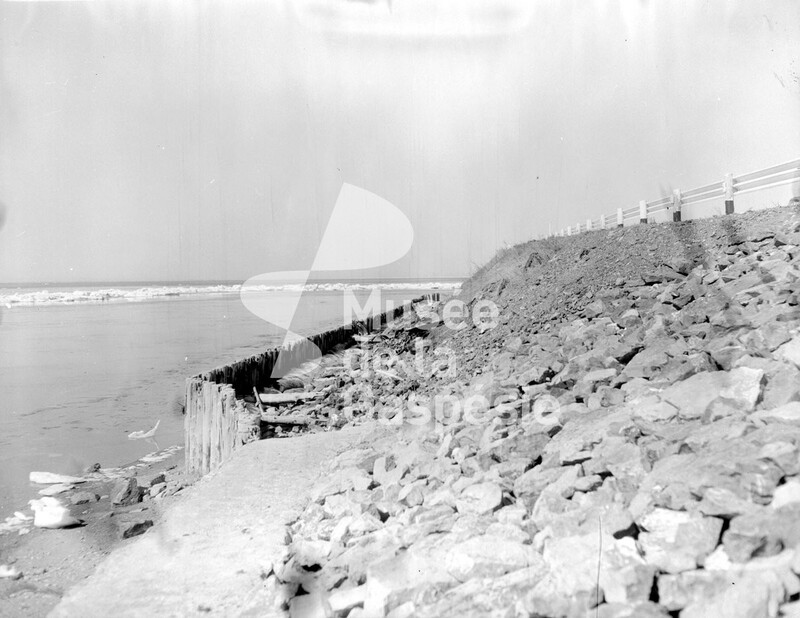 Negative showing a retaining wall near the shore. 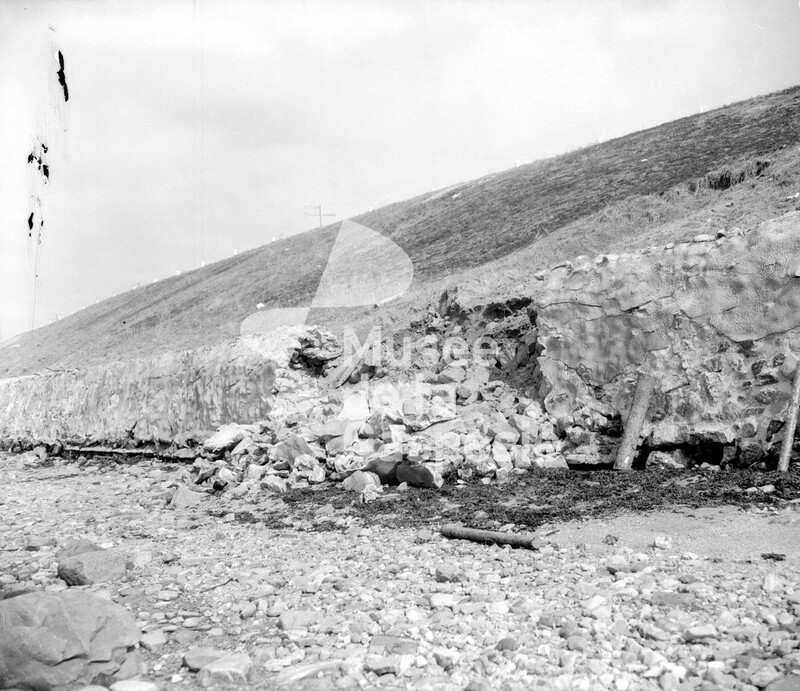 Negative showing a breach in a retaining wall near the shore. 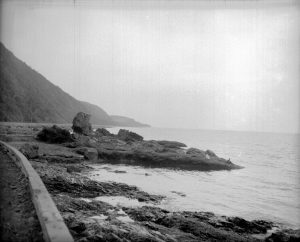 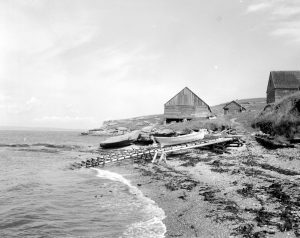 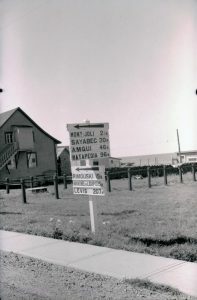 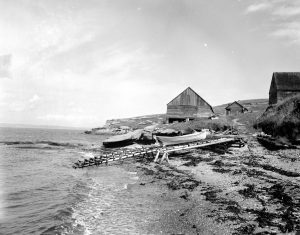 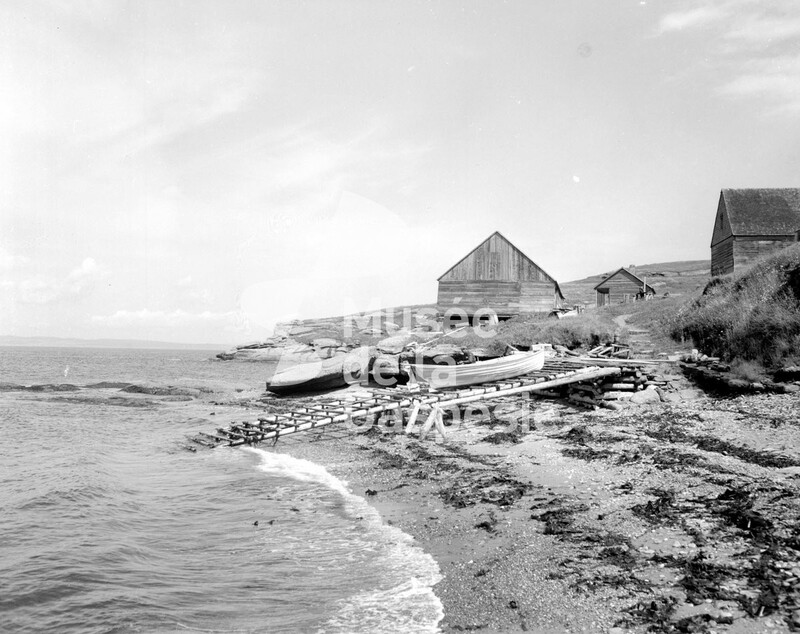 Negative showing part of the shore and some buildings alongside a road. 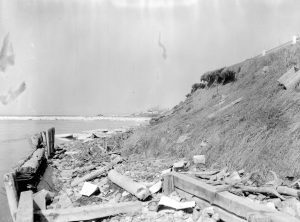 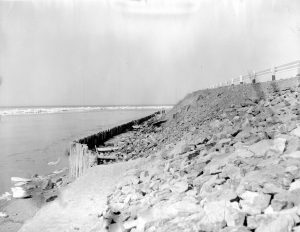 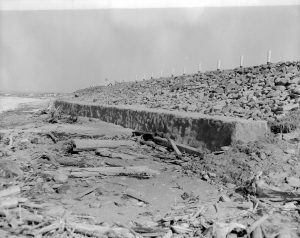 Negative showing a cement retaining wall near the shore. 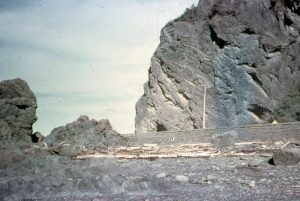 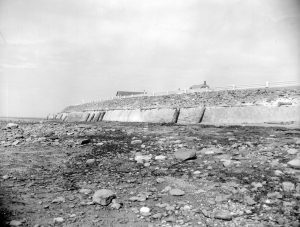 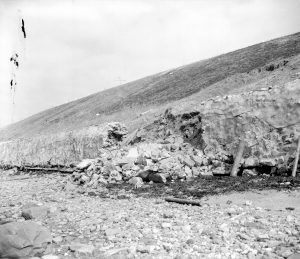 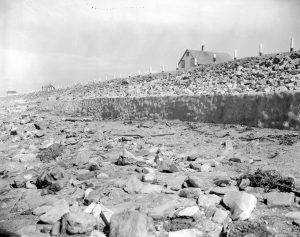 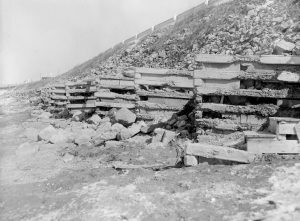 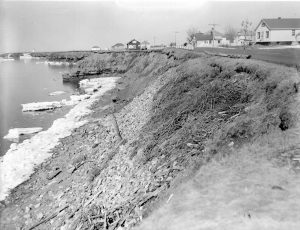 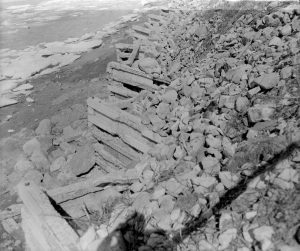 Negative showing a stone and wood retaining wall near the shore. Negative showing a wood spike retaining wall near the shore. 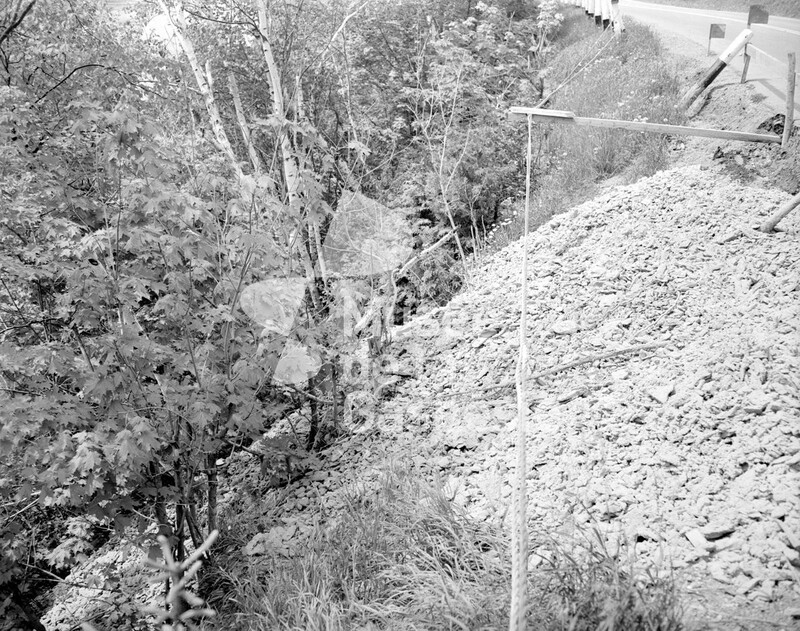 Negative showing a landslide in Matapédia. 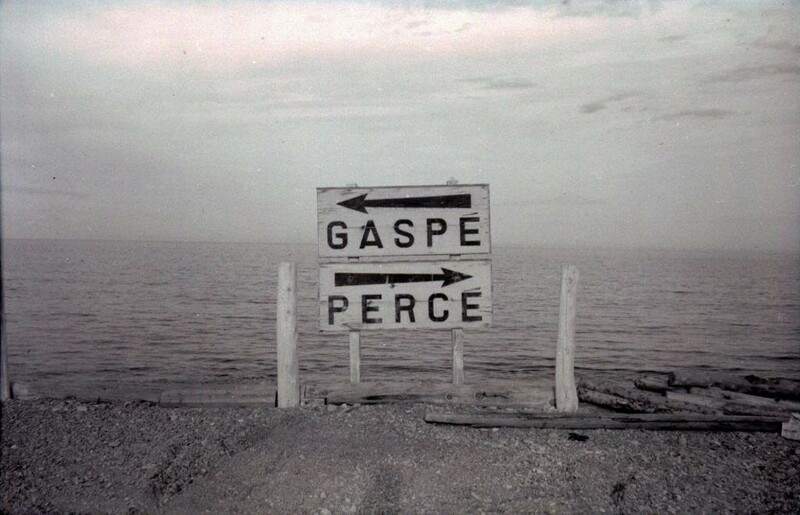 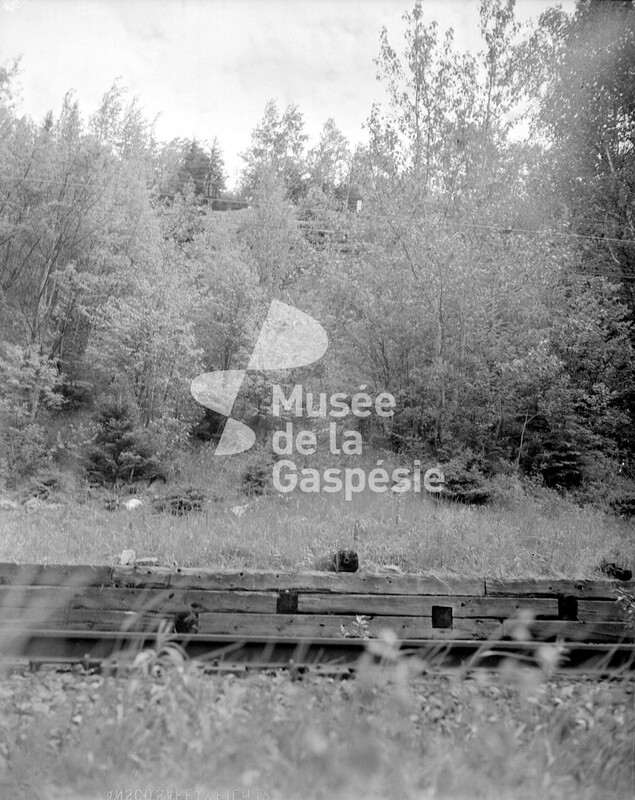 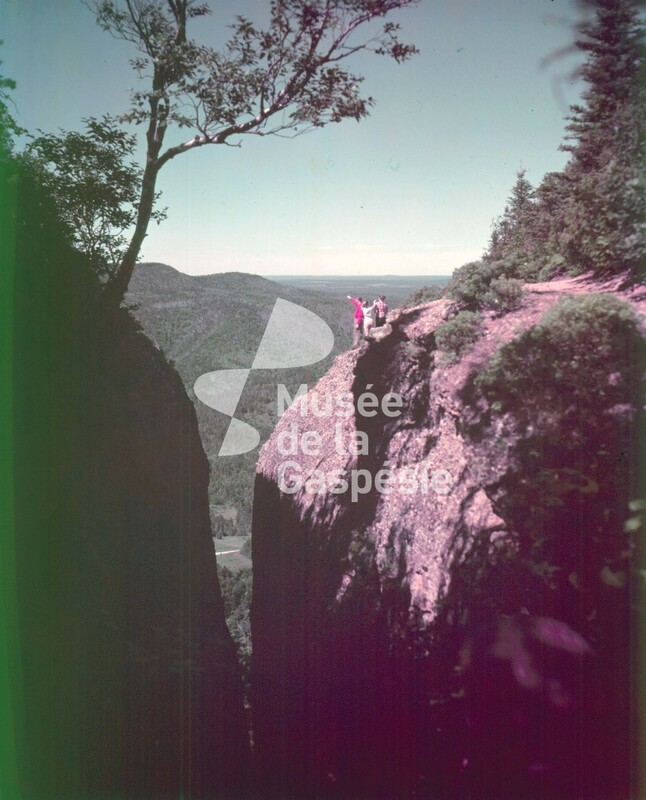 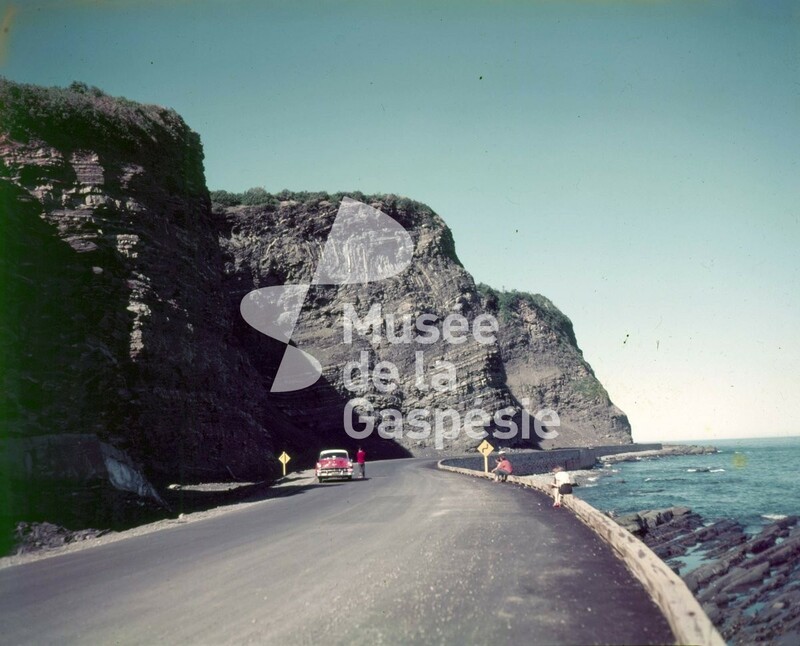 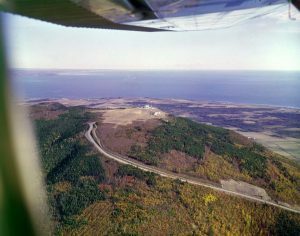 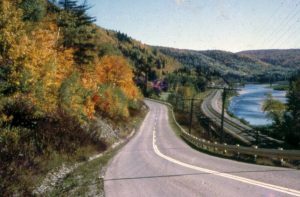 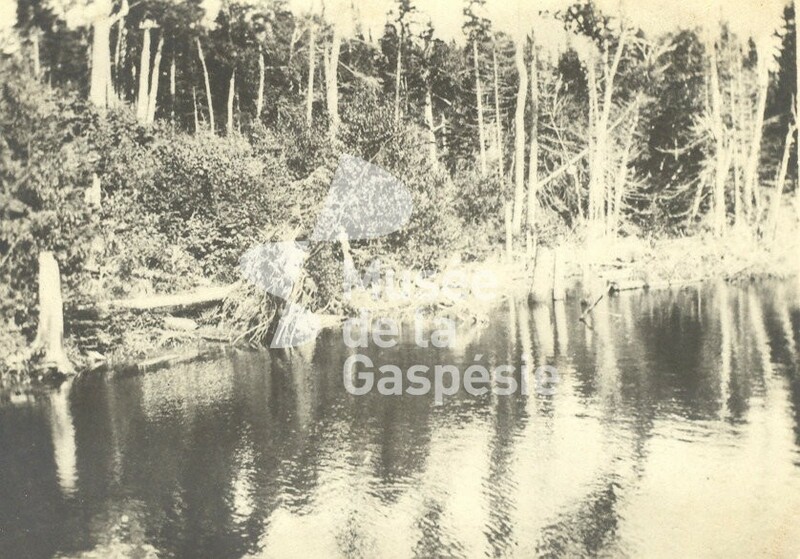 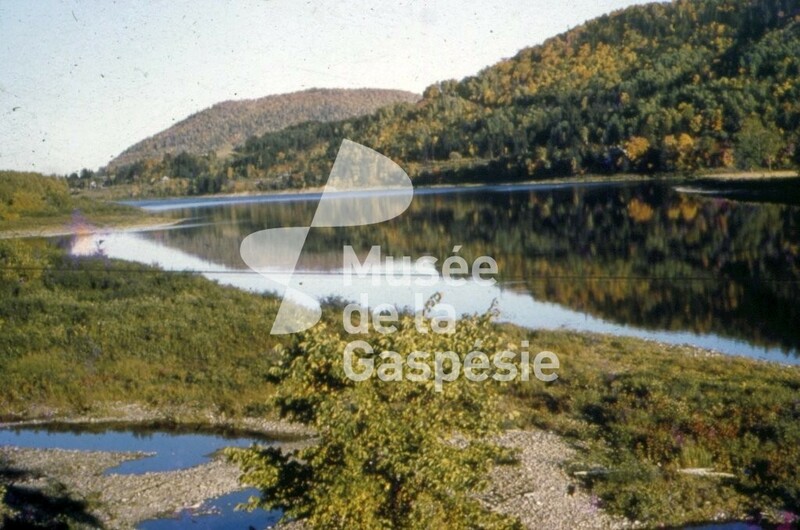 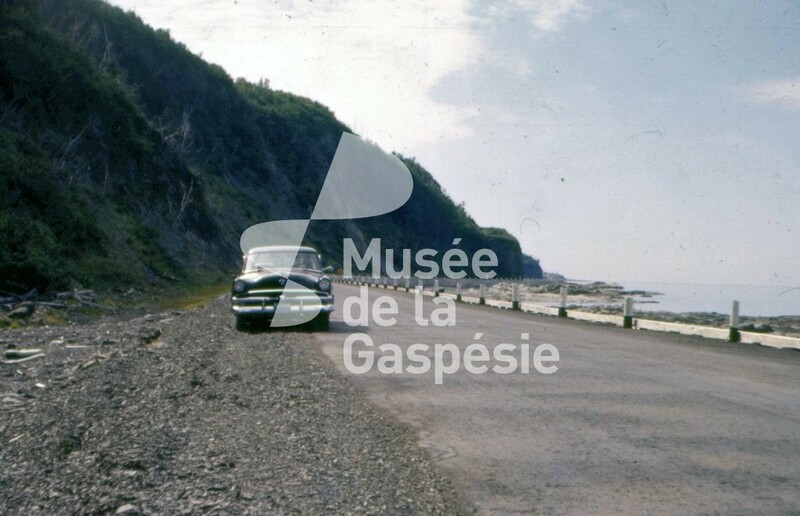 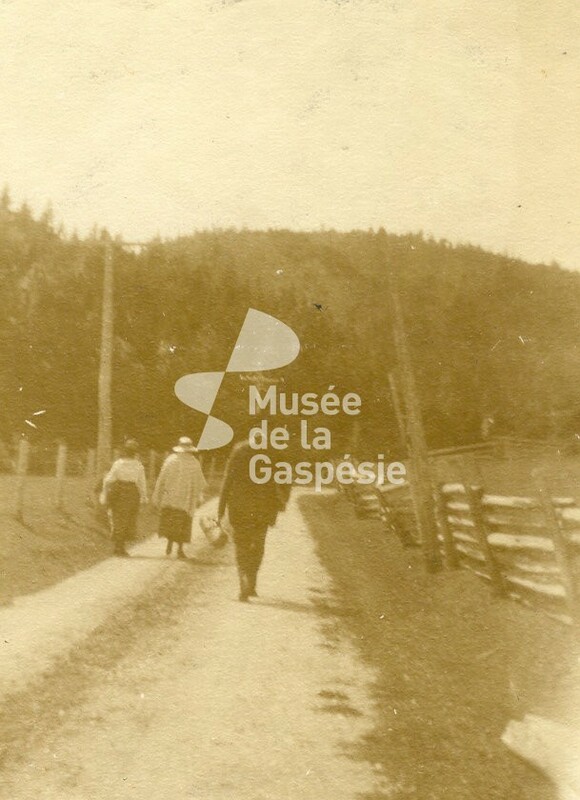 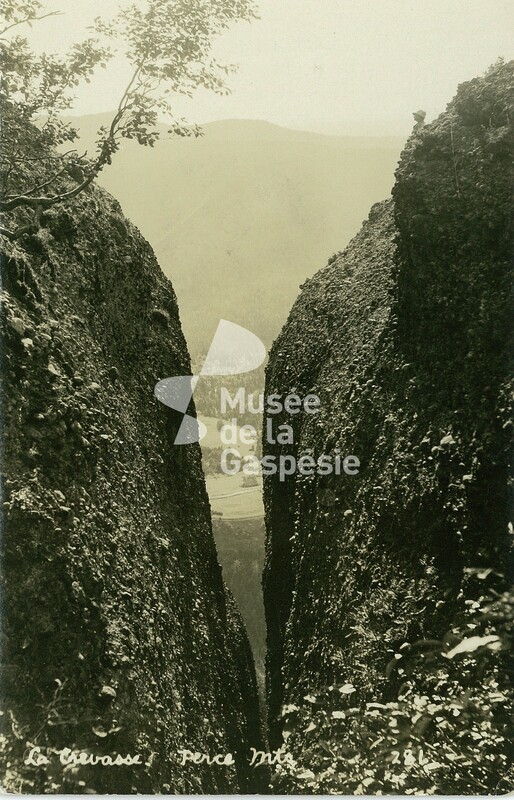 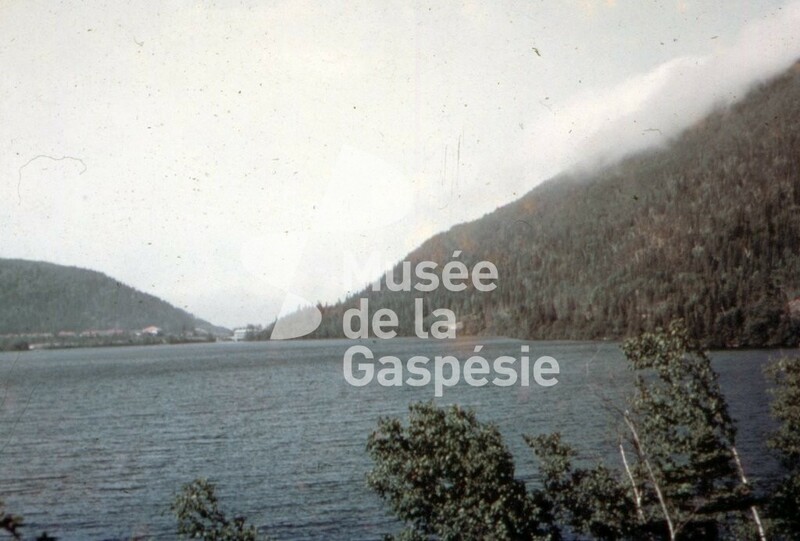 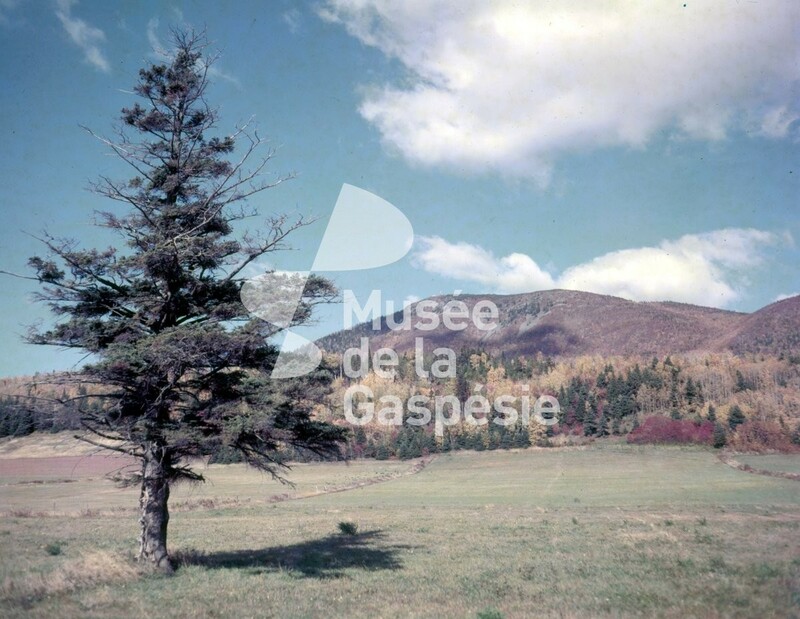 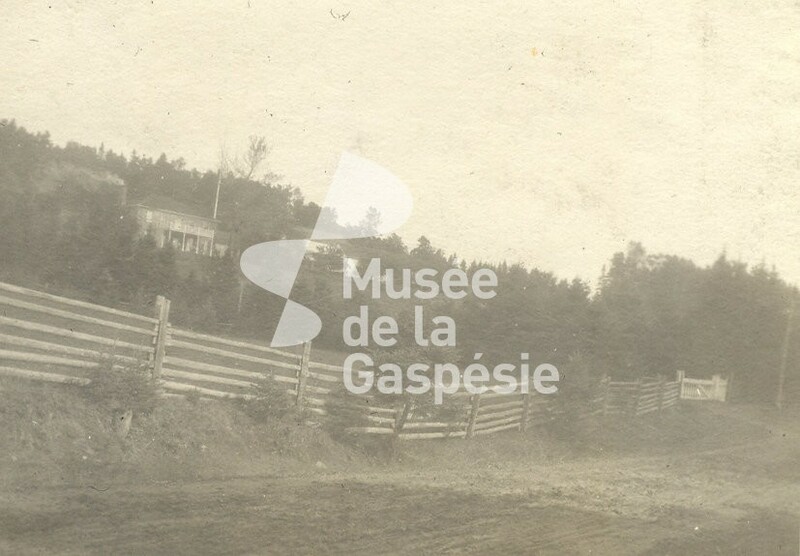 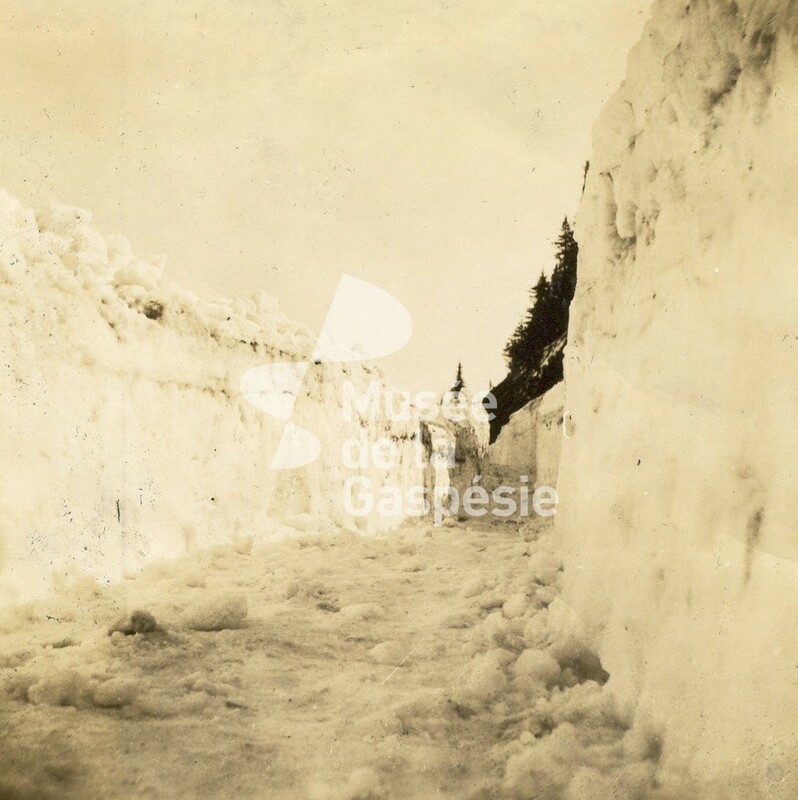 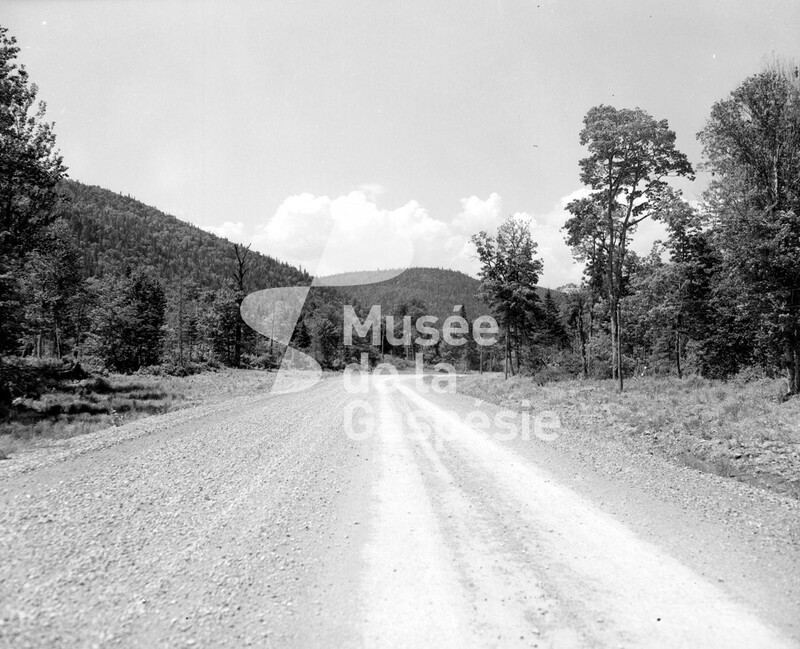 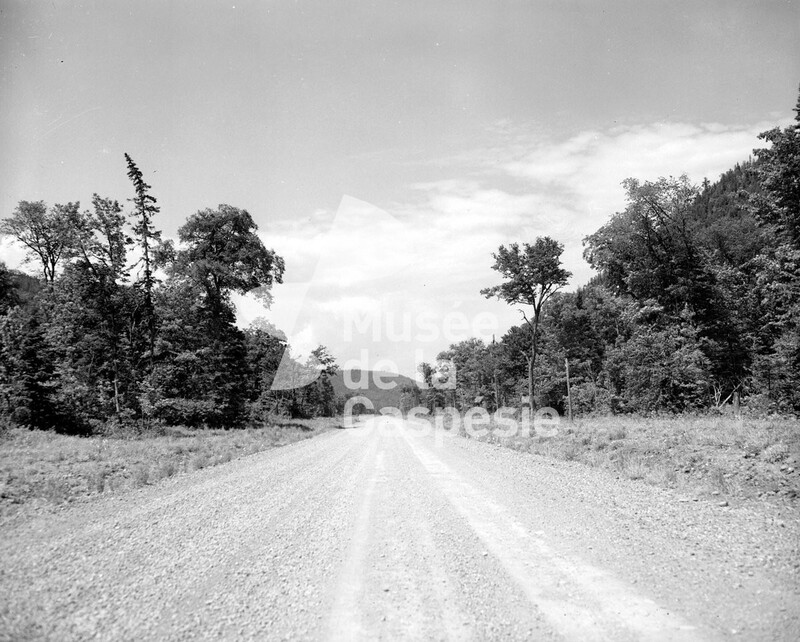 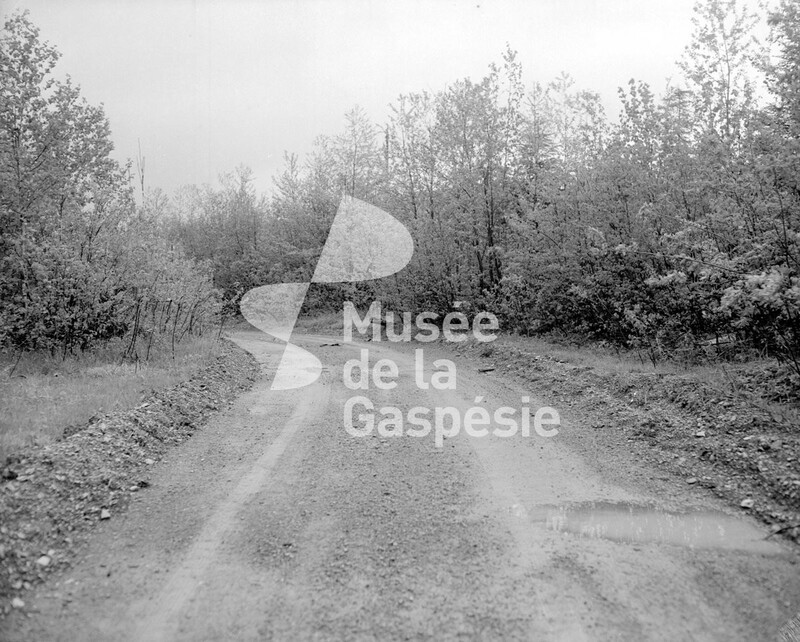 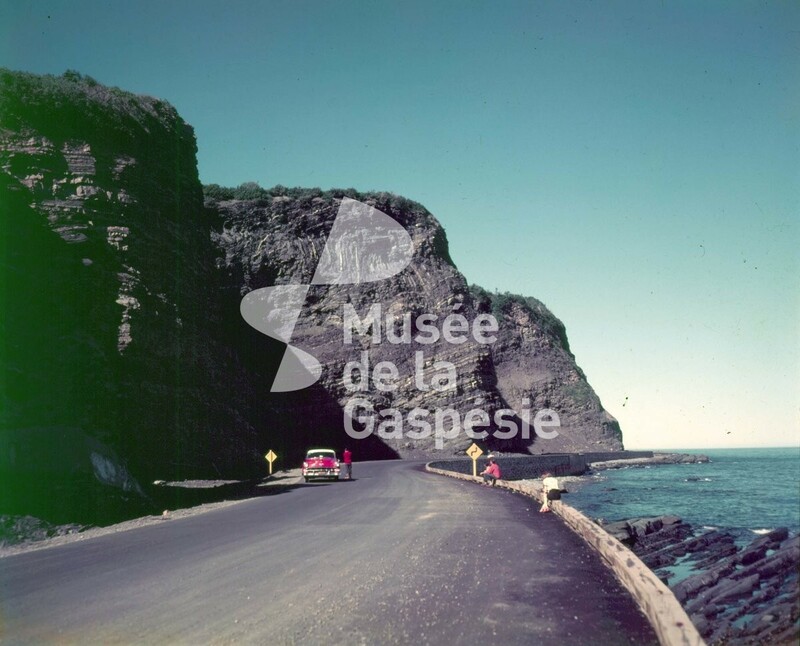 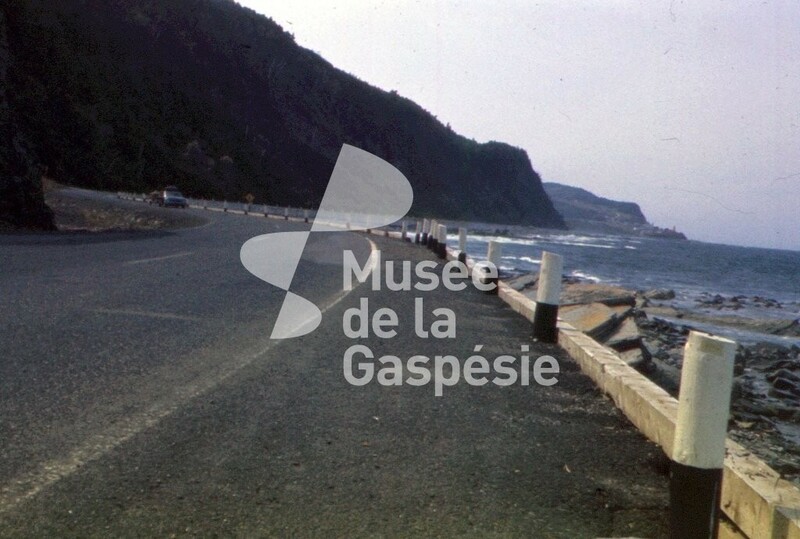 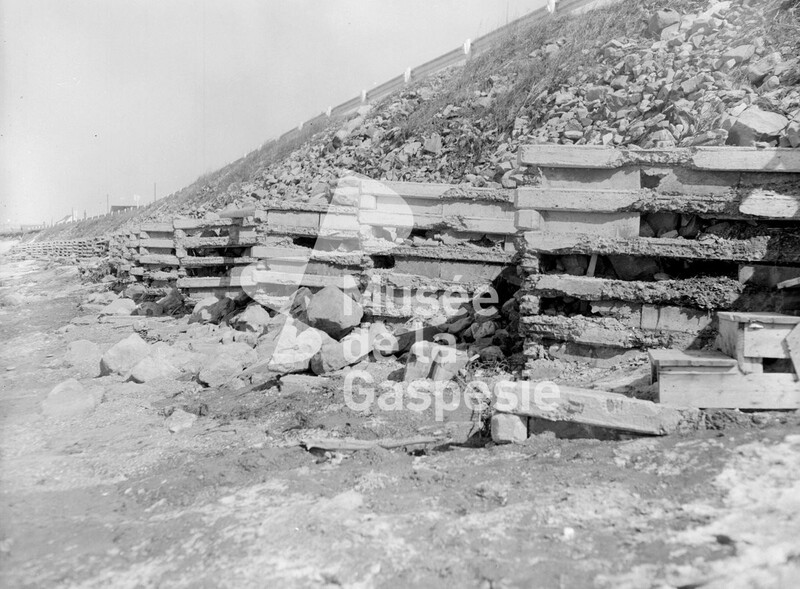 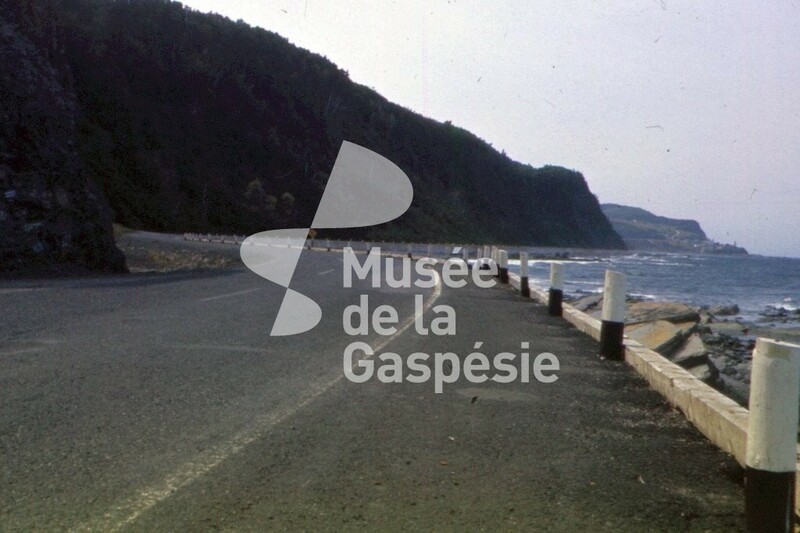 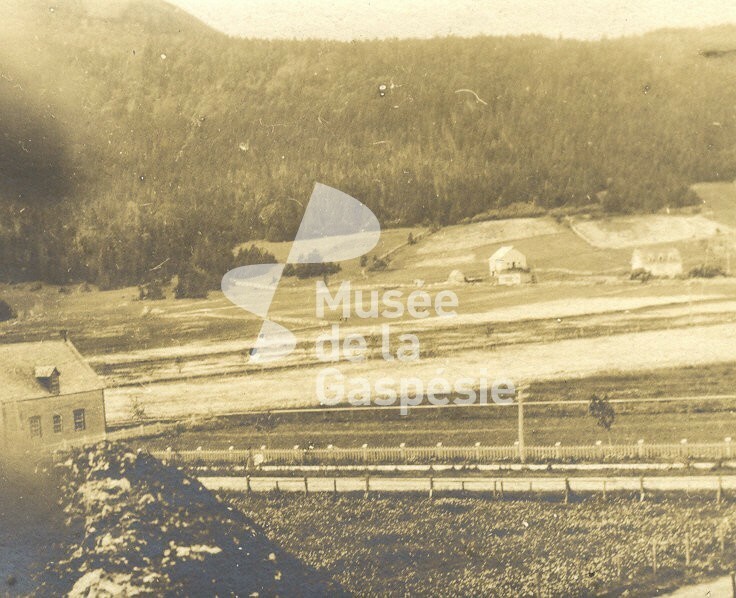 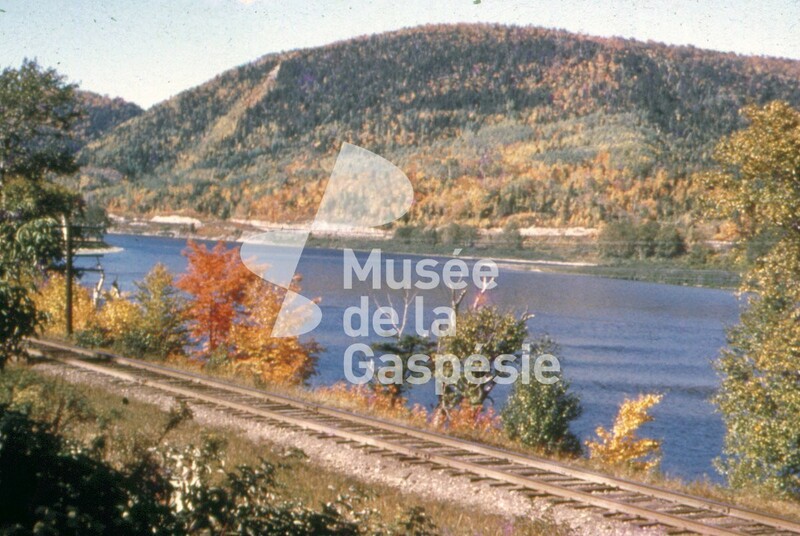 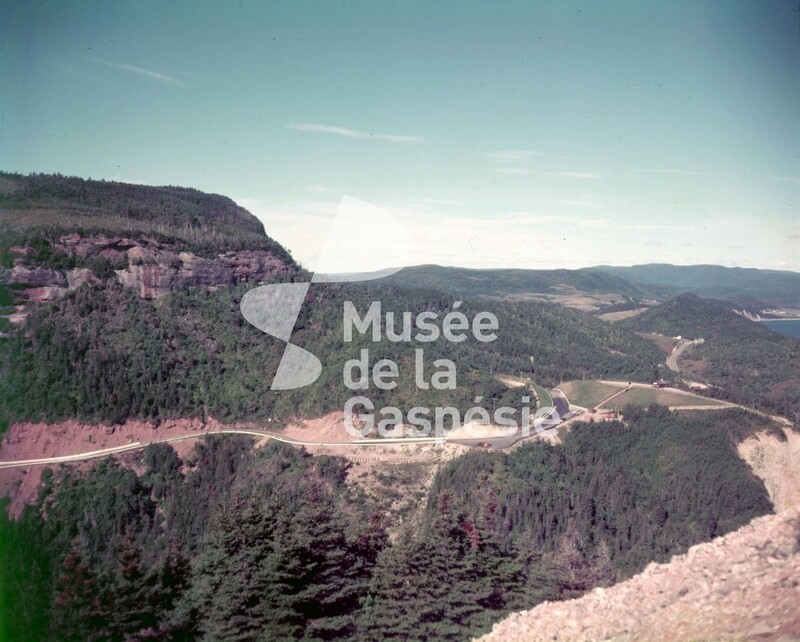 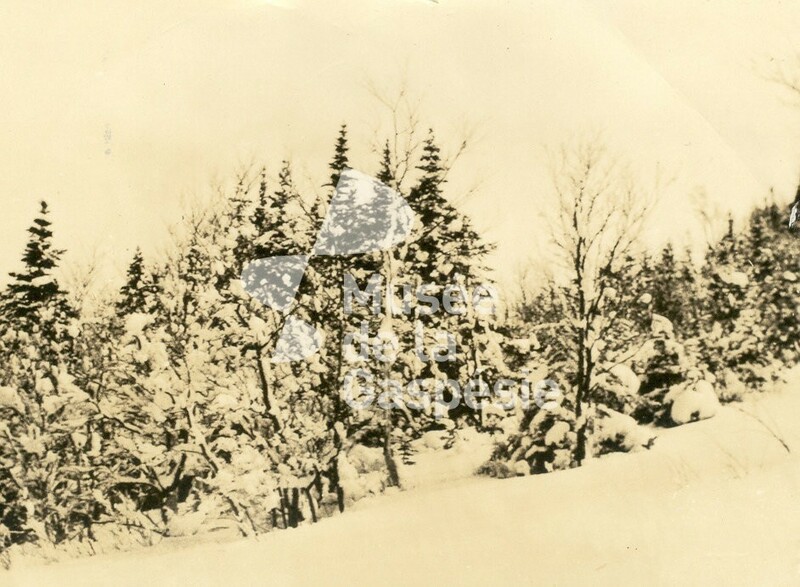 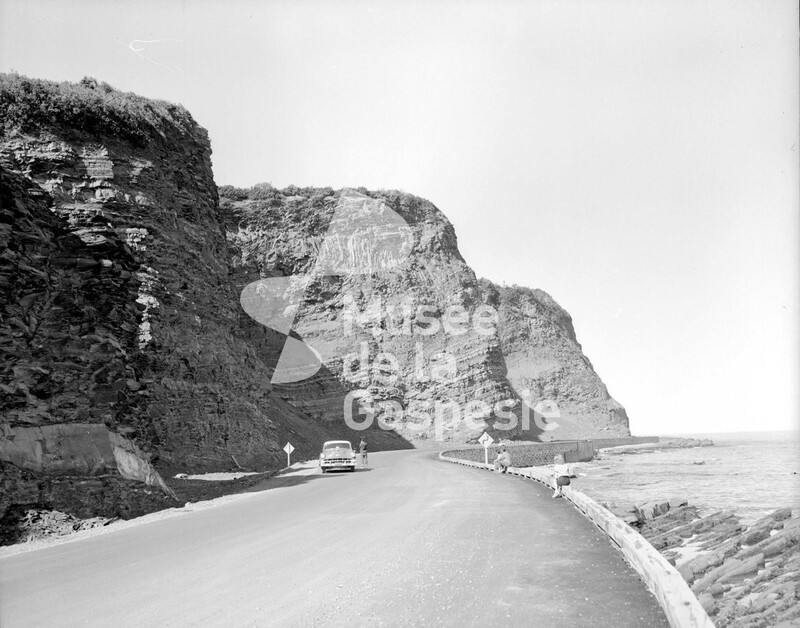 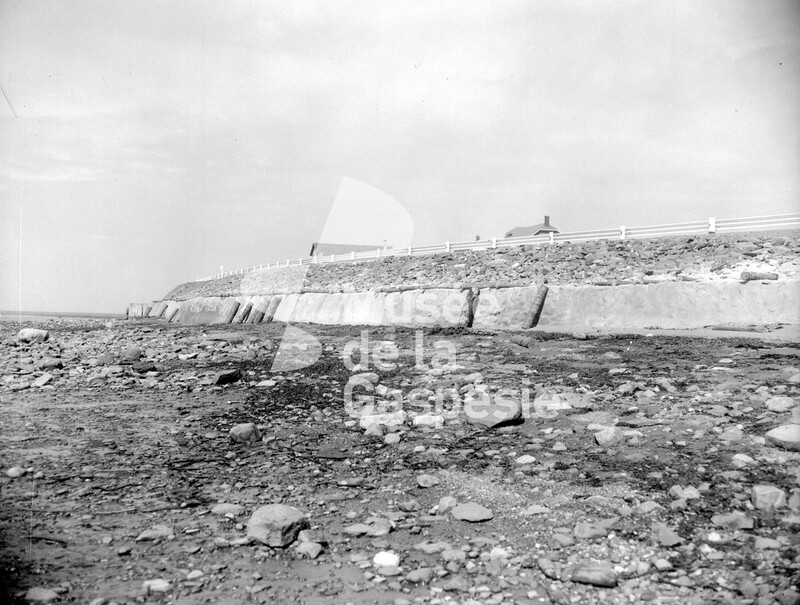 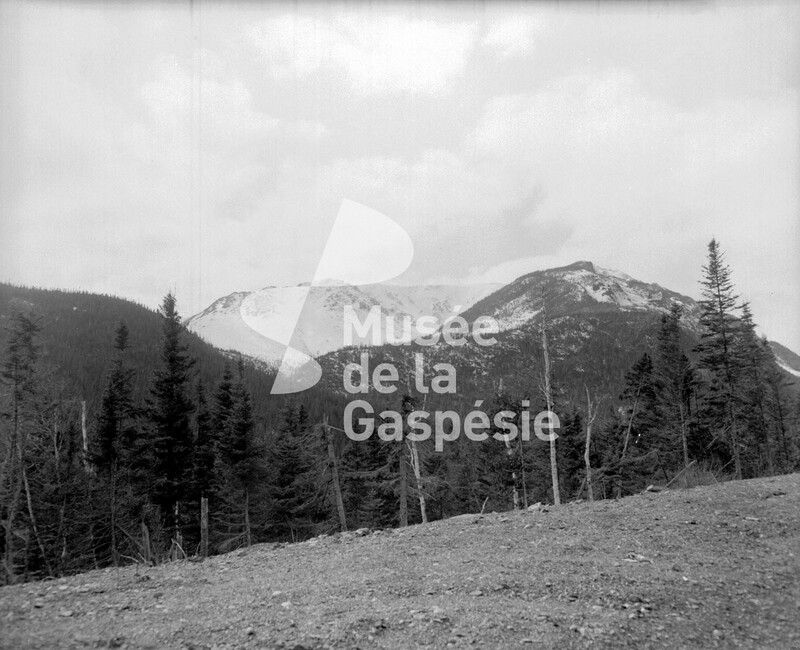 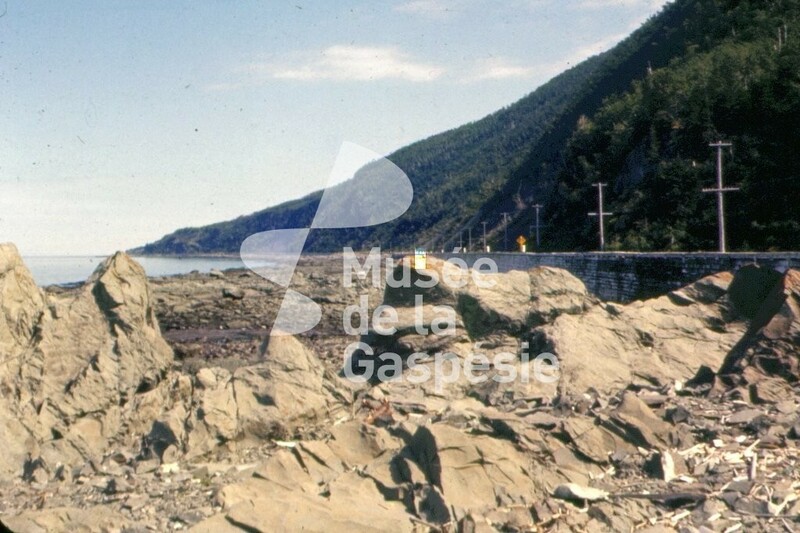 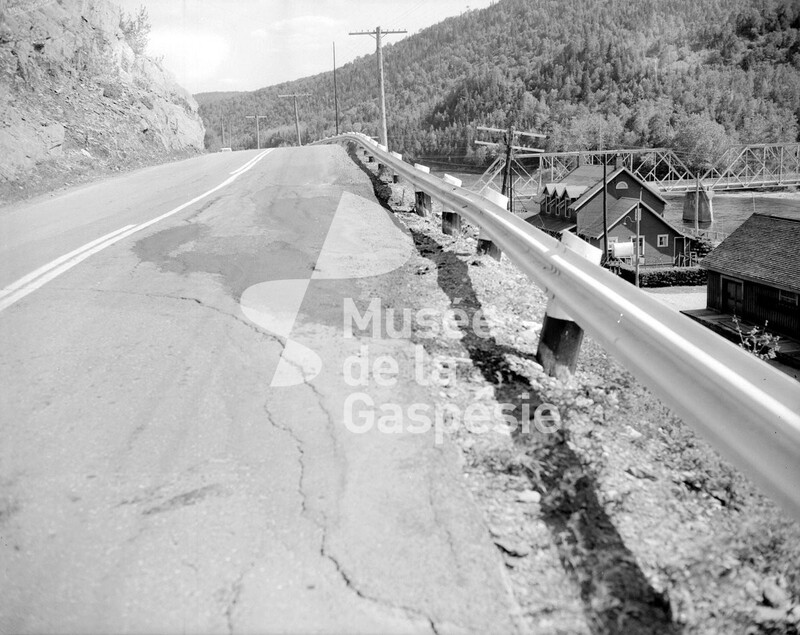 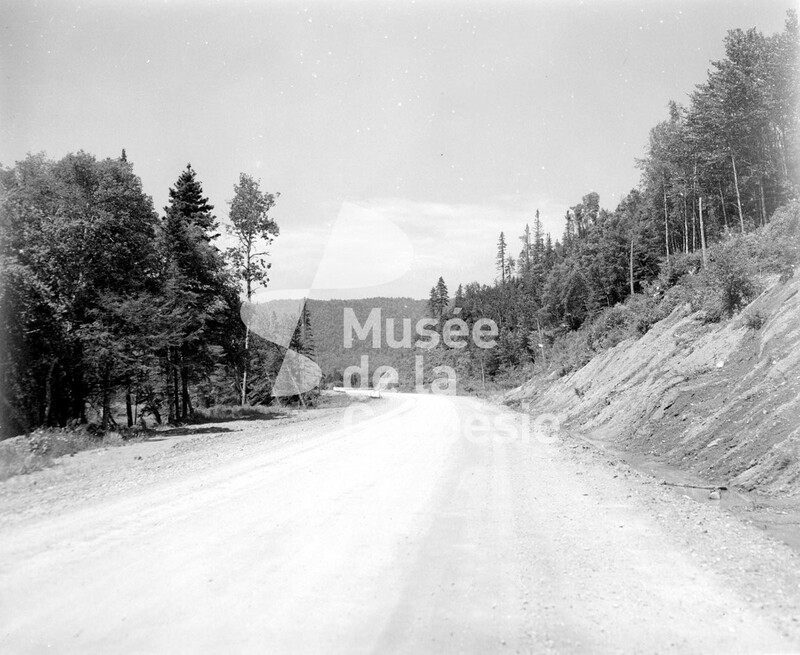 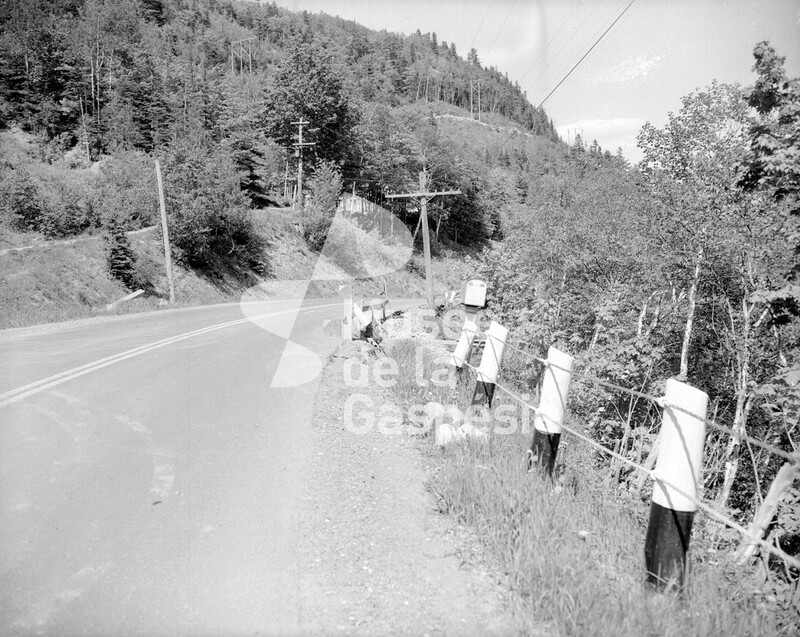 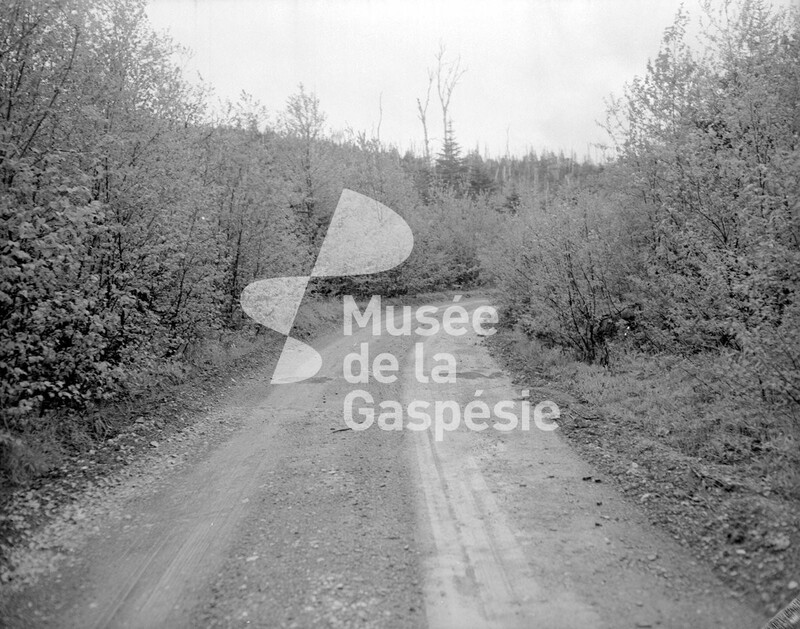 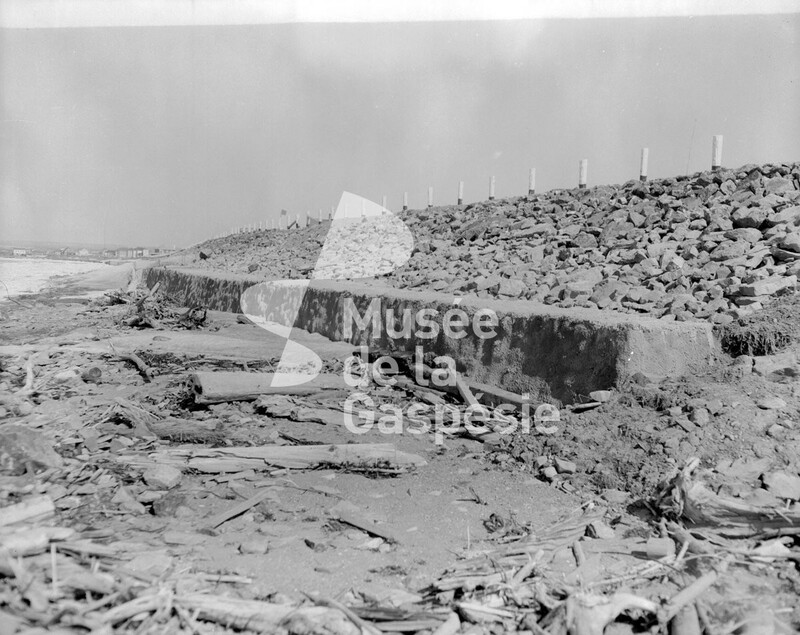 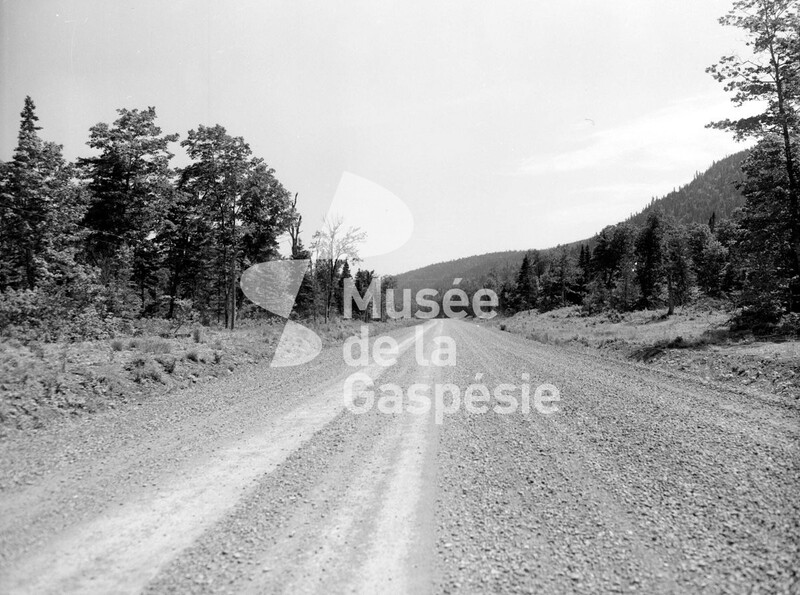 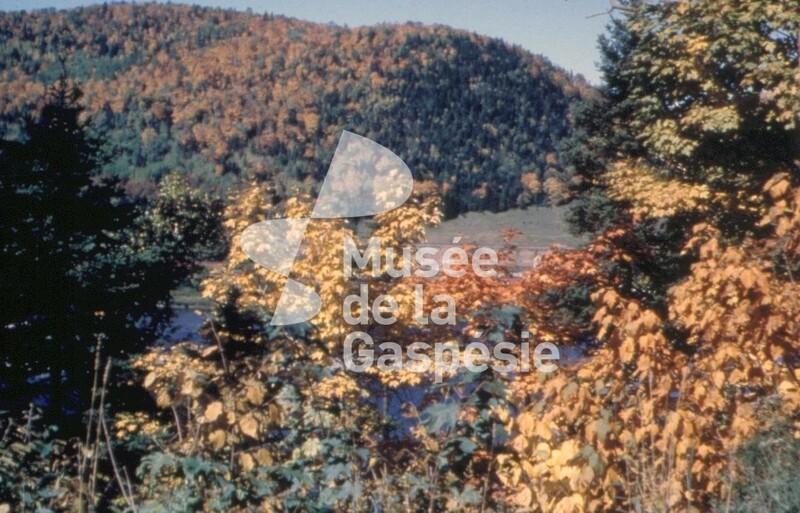 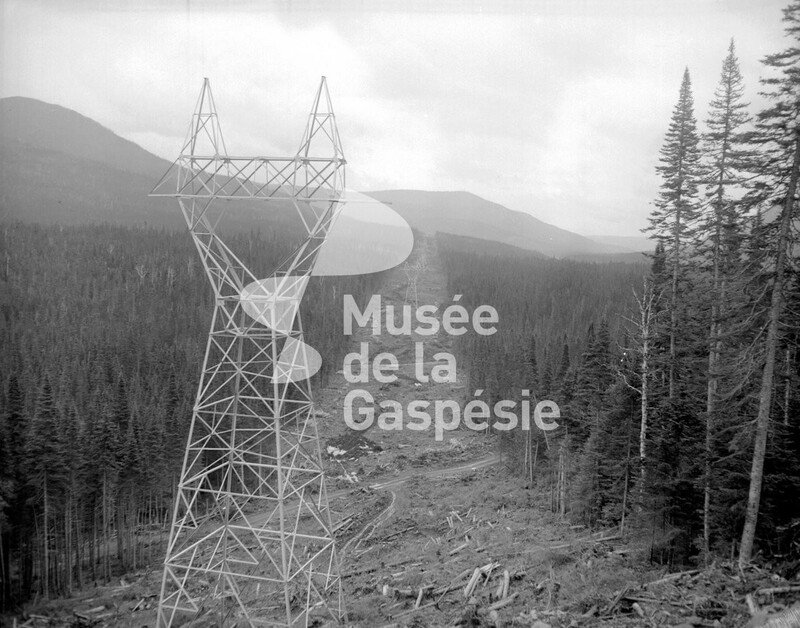 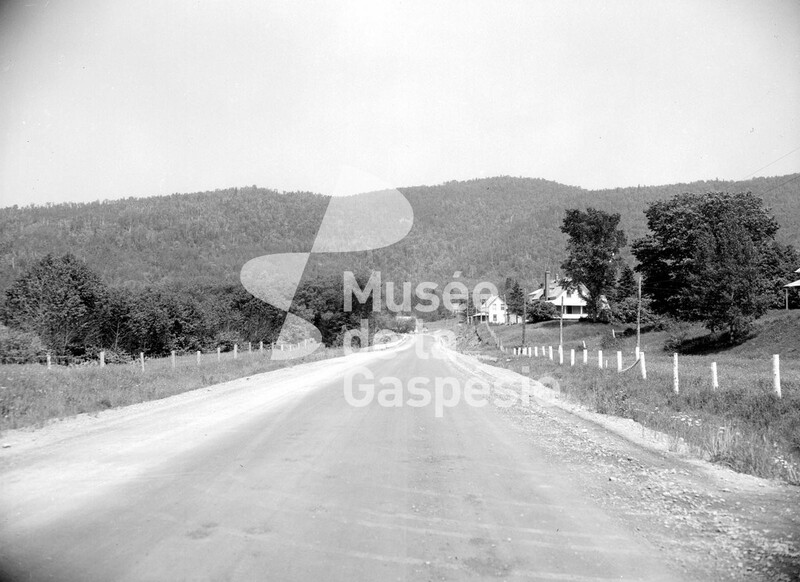 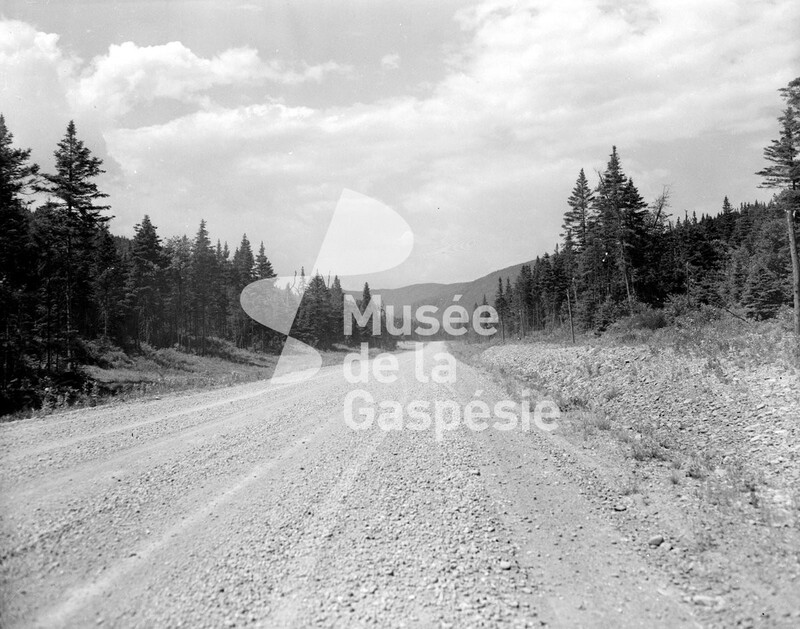 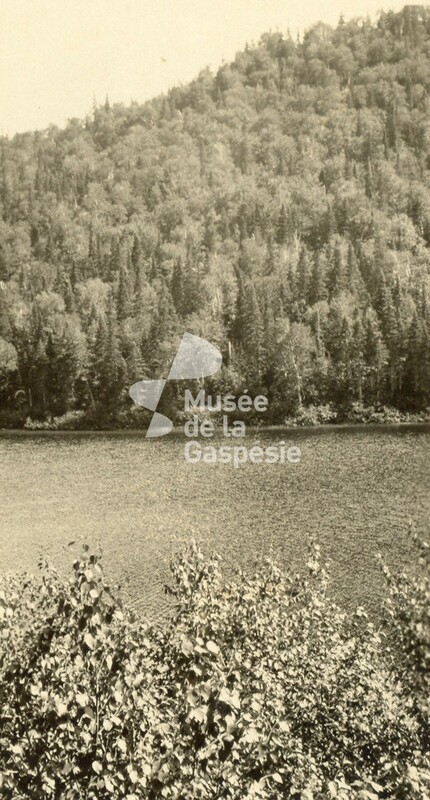 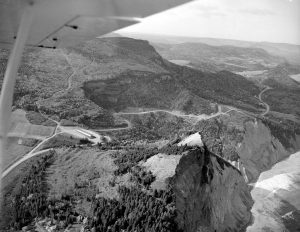 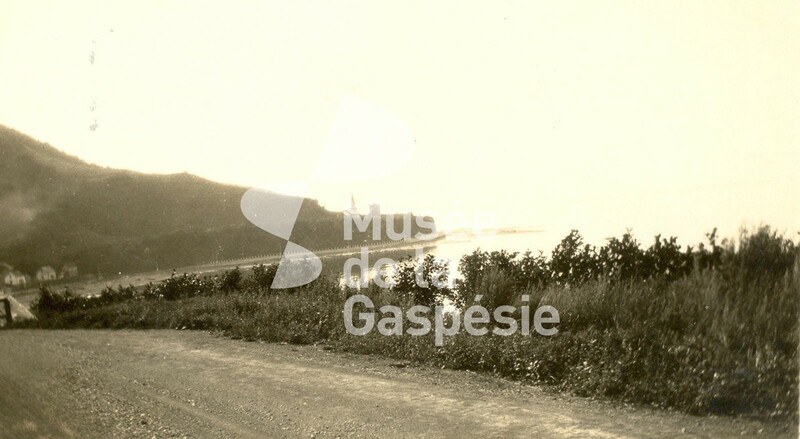 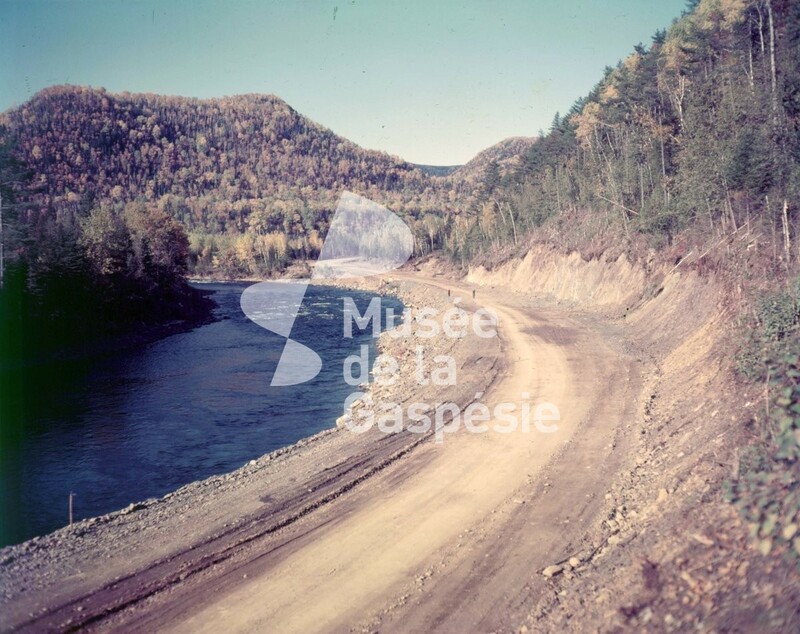 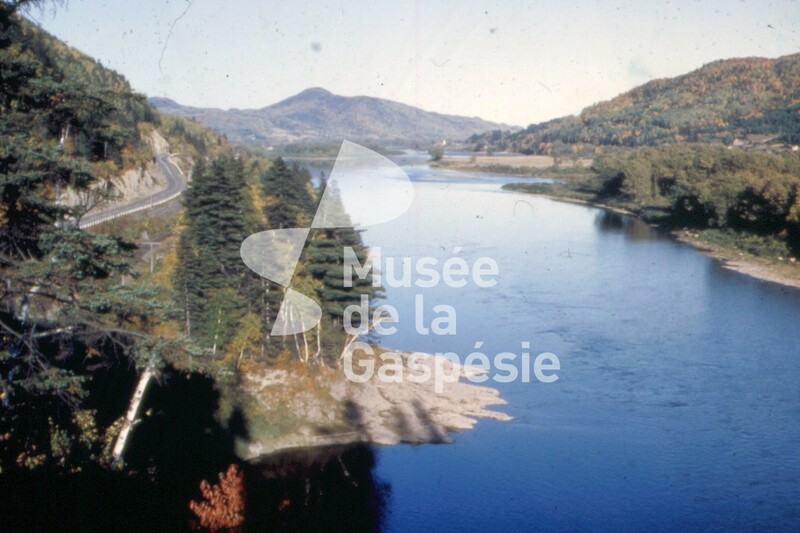 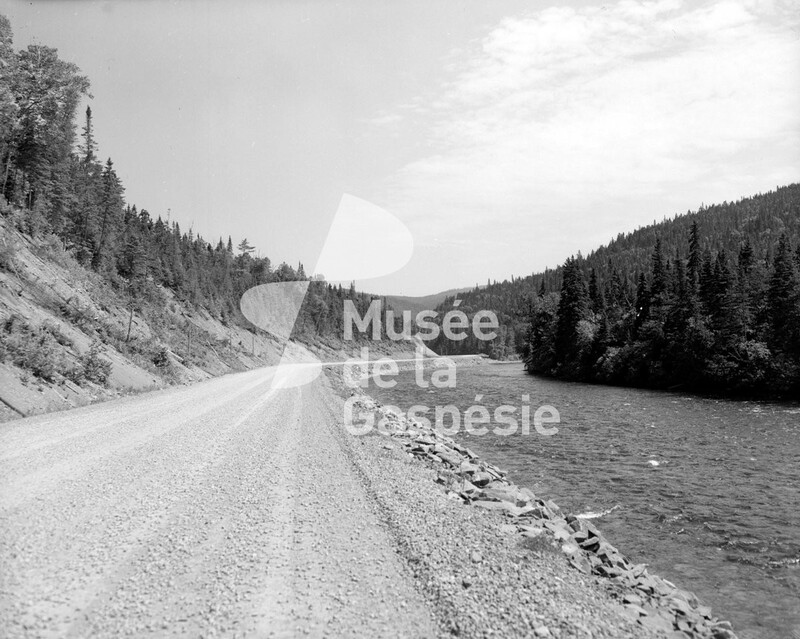 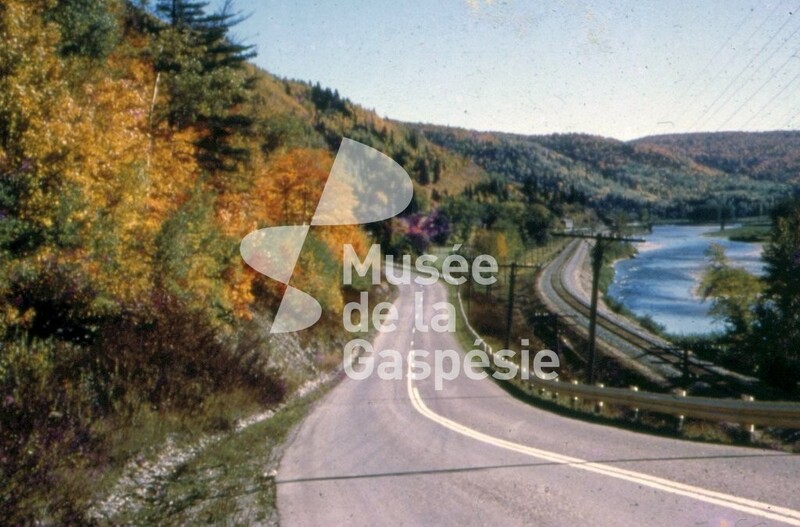 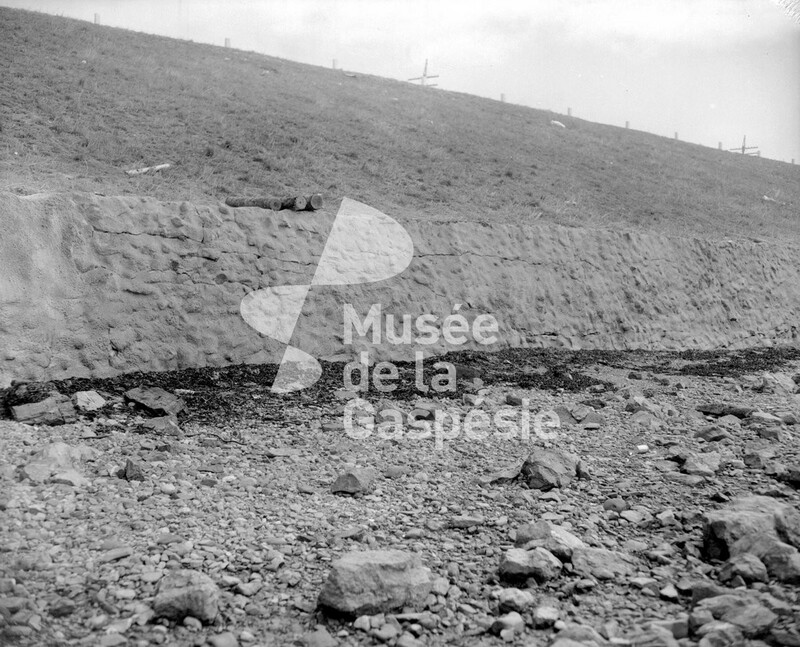 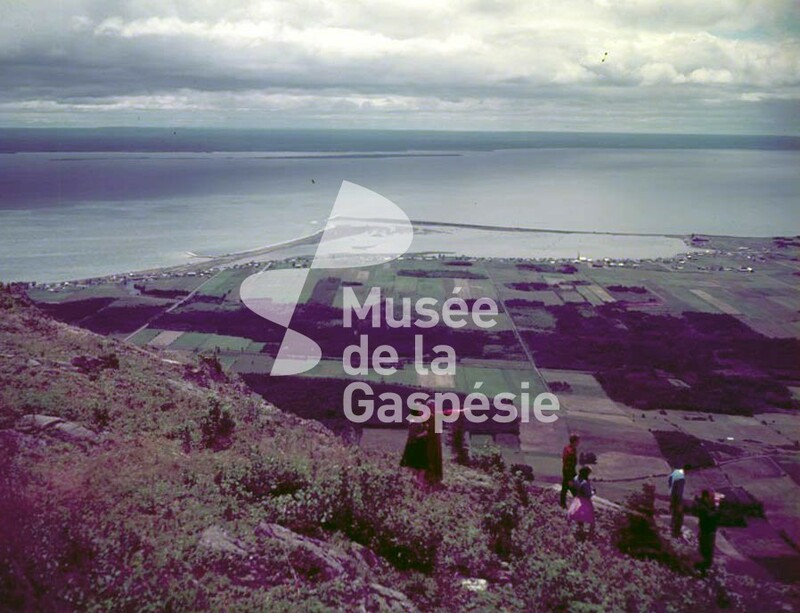 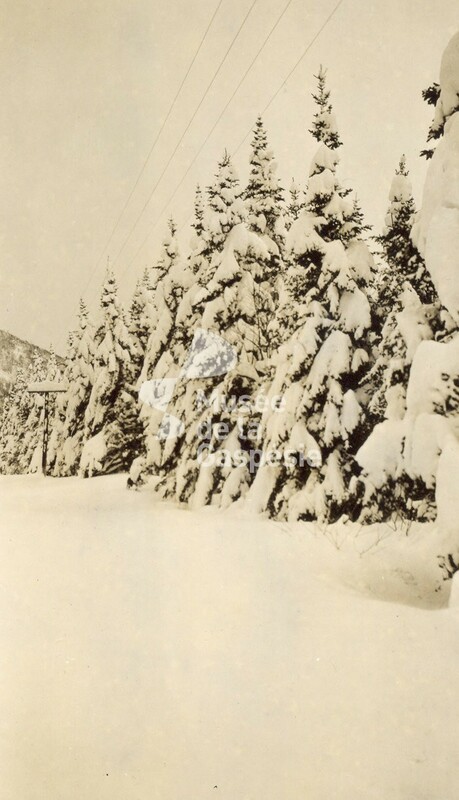 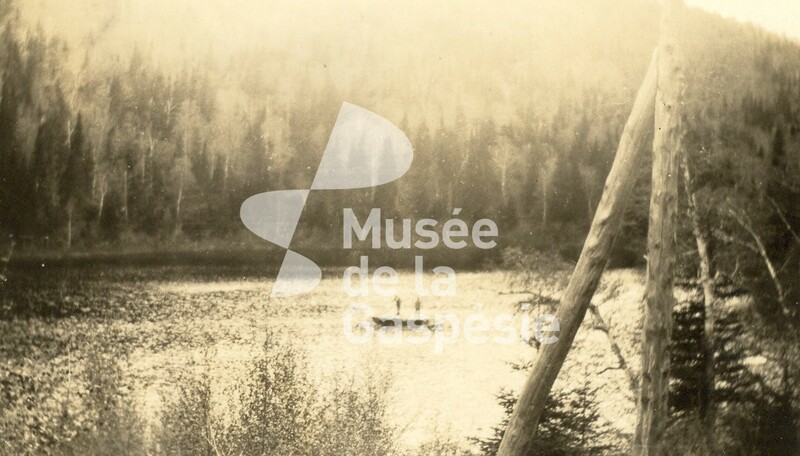 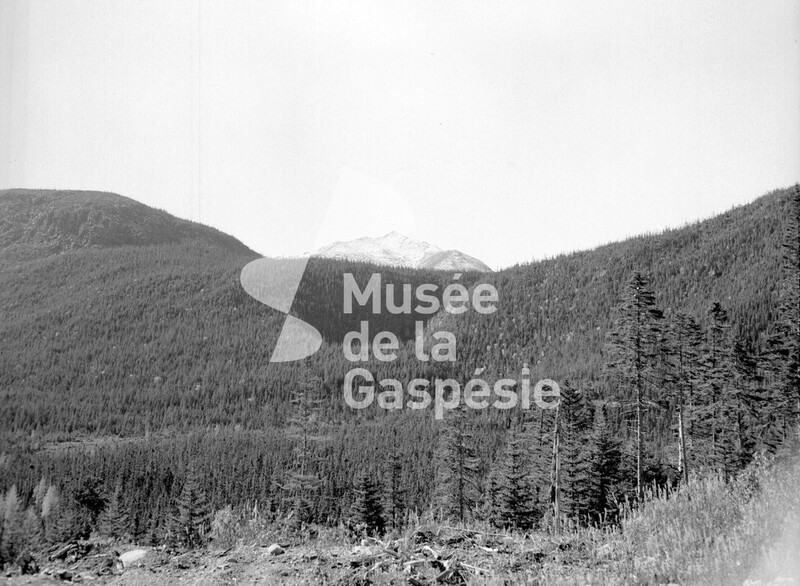 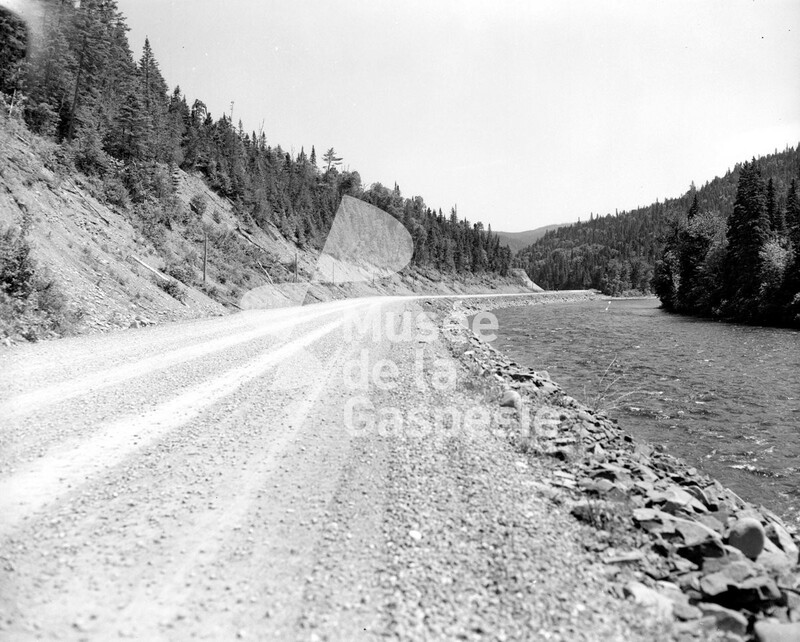 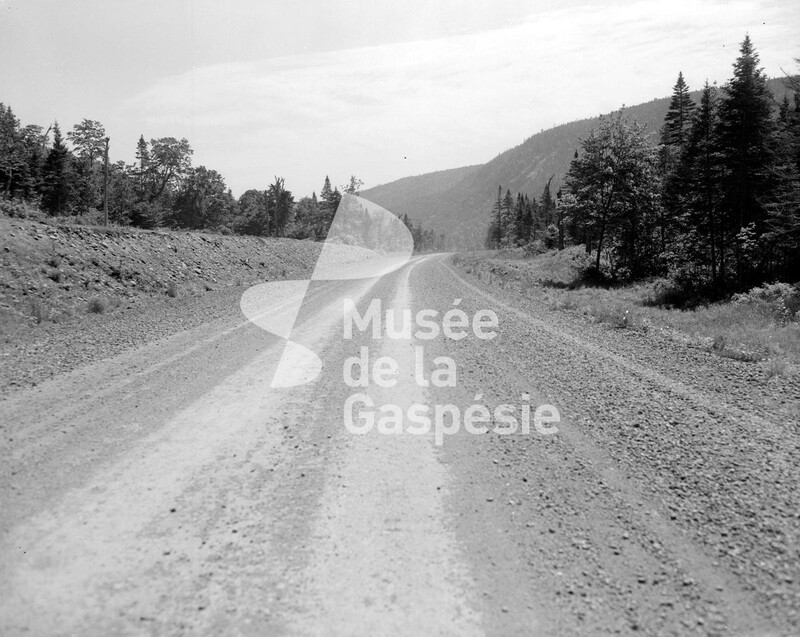 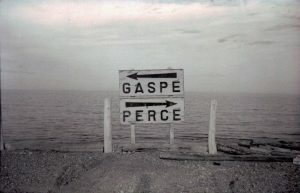 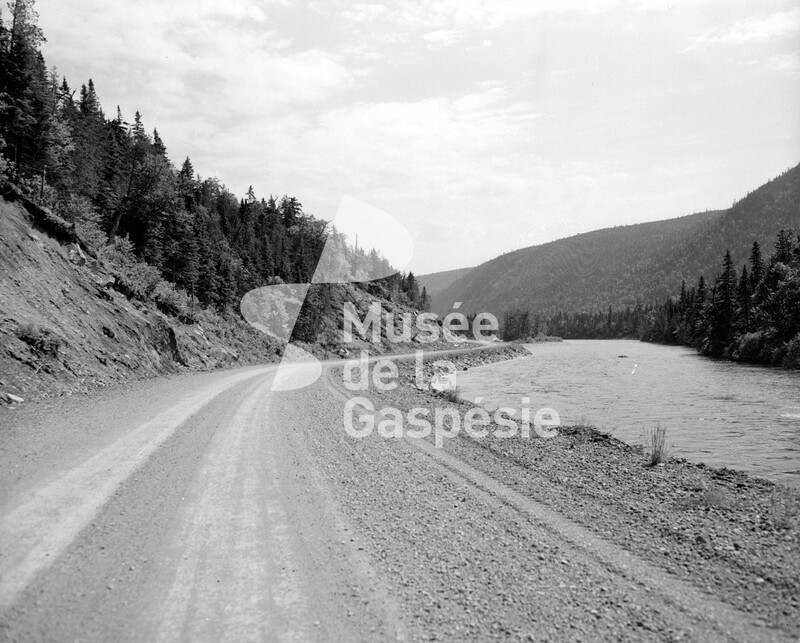 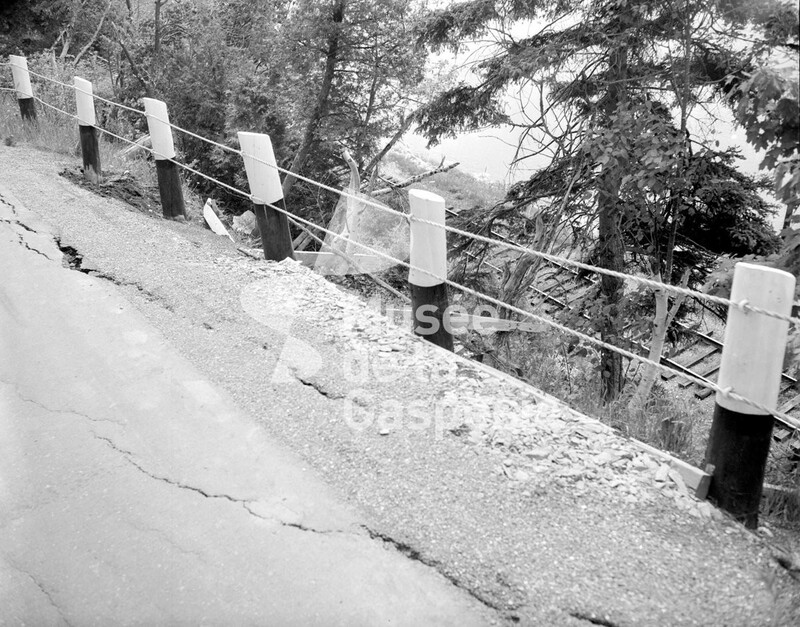 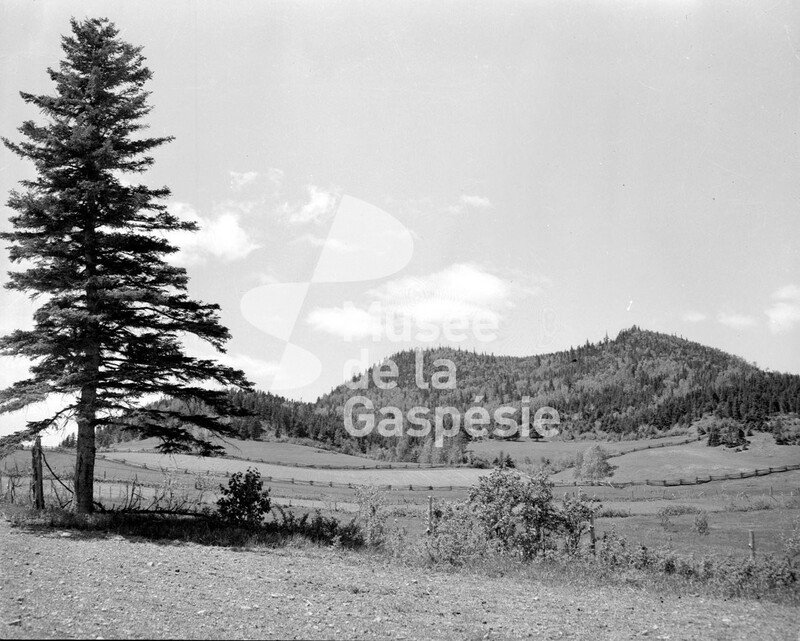 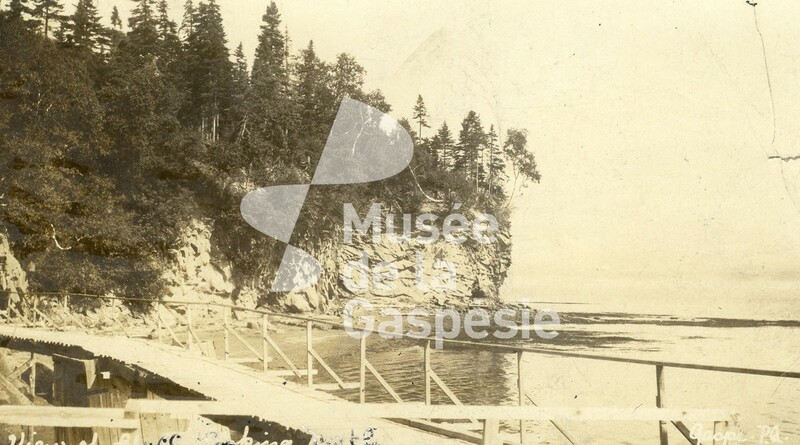 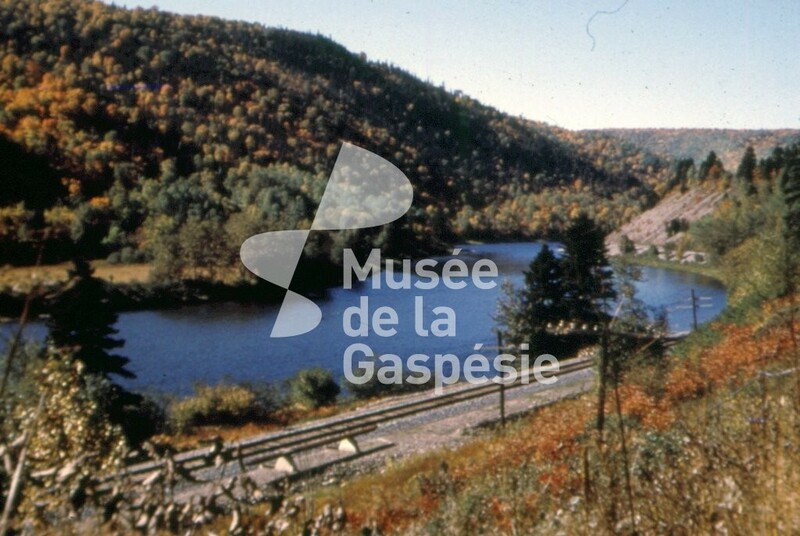 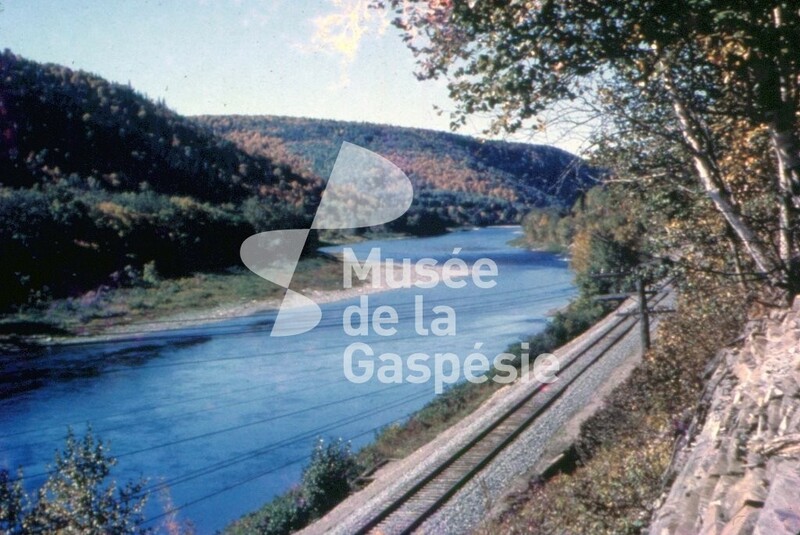 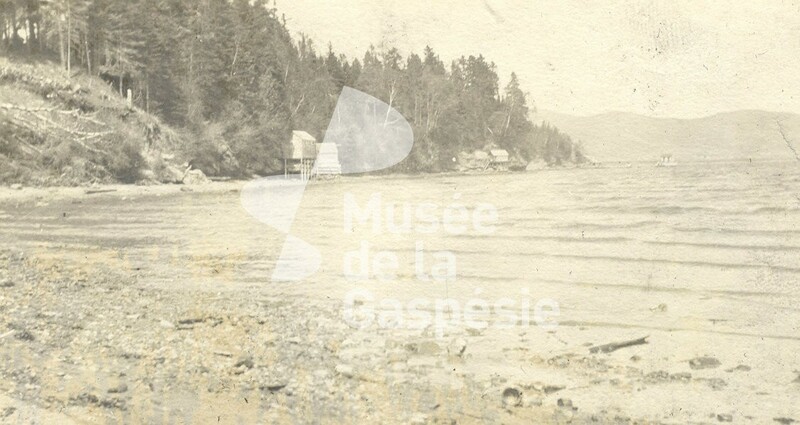 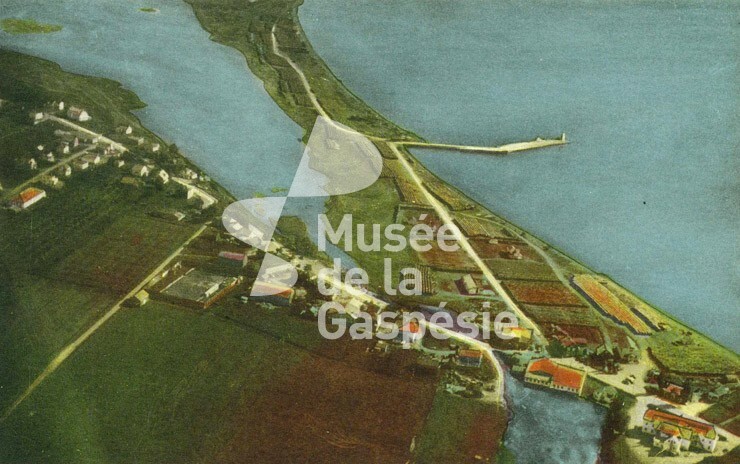 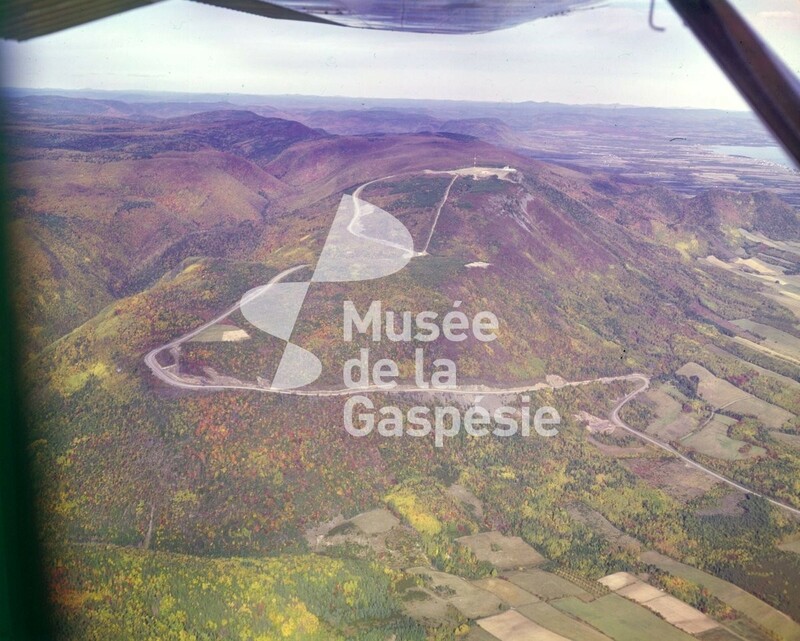 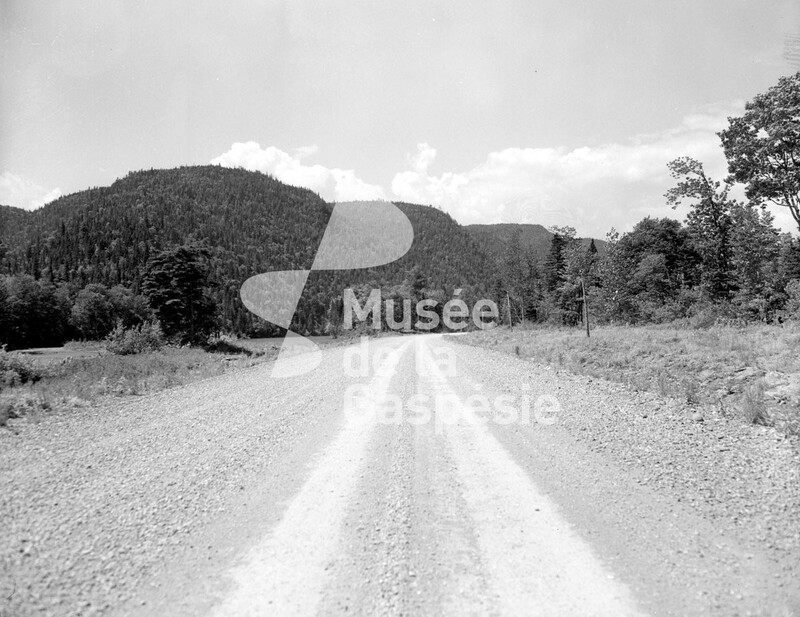 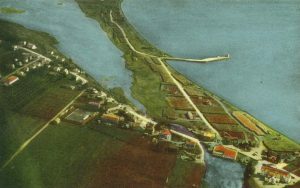 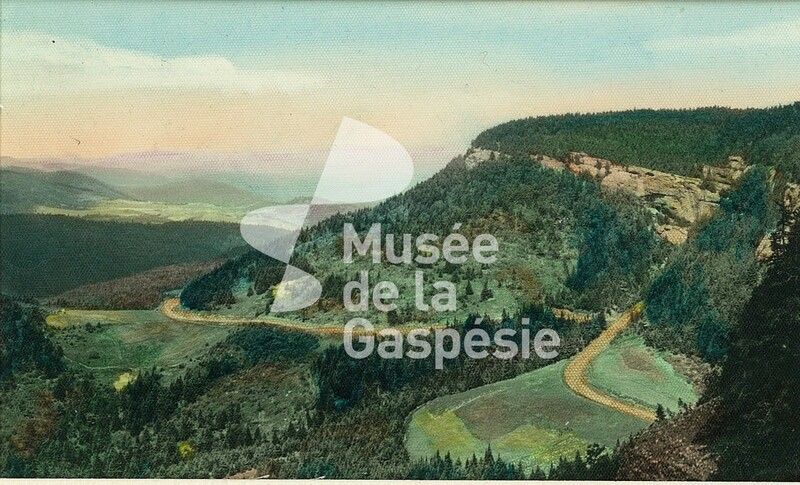 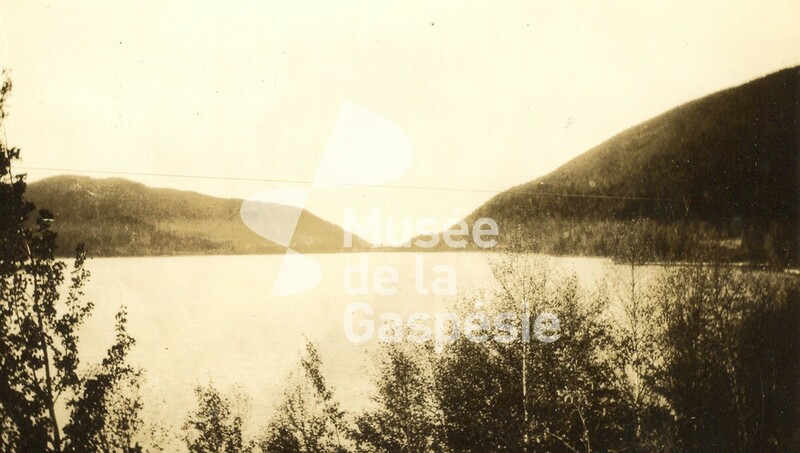 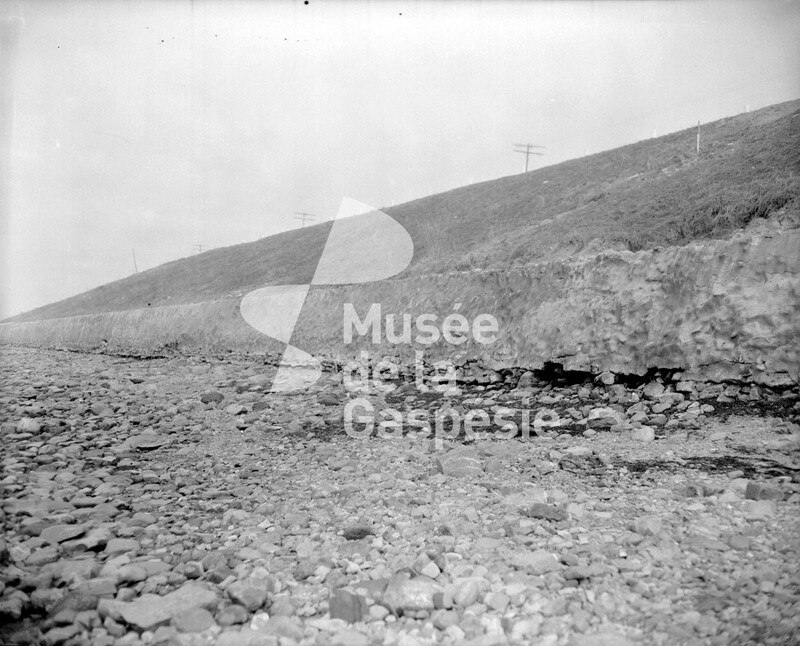 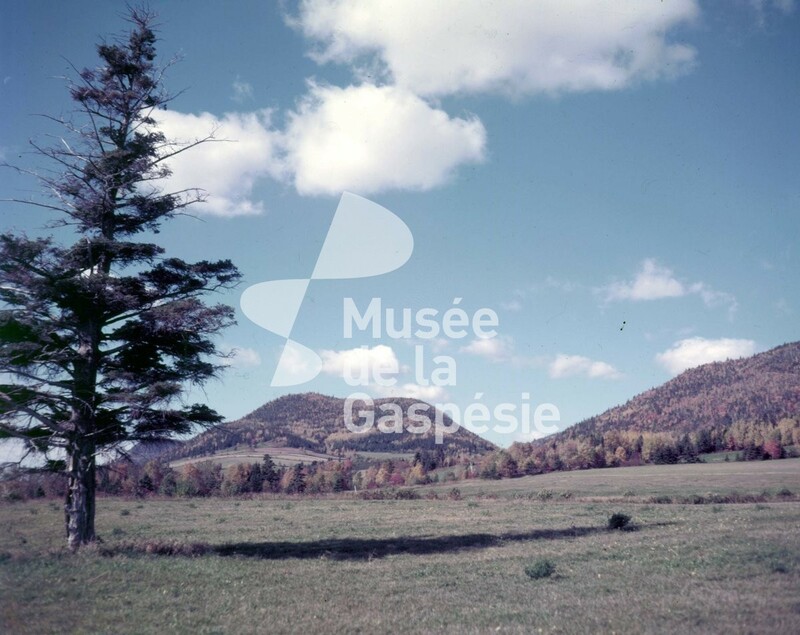 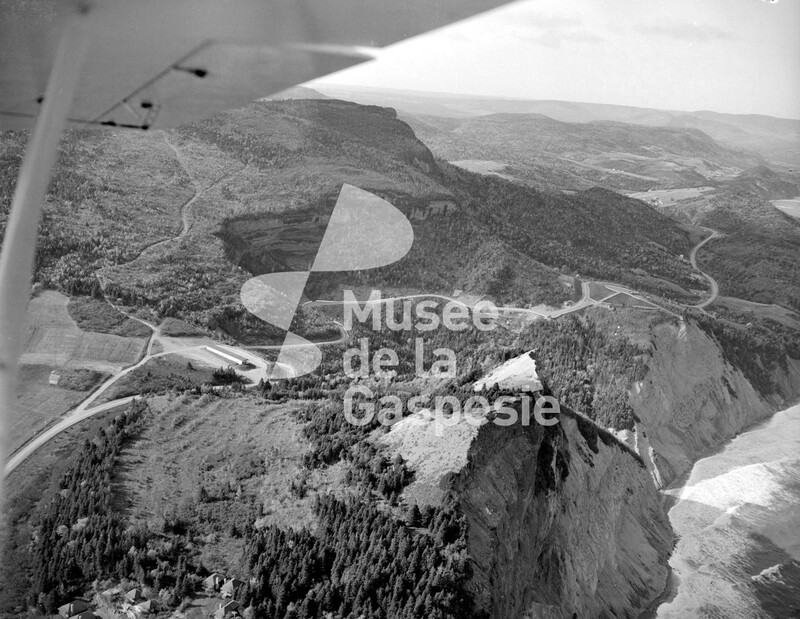 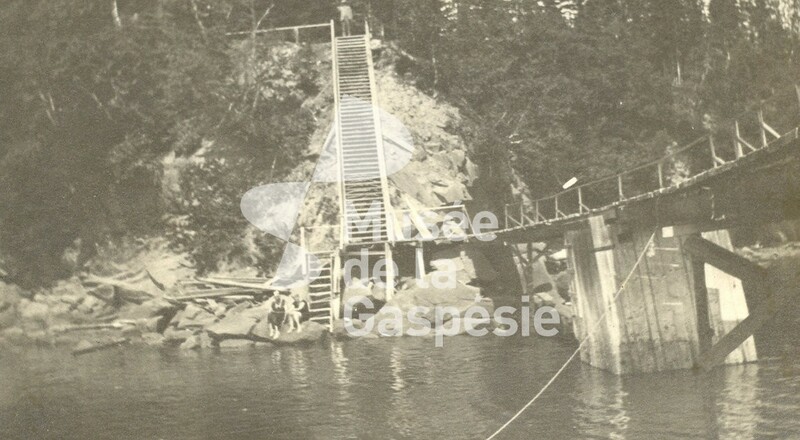 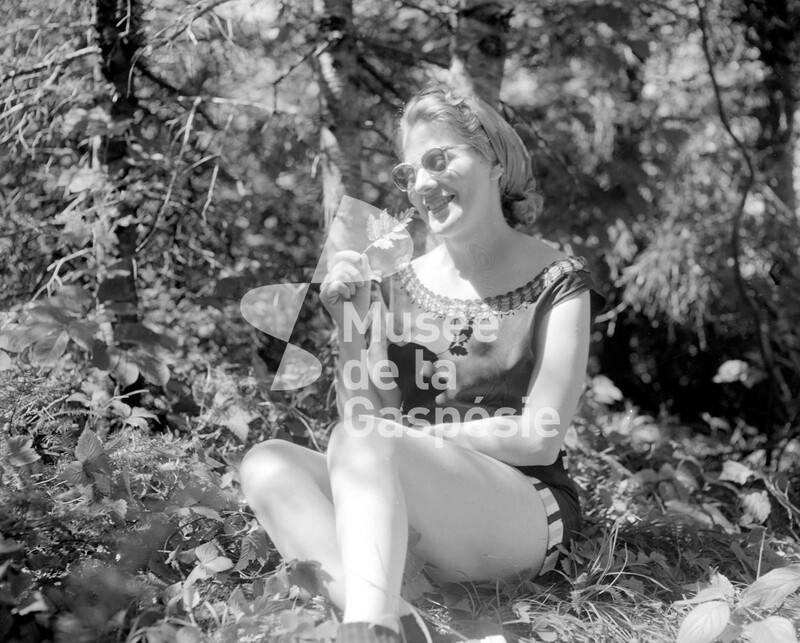 Negative showing a section of the trans-Gaspé highway, linking Cascapédia to Sainte-Anne-des-Monts. 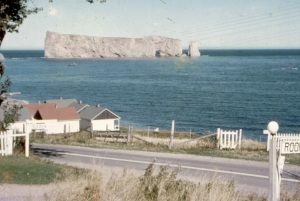 Negative showing a lookout at the beginning of Hwy 132 in Percé. 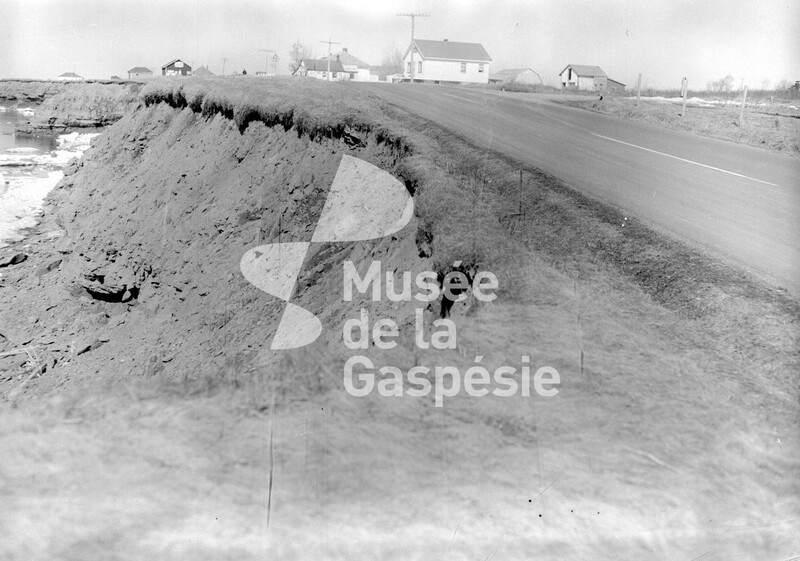 Negative showing a section of Saint-Louis road north of Saint-Omer. 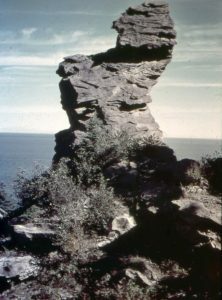 Negative showing the Cap-Chat rock. 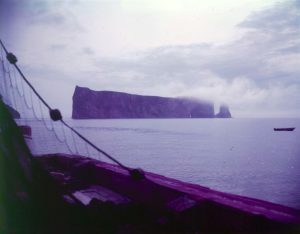 Negative showing Percé Rock in the mist. 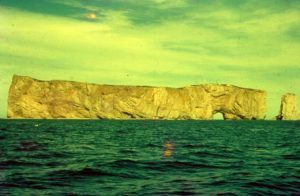 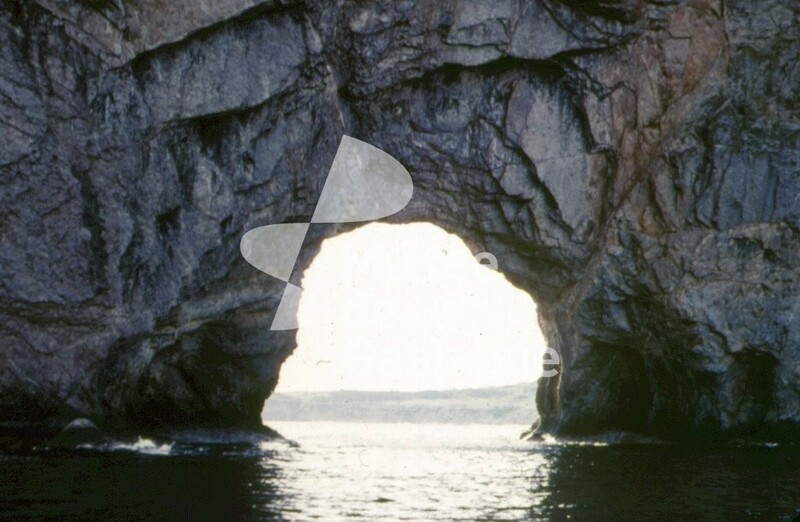 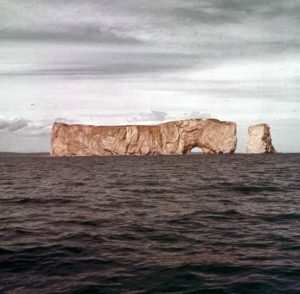 Negative showing the Percé Rock arch. 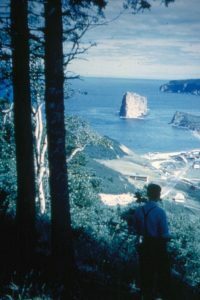 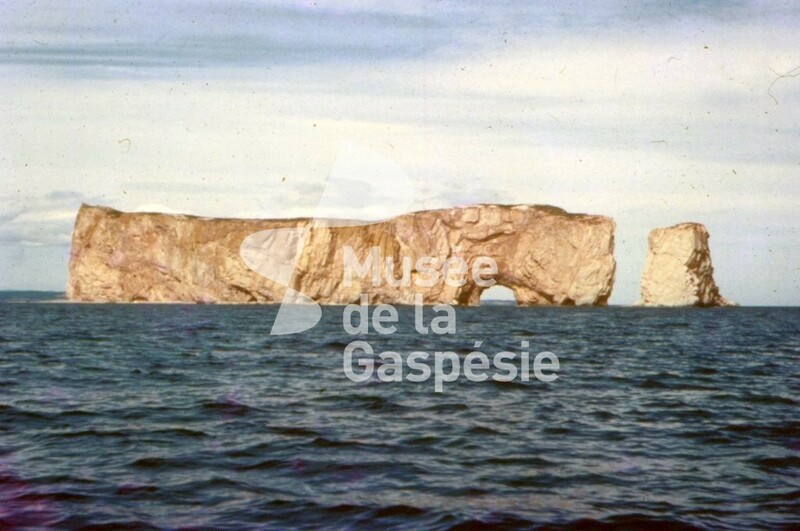 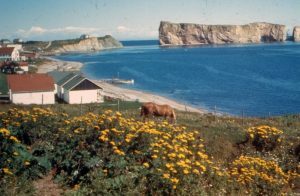 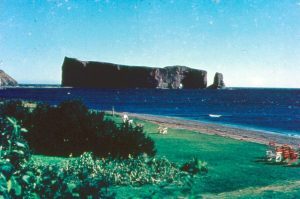 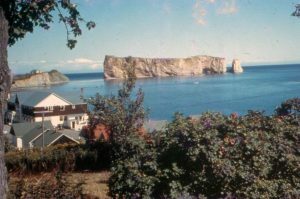 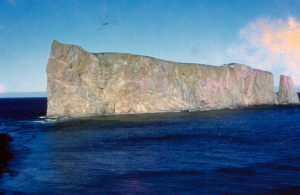 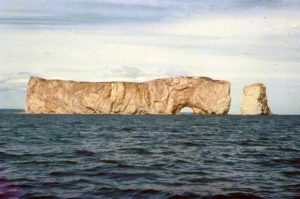 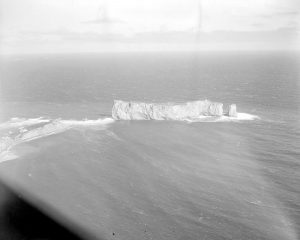 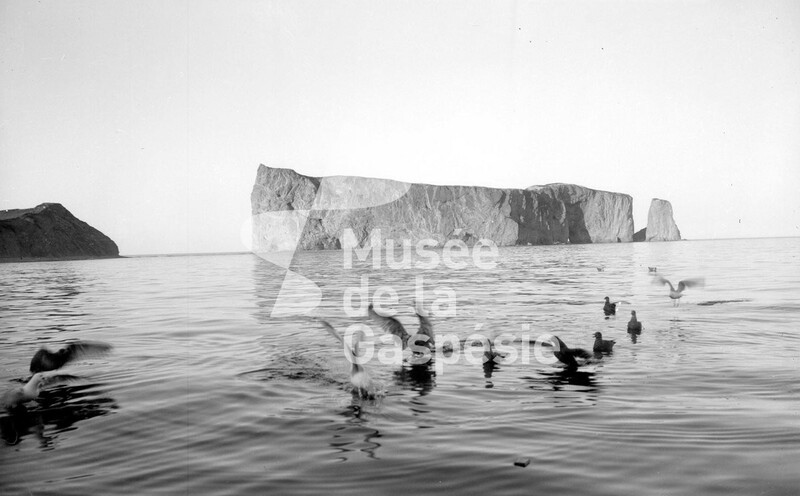 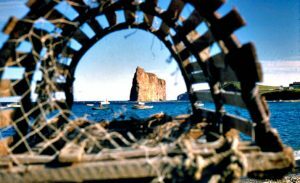 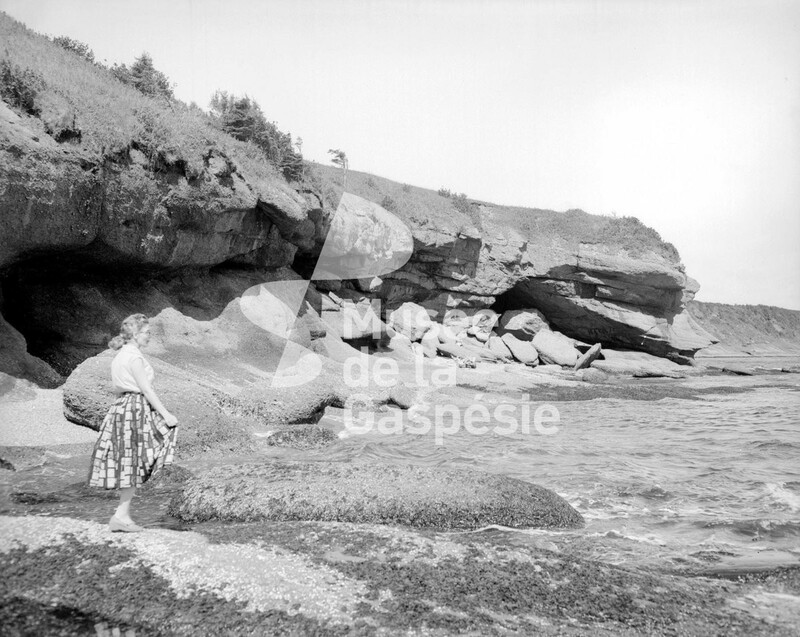 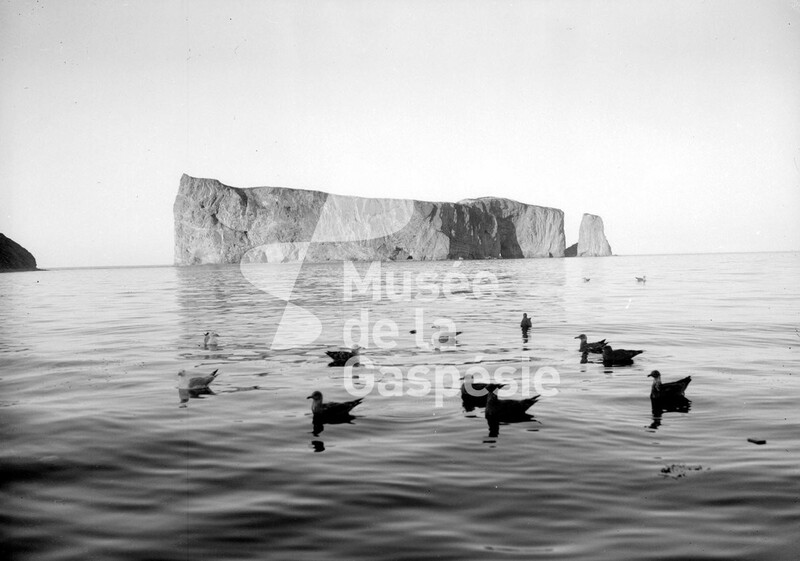 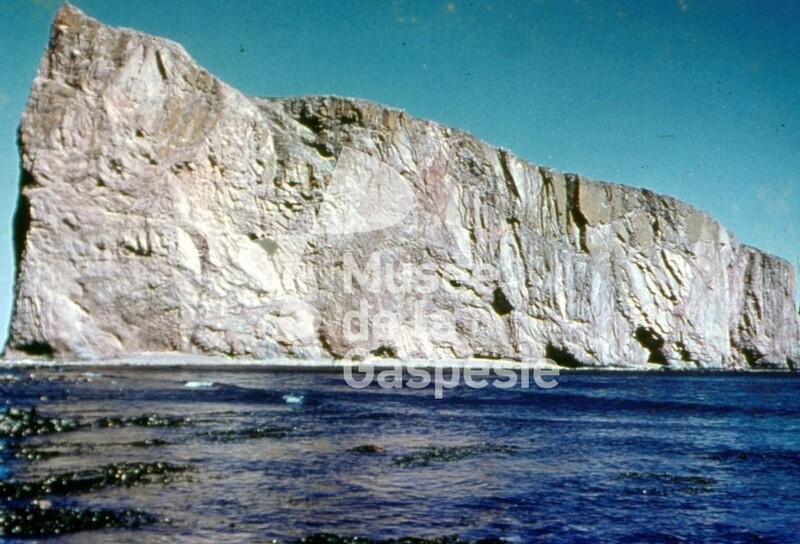 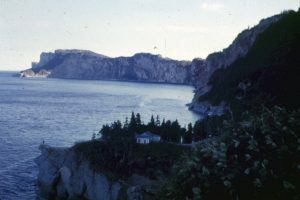 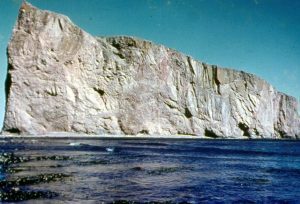 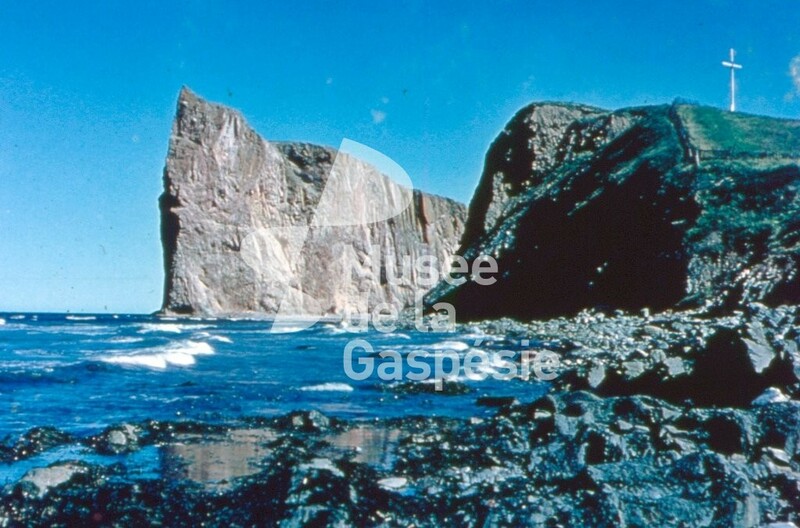 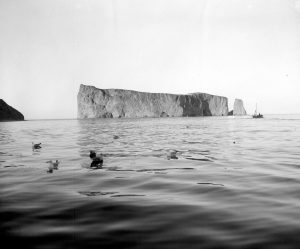 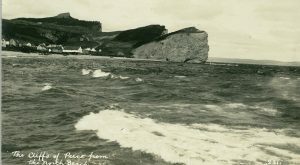 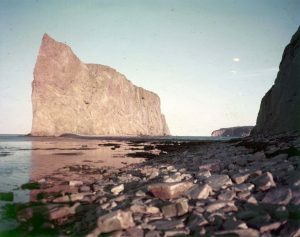 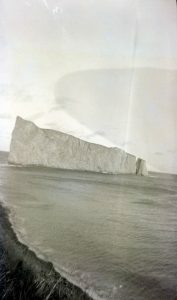 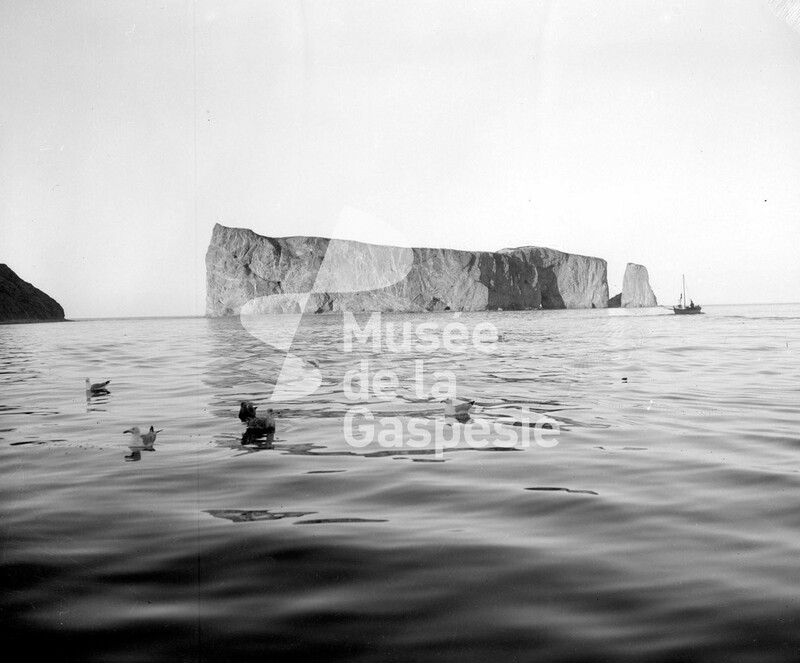 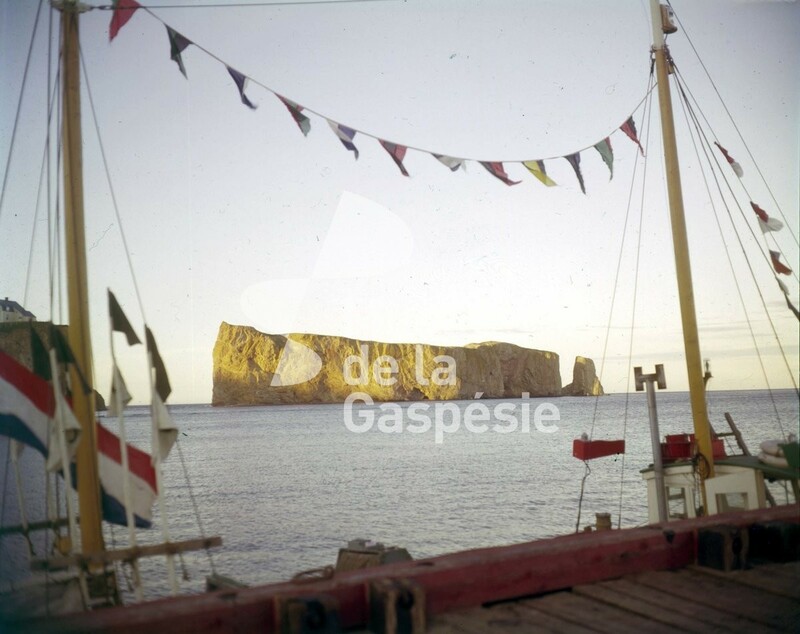 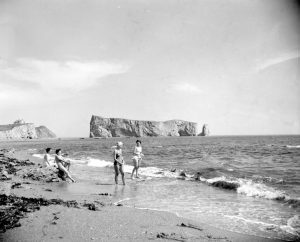 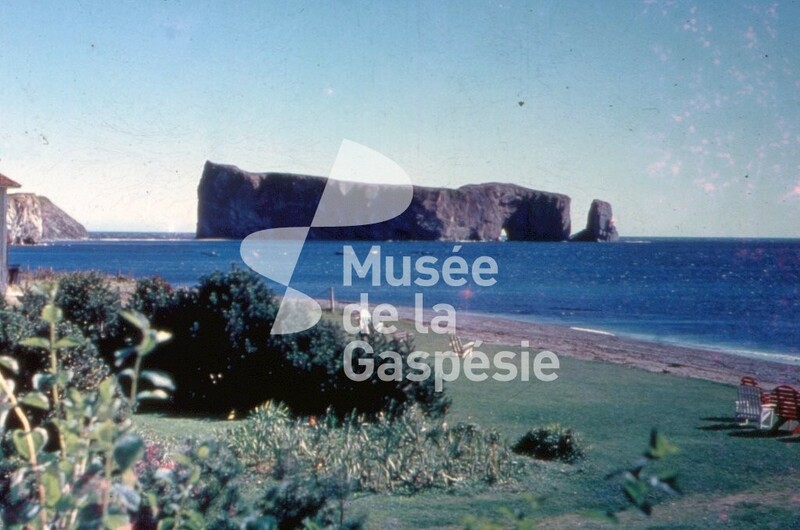 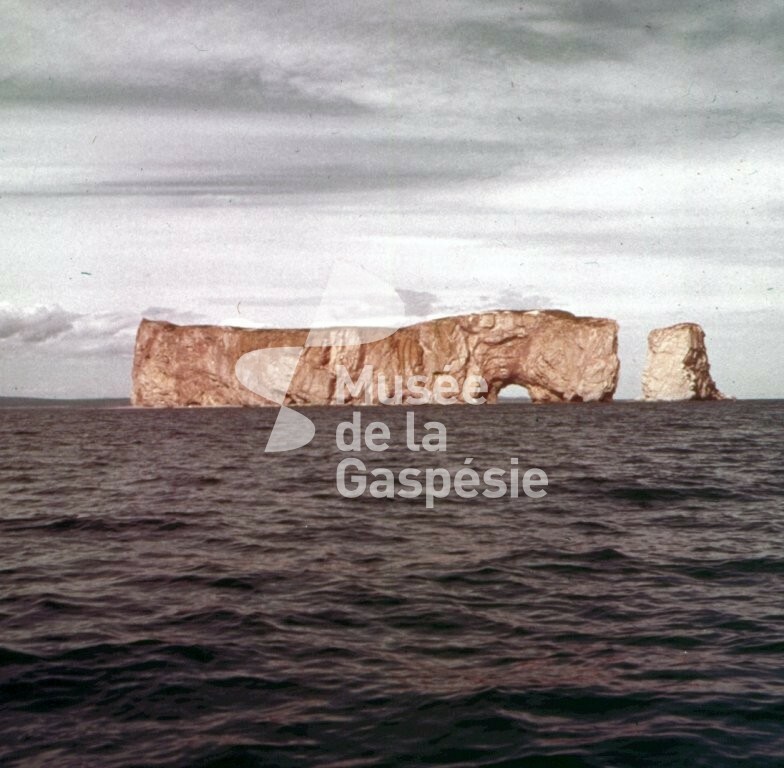 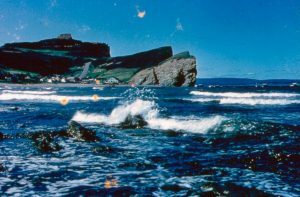 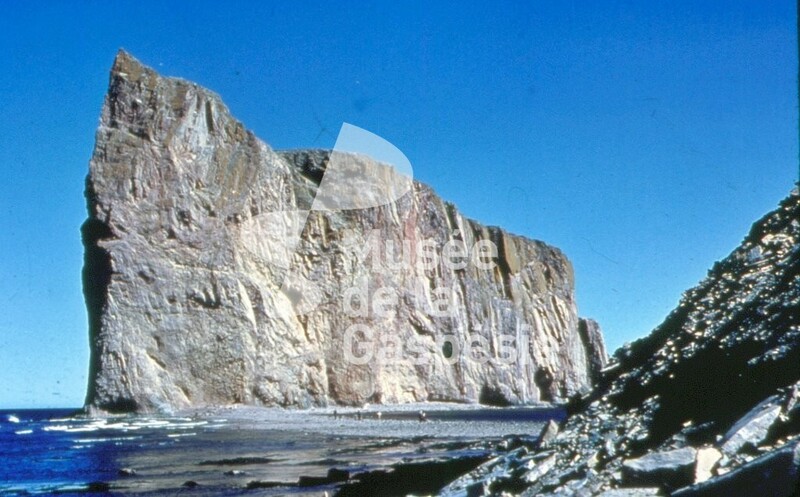 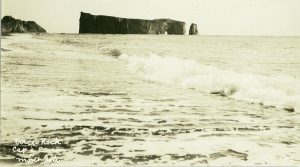 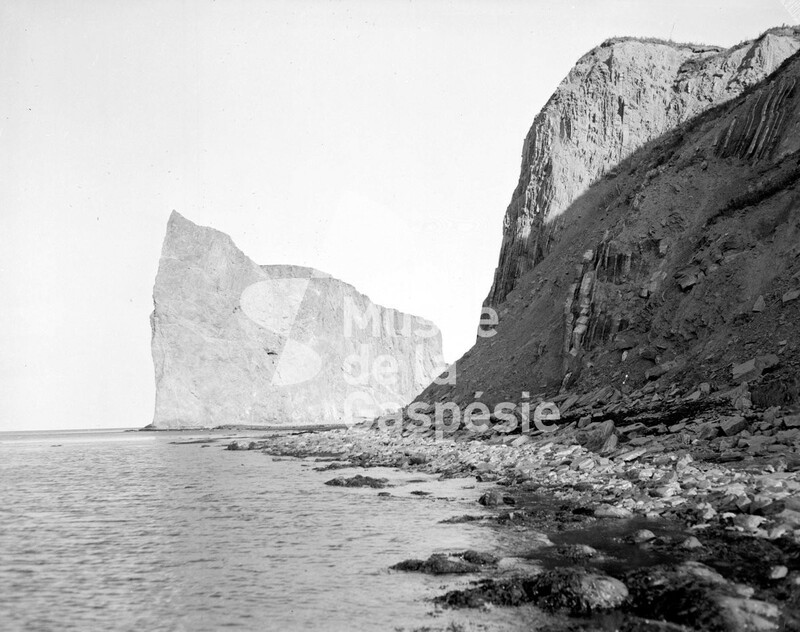 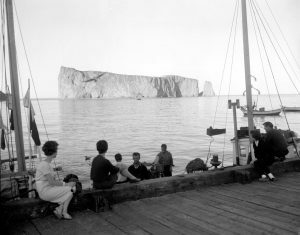 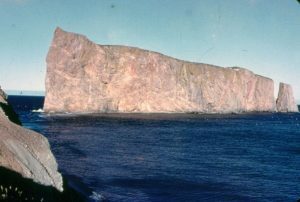 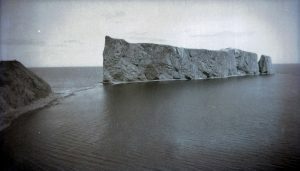 Negative showing Percé Rock seen from Anse du Nord. 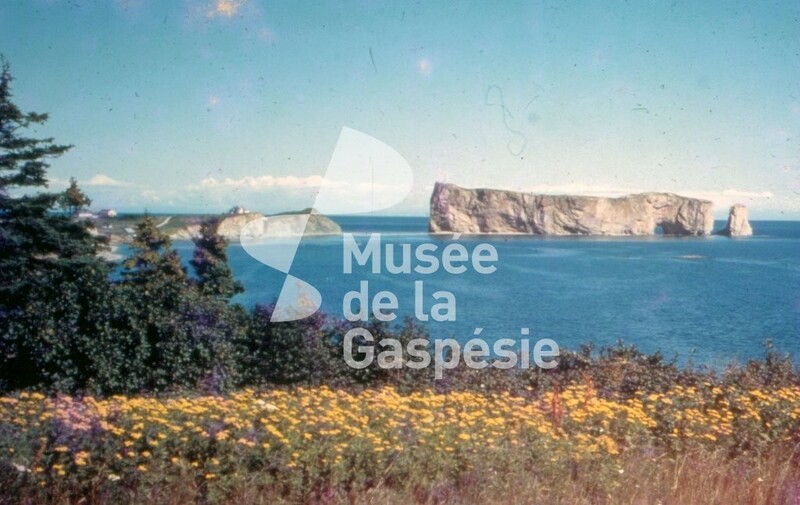 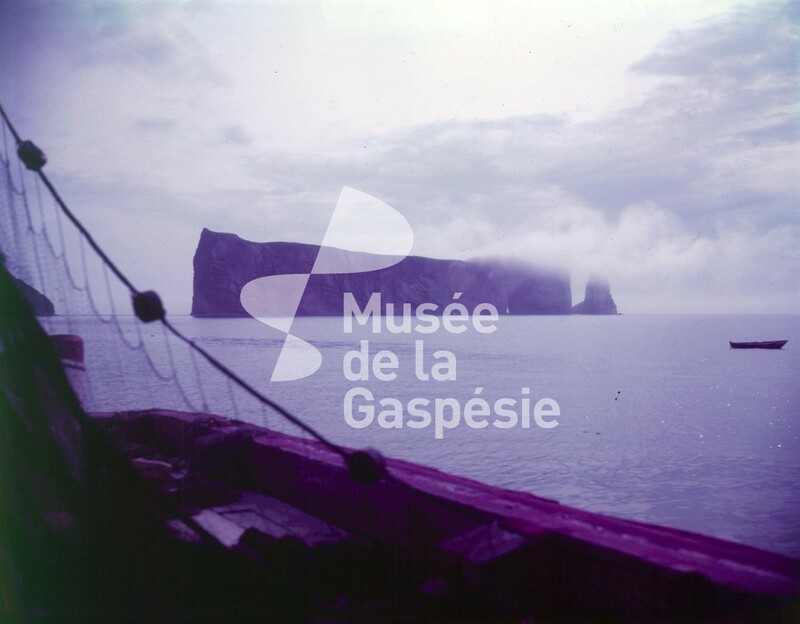 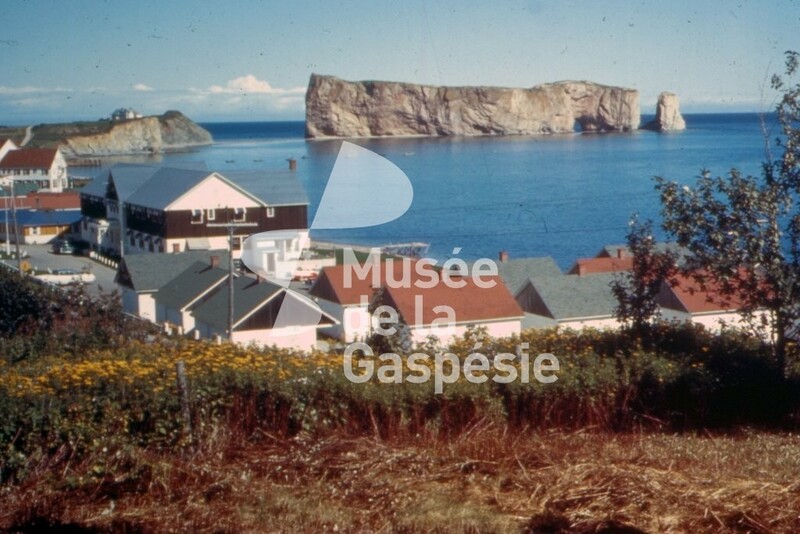 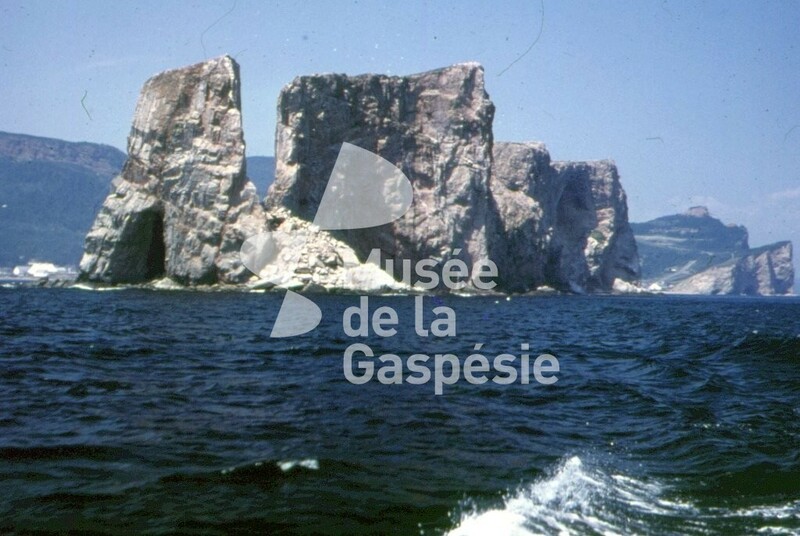 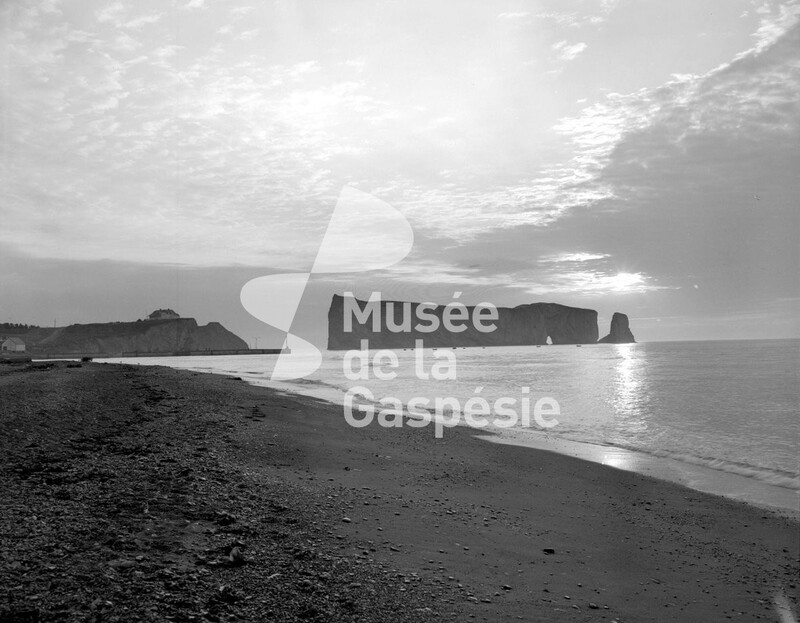 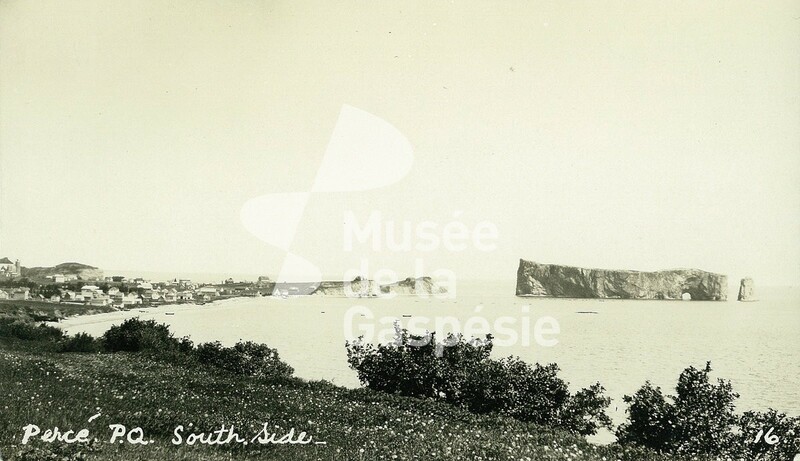 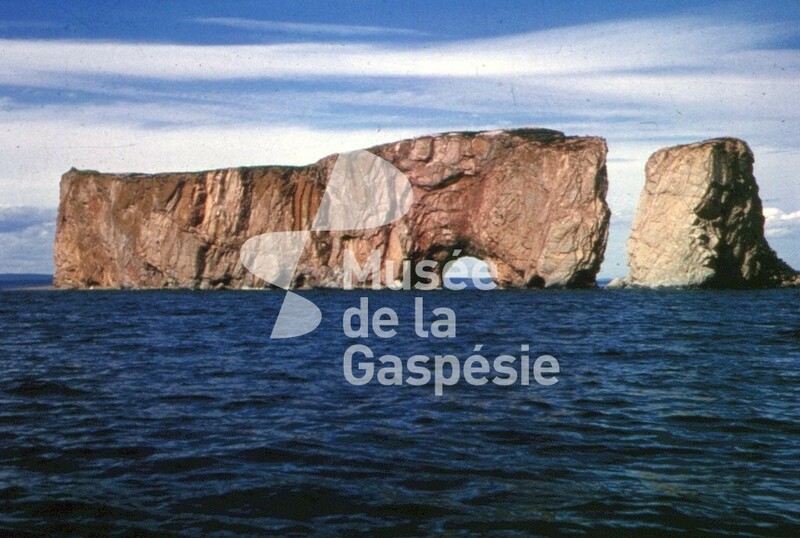 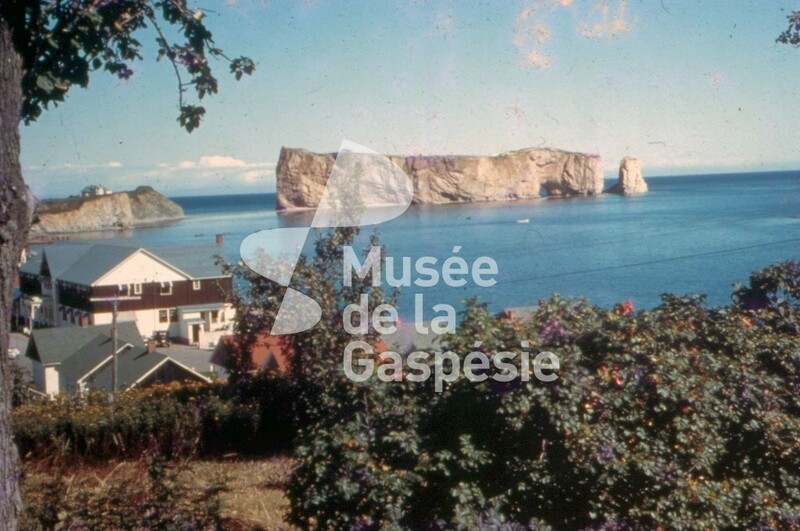 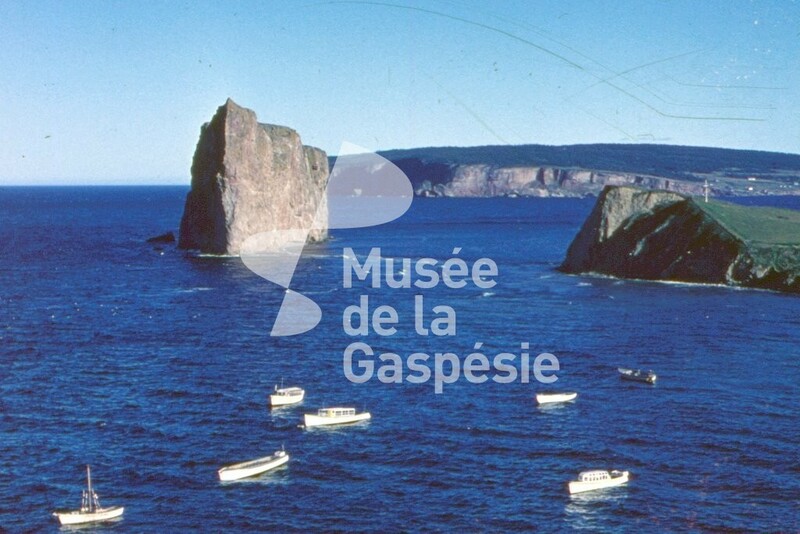 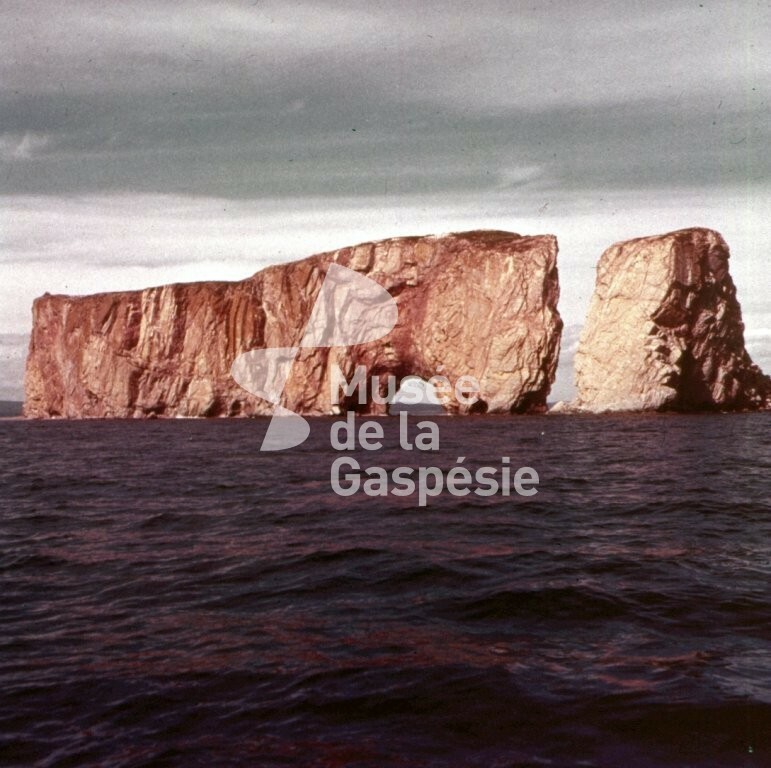 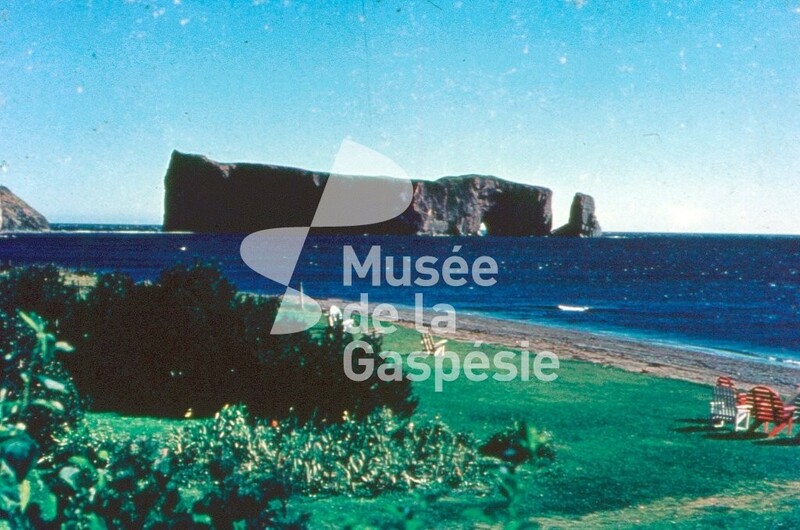 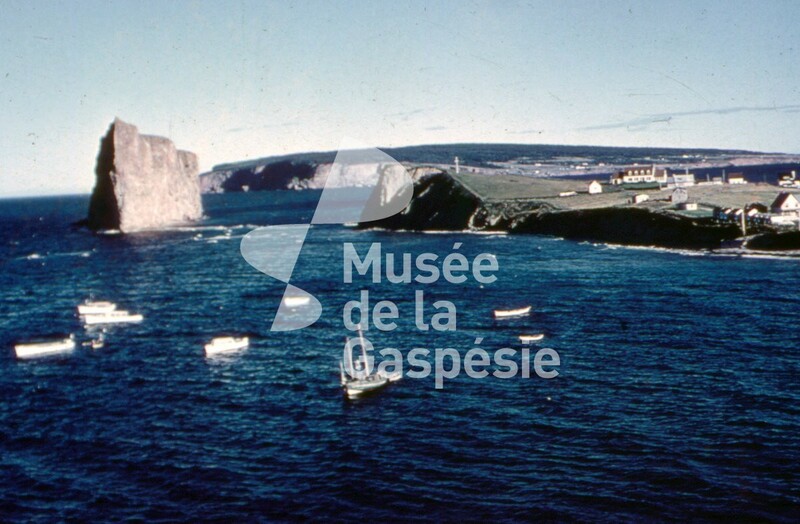 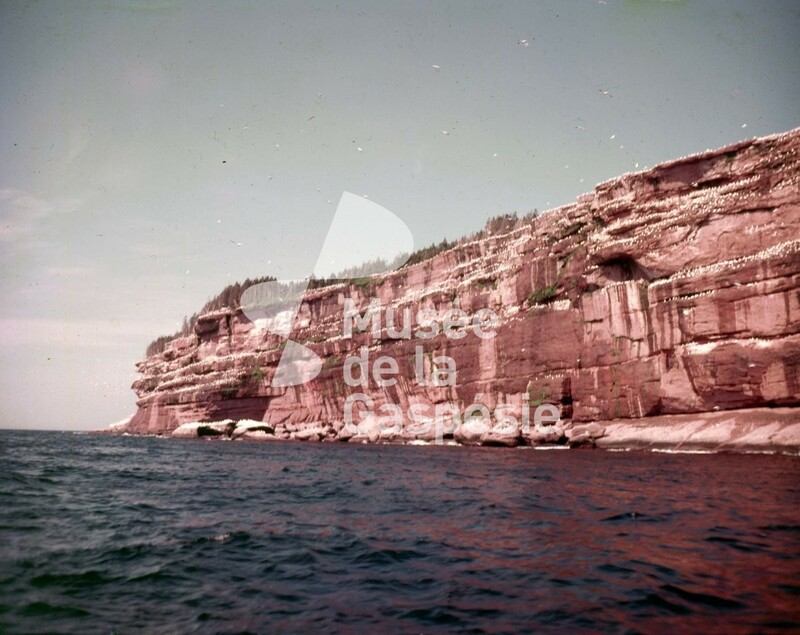 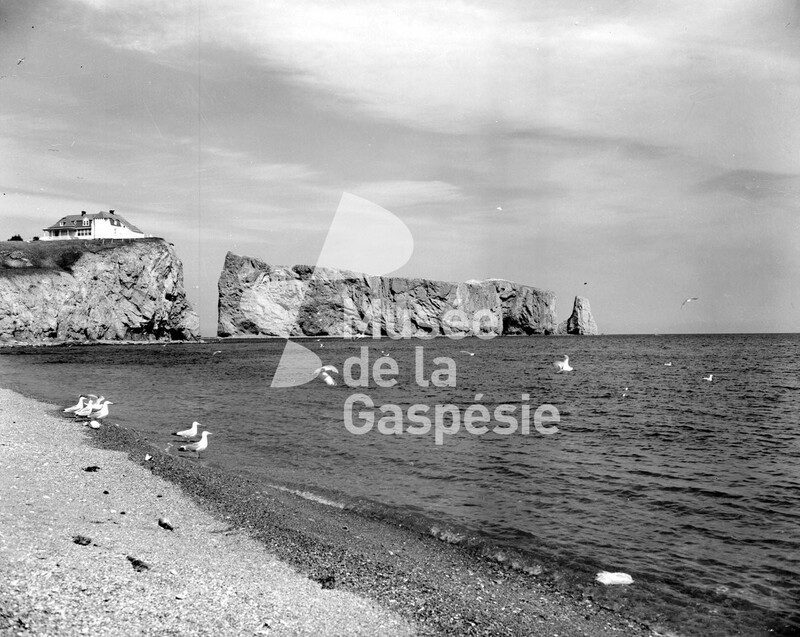 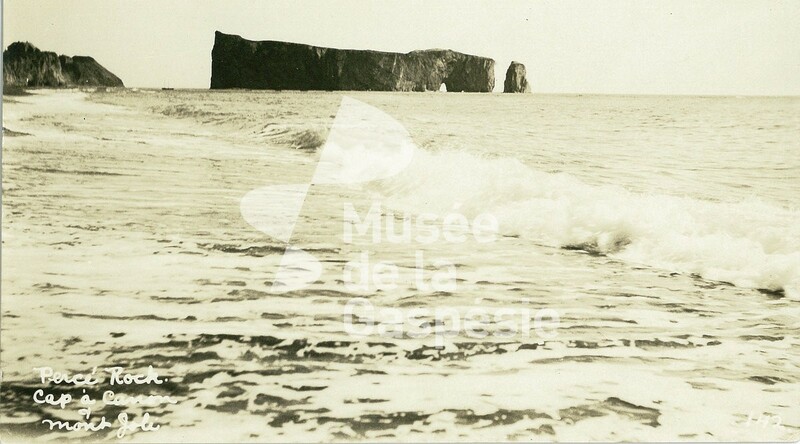 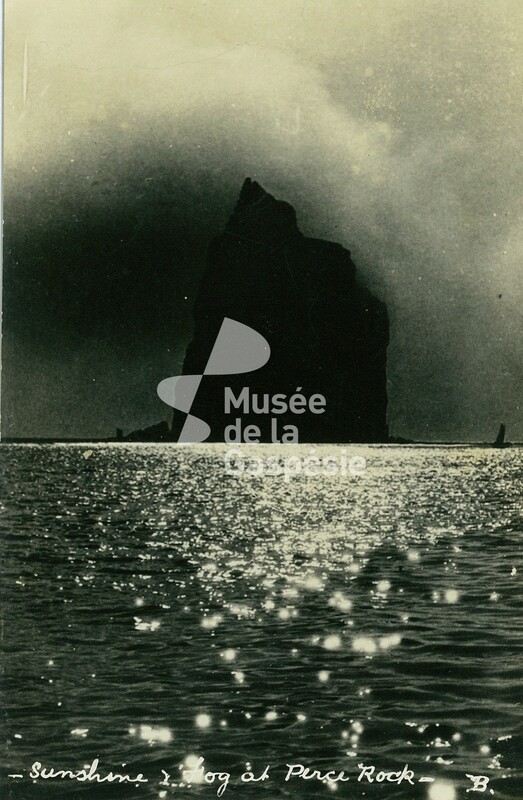 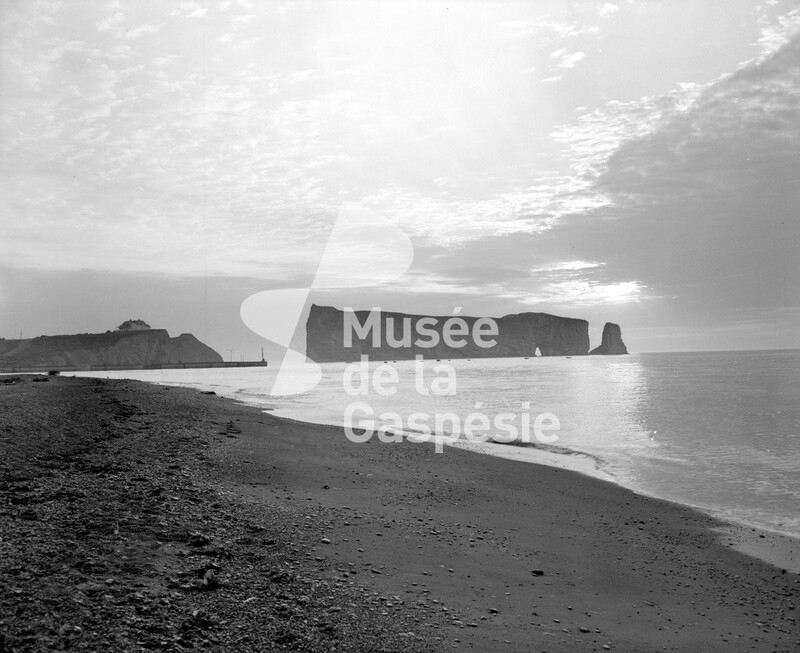 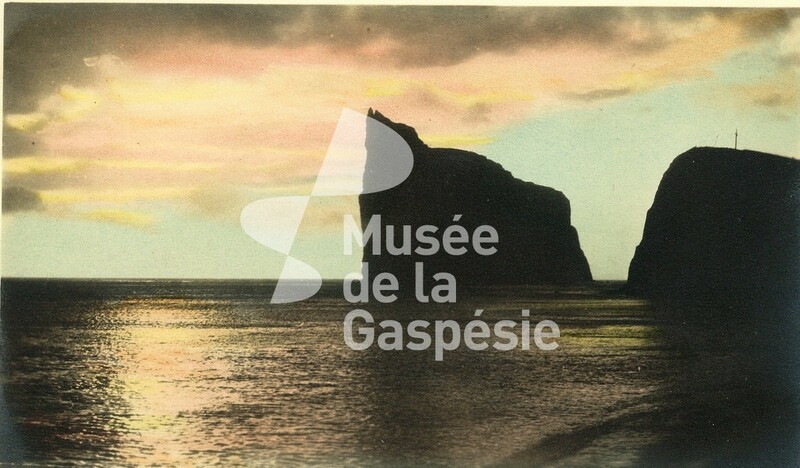 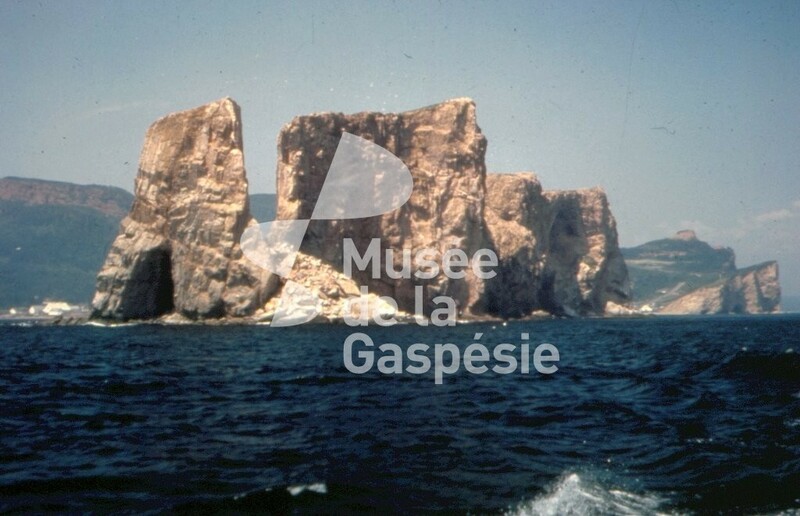 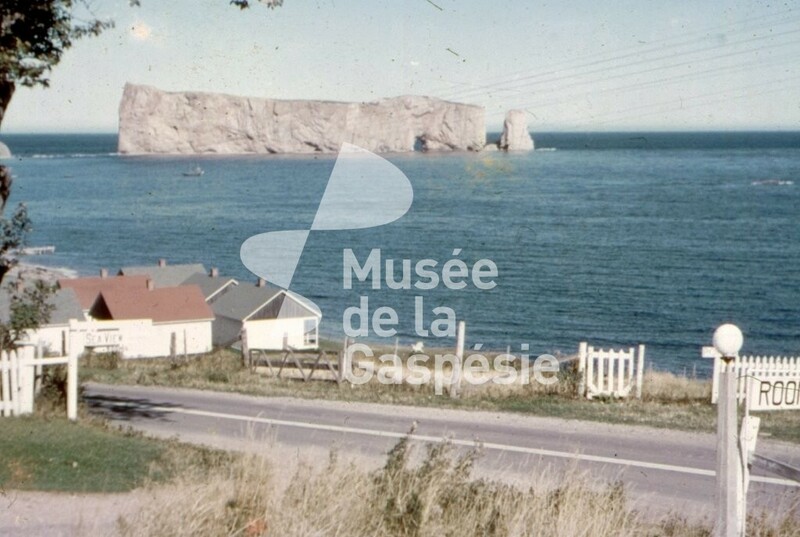 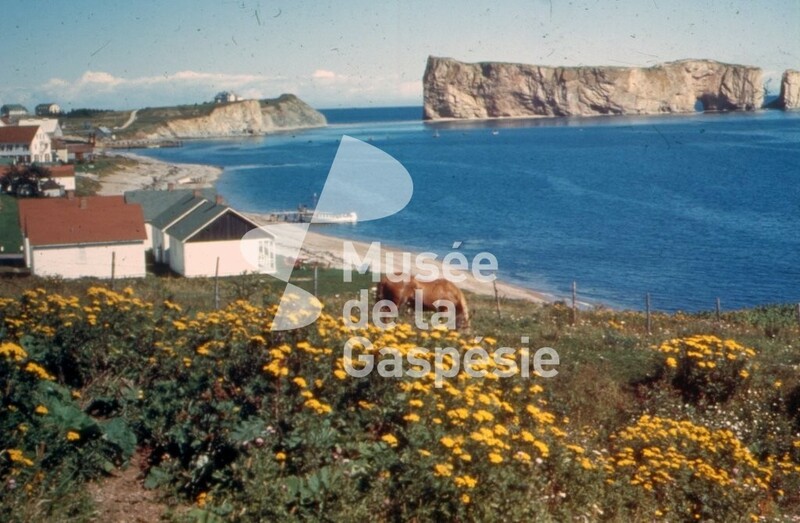 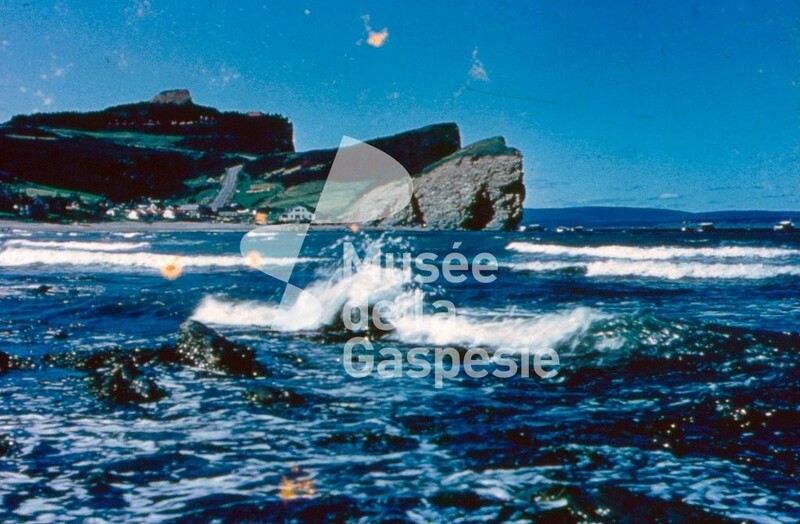 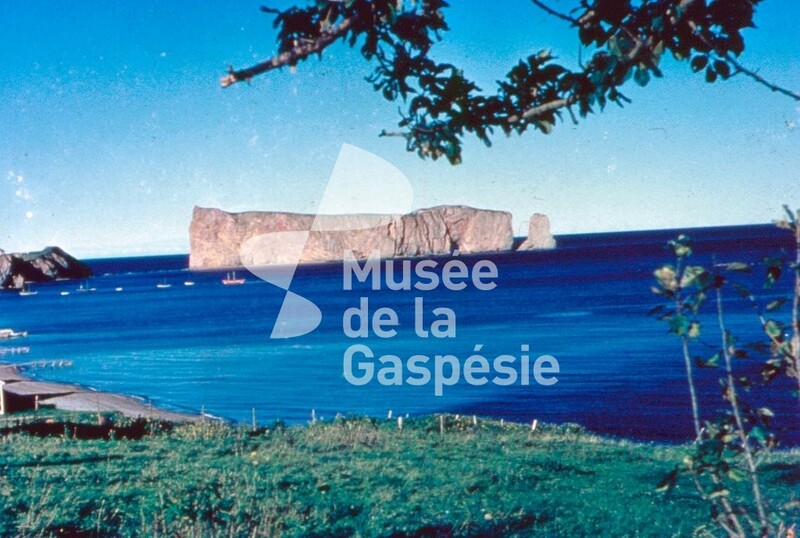 Negative showing Percé Rock and Mont-Joli seen from l’Anse-du-Nord. 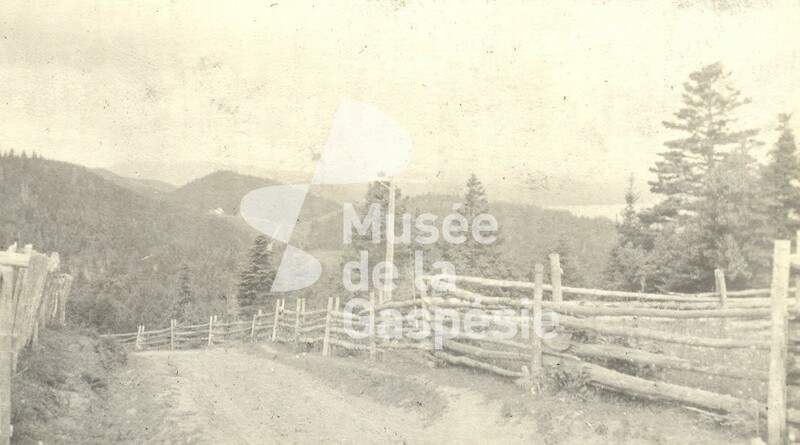 Negative showing Cap Bon Ami. 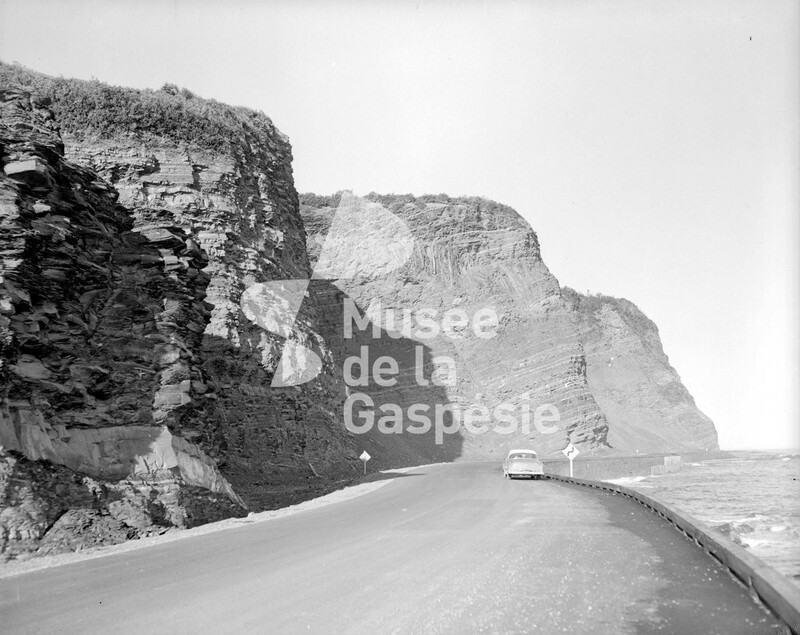 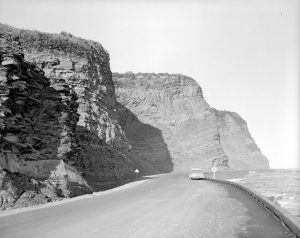 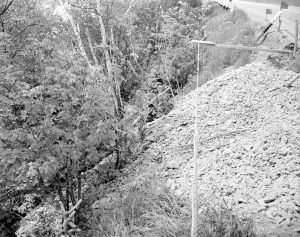 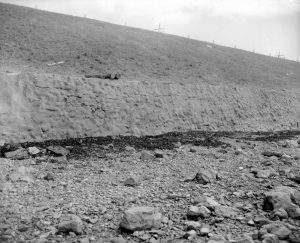 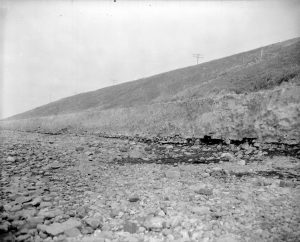 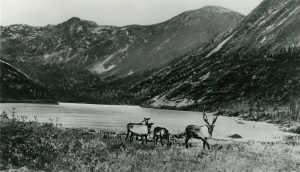 Negative showing Cliffs road in the Gros Morne sector. 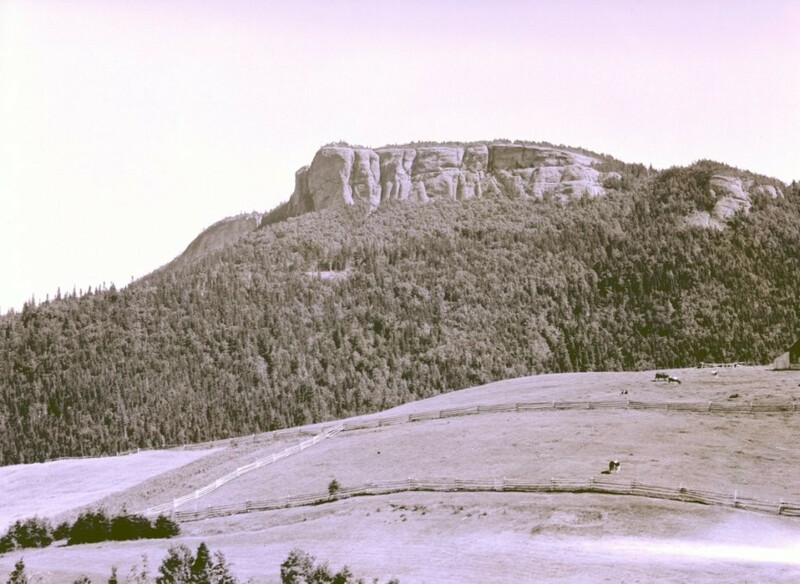 Negative showing Emile Landry’s mountain in Carleton. Negative showing Mont-Saint-Joseph in Carleton. 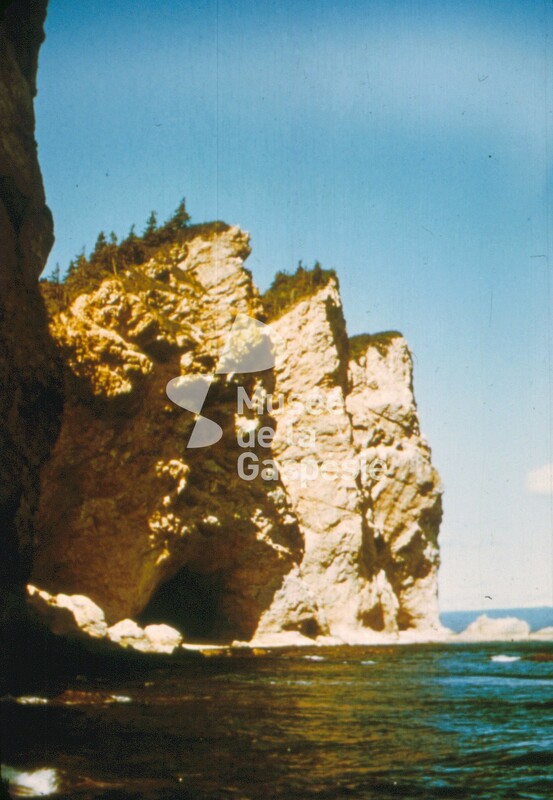 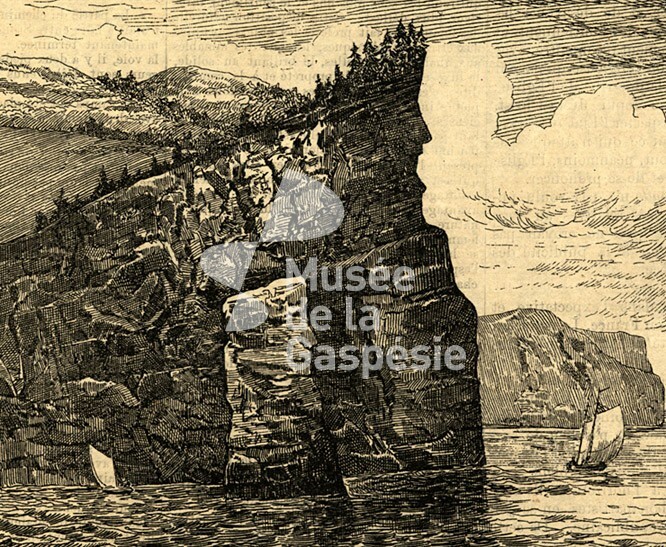 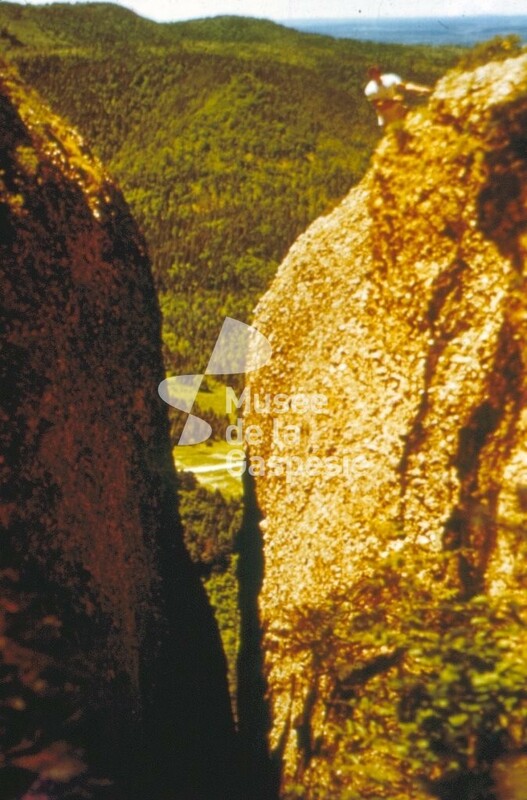 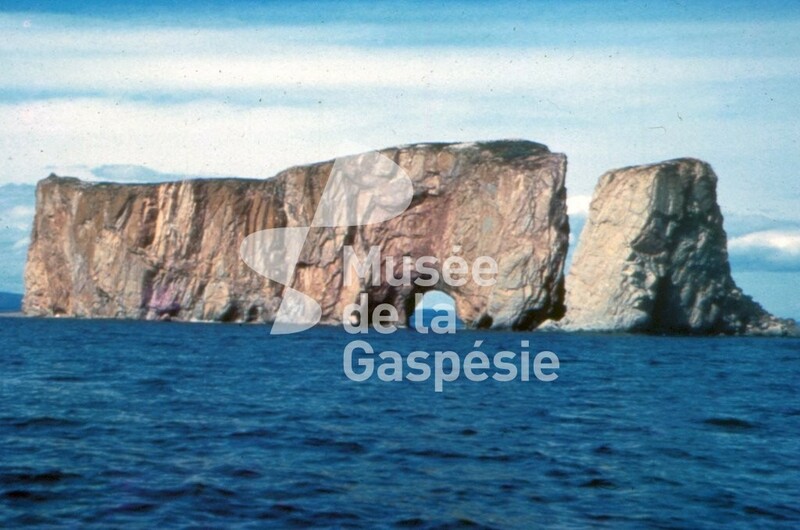 Negative showing mountainous terrain, cliffs and reefs in Gros Morne. 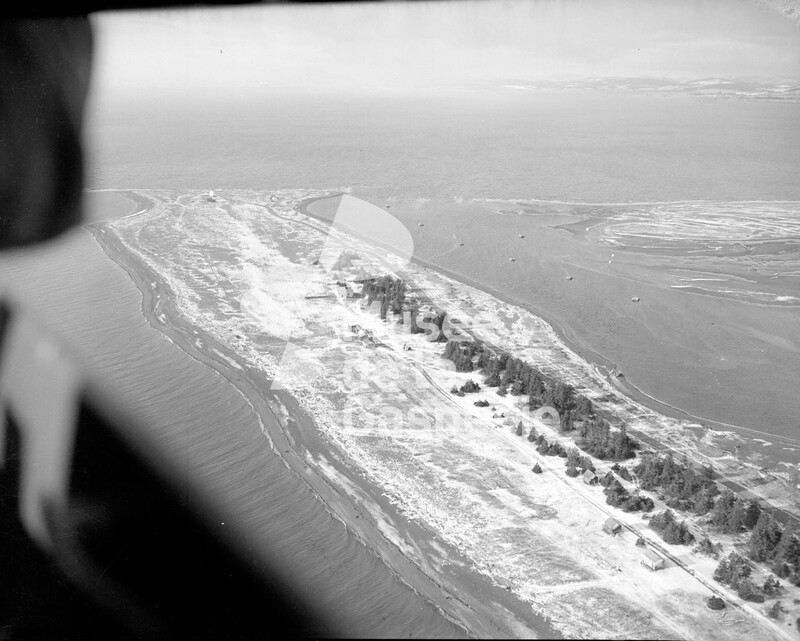 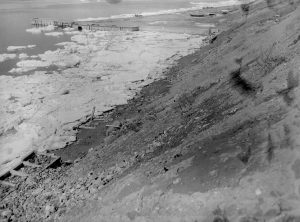 Negative showing an aerial view of Tracadigache Point and the barasway’s gully at Carleton. 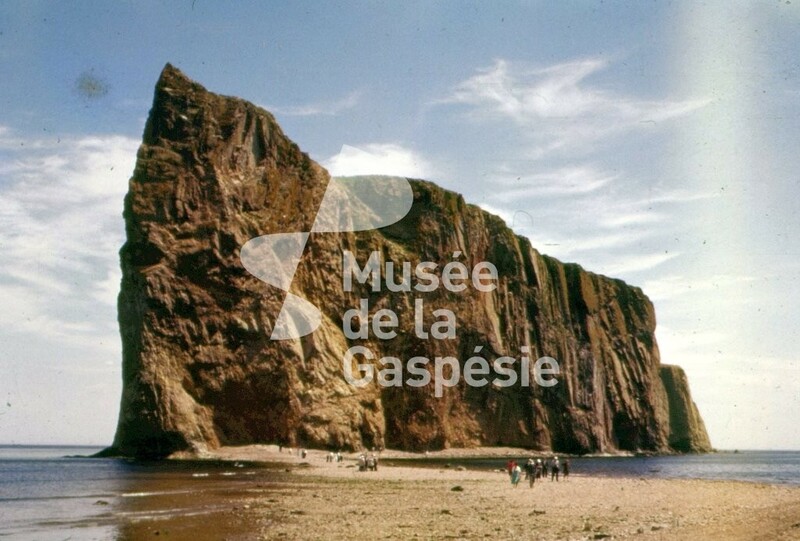 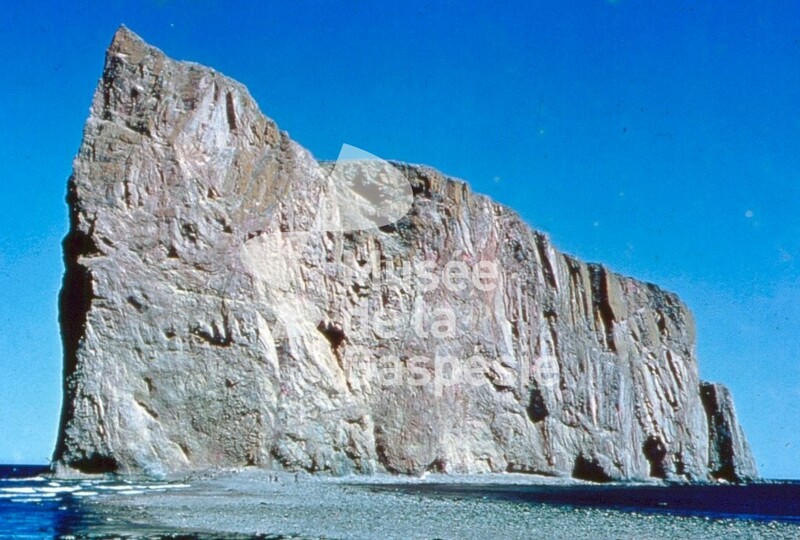 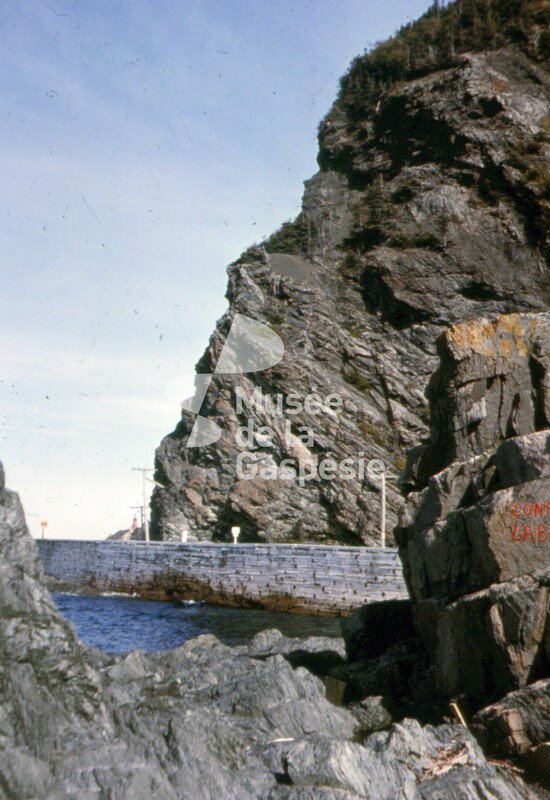 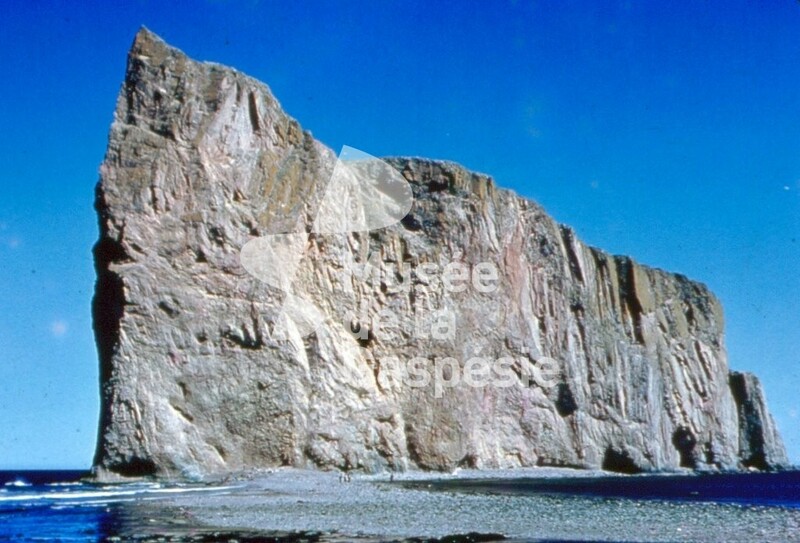 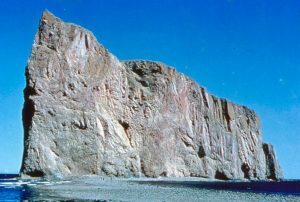 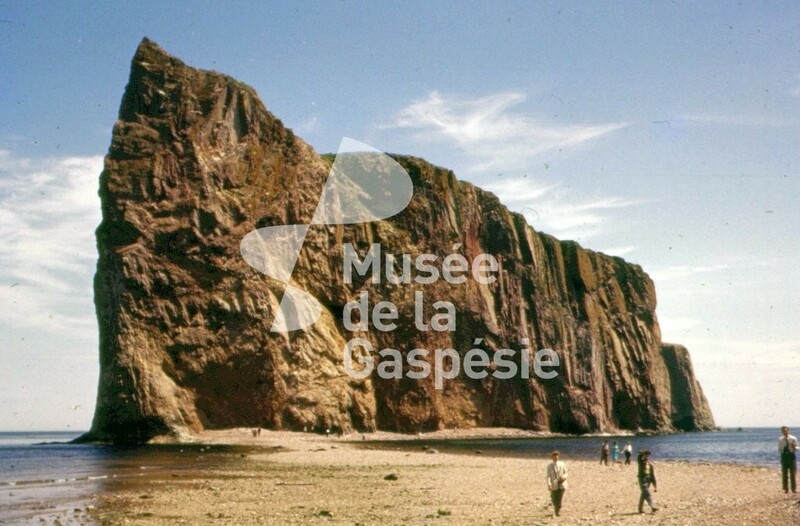 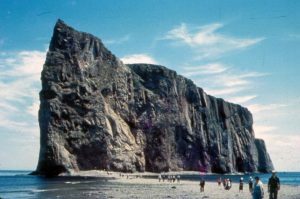 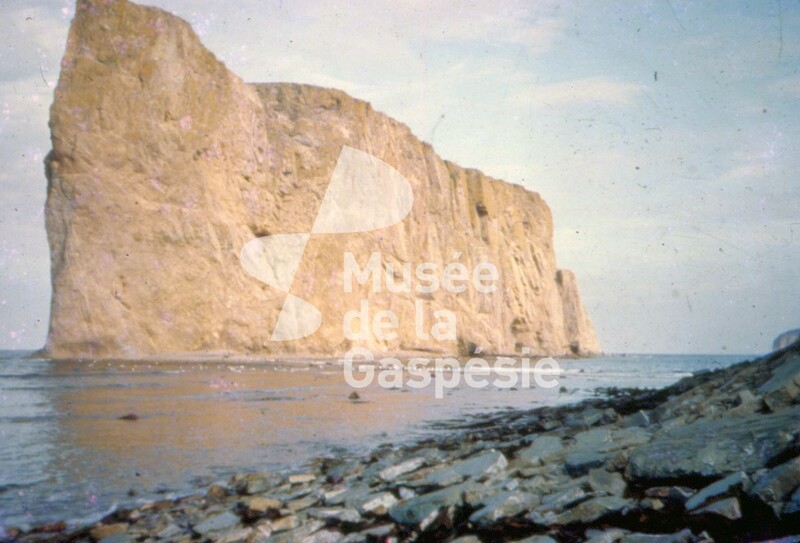 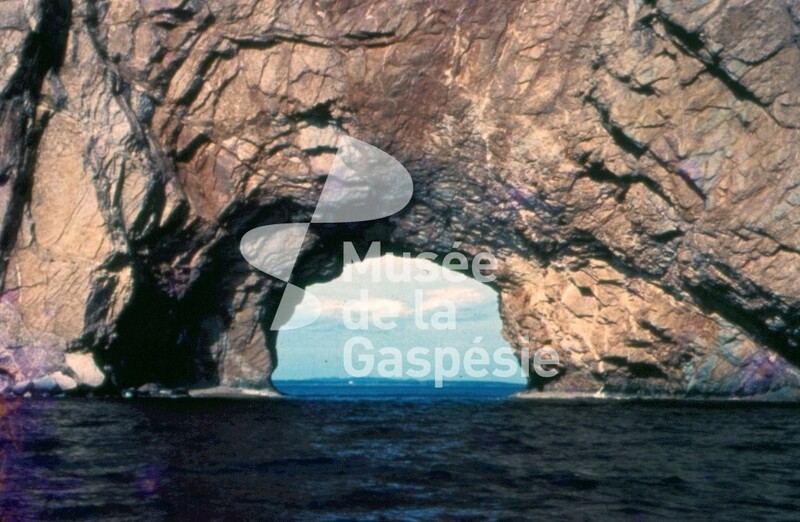 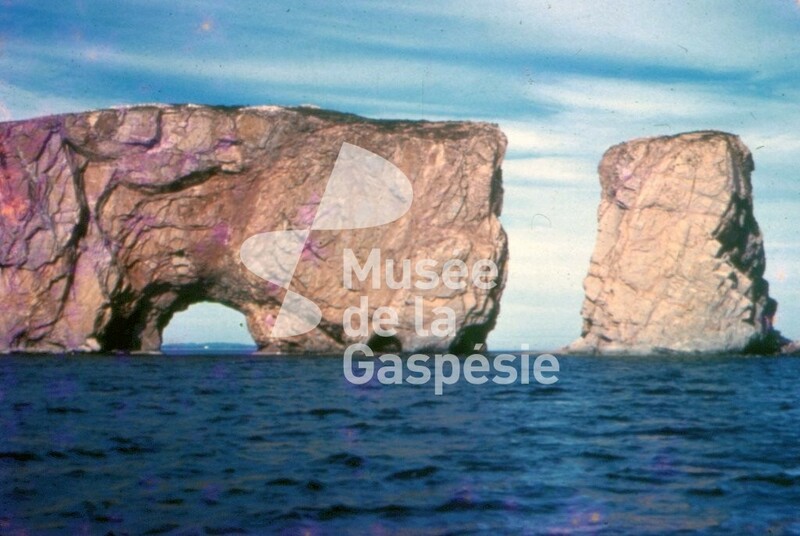 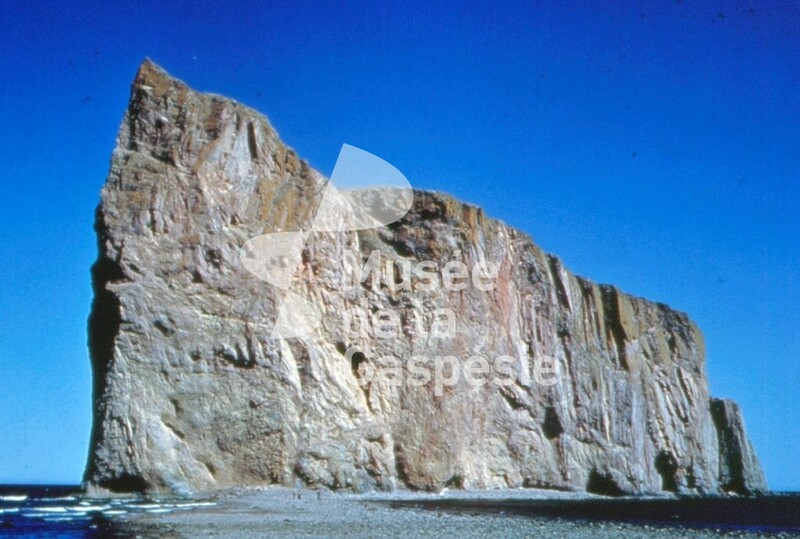 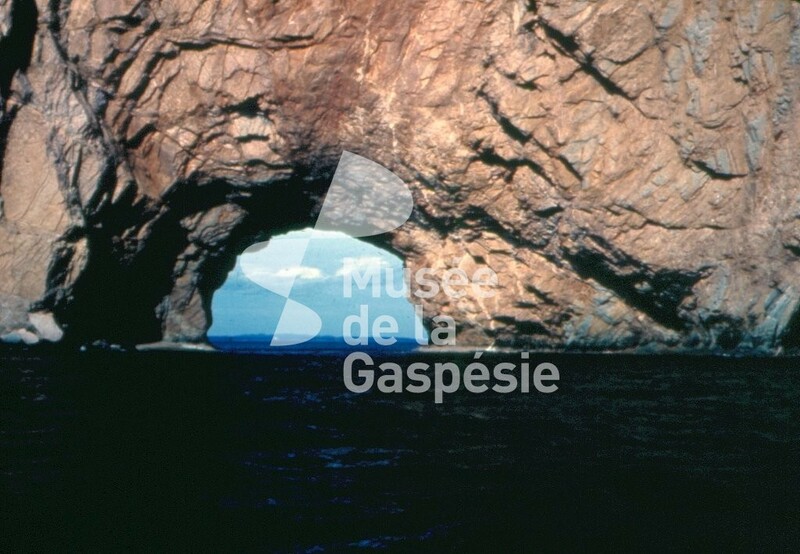 Negative showing a crevasse in Percé. 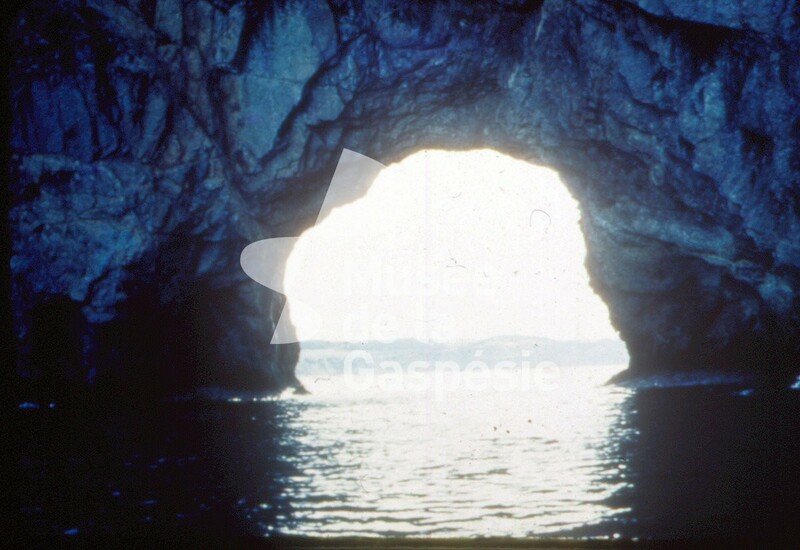 Negative showing a tourist atop a crevasse in Percé. 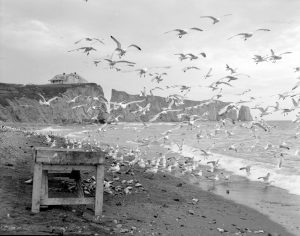 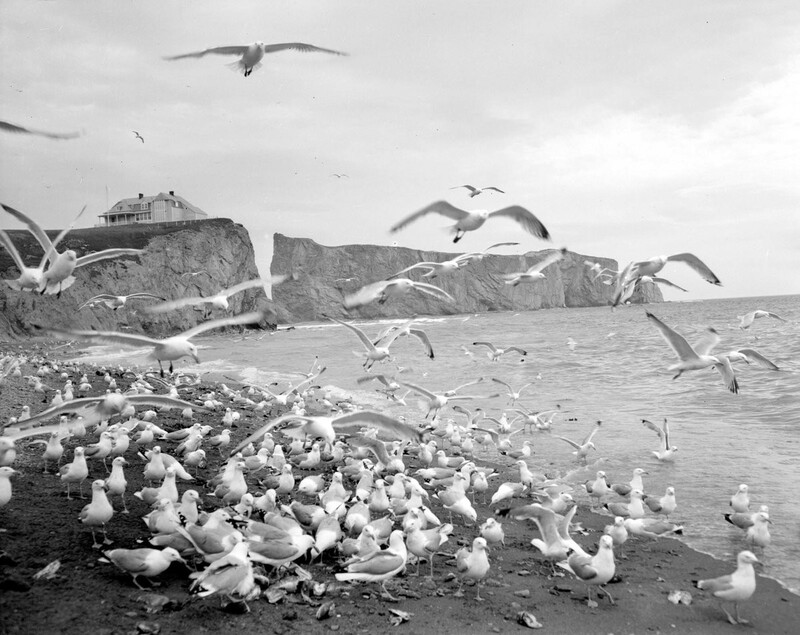 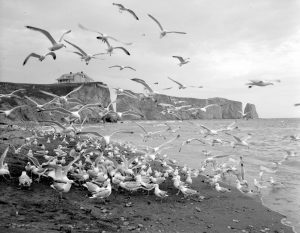 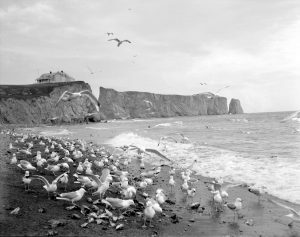 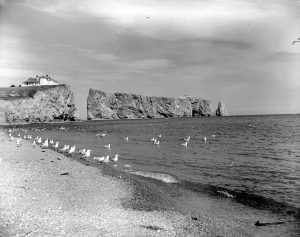 Negative showing a flock of seagulls on the beach at Percé. 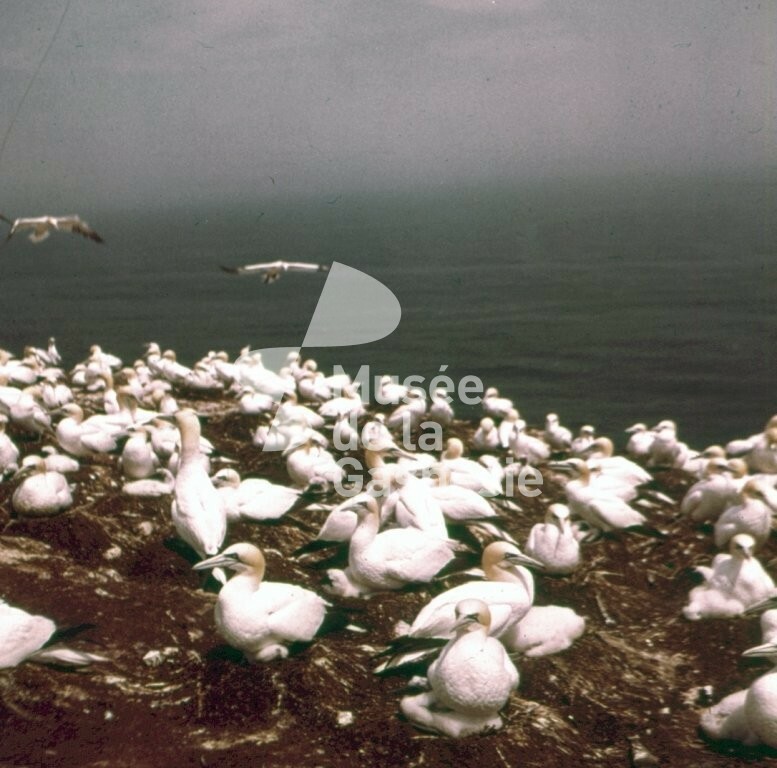 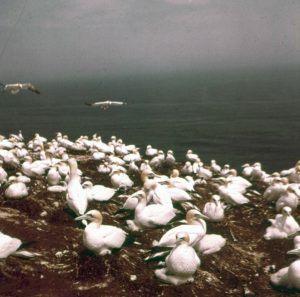 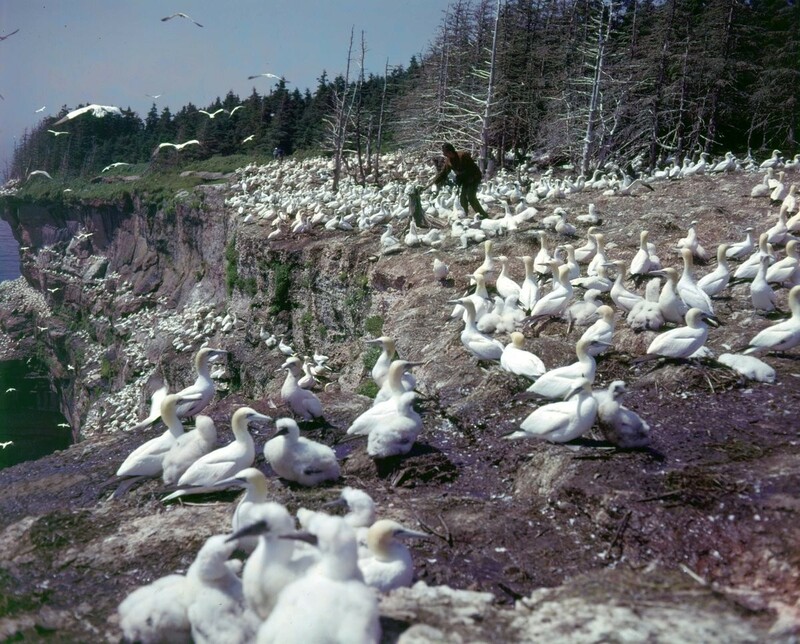 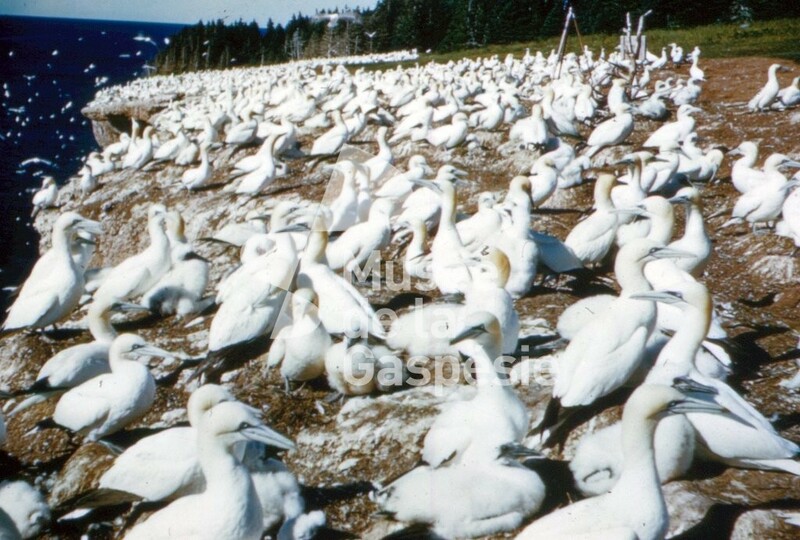 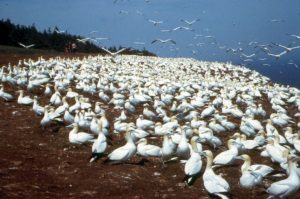 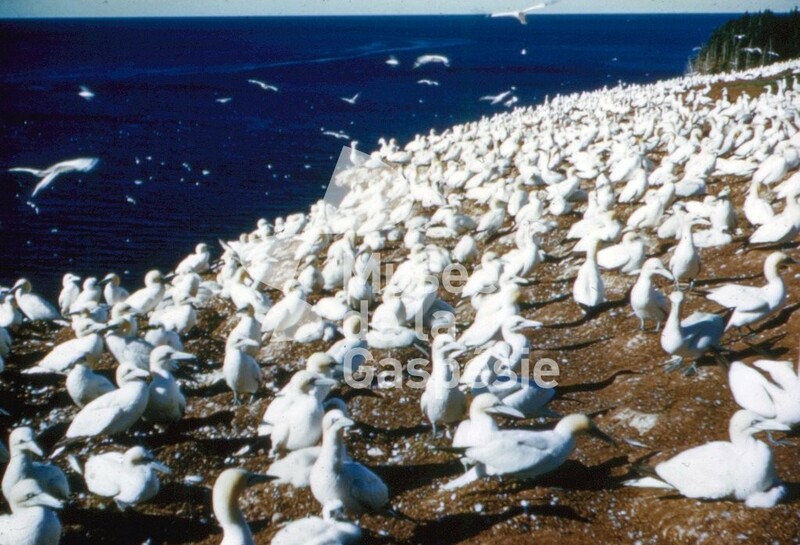 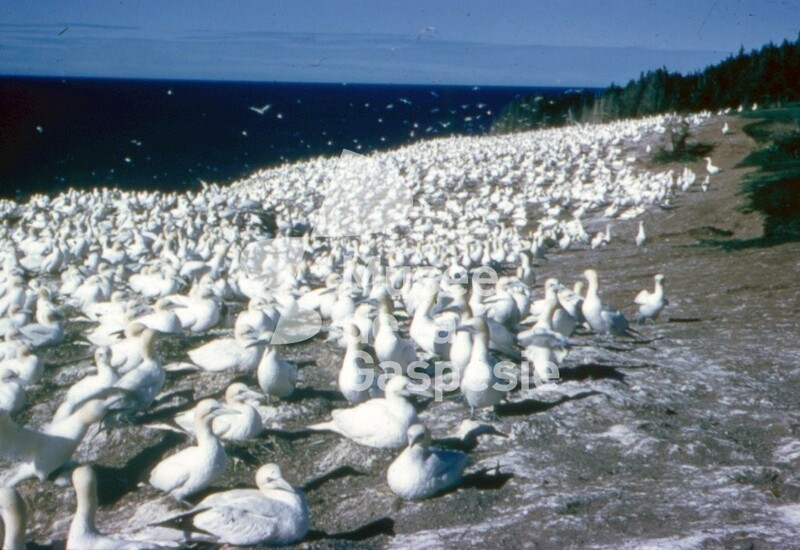 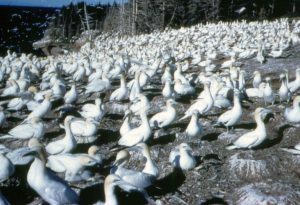 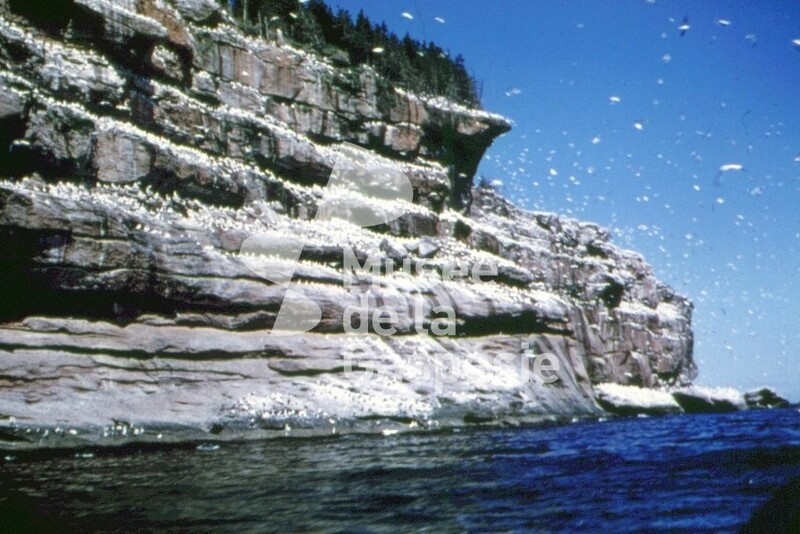 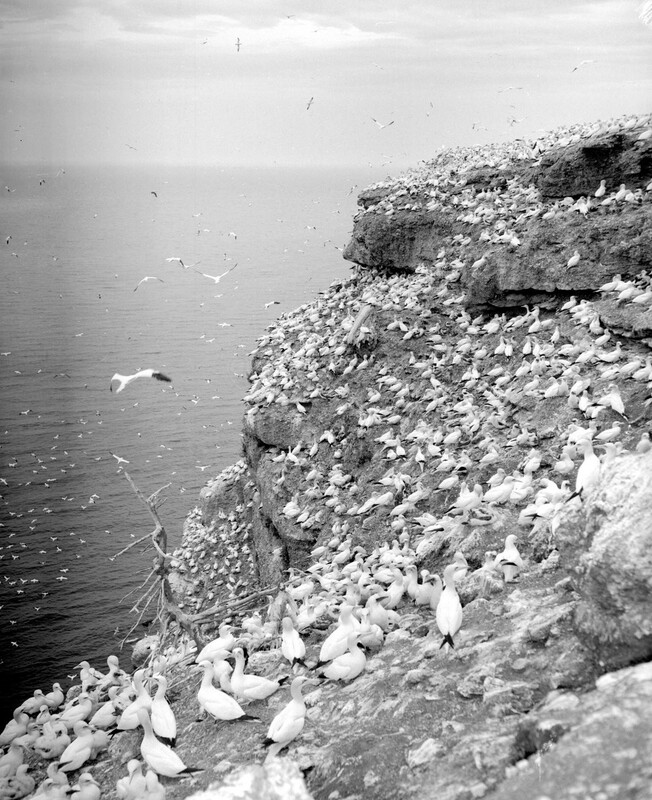 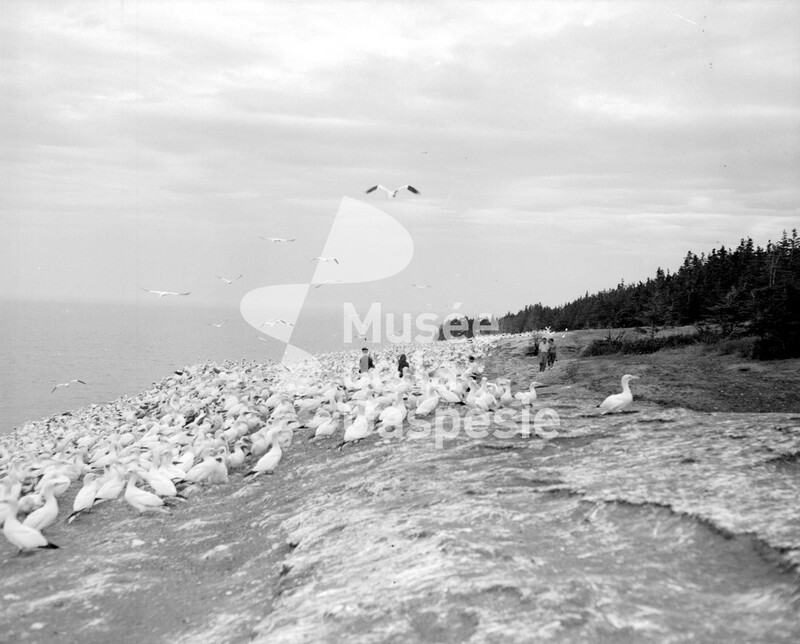 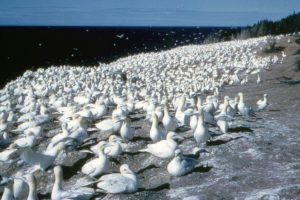 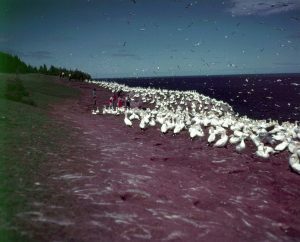 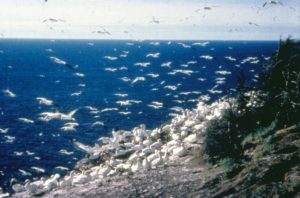 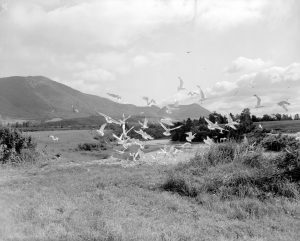 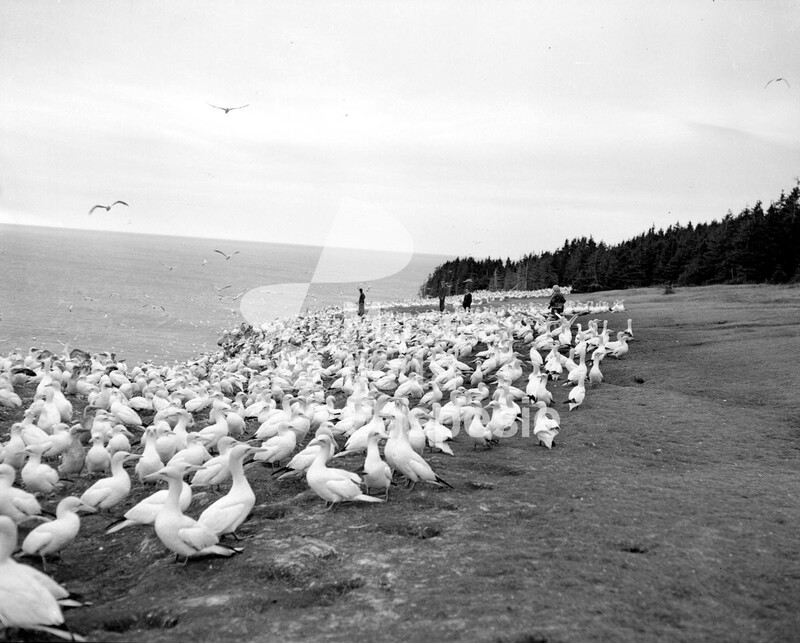 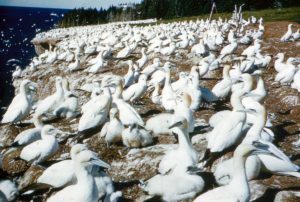 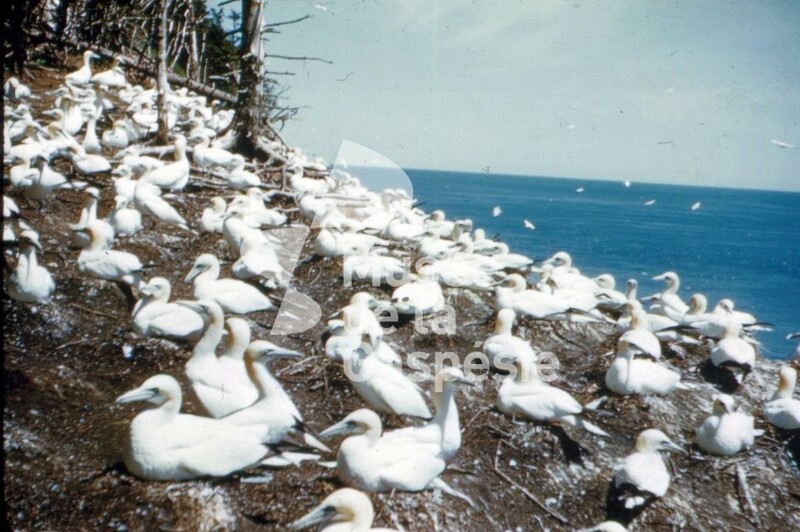 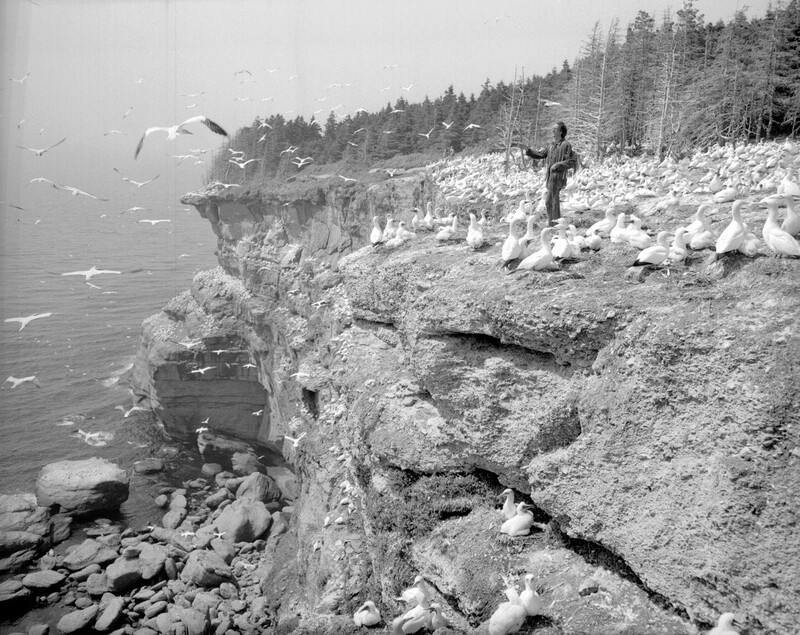 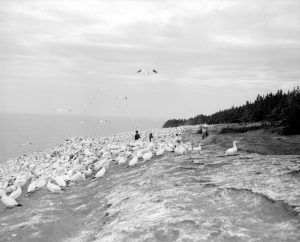 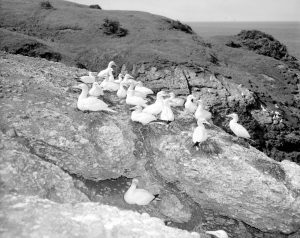 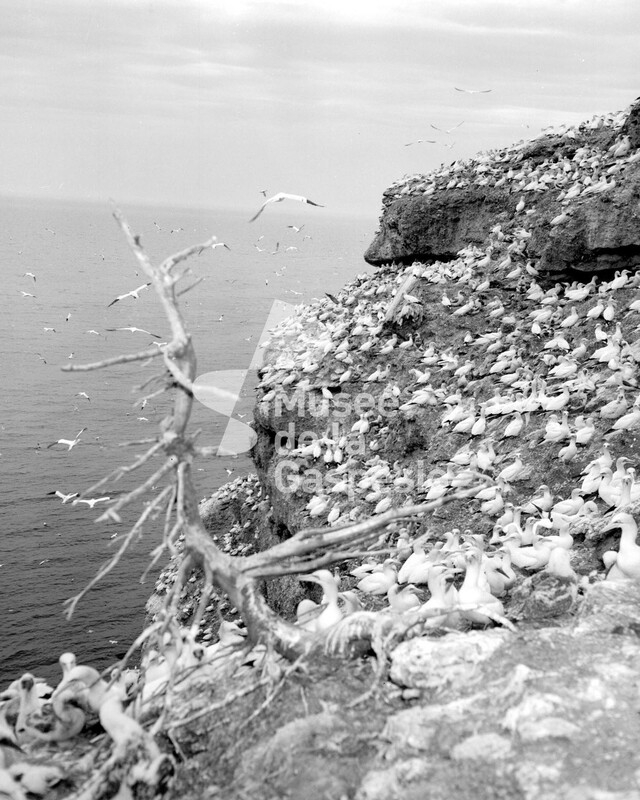 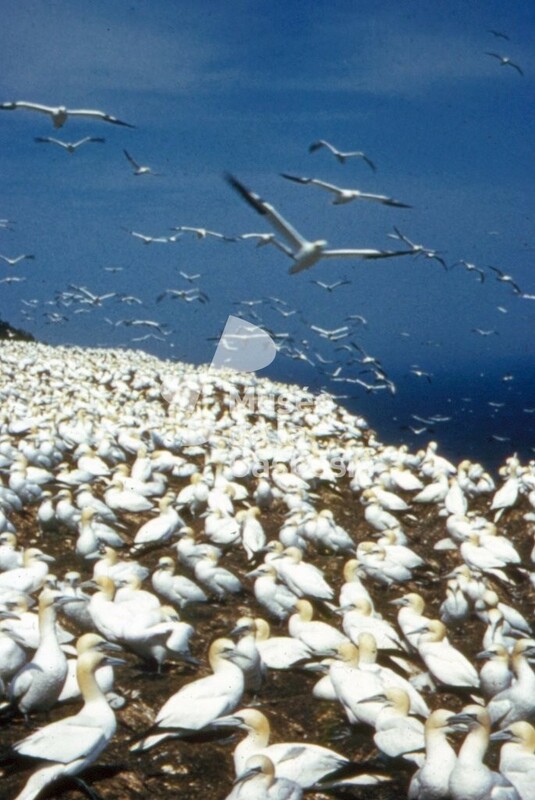 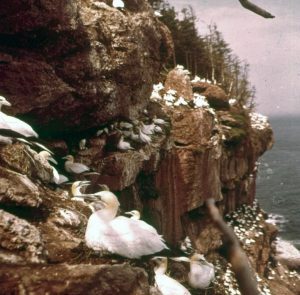 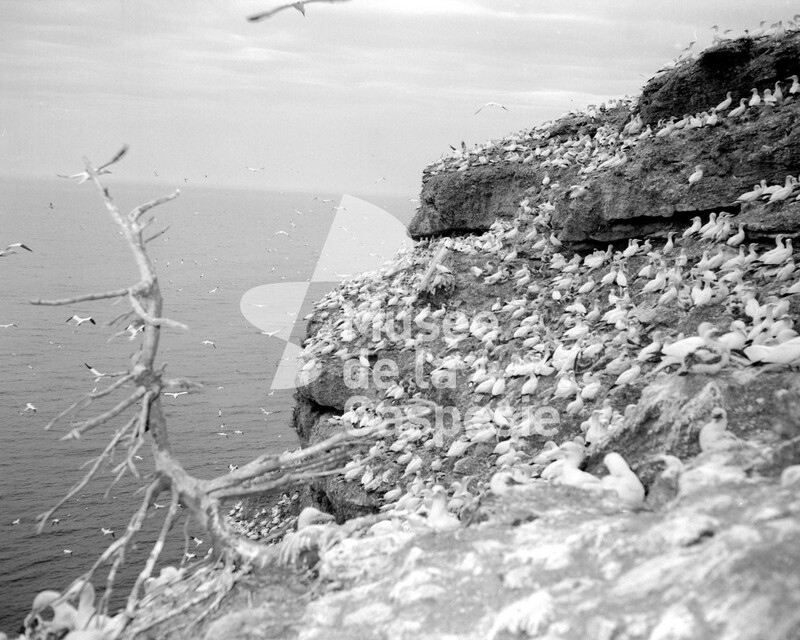 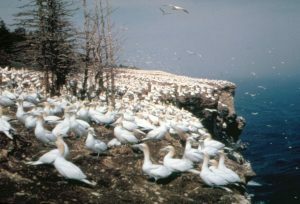 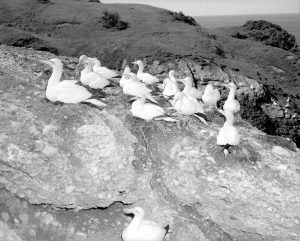 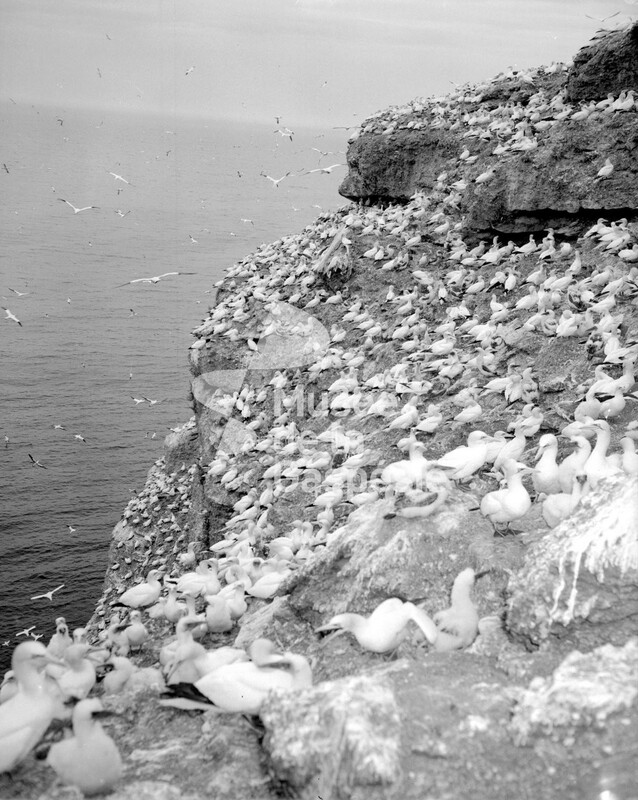 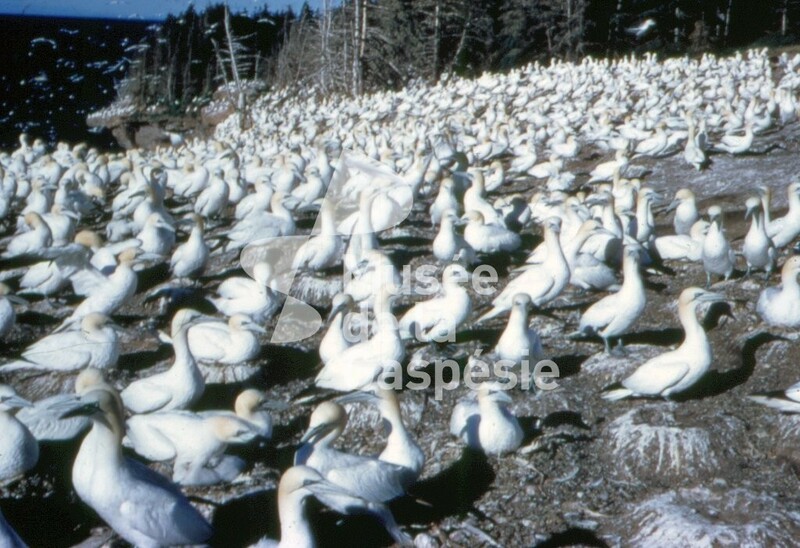 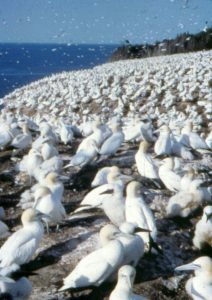 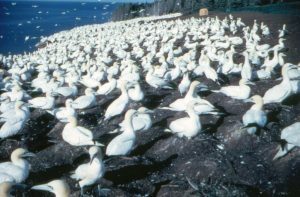 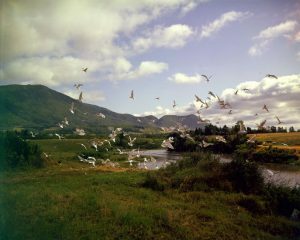 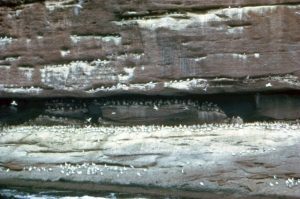 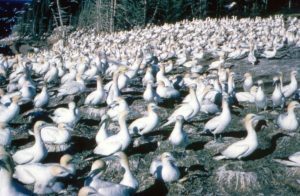 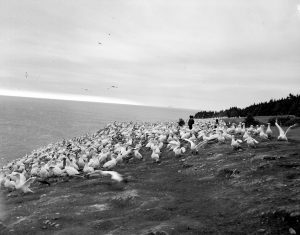 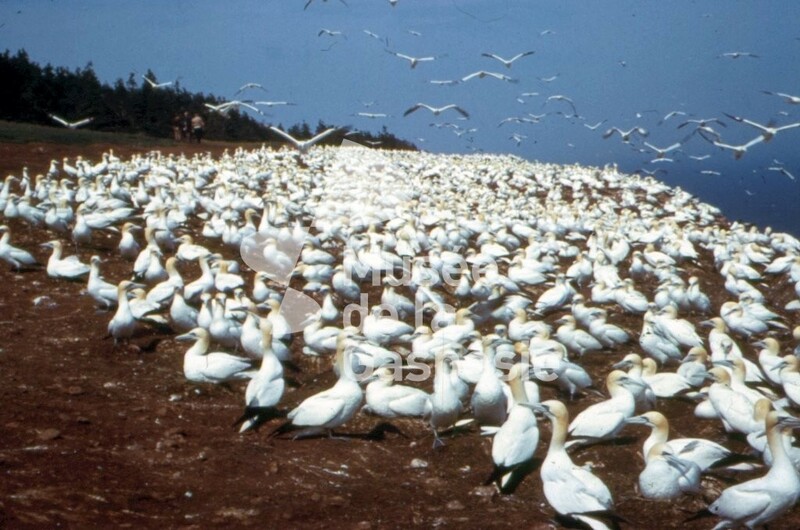 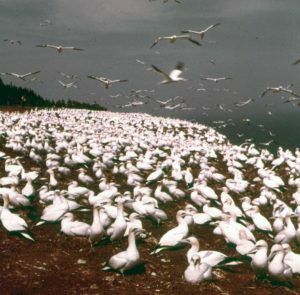 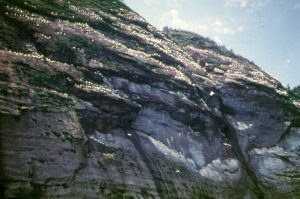 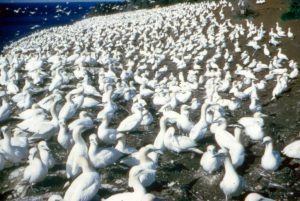 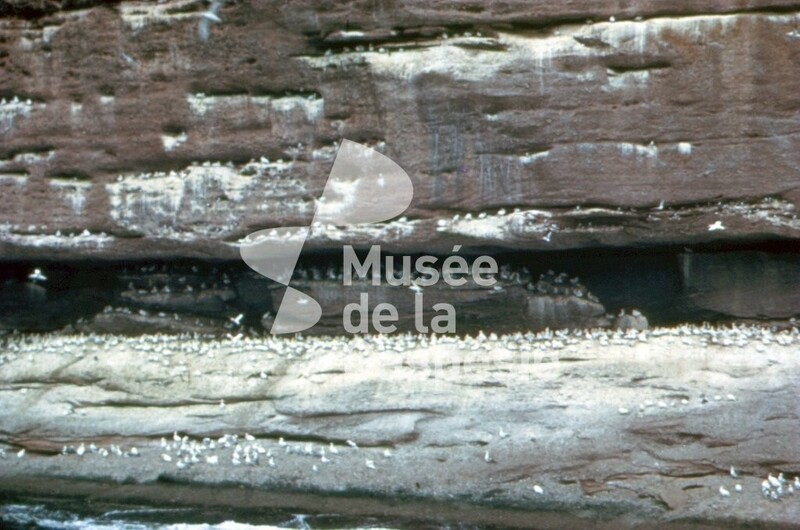 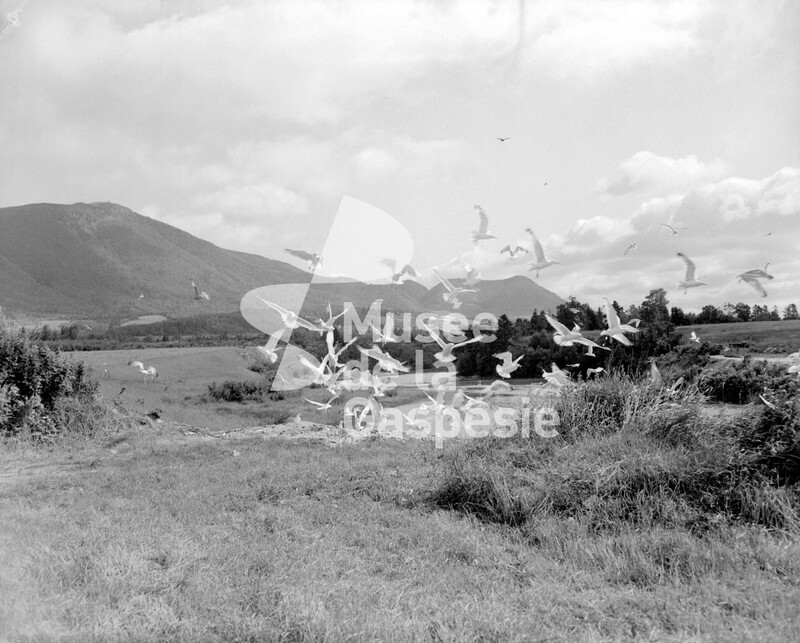 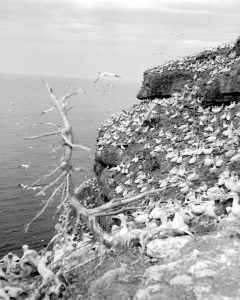 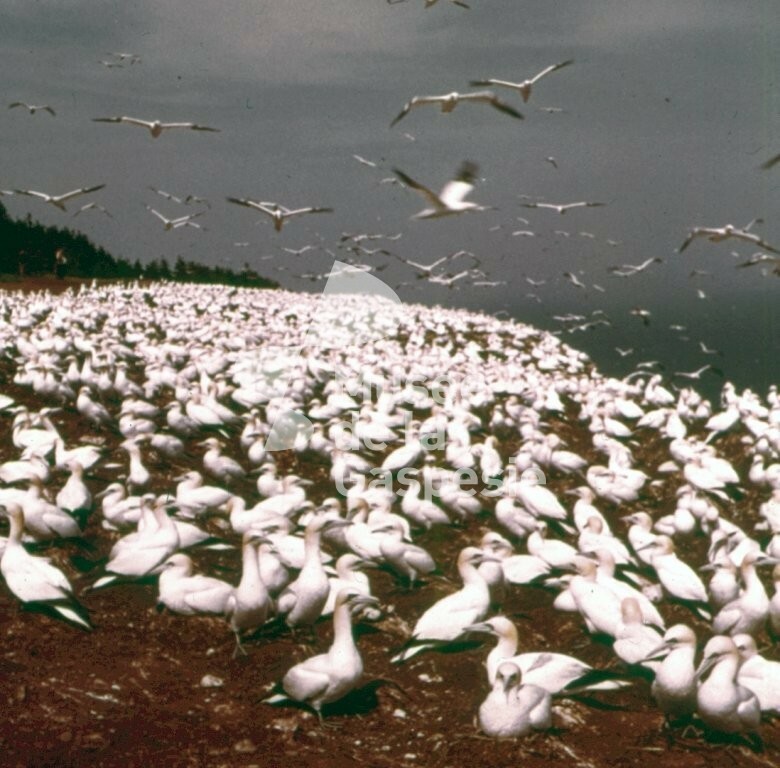 Negative showing hundreds of northern gannets atop a cliff on Bonaventure Island. 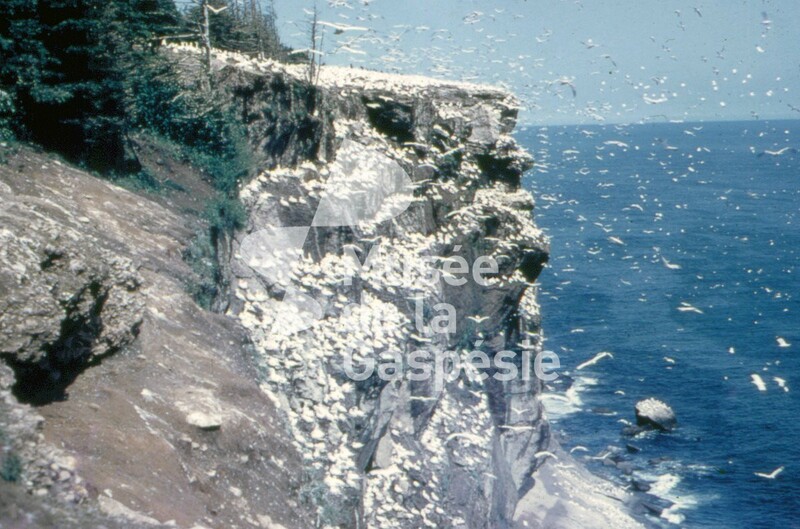 Negative showing some northern gannets on the wing over a cliff at Bonaventure Island. 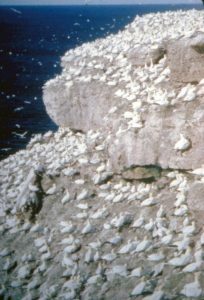 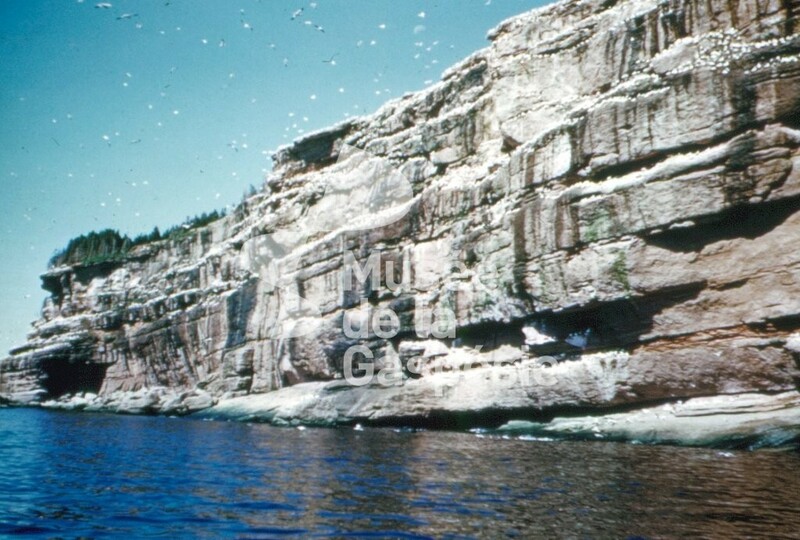 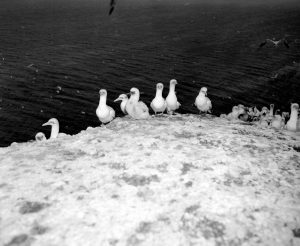 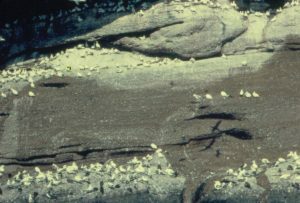 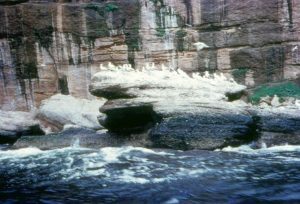 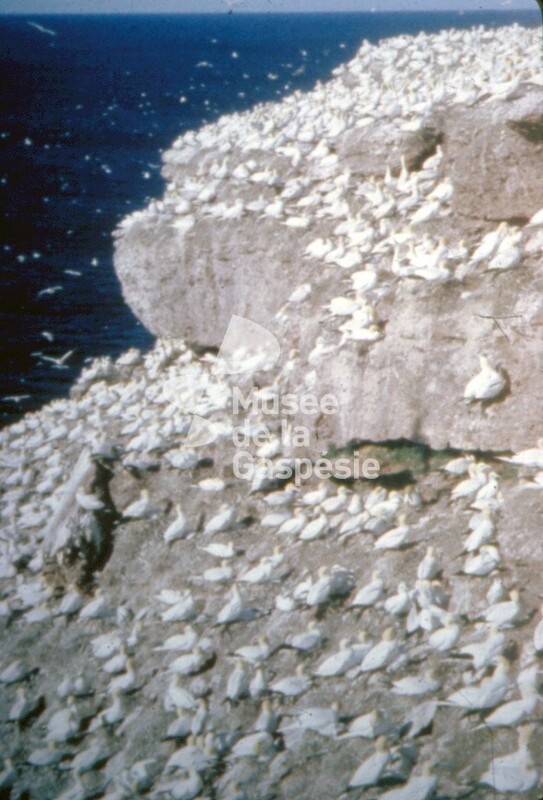 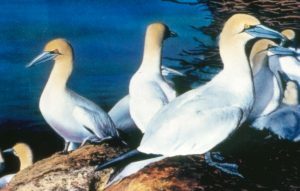 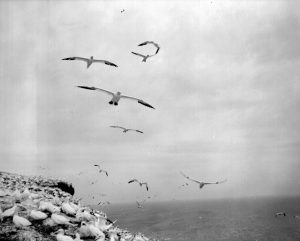 Negative showing many northern gannets atop a cliff on Bonaventure Island. 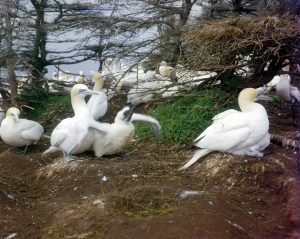 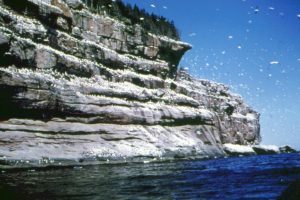 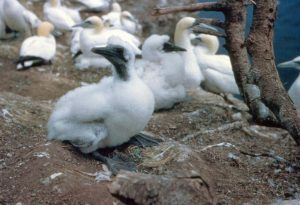 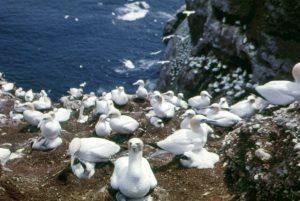 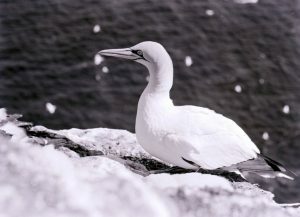 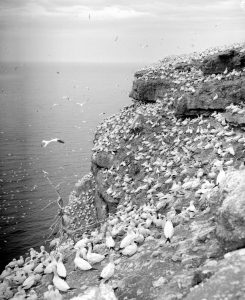 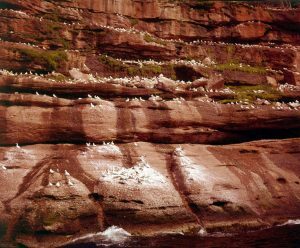 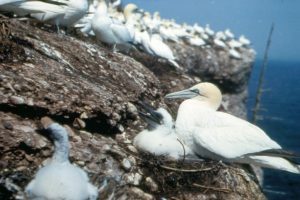 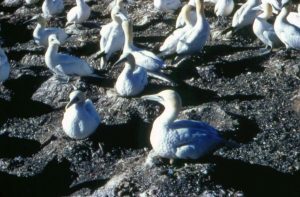 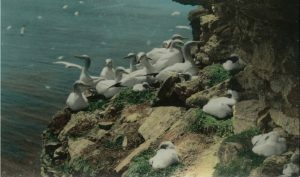 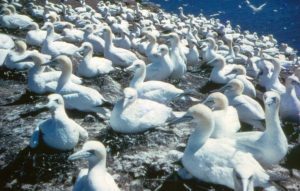 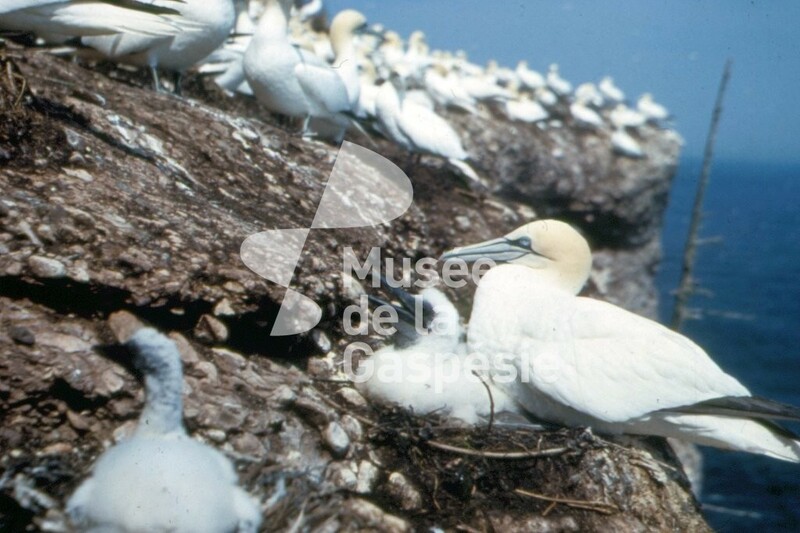 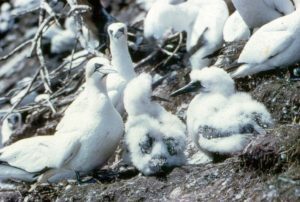 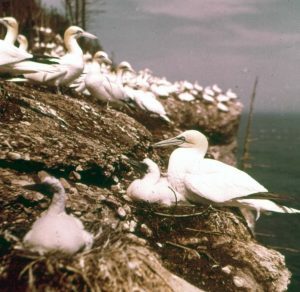 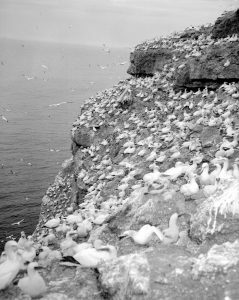 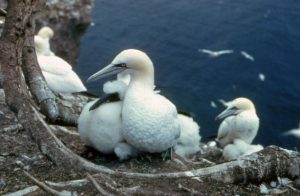 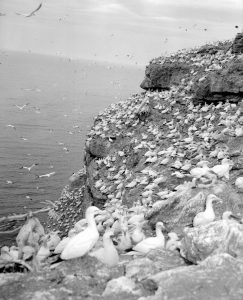 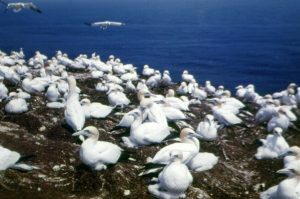 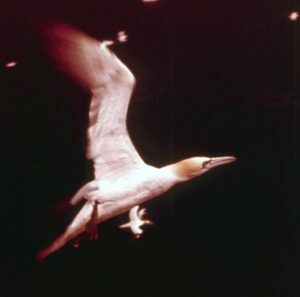 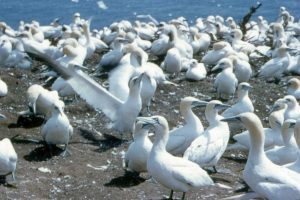 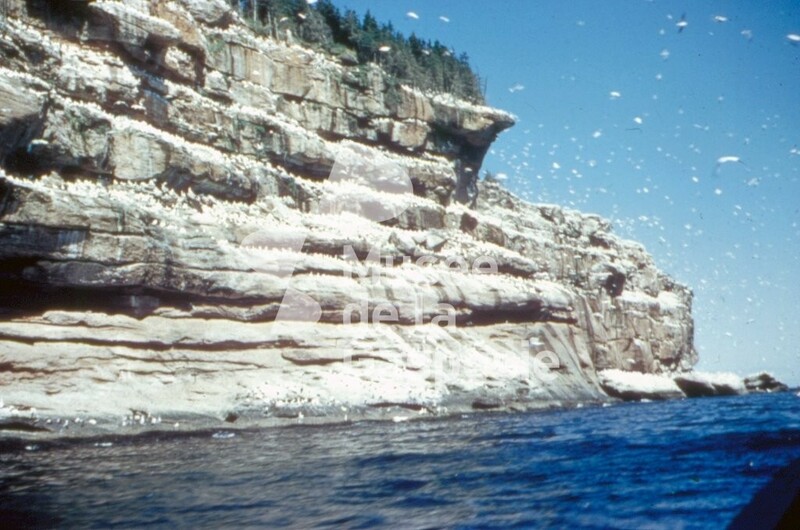 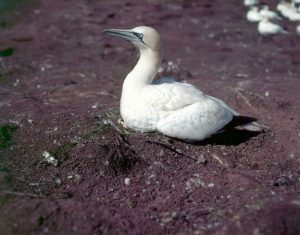 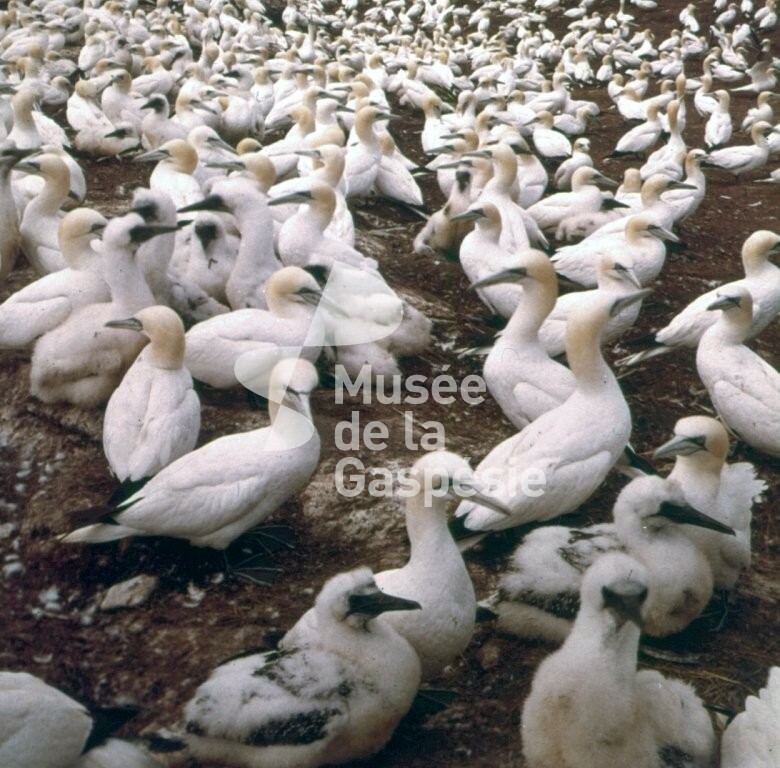 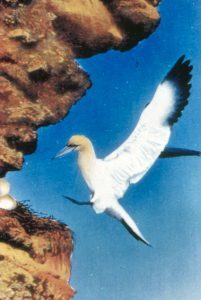 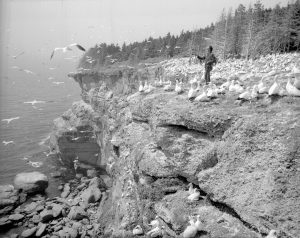 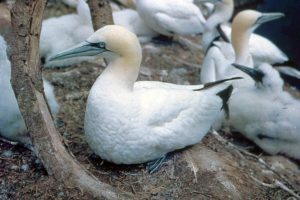 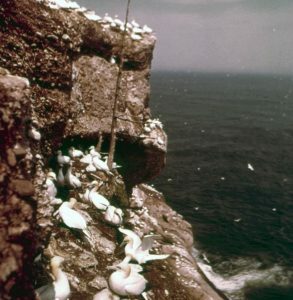 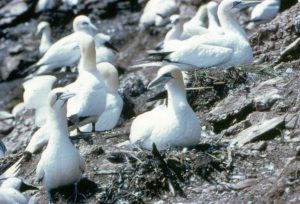 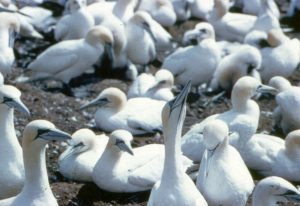 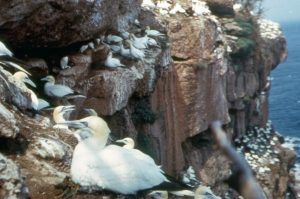 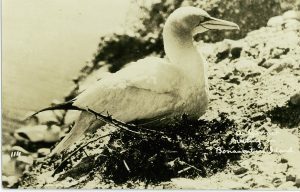 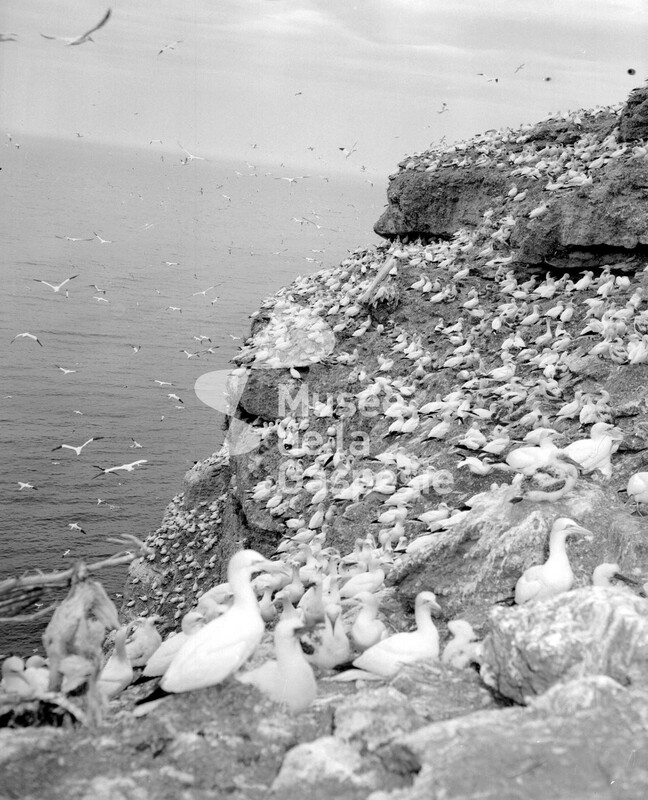 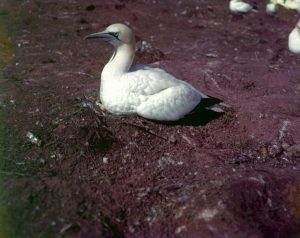 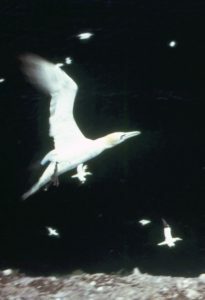 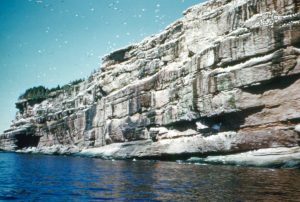 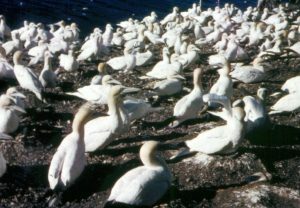 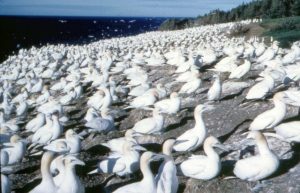 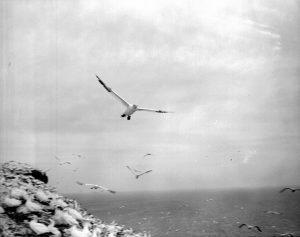 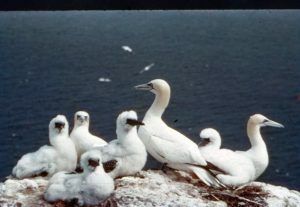 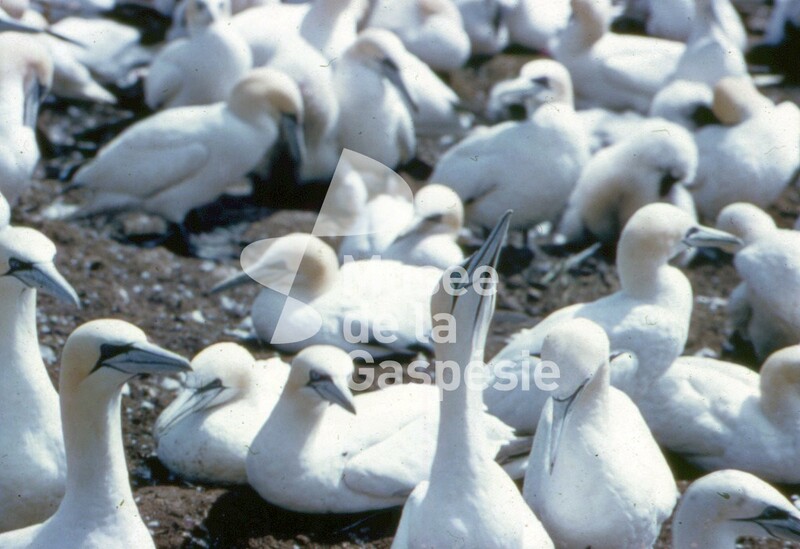 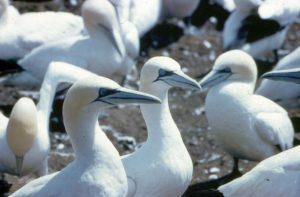 Negative showing several hundred northern gannets nesting in the Bonaventure Island cliffs. 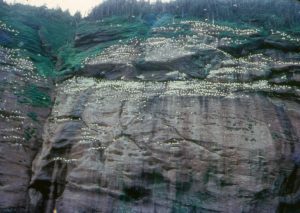 Negative showing hundreds of northern gannets atop a cliff on Bonaventure Island. 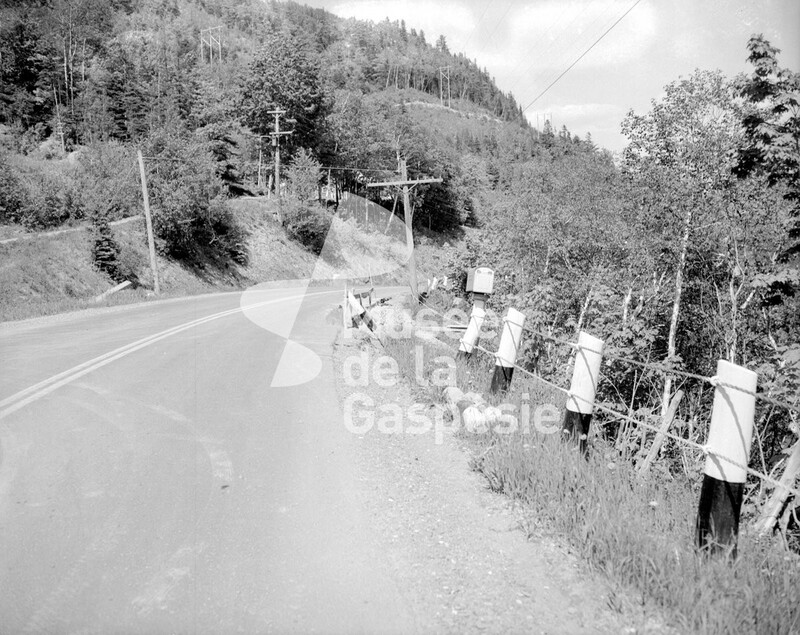 Bill Wobo, a character from the Belles Histoires des pays d’en Haut, is standing among them. 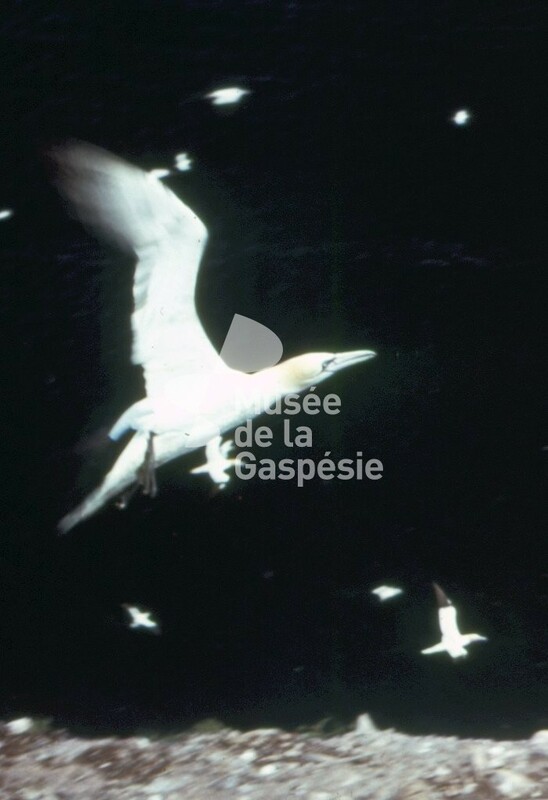 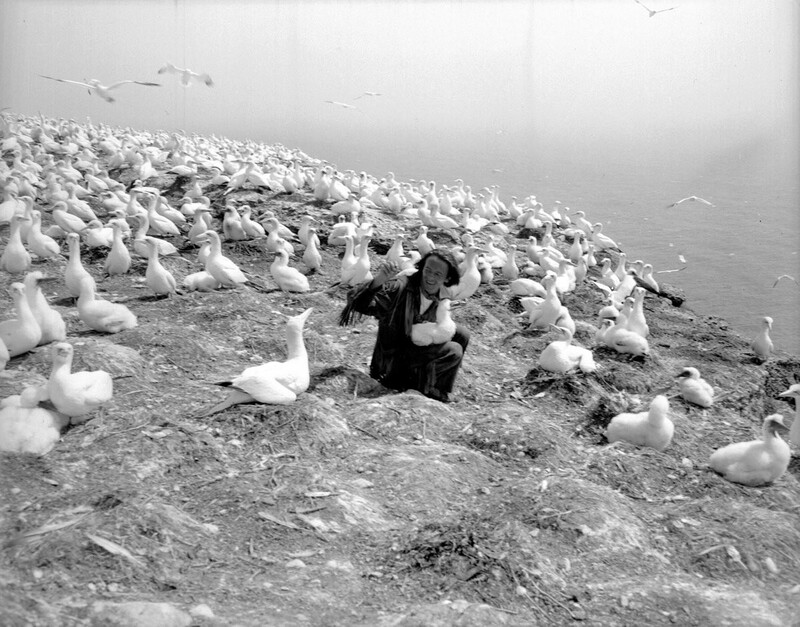 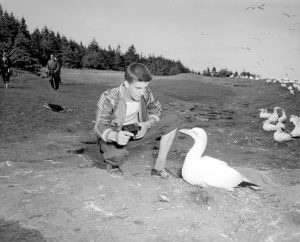 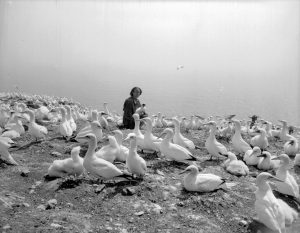 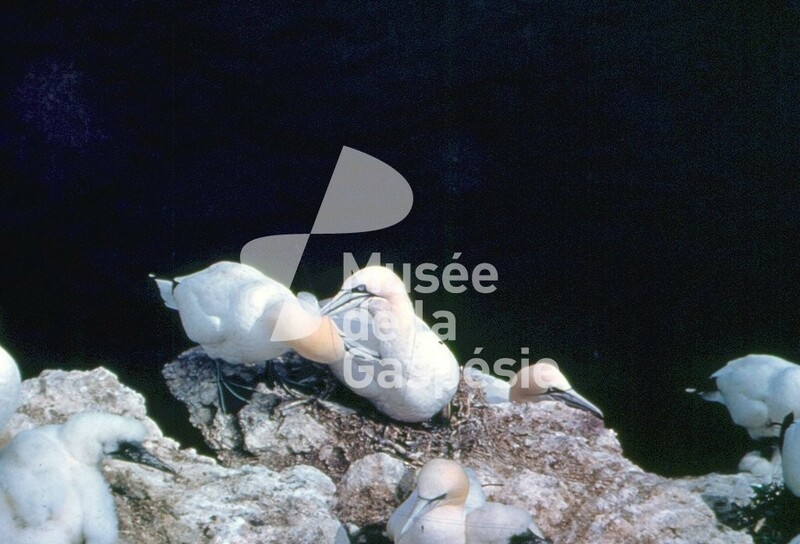 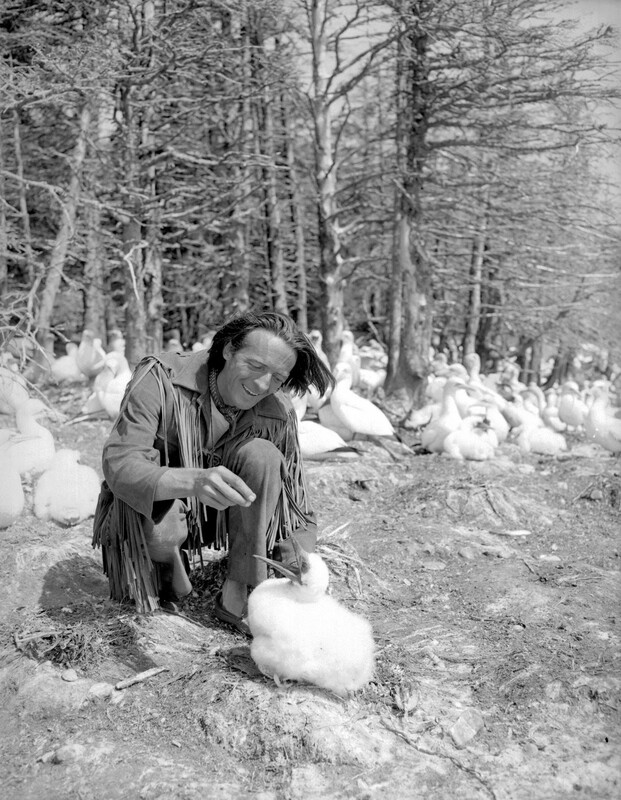 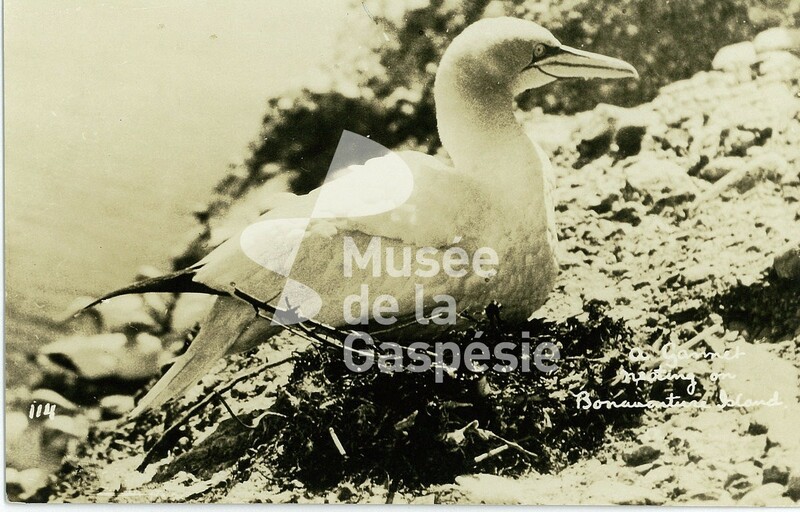 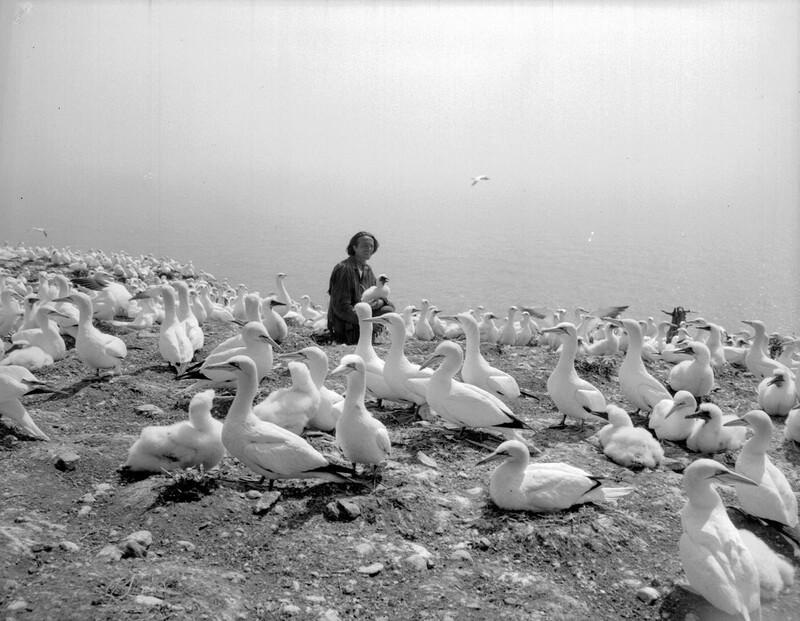 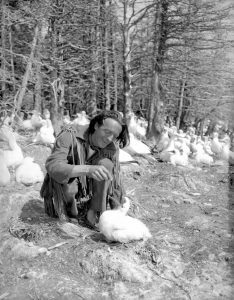 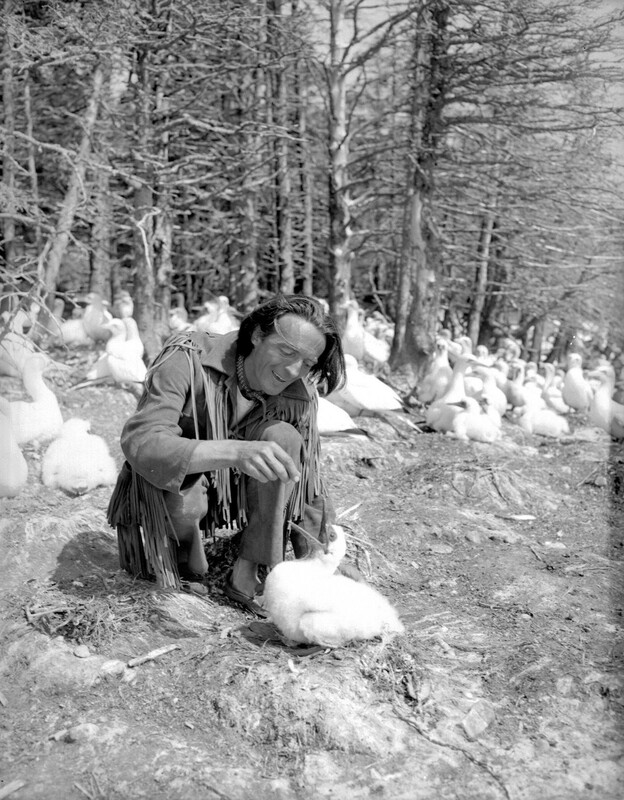 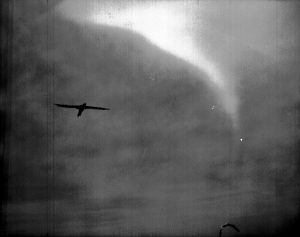 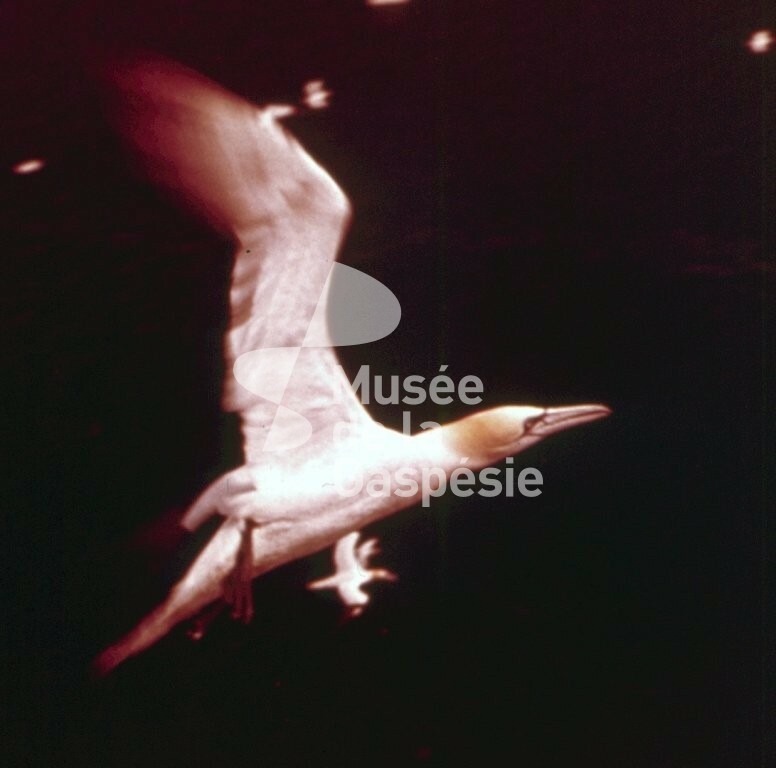 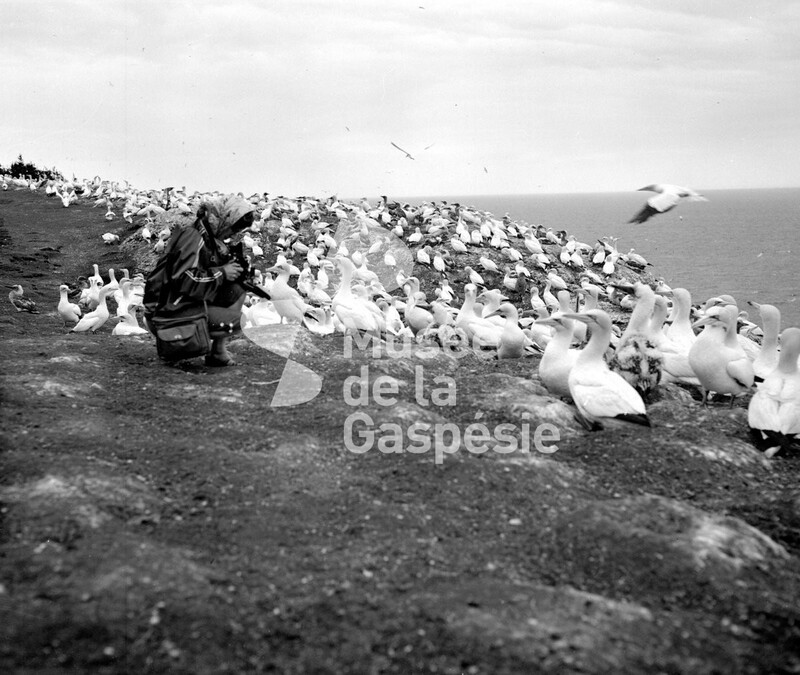 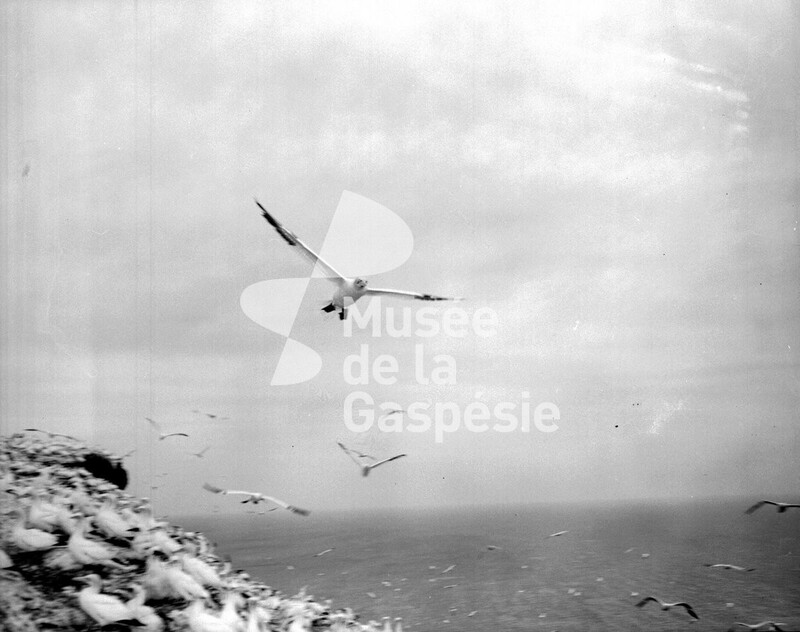 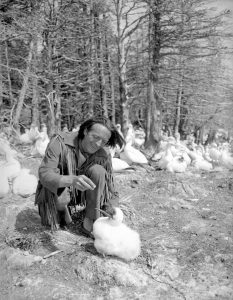 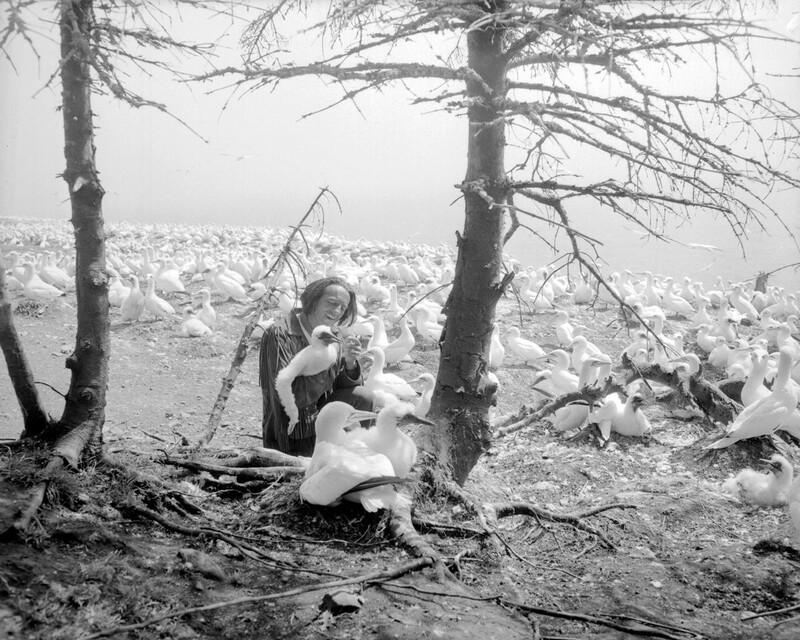 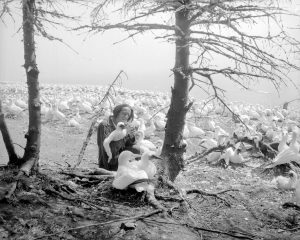 Negative showing Bill Wobo, a character from the Belles Histoires des pays d’en Haut, feeding a young northern gannet. 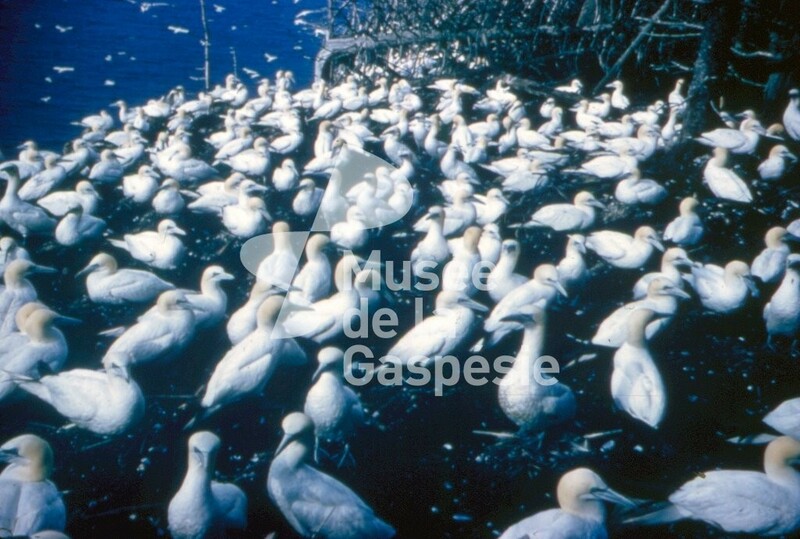 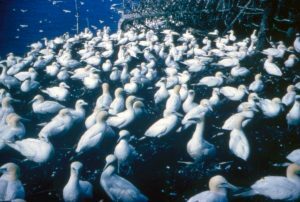 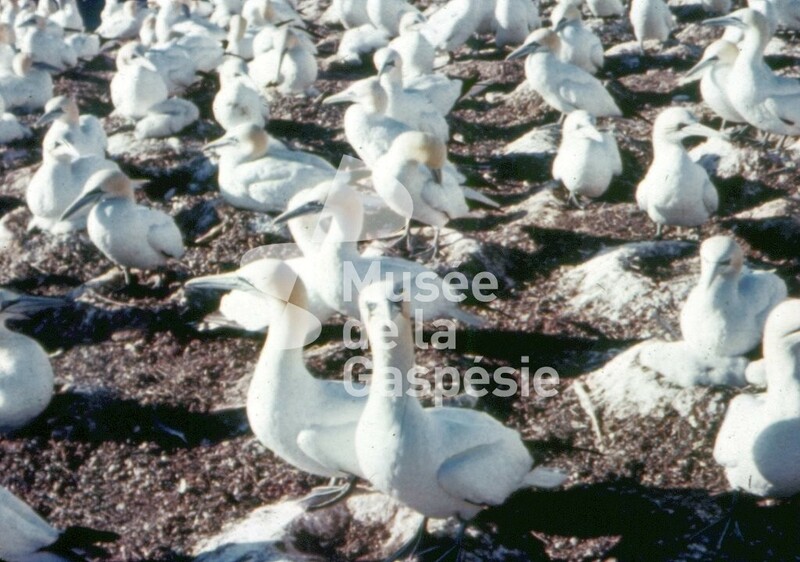 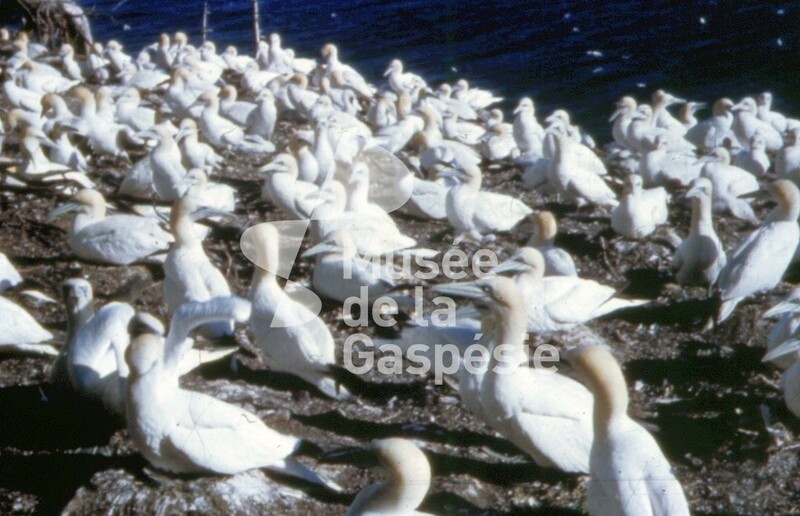 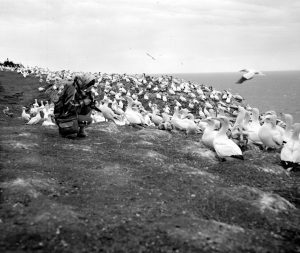 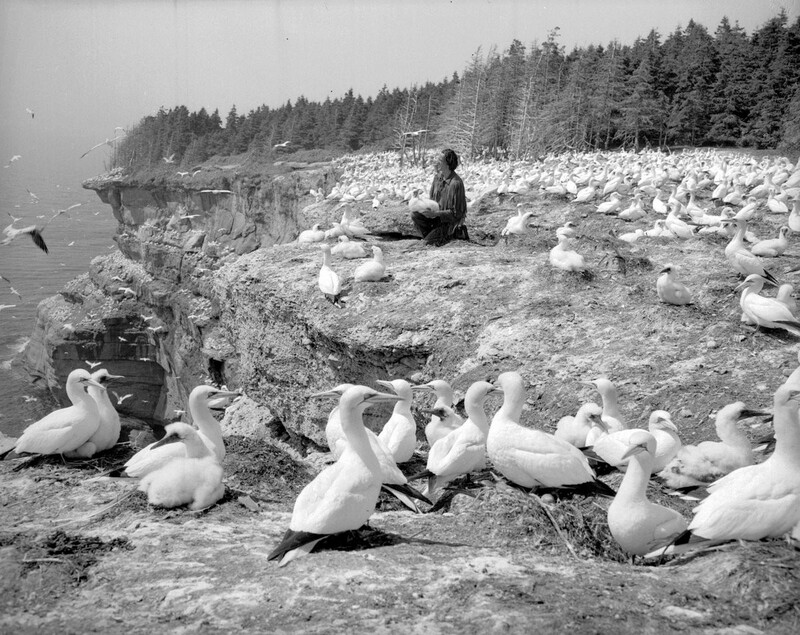 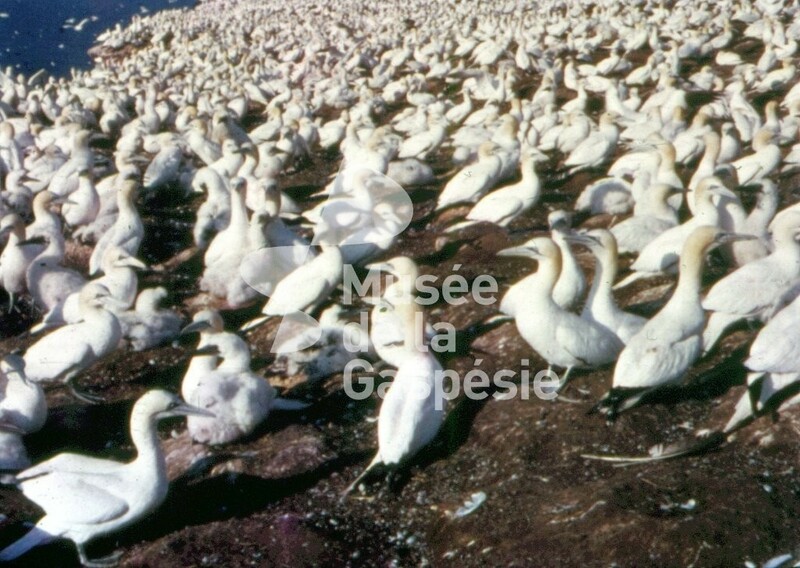 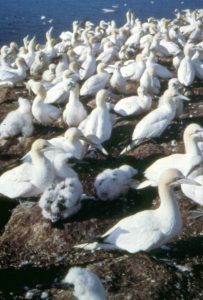 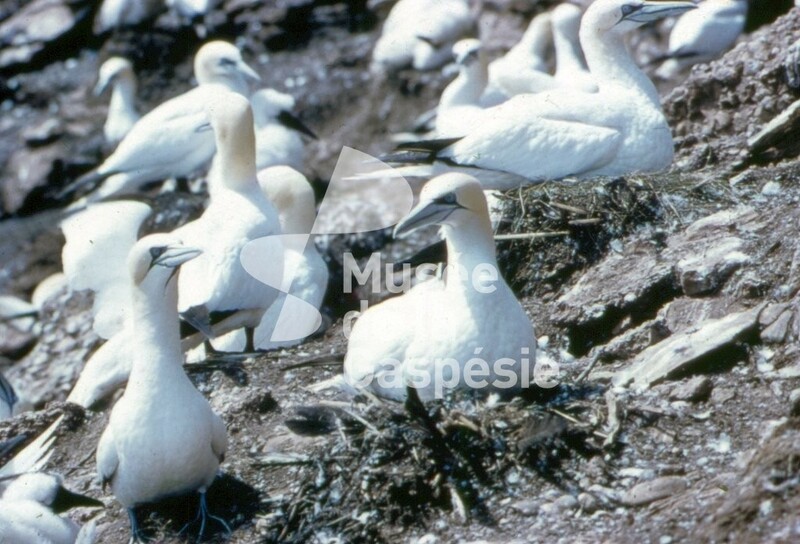 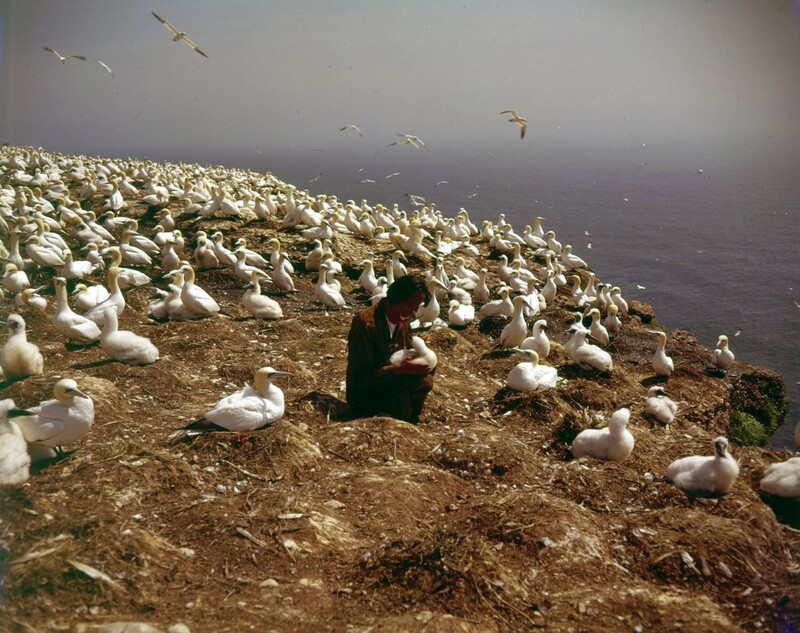 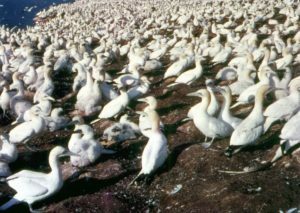 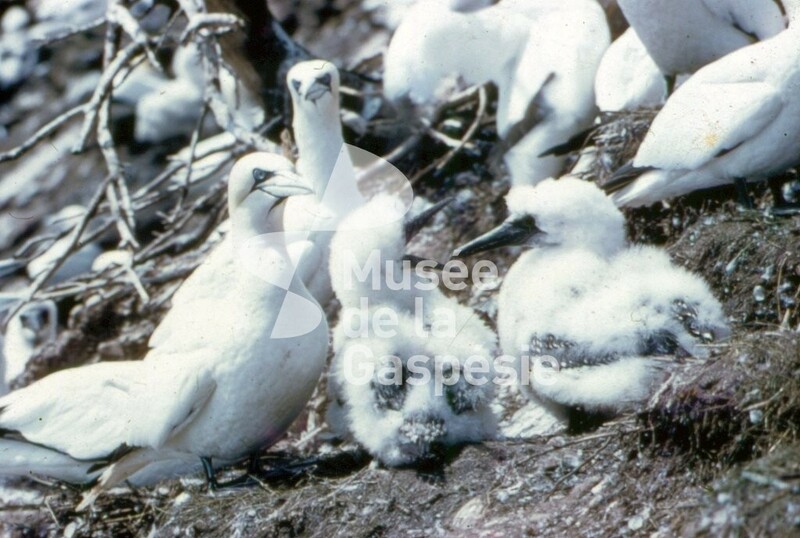 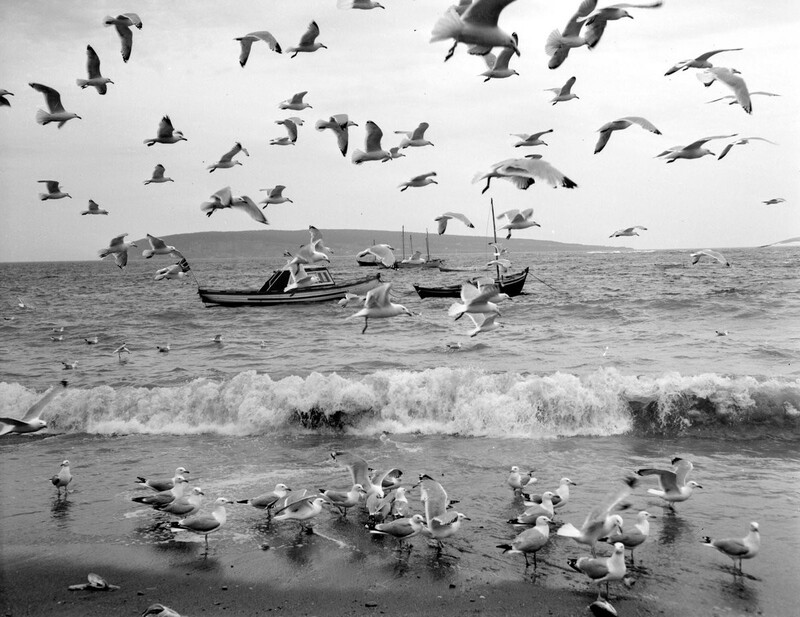 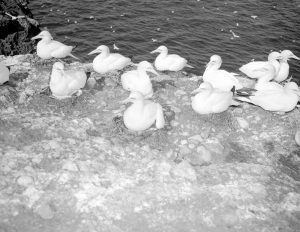 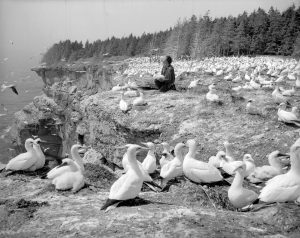 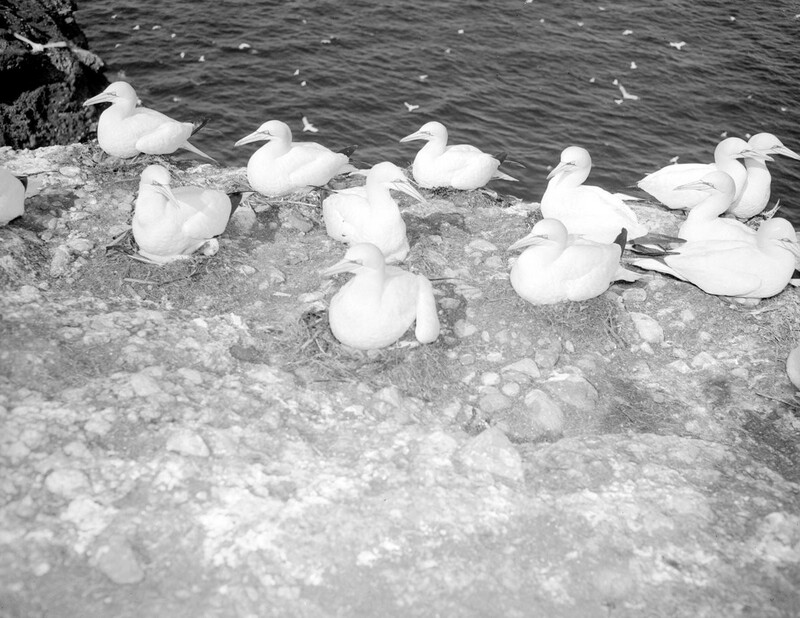 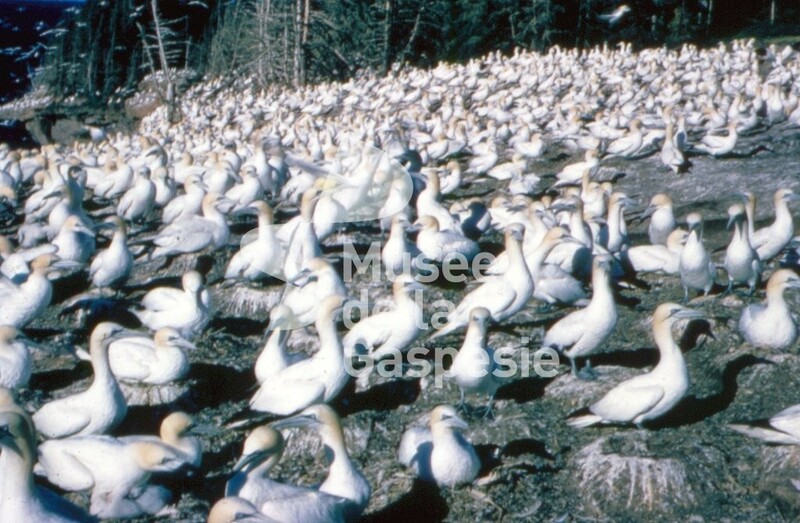 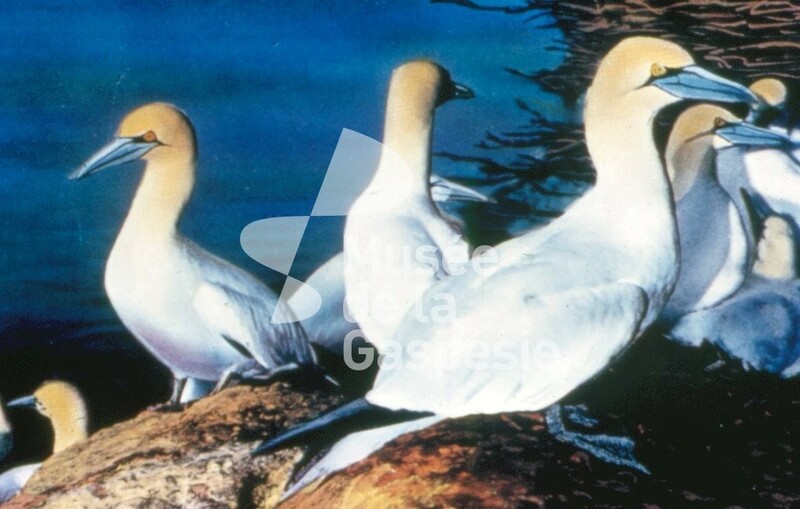 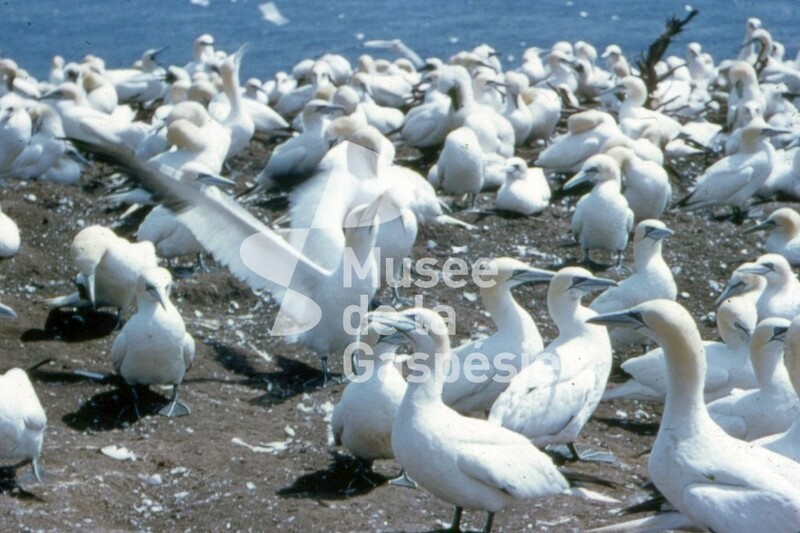 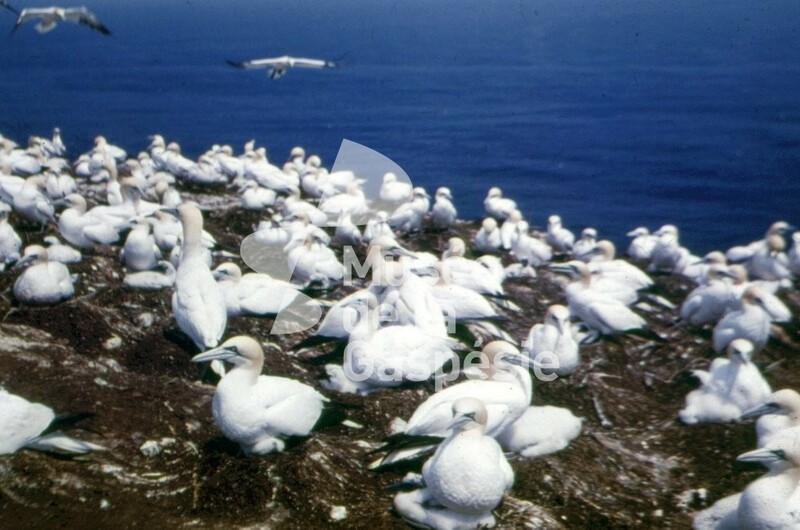 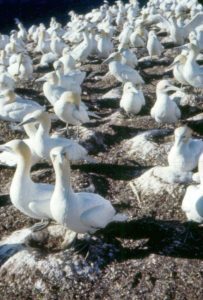 Negative showing Bill Wobo sitting among many northern gannets. 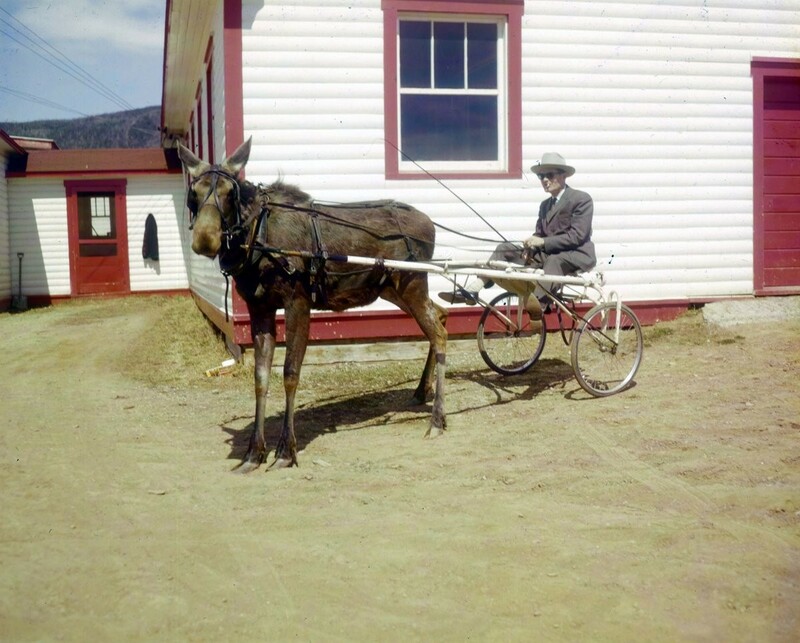 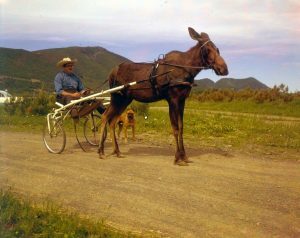 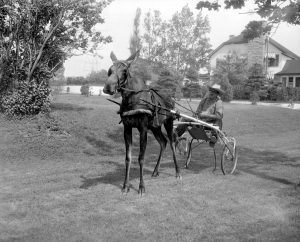 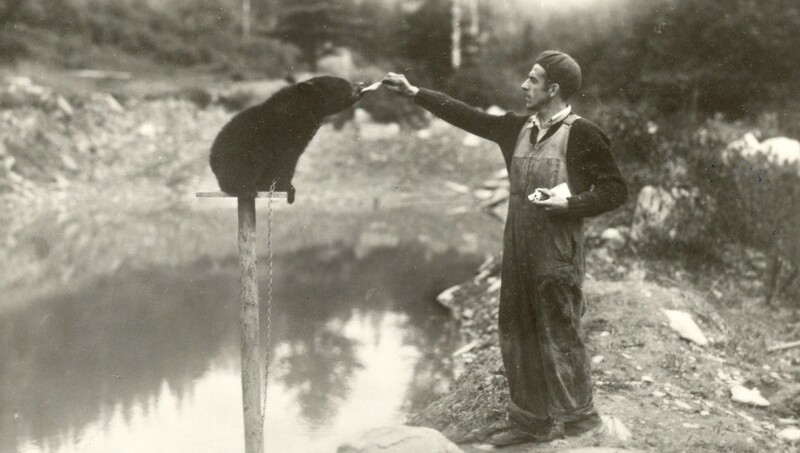 Negative showing Sophie the Moose, harnessed to a bogy, conducted by Mr. Odilon Guimond on André Lacroix’ property. 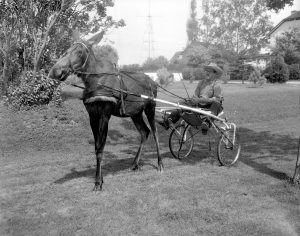 Negative showing Sophie the Moose harnessed to a bogy conducted by Odilon Guimond. 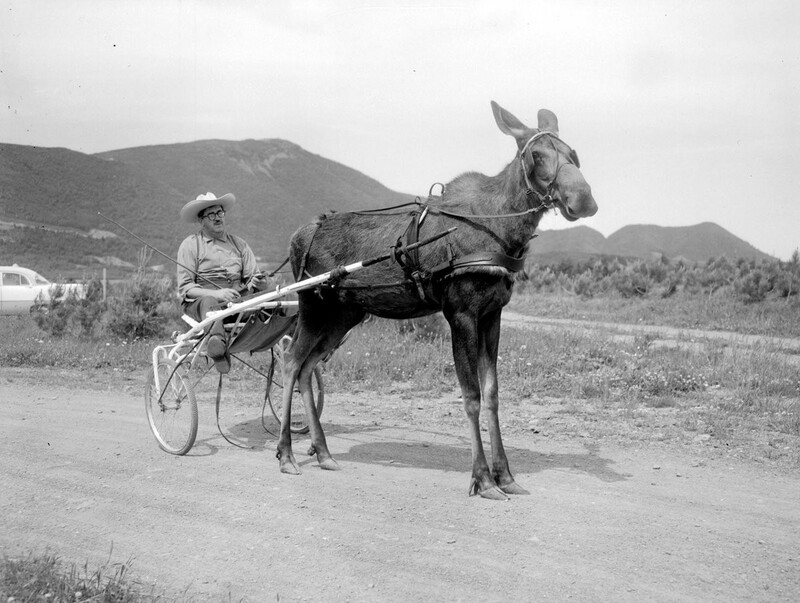 Negative showing Sophie the Moose harnessed to a bogy. 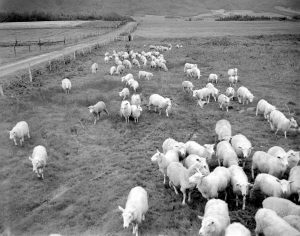 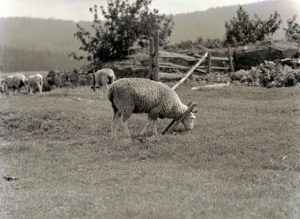 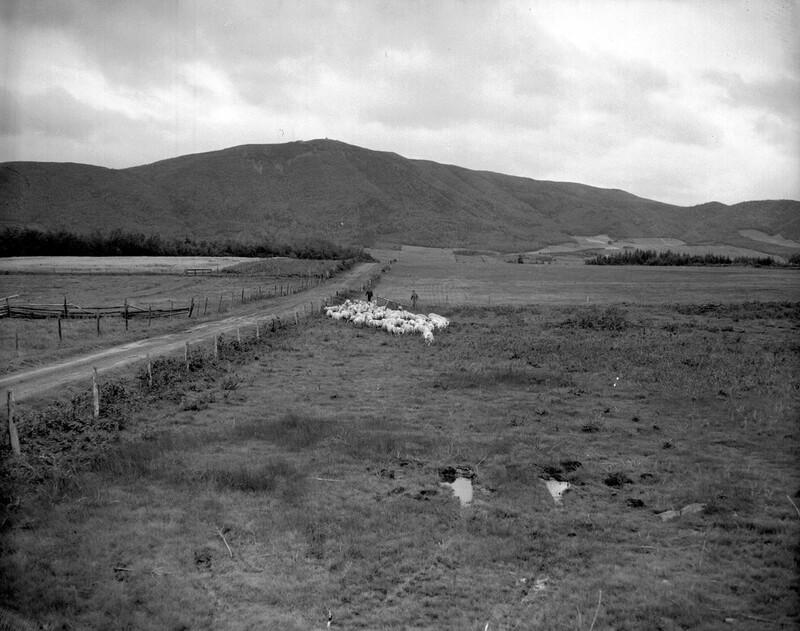 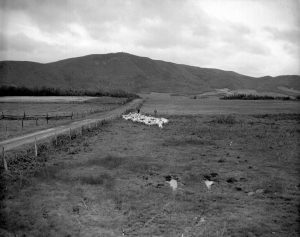 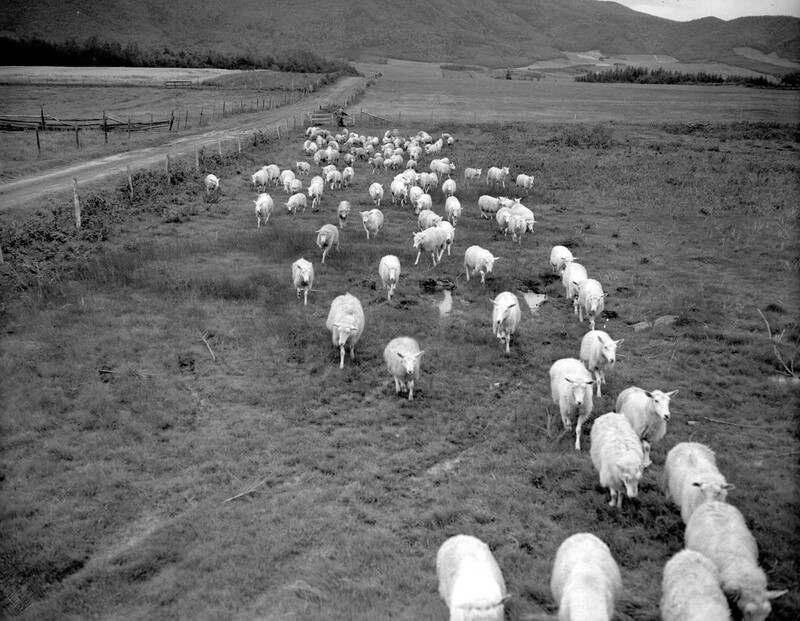 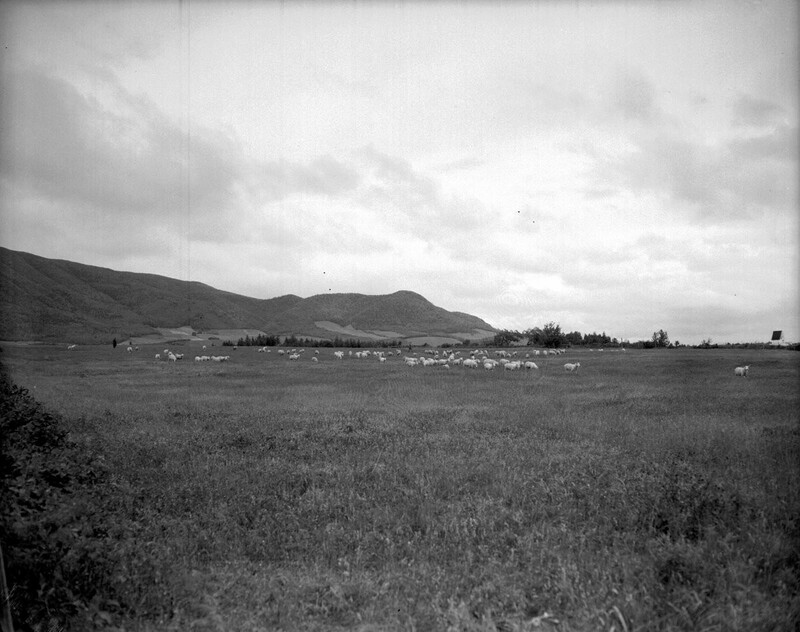 Negative showing a distant view of Guy Bernier’s flock of sheep in a field in Carleton. 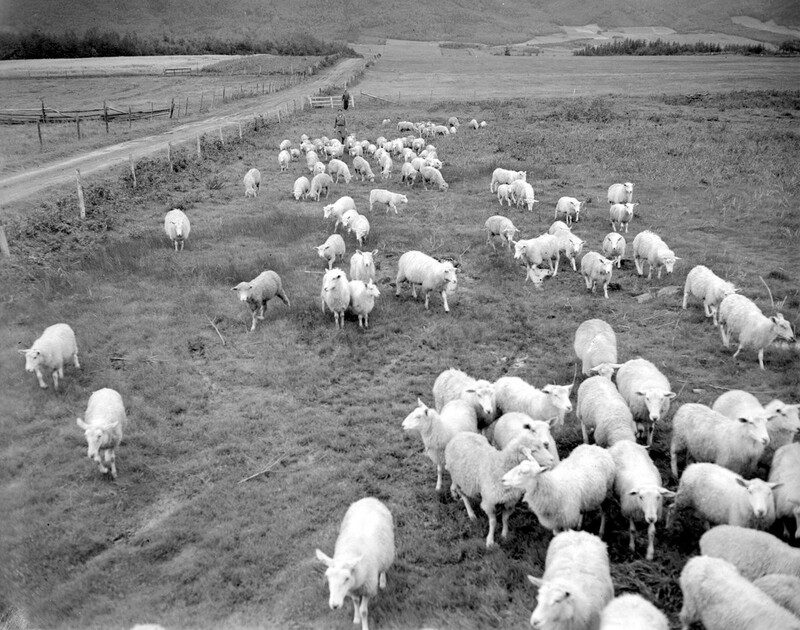 Negative showing Guy Bernier’s flock of sheep in a Carleton field. 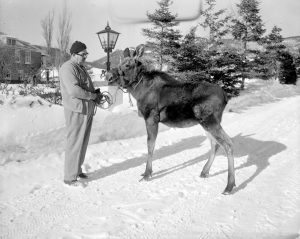 Negative showing Sophie the Moose on André Lacroix’s property in Carleton. 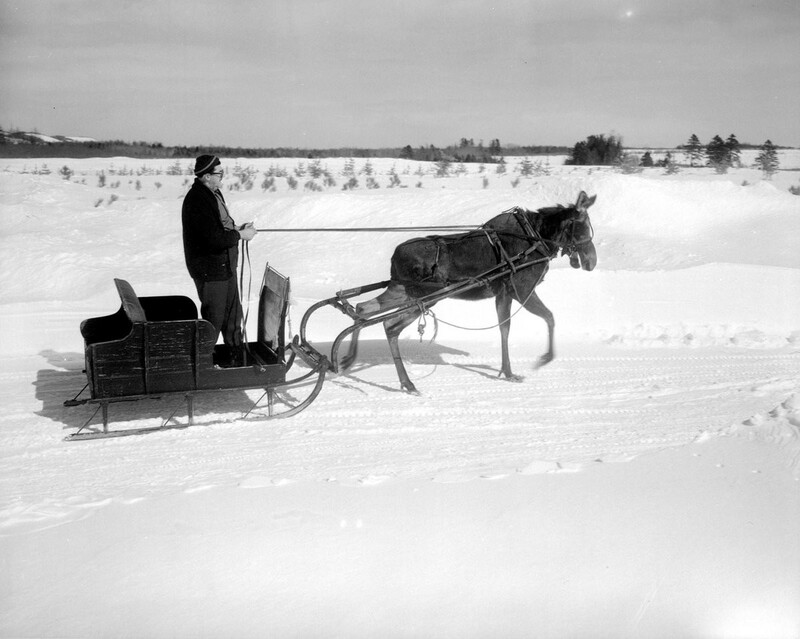 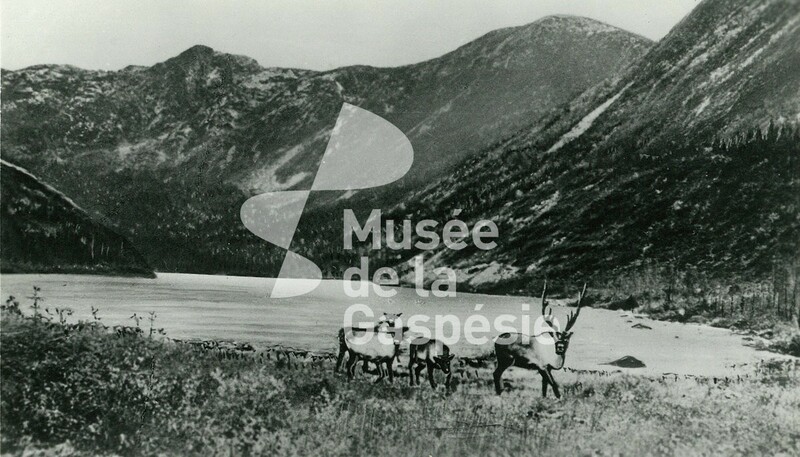 Negative showing Sophie the Moose harnessed to a sled conducted by Odilon Guimond in a standing position. 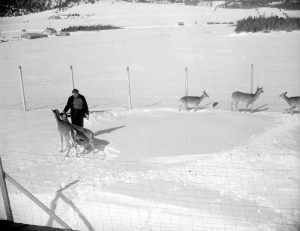 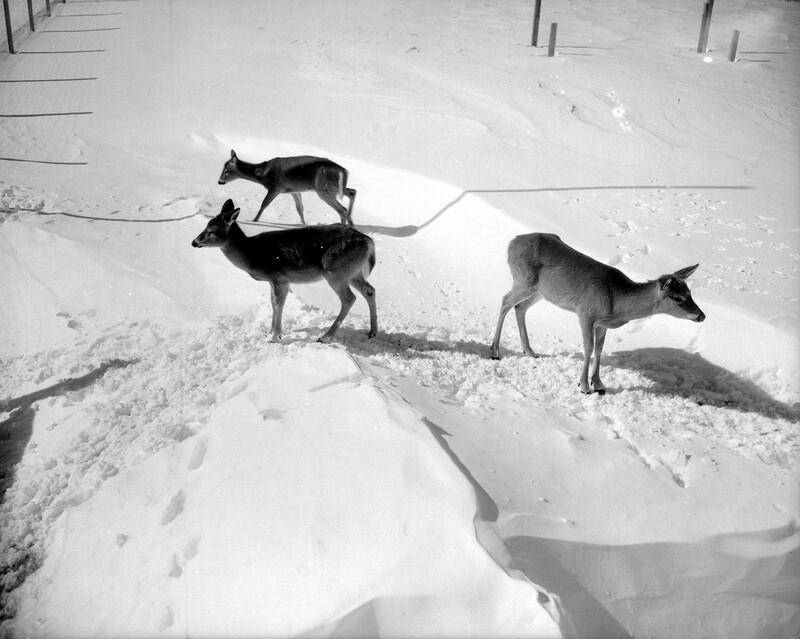 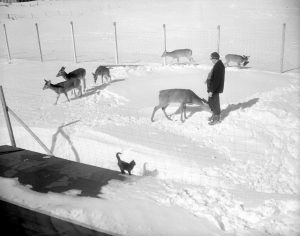 Negative showing 6 domesticated deer in a pen. 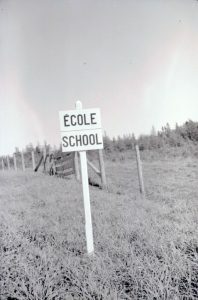 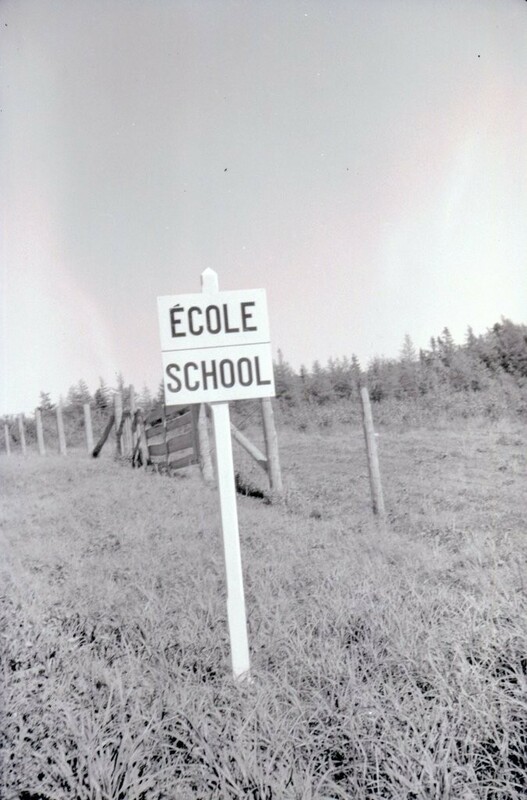 Sign planted in a field announcing a school. 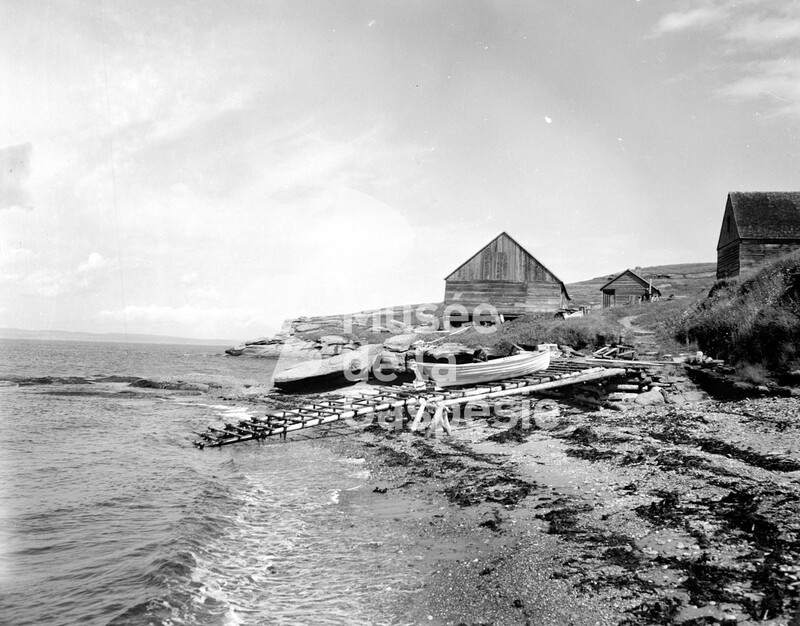 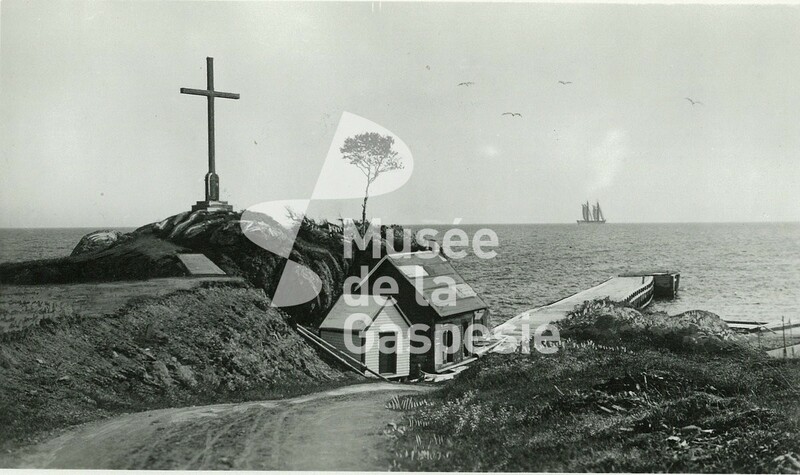 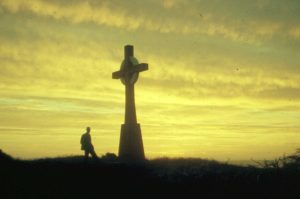 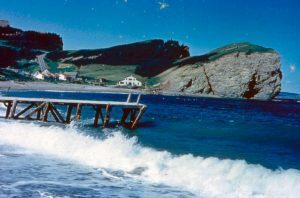 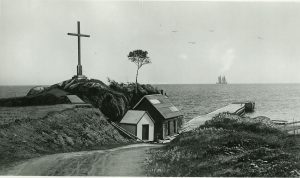 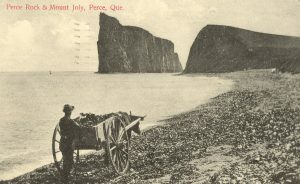 The postcard shows a wooden wharf, some fishing buildings and a cross on the north coast of the Gaspé Peninsula, named “Calvary”. 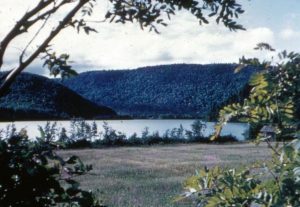 View of the lake from the old fishing station named Grand-Étang, which has also been named Saint-Hélier. 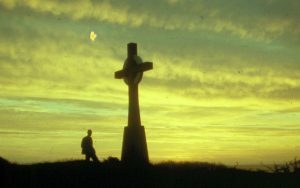 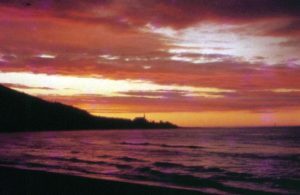 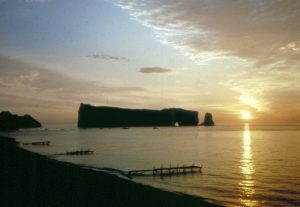 Grande-Vallée sunset. 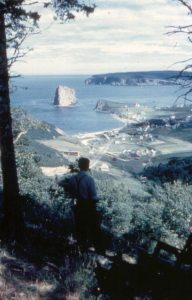 A man, perhaps H.V Henderson himself, can be seen. 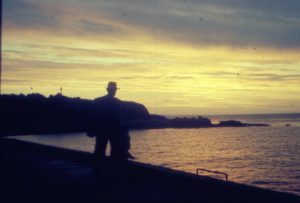 Sunset on July 9, 1959. 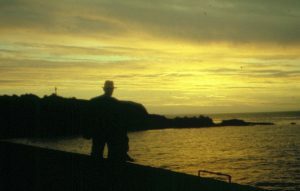 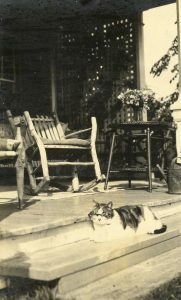 The man in the photo is H.V Henderson himself. 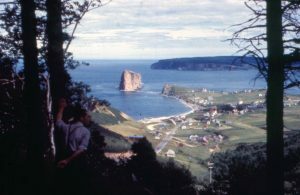 Panorama of Percé village and the Rock from a lookout to the northwest. 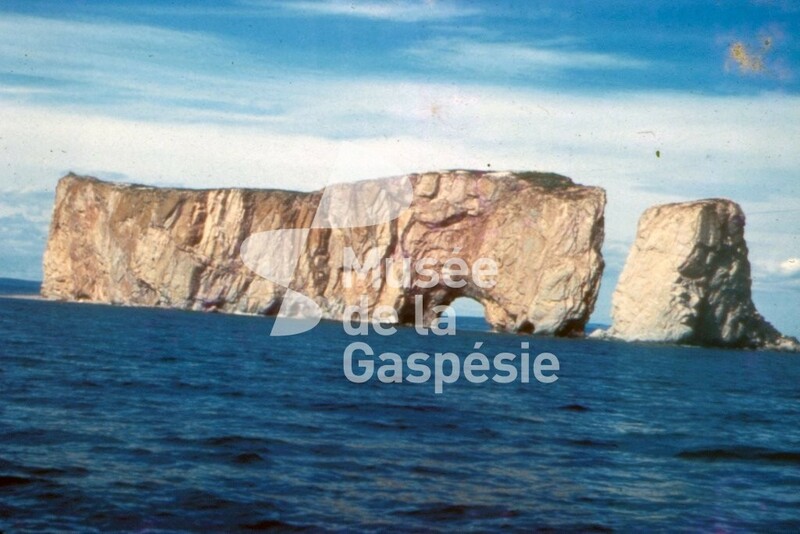 A view of Percé Rock from the natural stone crossing at l’Anse du Nord. 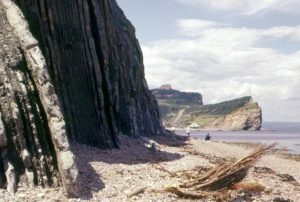 A view of Percé Rock from the natural stone crossing at l’Anse-du-Nord at low tide. A view of Rosy Peak, whose French name is Pic-de-l’Aurore. 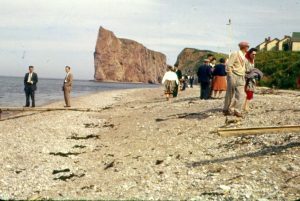 Many tourists walking on l’Anse-du-Nord beach. 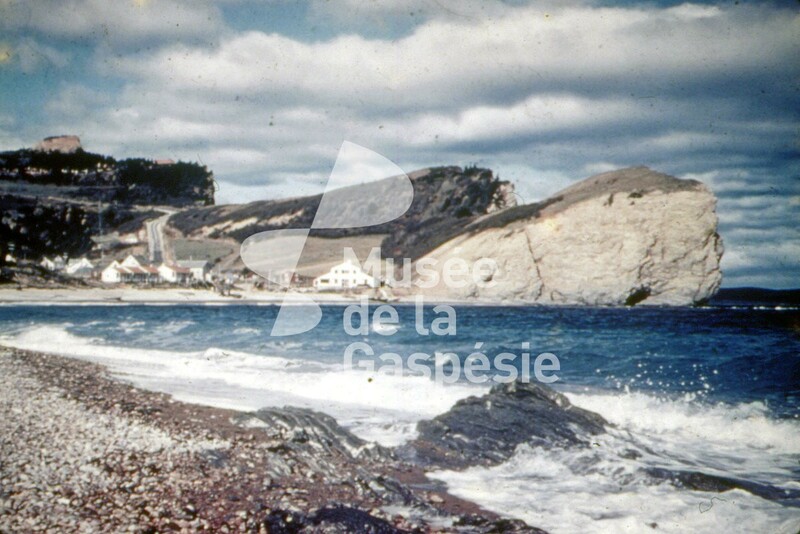 Panorama of part of the village of Percé, l’Anse-du-Sud, Percé Rock, Cap Canon and Mont Joli. 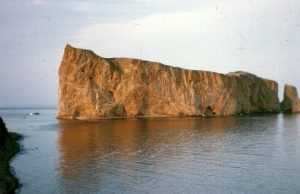 A view of Percé Rock from the sea, to the west. 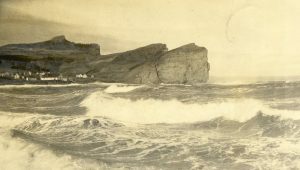 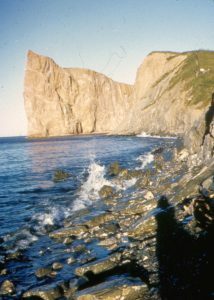 Photograph of Cap Barré, the Trois Sœurs, Rosy Peak and waves at l’Anse-du-Nord beach. 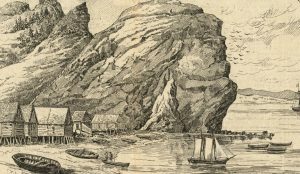 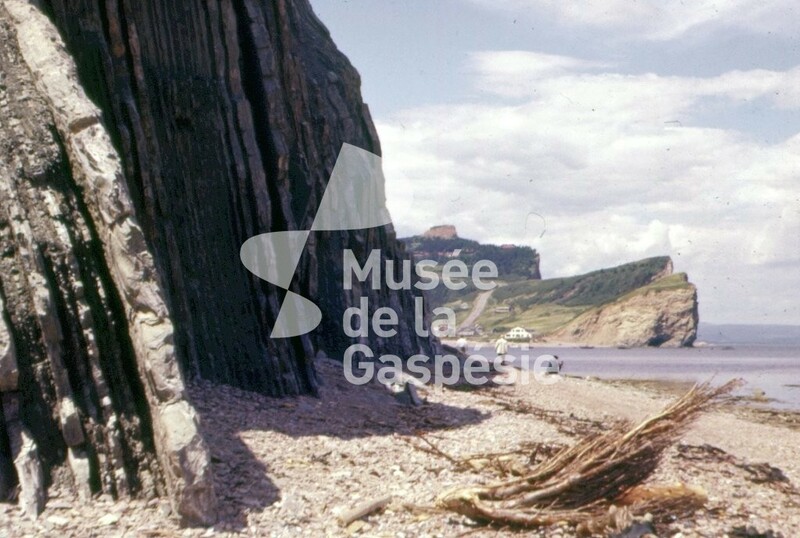 Panorama of the Anse du Sud, part of Percé village, Percé Rock, Cap Canon and Mont Joli. 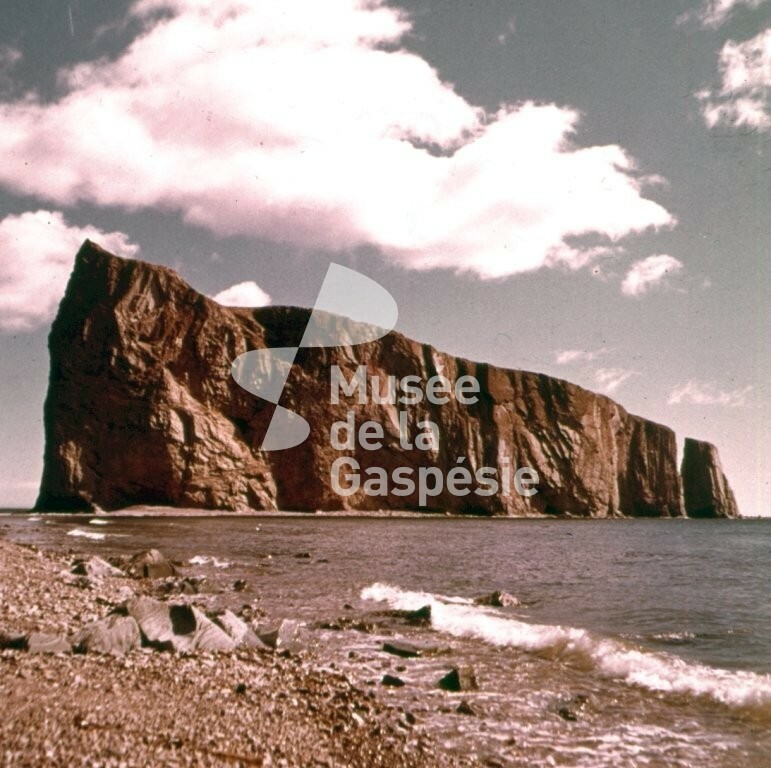 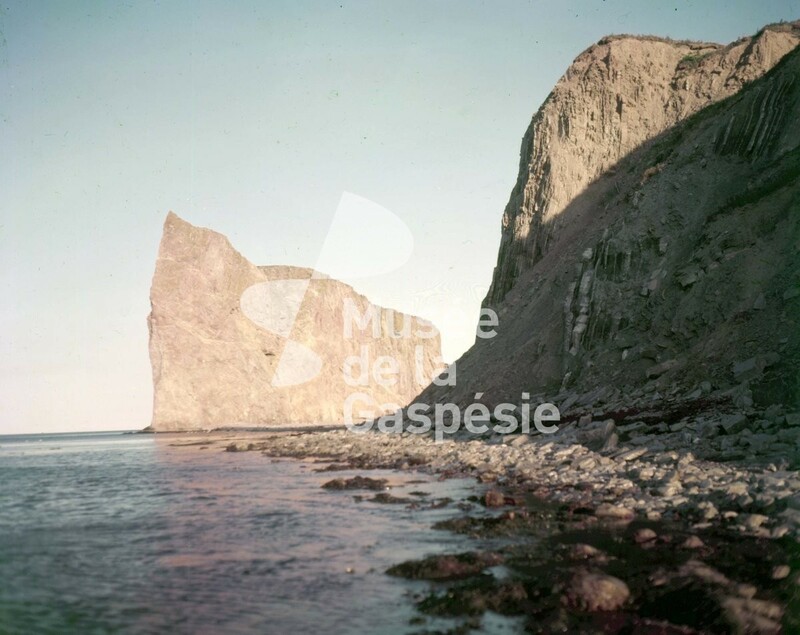 Photograph of Percé Rock, Cap Canon and Mont-Joli, taken from the Anse-du-Sud beach. A partial view of Percé Rock at low tide. 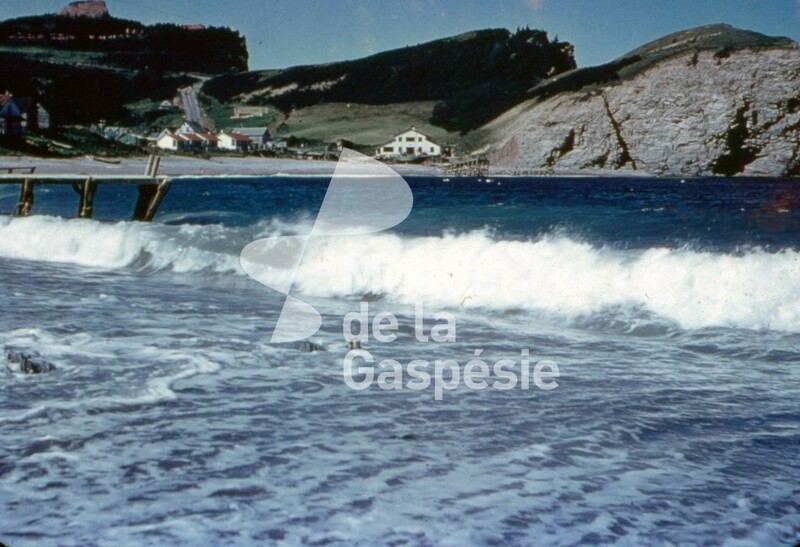 Photograph of Cap Barré, the Trois Sœurs, Rosy Peak and waves from l’Anse-du-Nord beach. 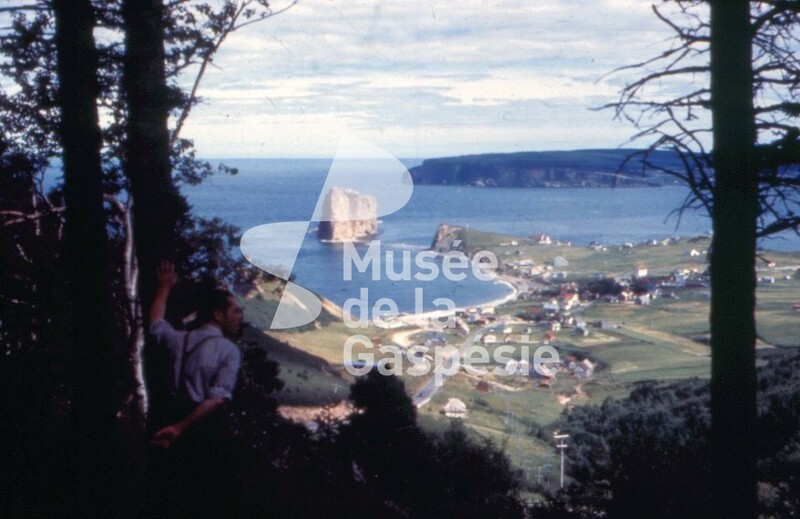 Panorama of Percé village, Percé Rock, Cap Canon and Mont Joli from the observatory. 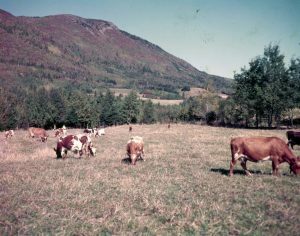 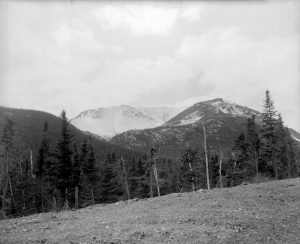 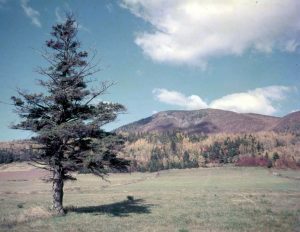 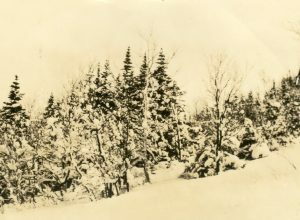 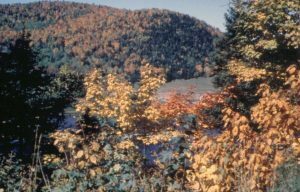 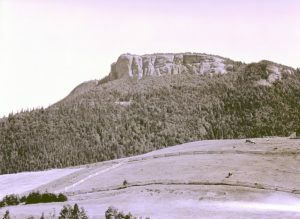 Photograph taken from the foot of Mont-Sainte-Anne. 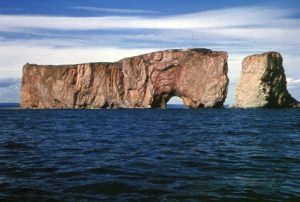 Percé Rock arch, also called the “Hole” or the “Arch”, from the east. View of l’Anse-du-Nord, Cap Barré and the Trois Sœurs from the beach. 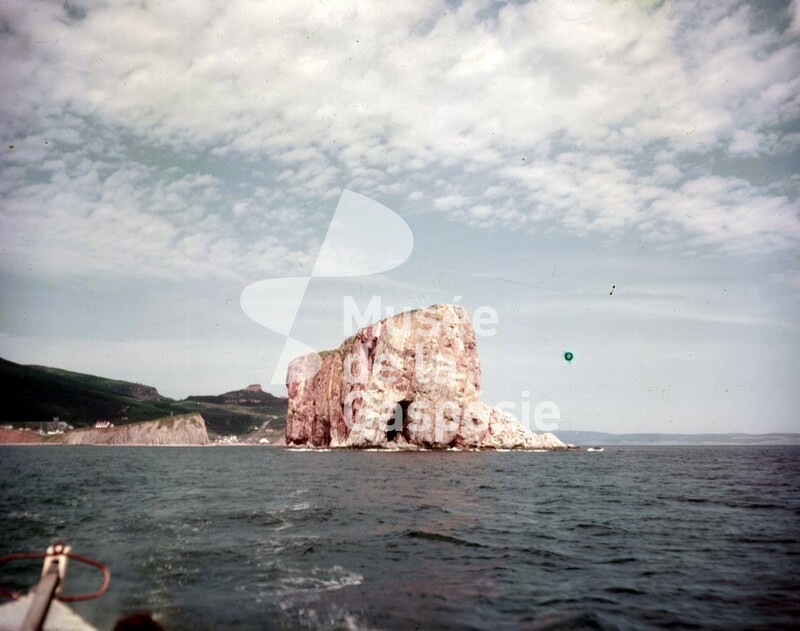 A view of Percé Rock from the sea. Panorama of Percé Rock, Bonaventure Island, Mont Joli and Anse du Nord. 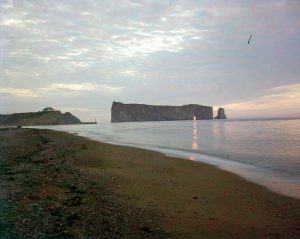 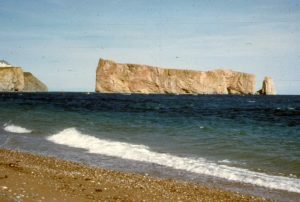 A view of Percé Rock from l’Anse-du-Nord beach. 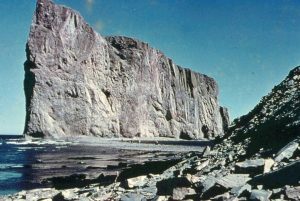 View of a crevasse near Rosy Peak. 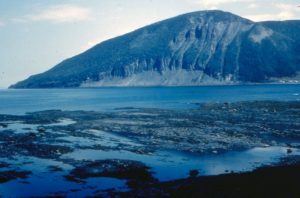 A view of Rosy Peak from the east. 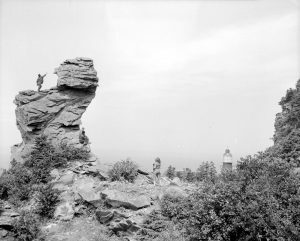 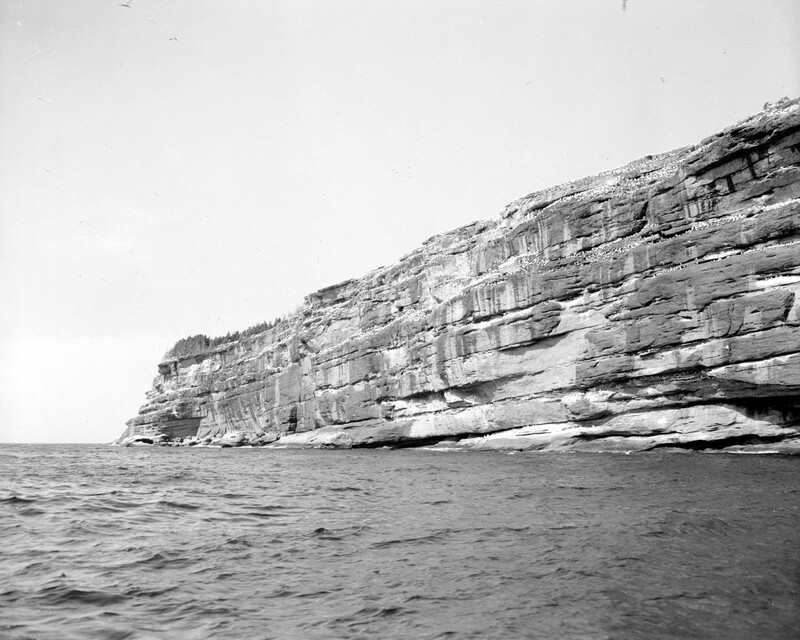 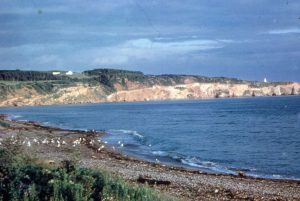 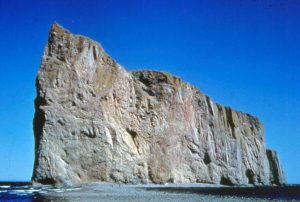 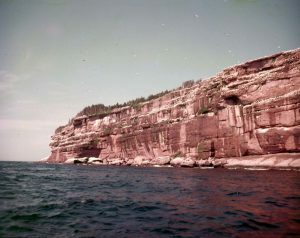 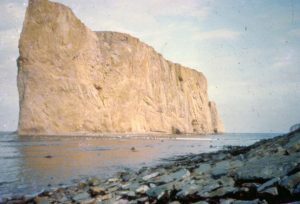 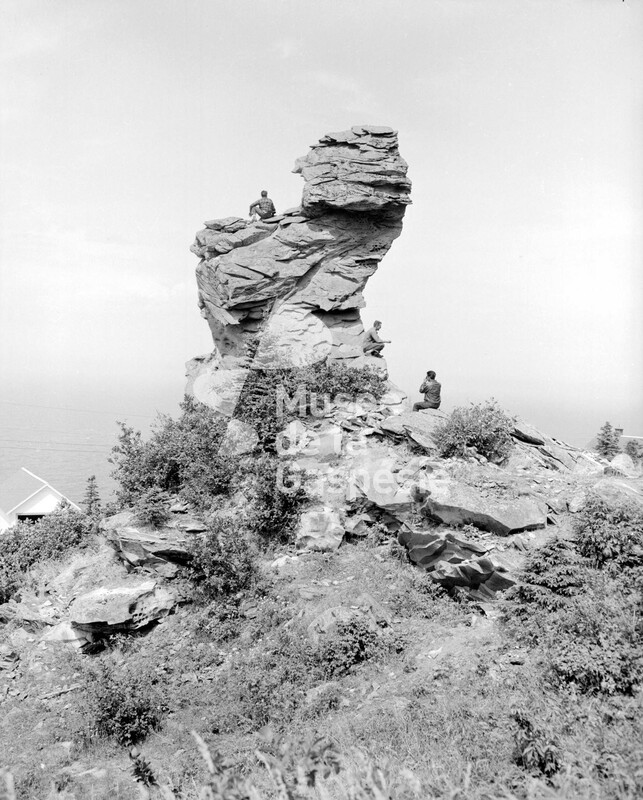 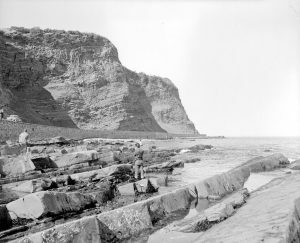 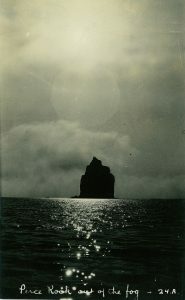 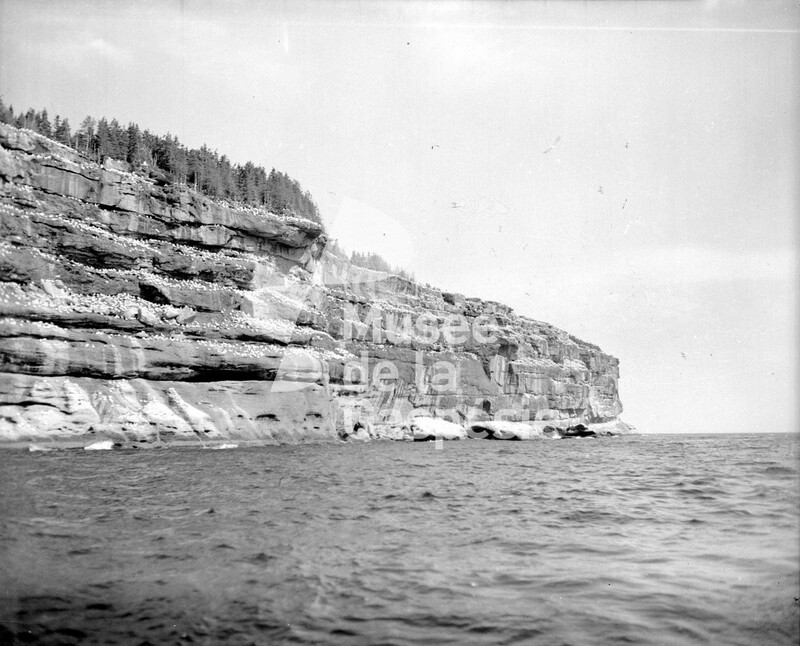 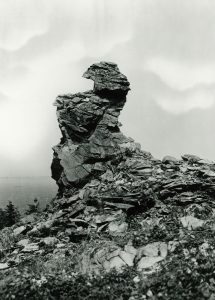 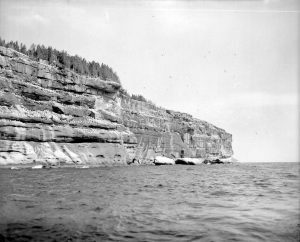 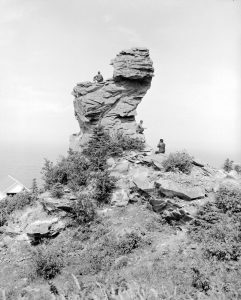 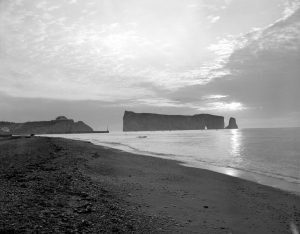 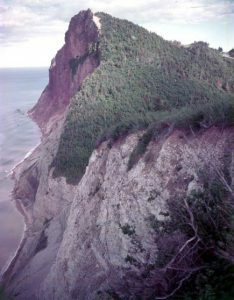 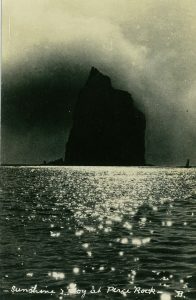 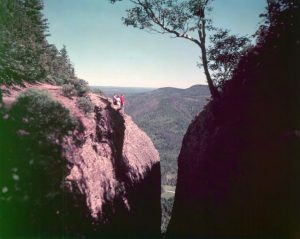 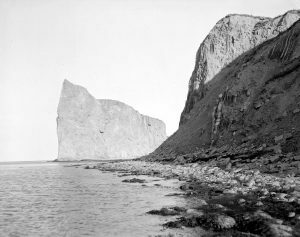 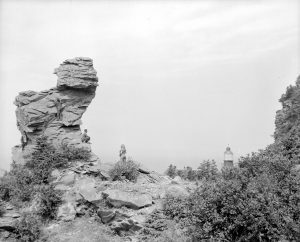 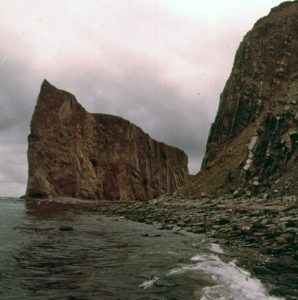 Photograph of the cliffs called Trois Sœurs (Three Sisters), taken from the east. 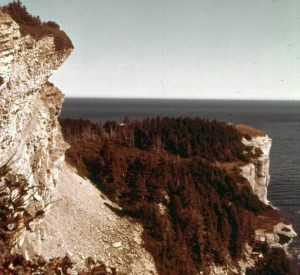 Panorama of cap Barré, the Trois Sœurs, Rosy Peak and l’Anse-du-Nord, from the northeast. 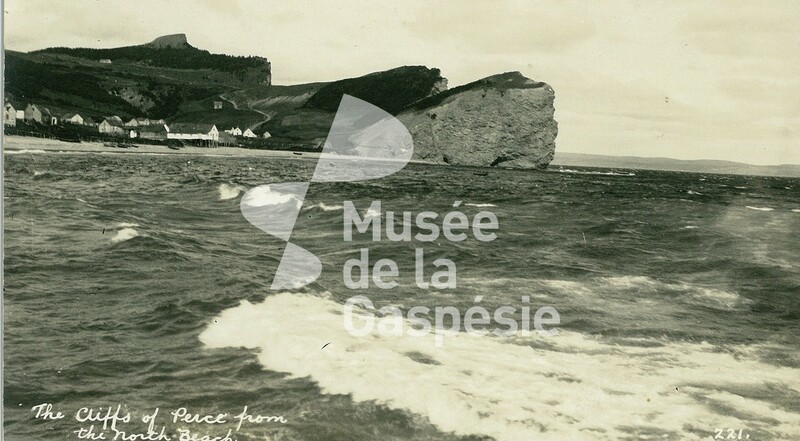 View of Percé Rock and Mont Joli, from l’Anse-du-Nord. 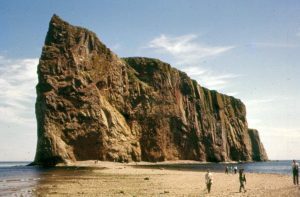 View of Percé Rock from the west, on the Anse-du-Sud beach, near the village. 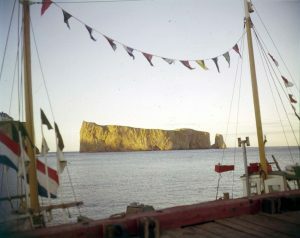 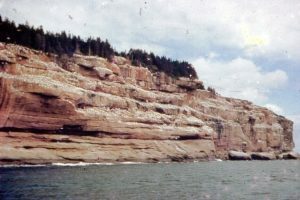 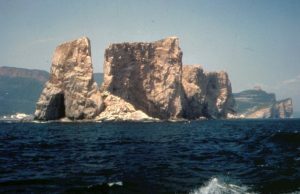 A view of Percé Rock from the sea, to the southwest. 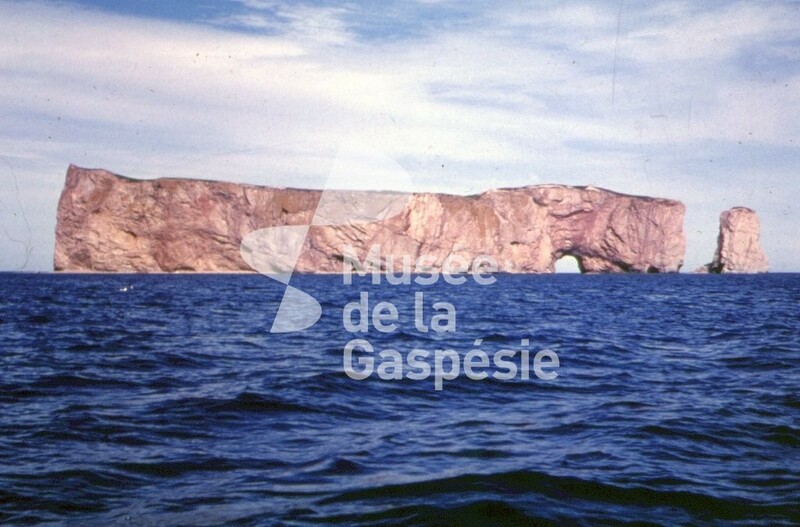 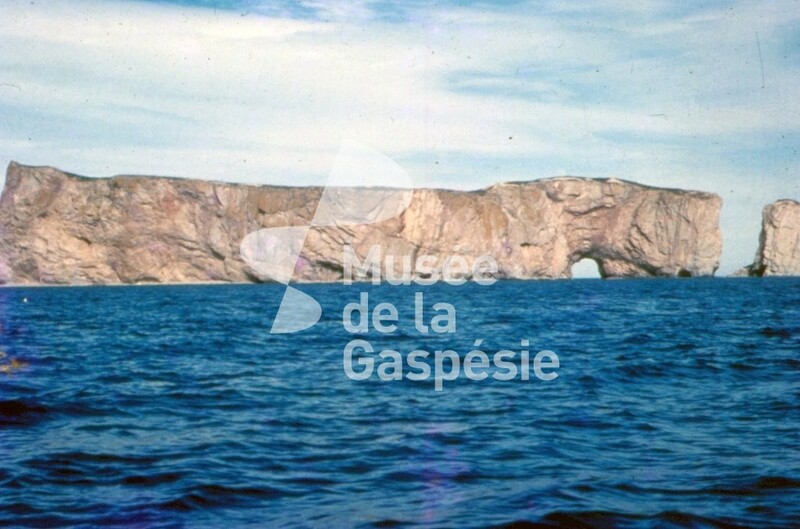 View of the Percé Rock arch, also called the “hole,” taken from the west. 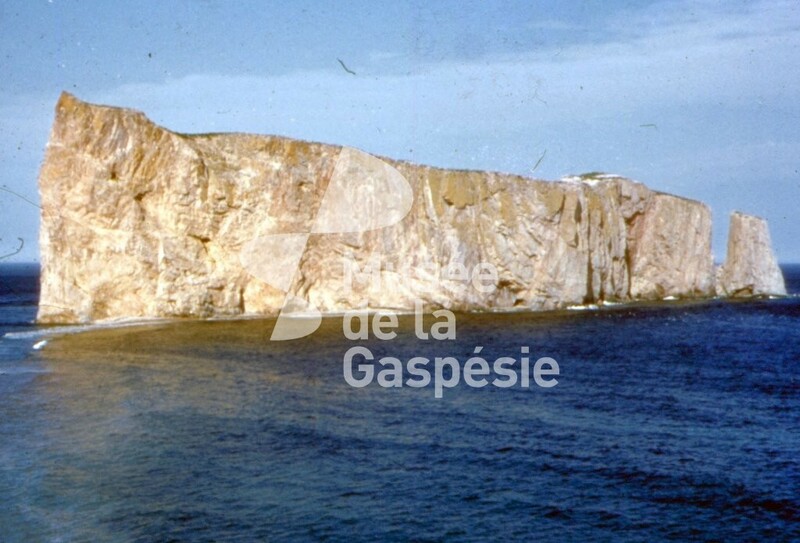 Cape Blanc, with its lighthouse, located south of Percé. 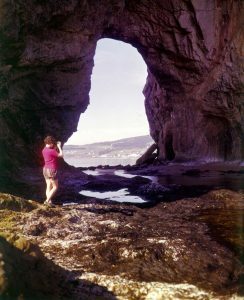 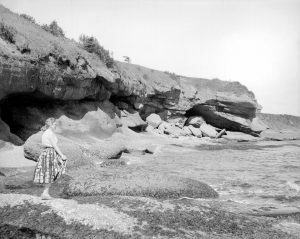 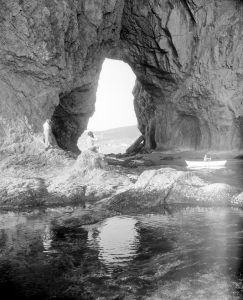 Photograph of a woman perched on a large stone, under the Percé Rock arch and gazing at the sea. Panorama of l’Anse-du-Nord, with a view of Percé Rock, Bonaventure Island and Mont Joli, taken from Cap Barré. A view of Percé Rock from Mont Joli. 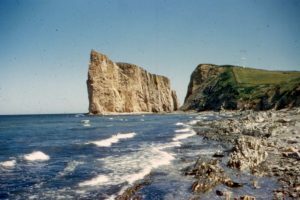 Percé Rock at low tide. 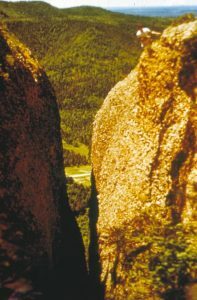 The band of stones leading to the foot of the Rock can be seen. 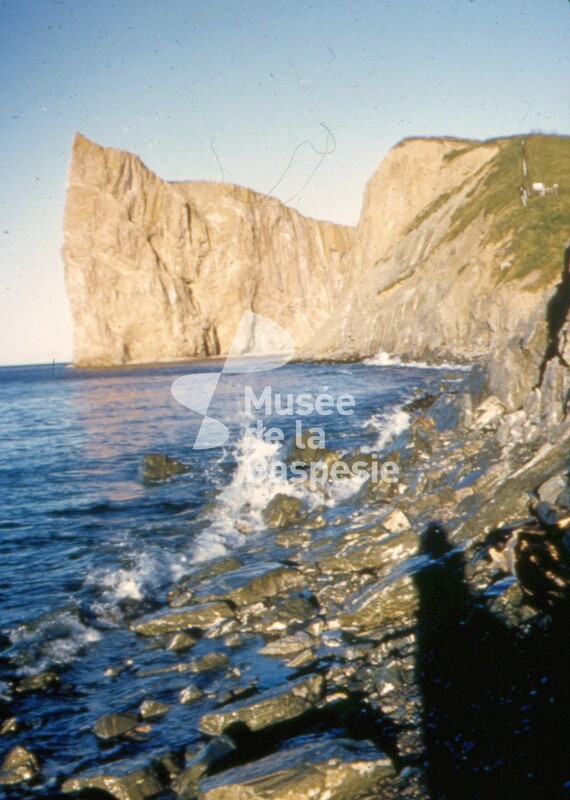 Partial view of Percé Rock and Mont Joli, from l’Anse-du-Nord. Percé Rock seen from L’Anse-du-Nord. 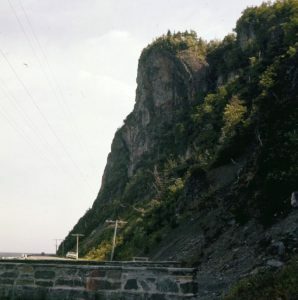 Also, a rock fall. 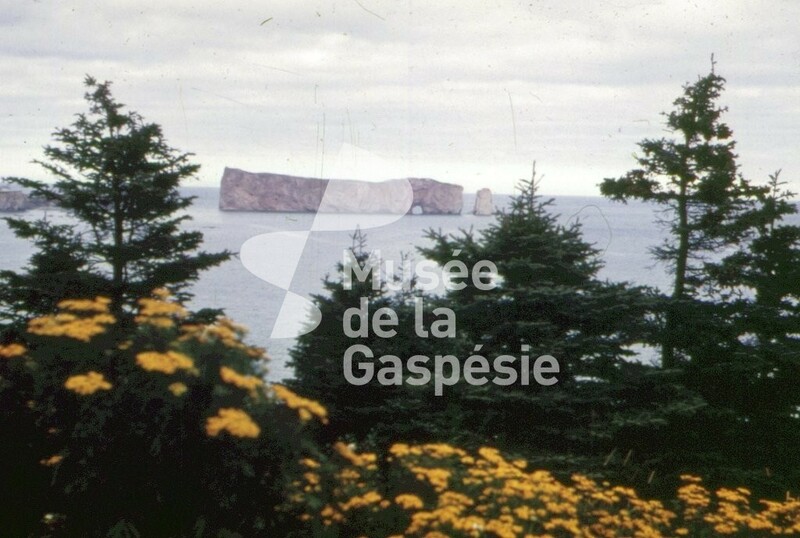 Percé Rock seen from L’Anse-du-Nord. 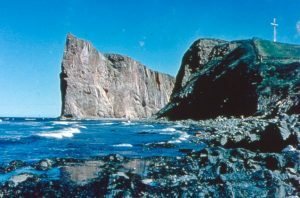 Percé Rock at low tide. 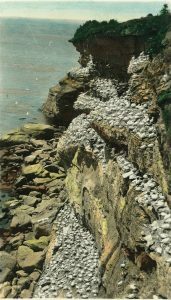 The band of stones making it possible to walk to the foot of the Rock. 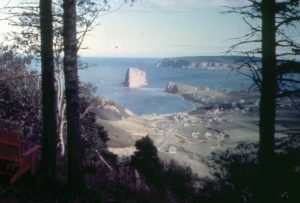 View of Rosy Peak, with Percé Rock and Bonaventure Island in the background. 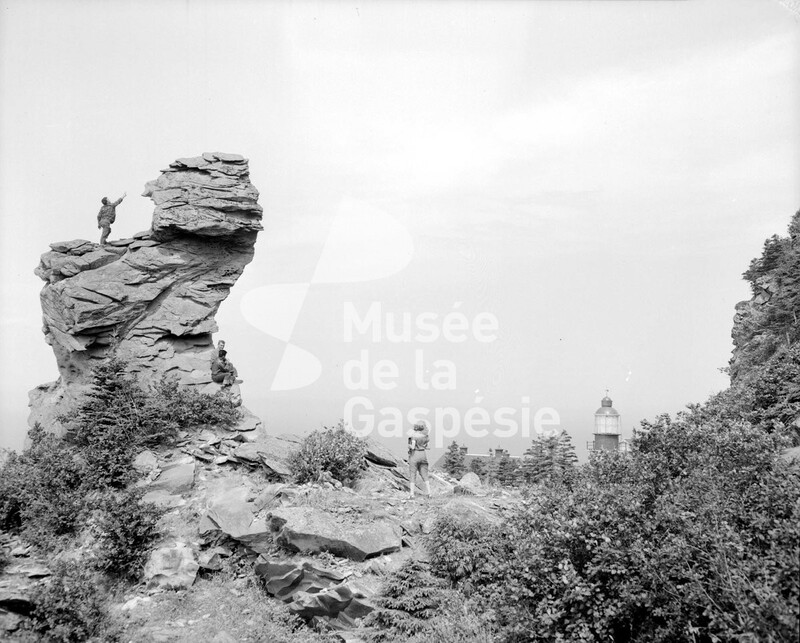 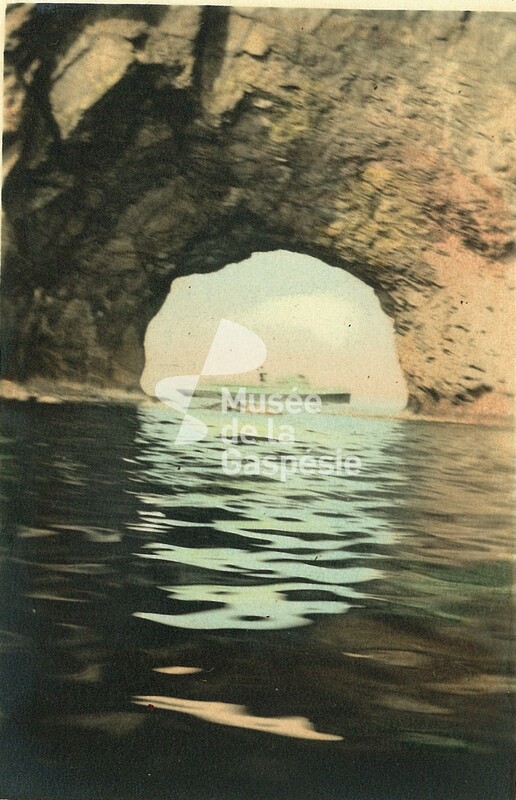 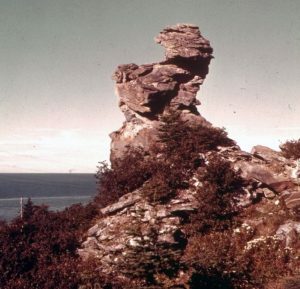 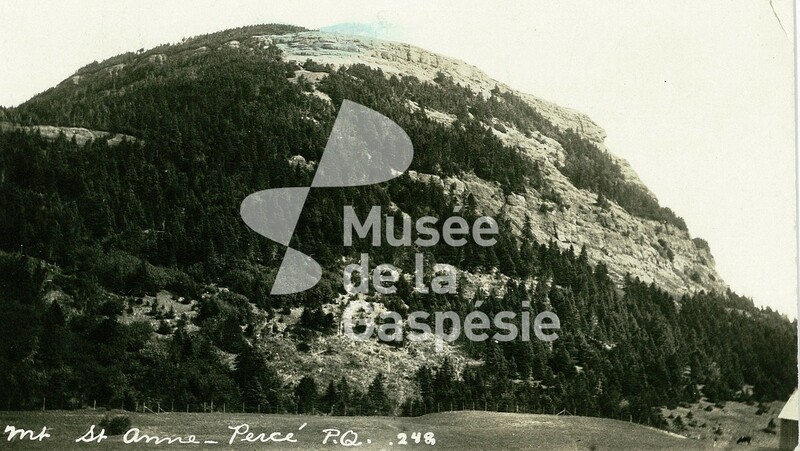 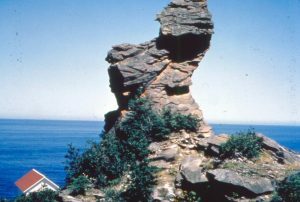 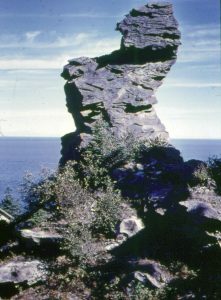 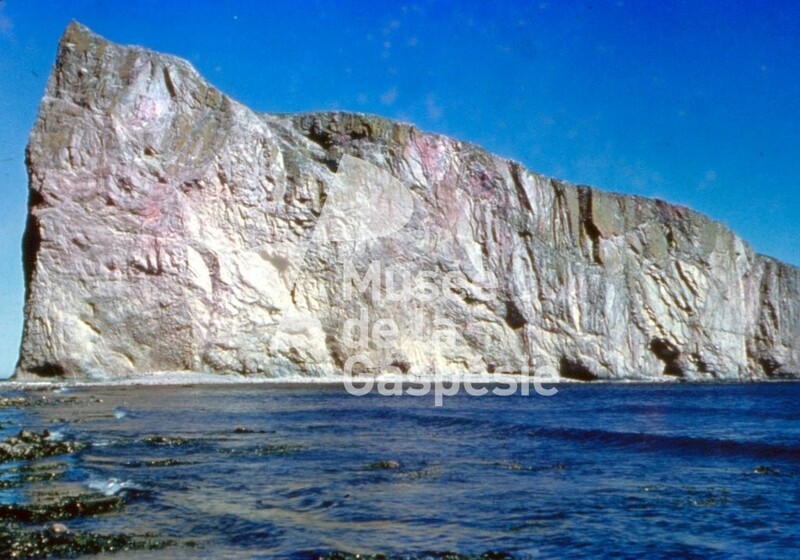 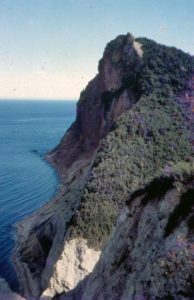 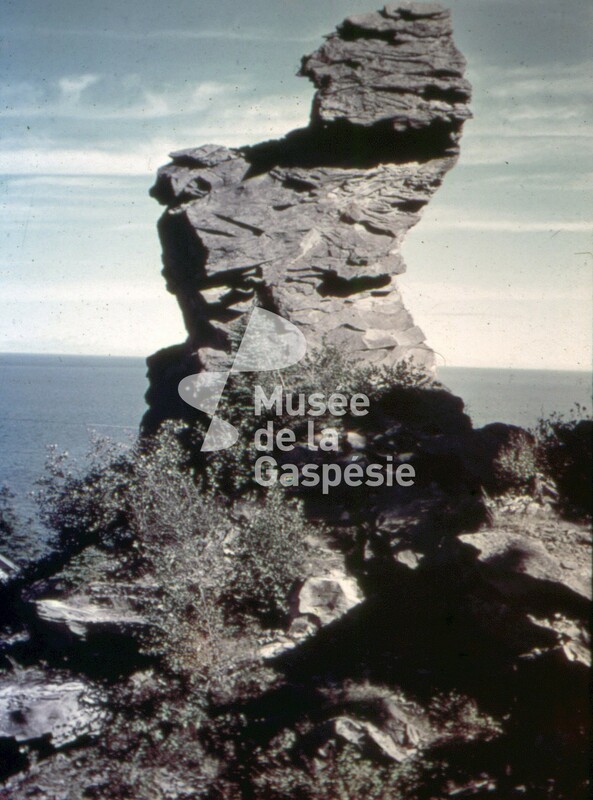 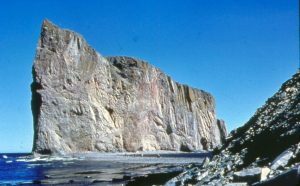 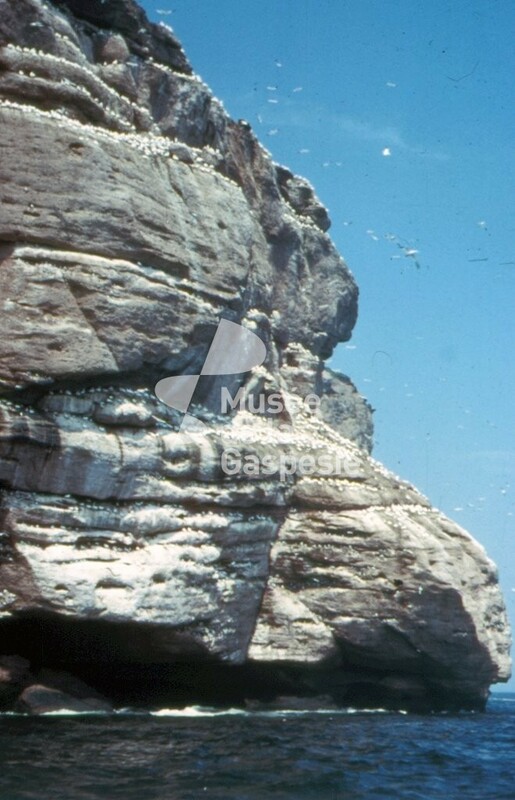 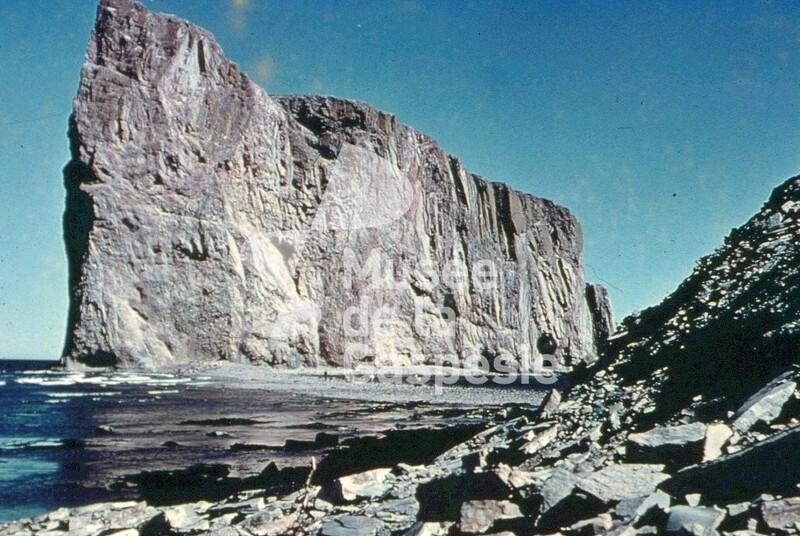 Slide showing Cap Barré, the Trois Sœurs, the Pic de l’Aurore. 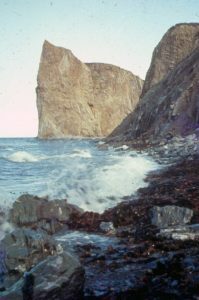 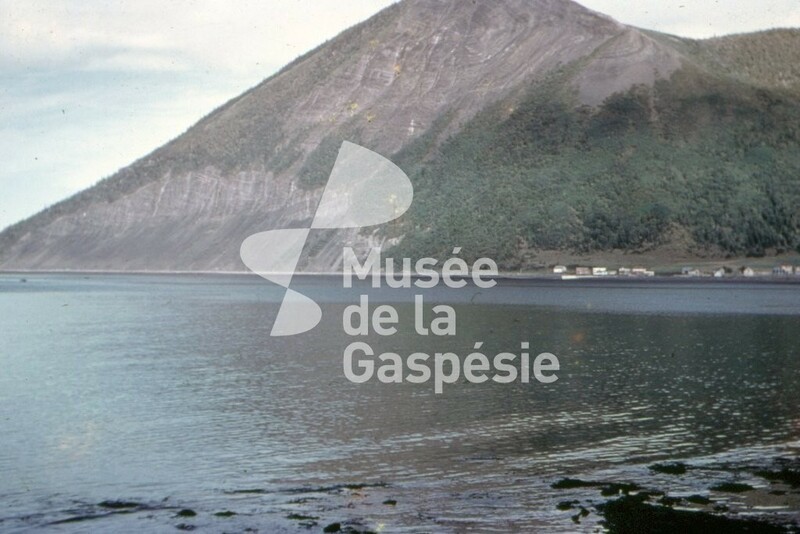 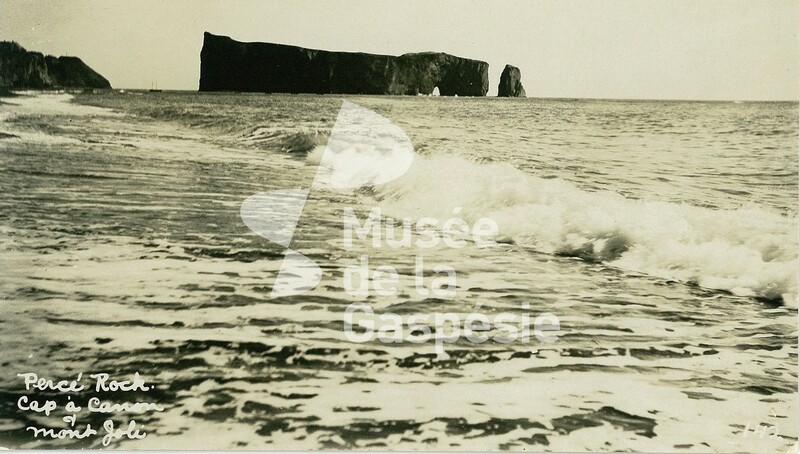 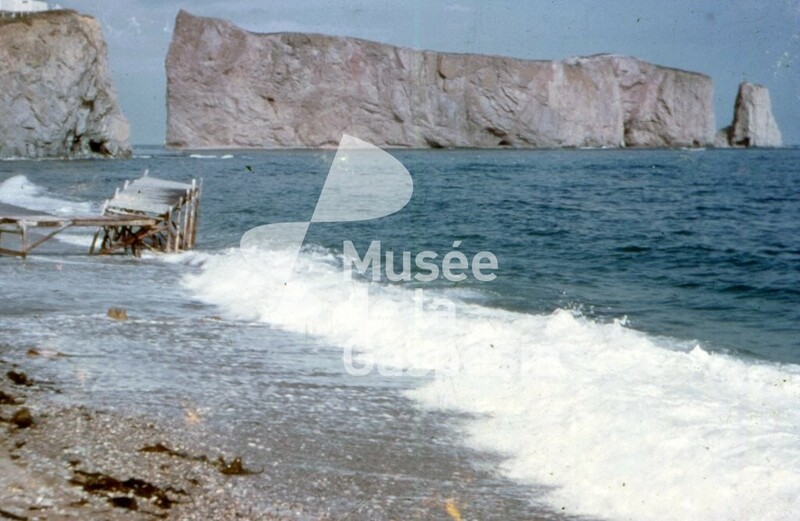 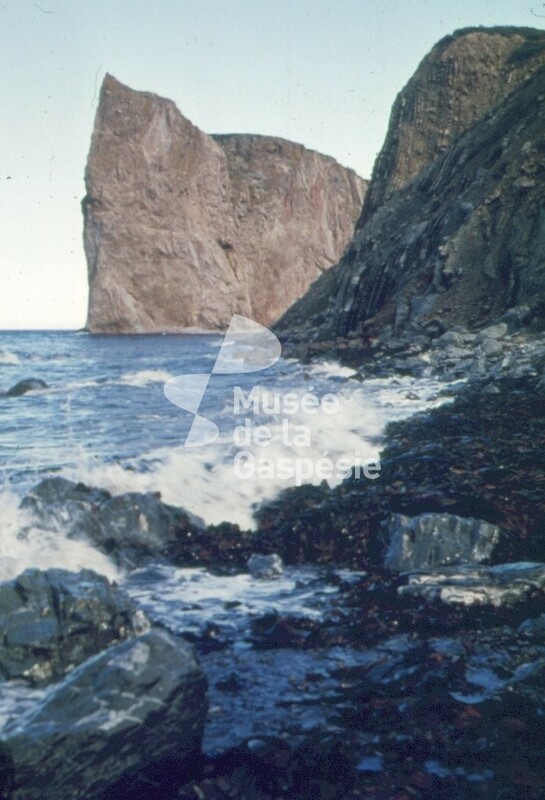 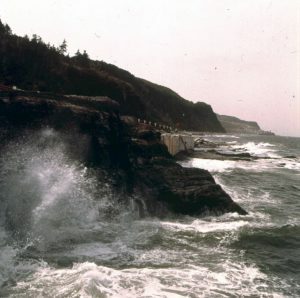 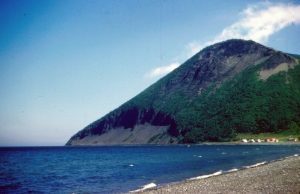 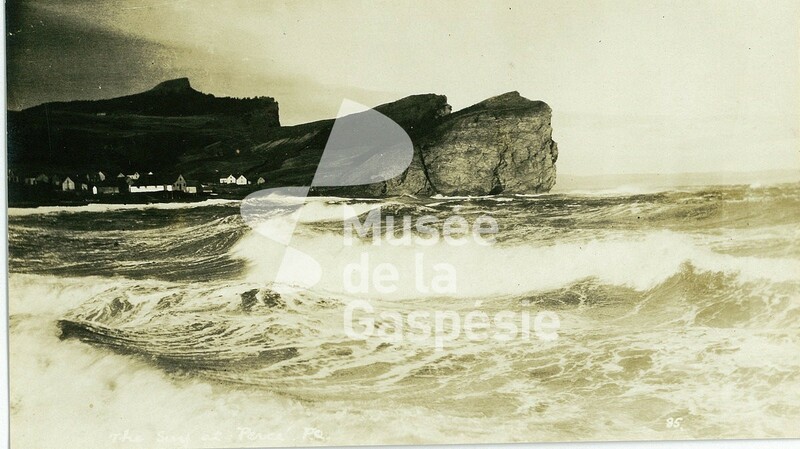 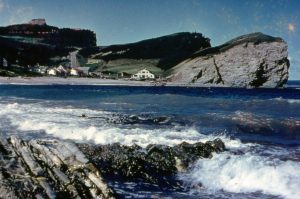 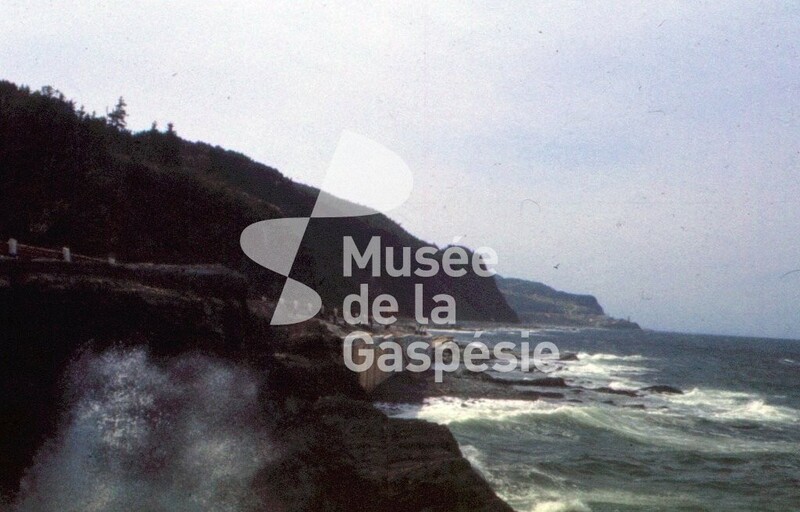 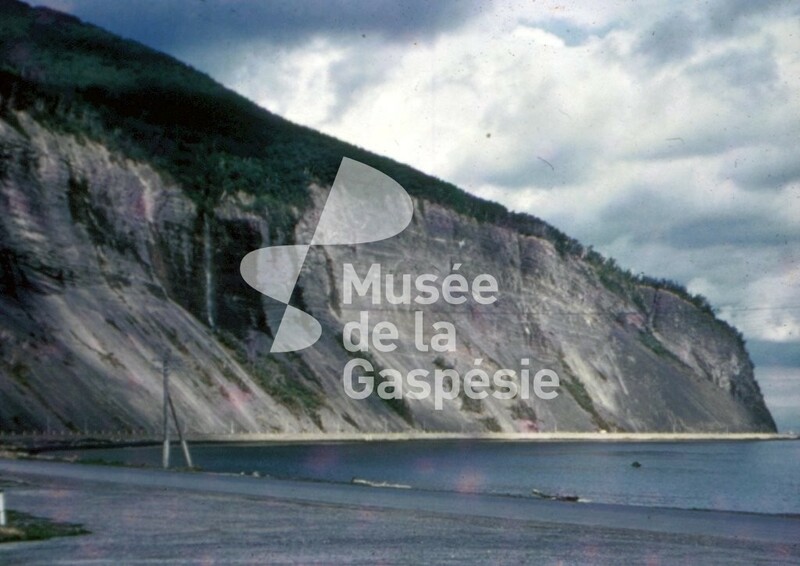 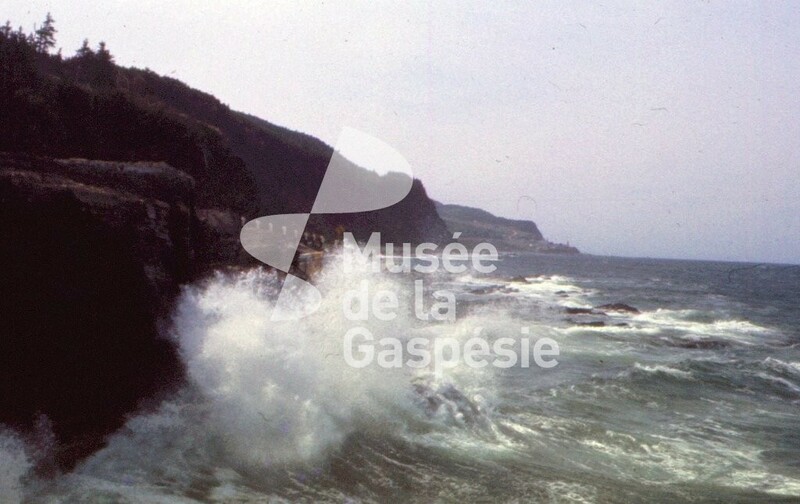 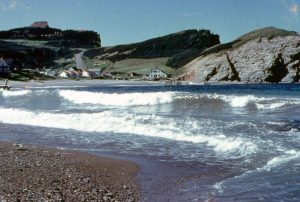 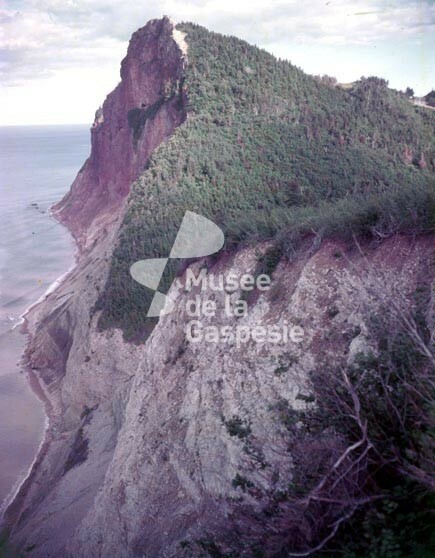 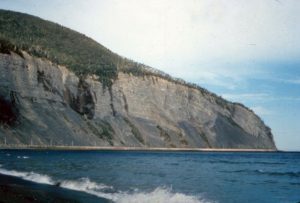 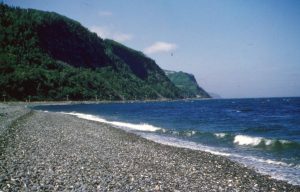 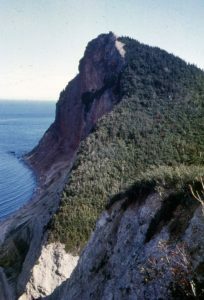 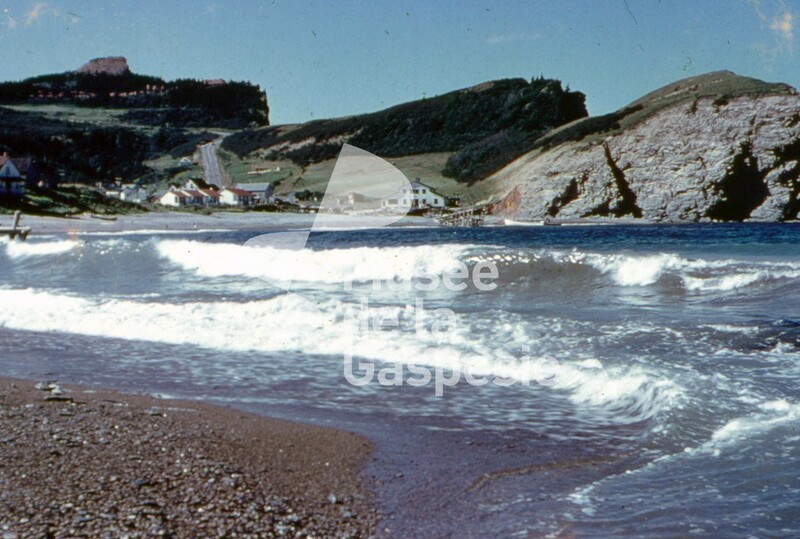 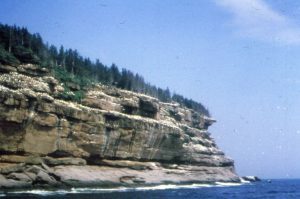 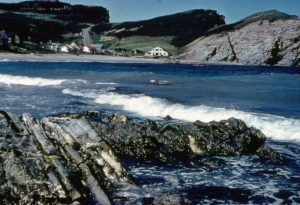 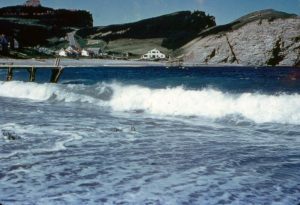 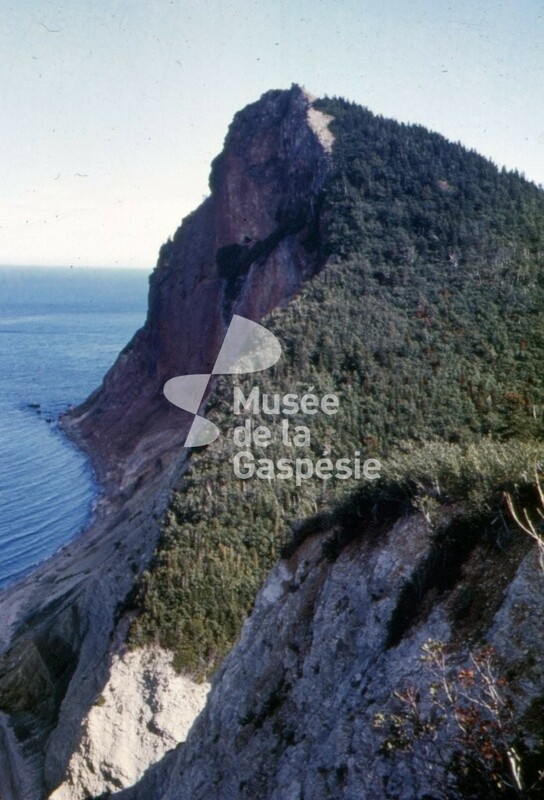 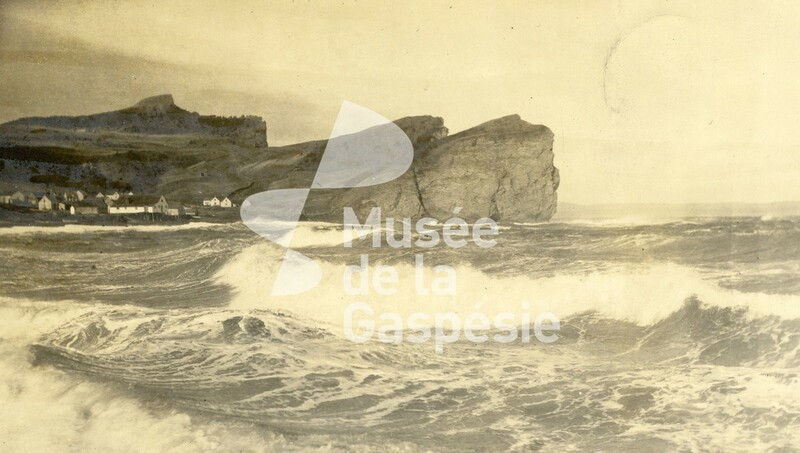 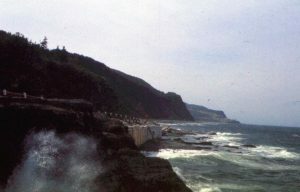 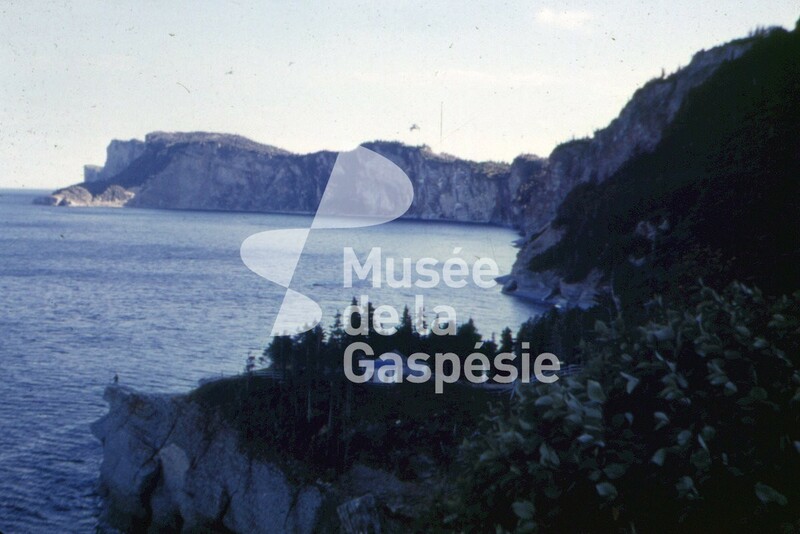 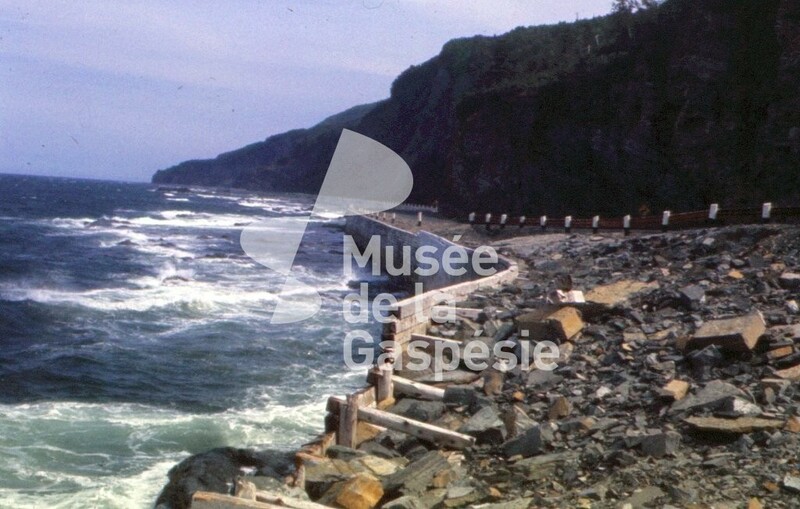 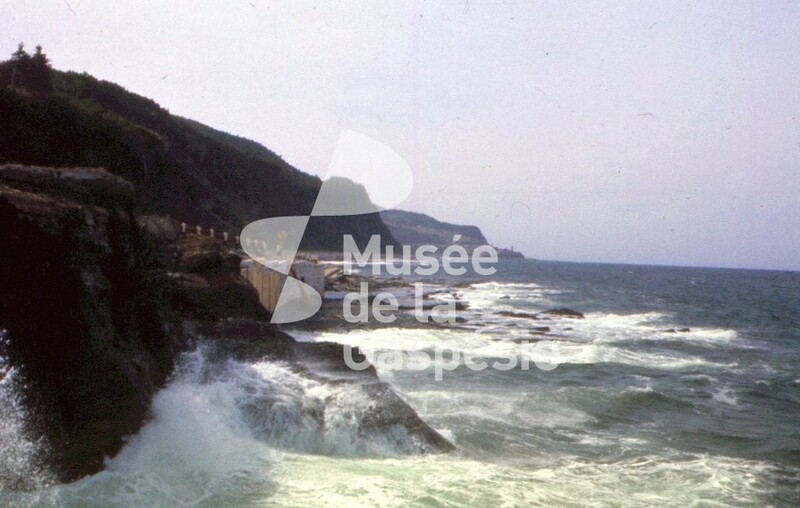 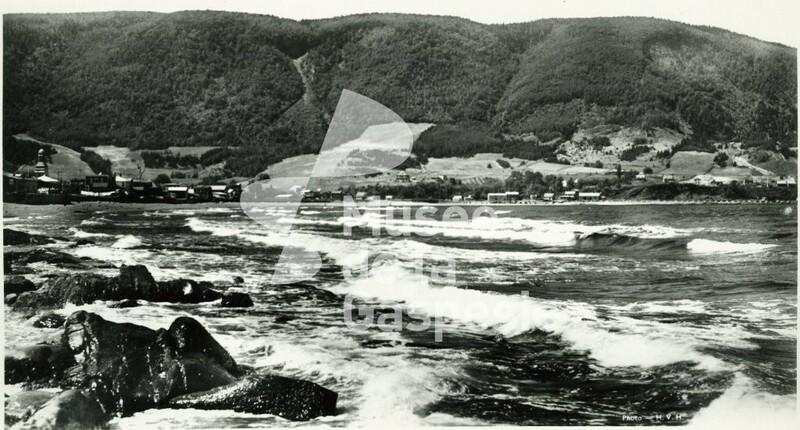 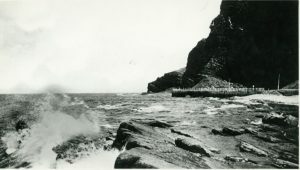 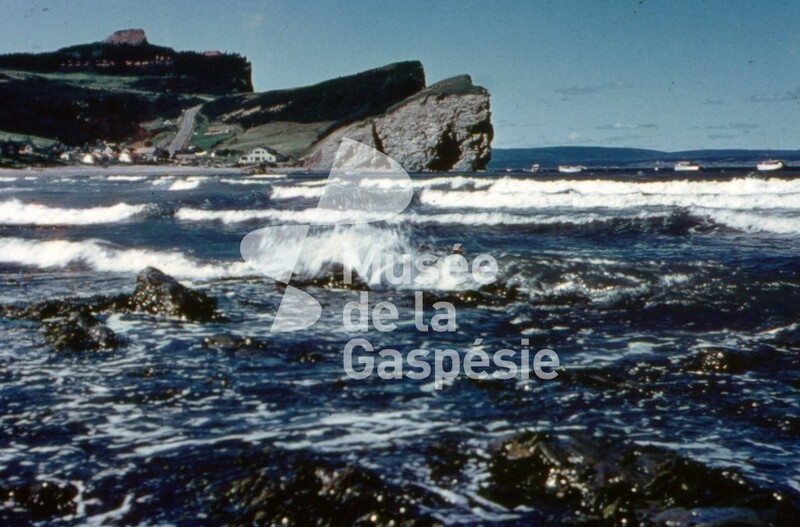 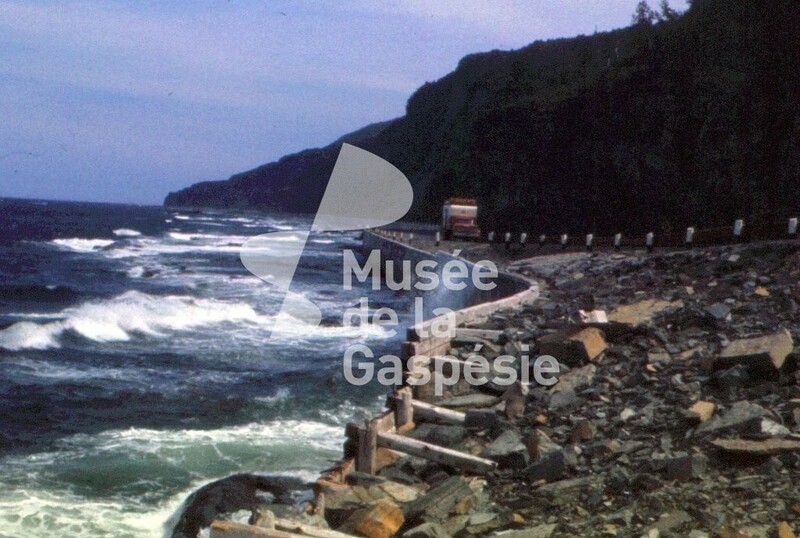 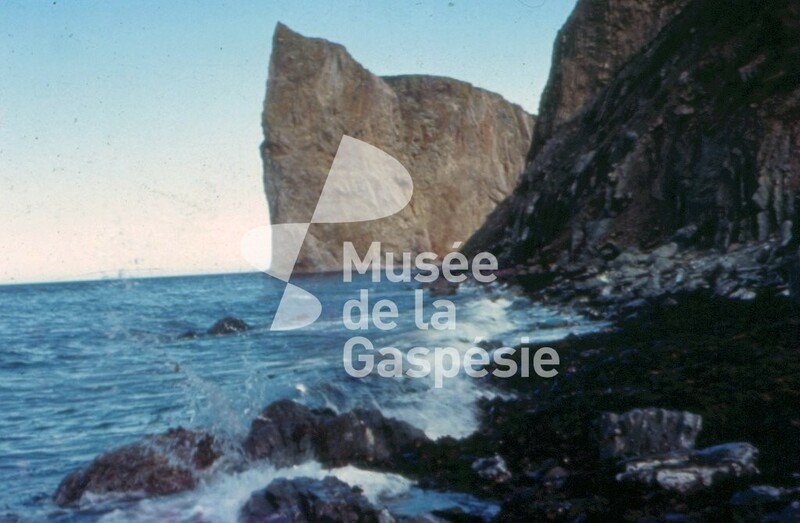 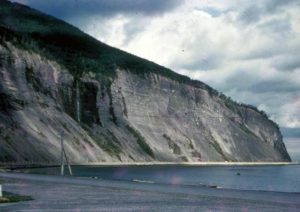 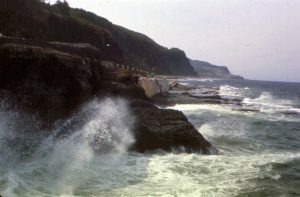 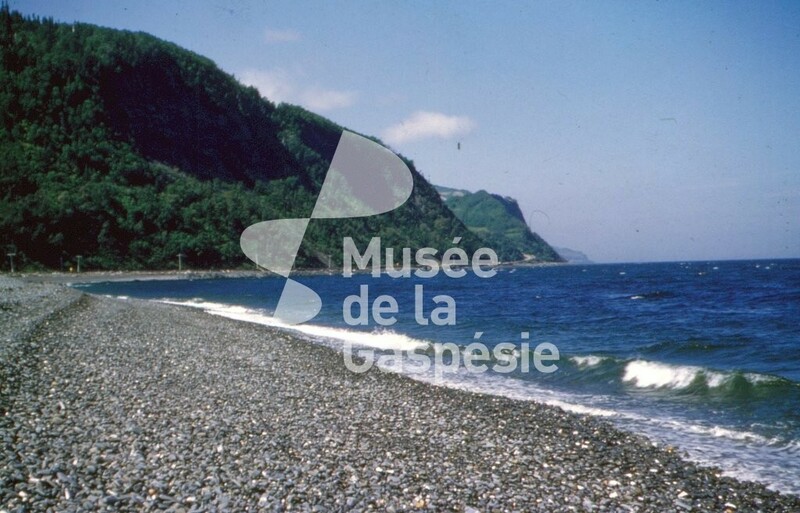 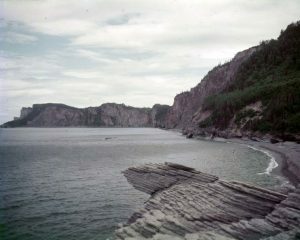 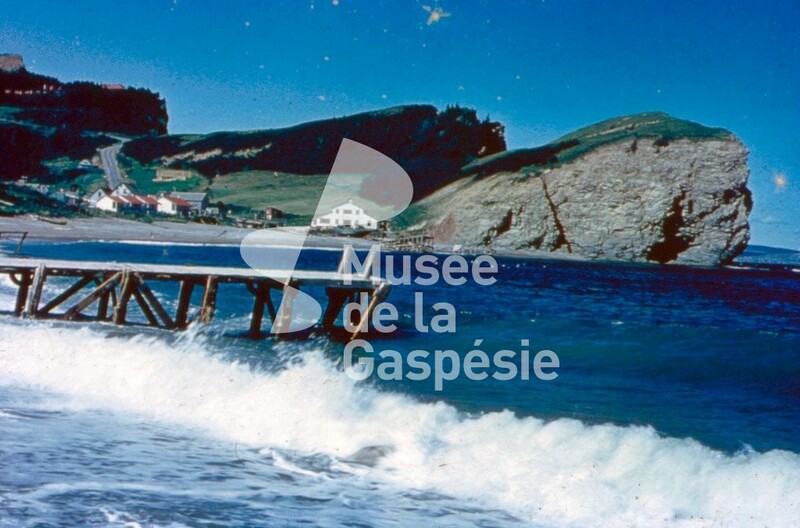 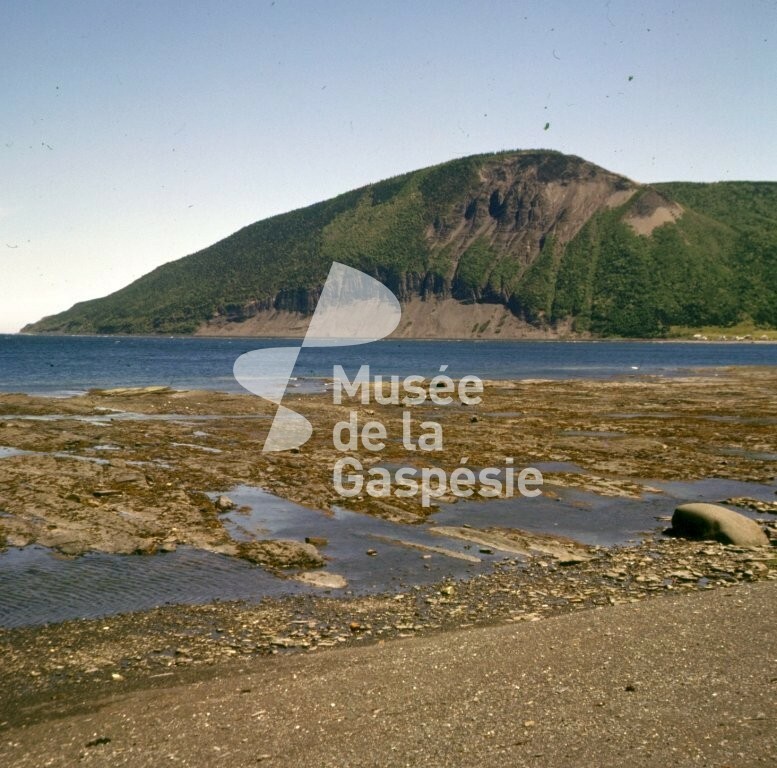 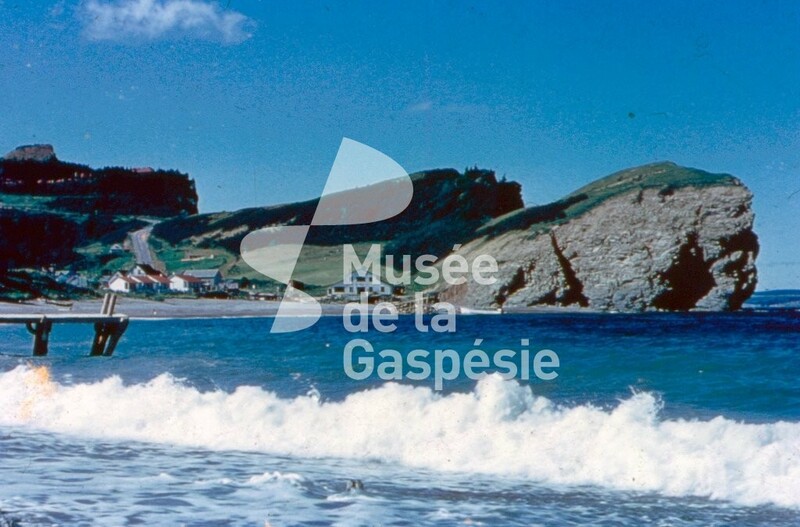 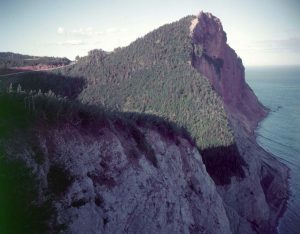 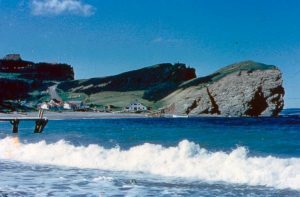 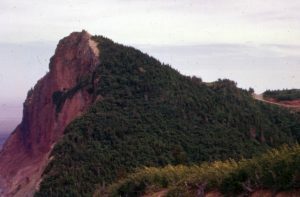 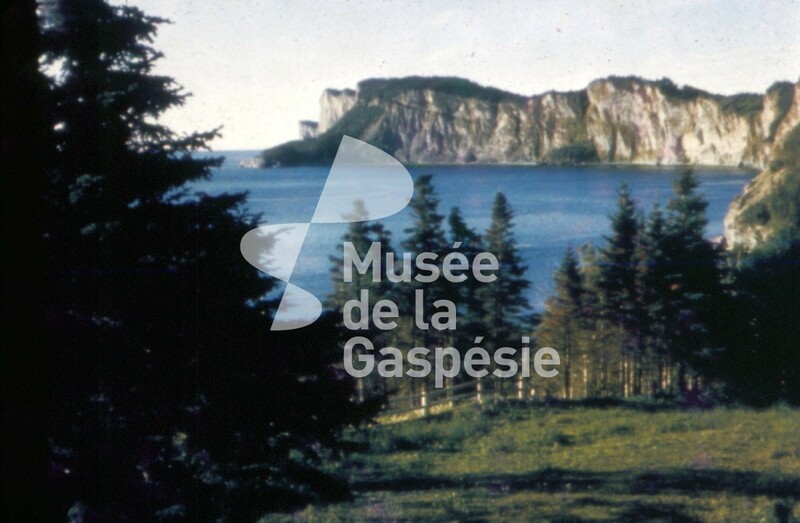 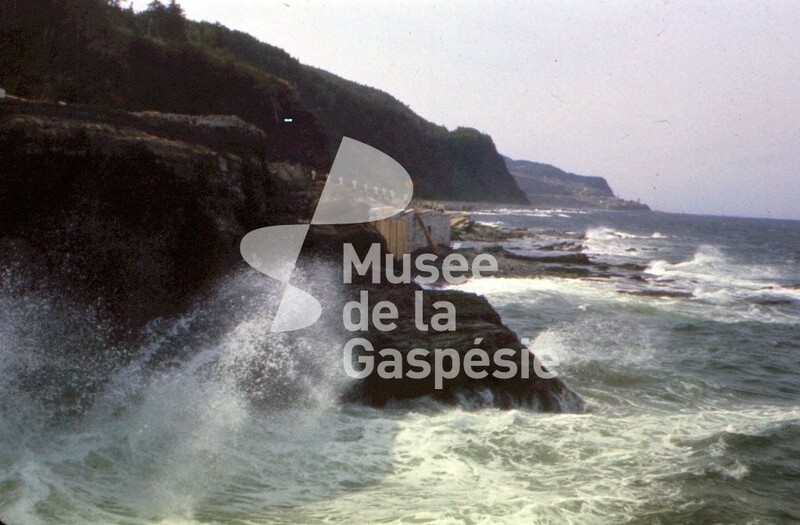 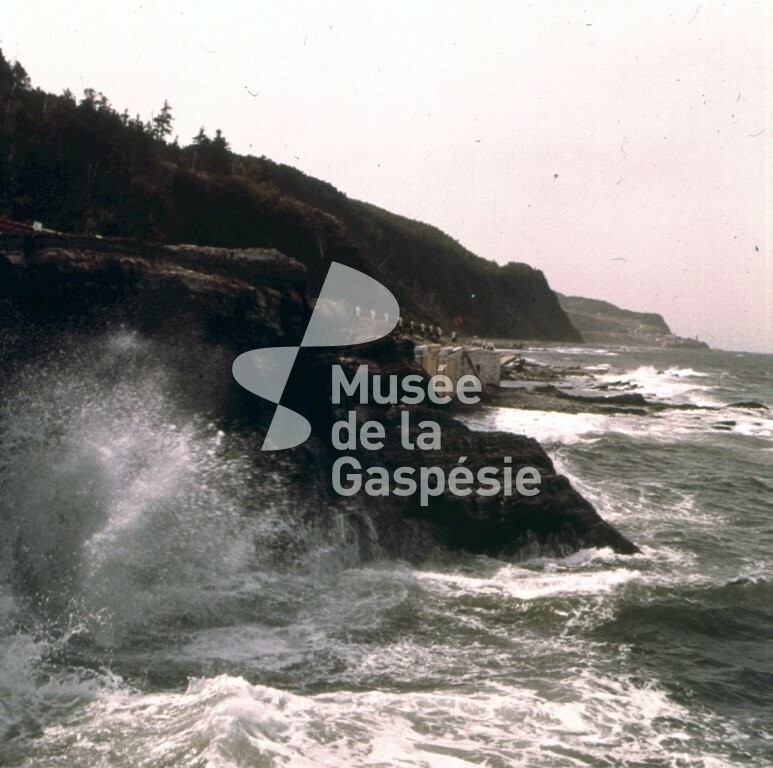 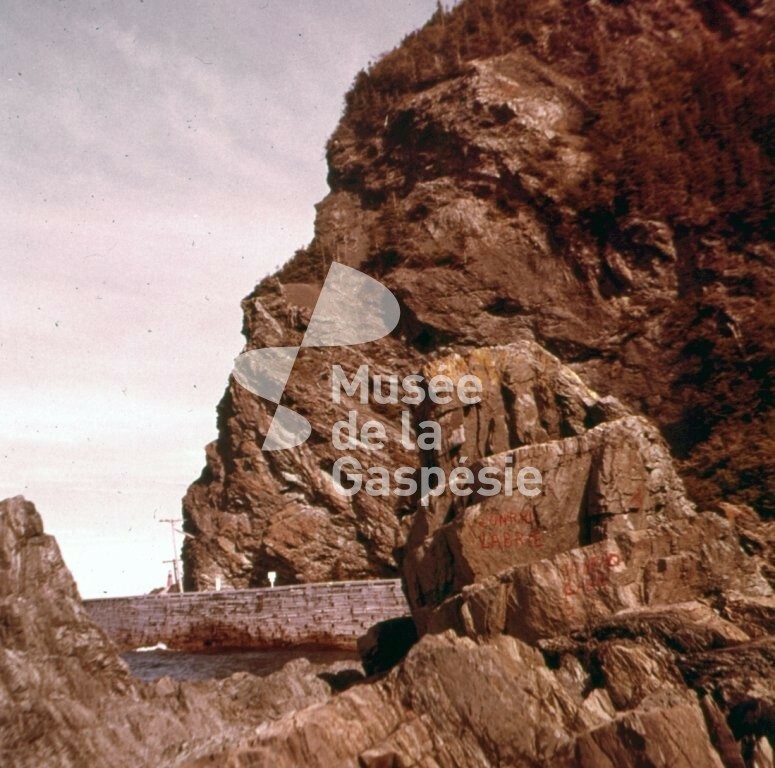 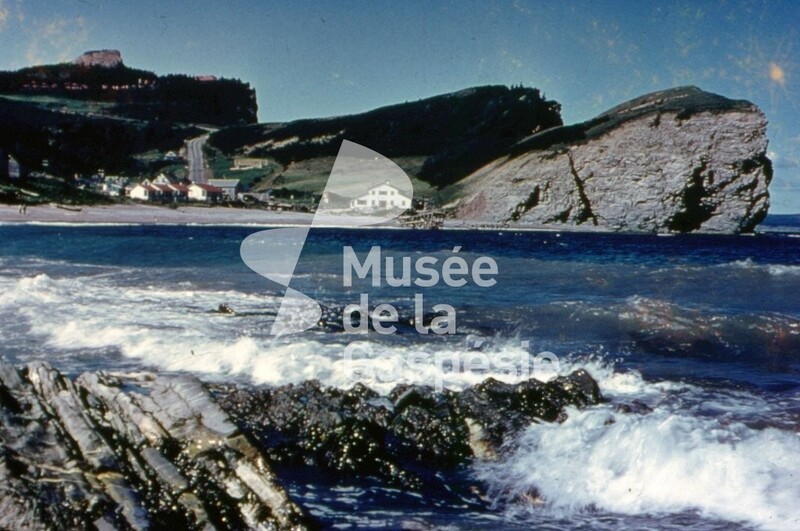 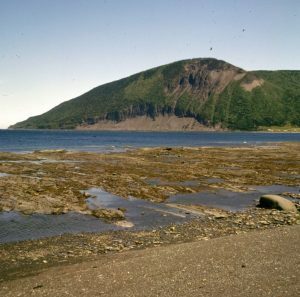 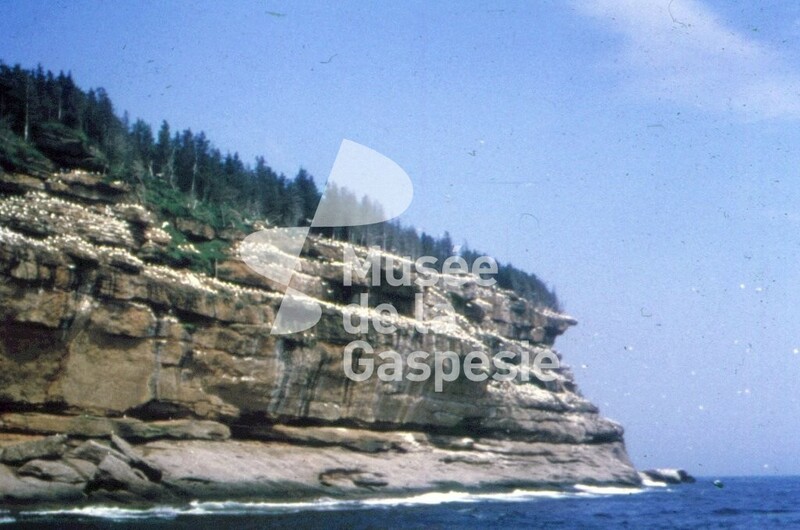 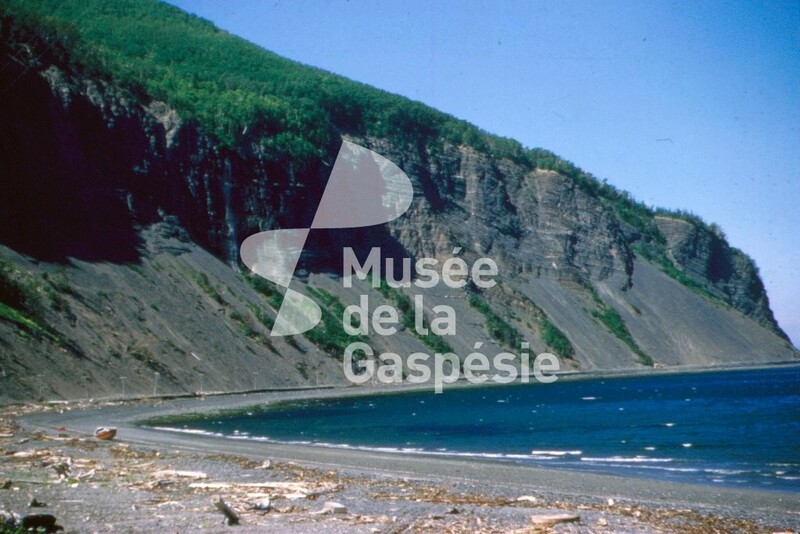 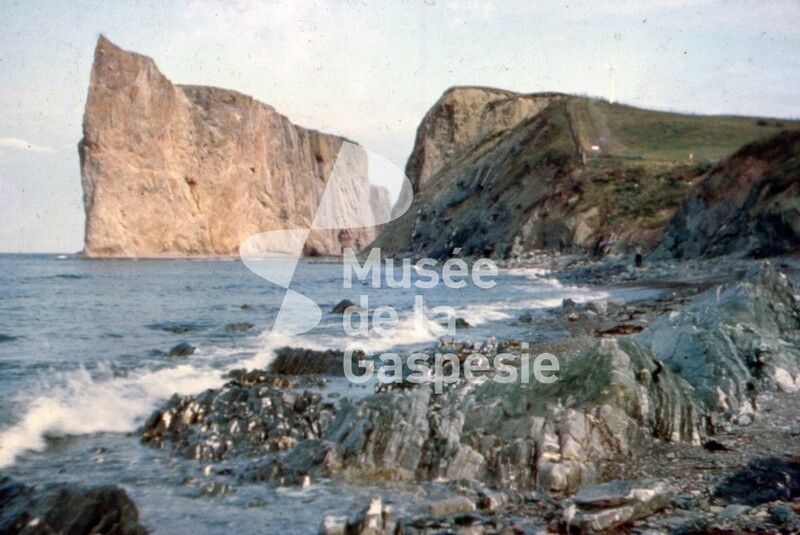 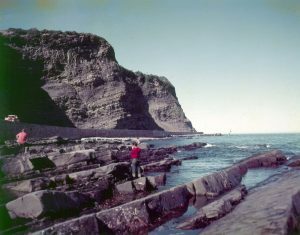 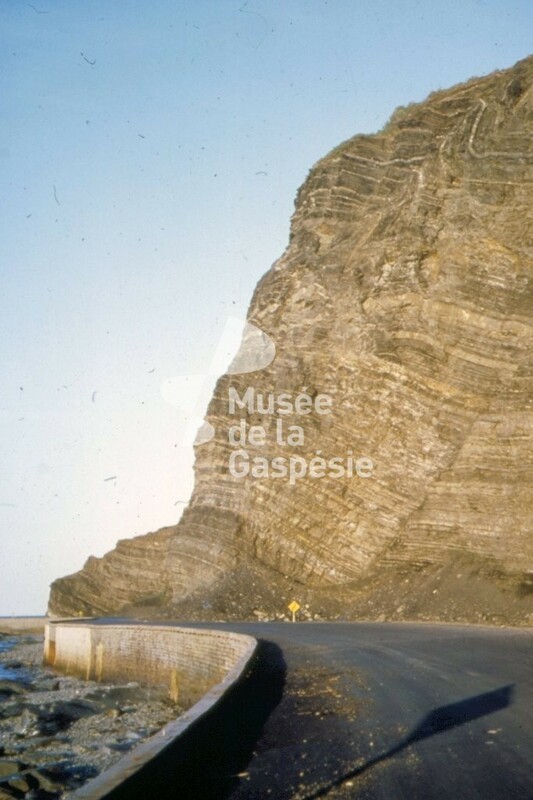 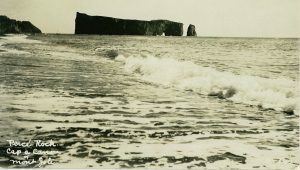 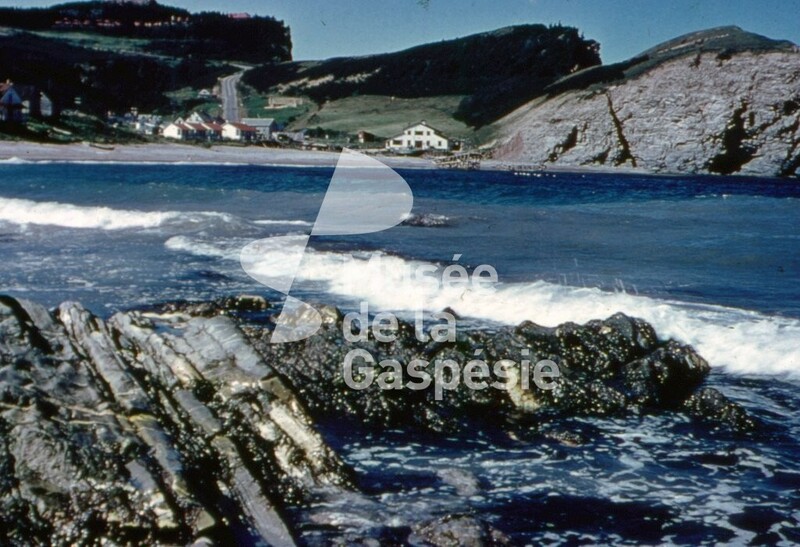 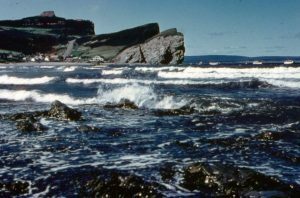 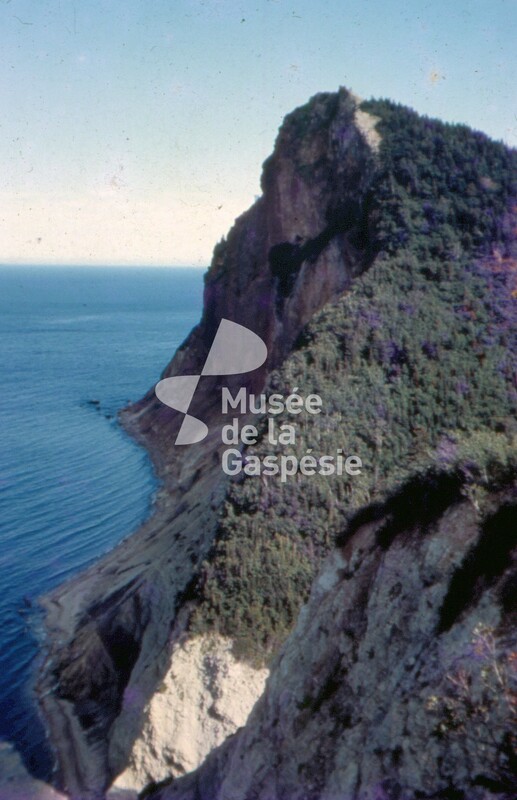 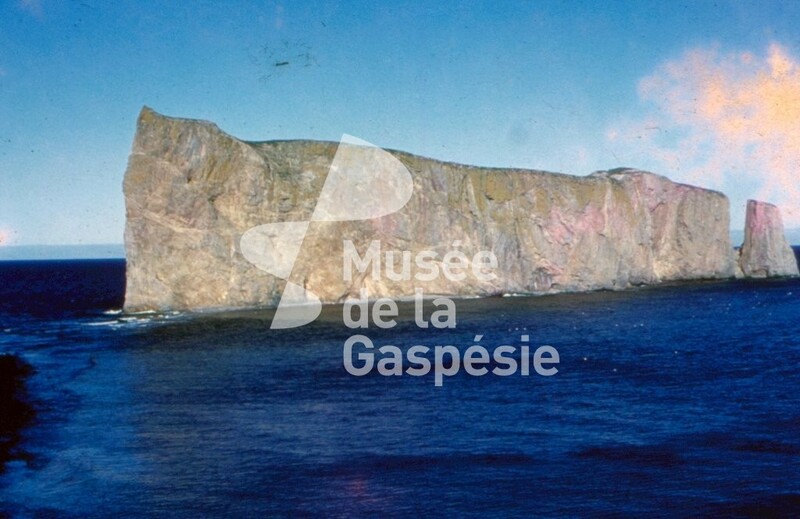 Slide showing Cap Barré, the Trois Sœurs, Rosy Peak, and waves breaking on l’Anse-du-Nord beach. A view of Percé Rock from Surprise Hill. 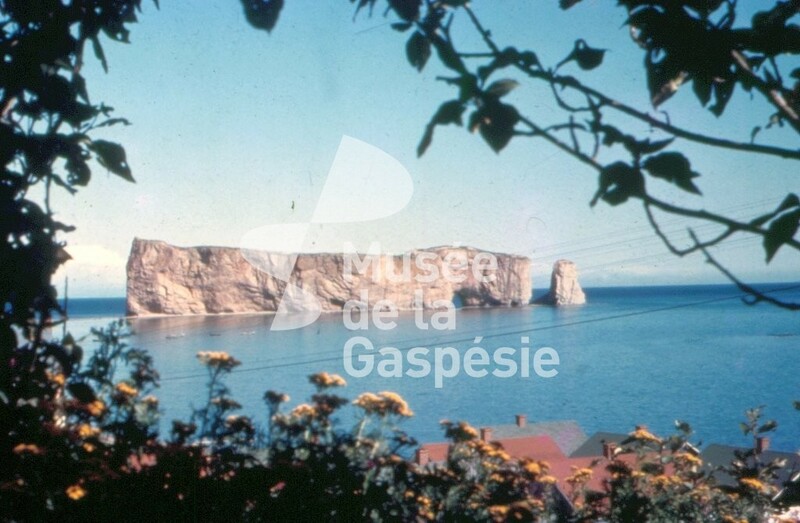 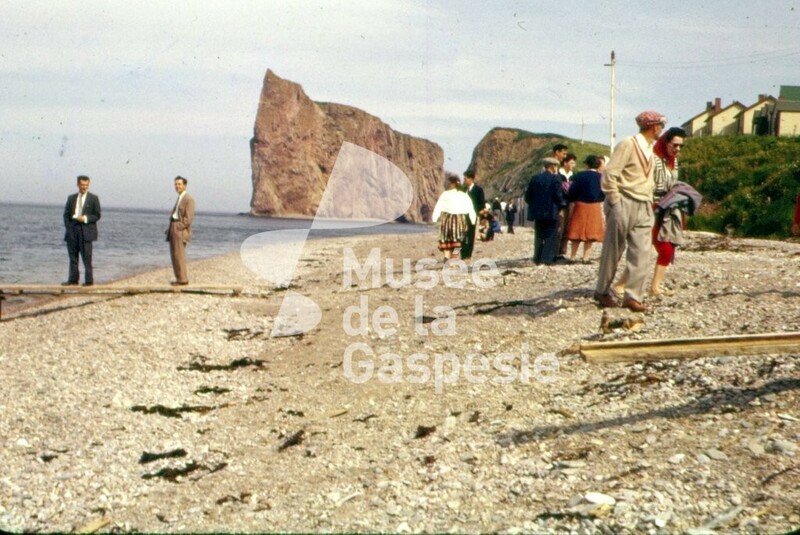 A view of Percé Rock from l’Anse du Sud. 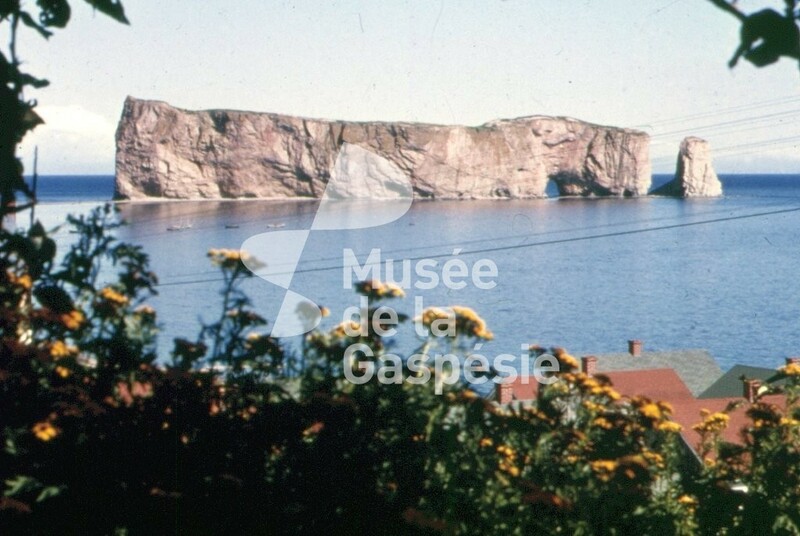 A view of Percé Rock with Percé hotel buildings in the foreground. 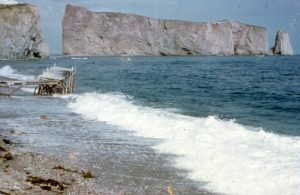 A view of Percé Rock with the Anse-du-Sud beach and some chairs in the foreground. 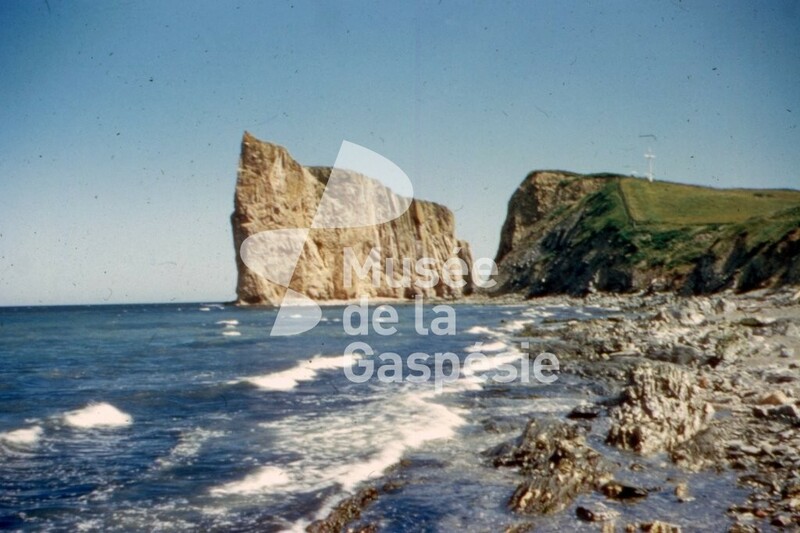 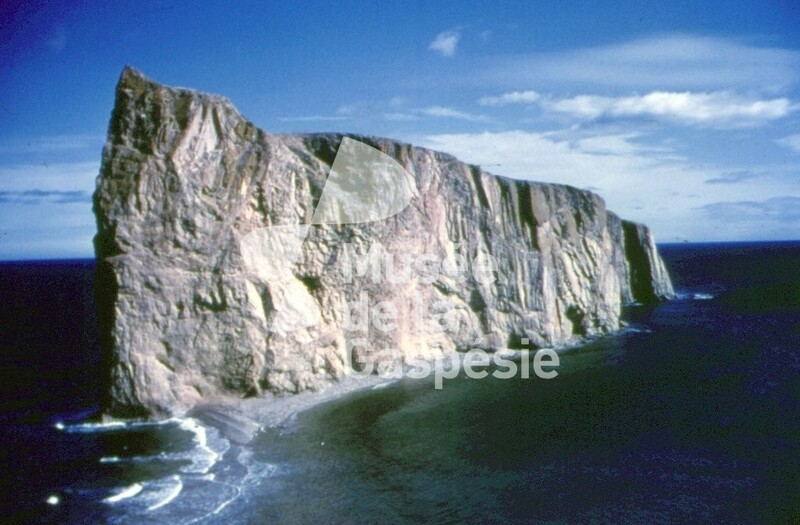 A view of Percé Rock with the Anse-du-Sud beach in the foreground. 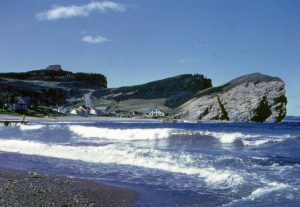 Panorama of Percé village, Percé Rock and Bonaventure Island. Full view of Percé Rock from Cap Canon. 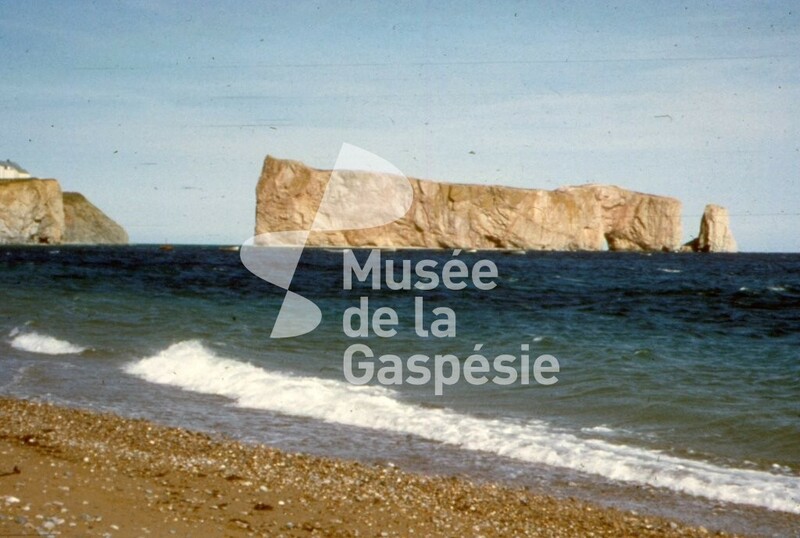 Partial view of Percé Rock and Mont Joli from l’Anse-du-Nord beach. 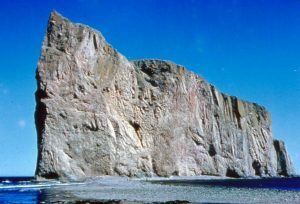 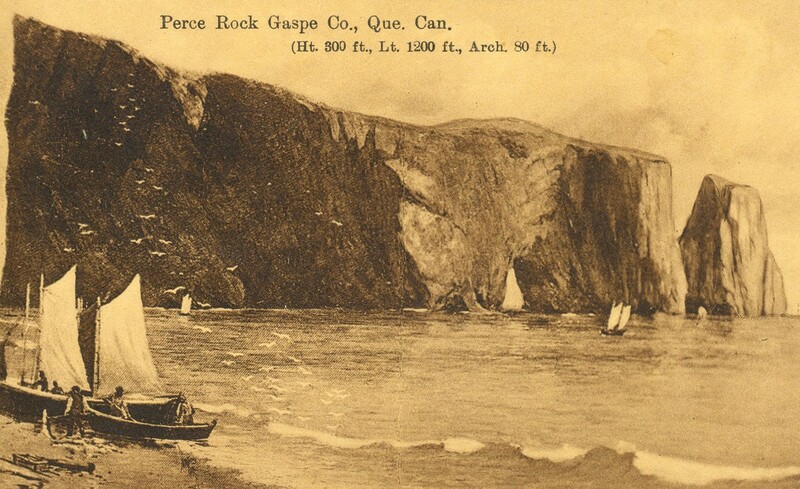 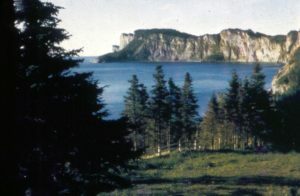 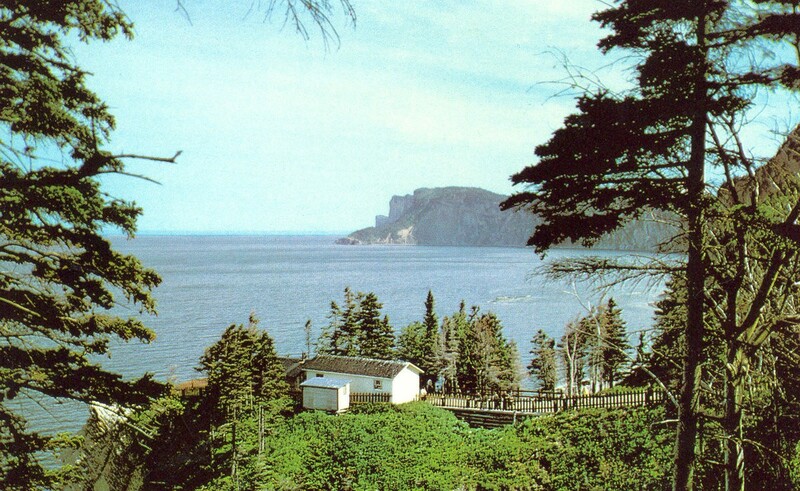 A view of Percé Rock from the south west. 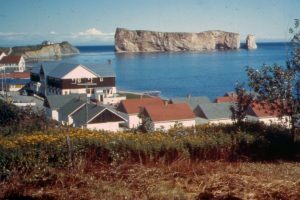 A view Percé Rock in the foreground with the buildings of Percé hotel. 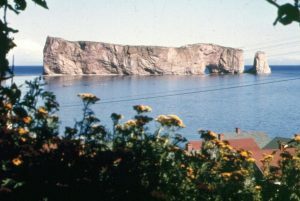 A view Percé Rock with some Percé hotel buildings. 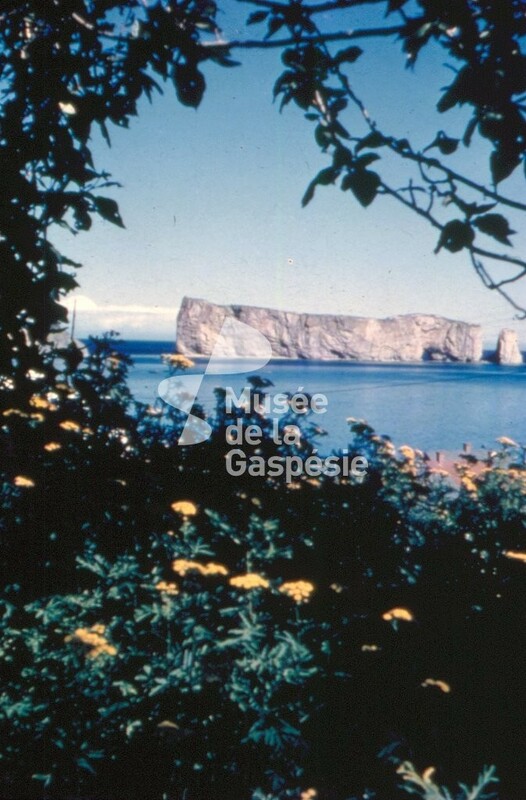 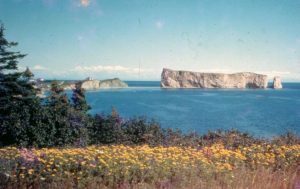 View of Percé Rock with a field of yellow wildflowers in the foreground. 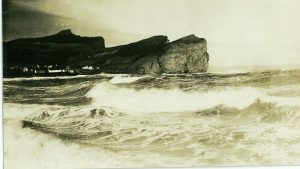 Photograph of Percé Rock and Mont-Joli, seen from the Anse-du-Nord beach. 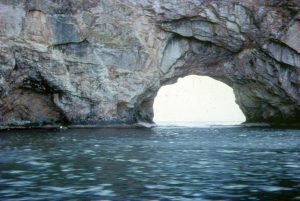 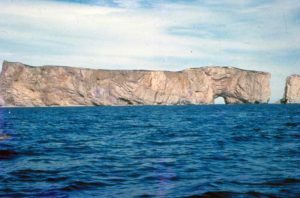 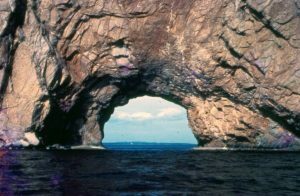 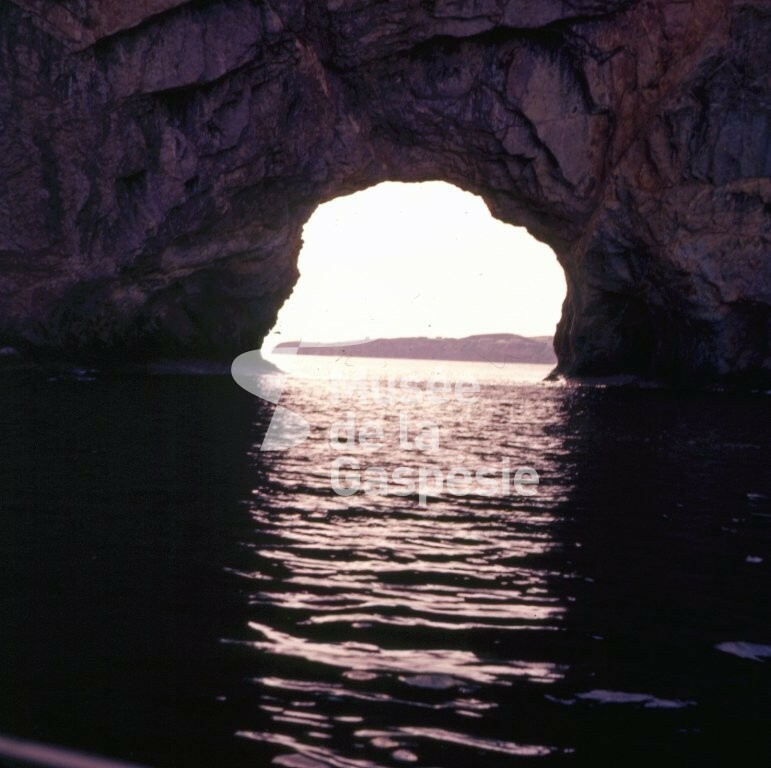 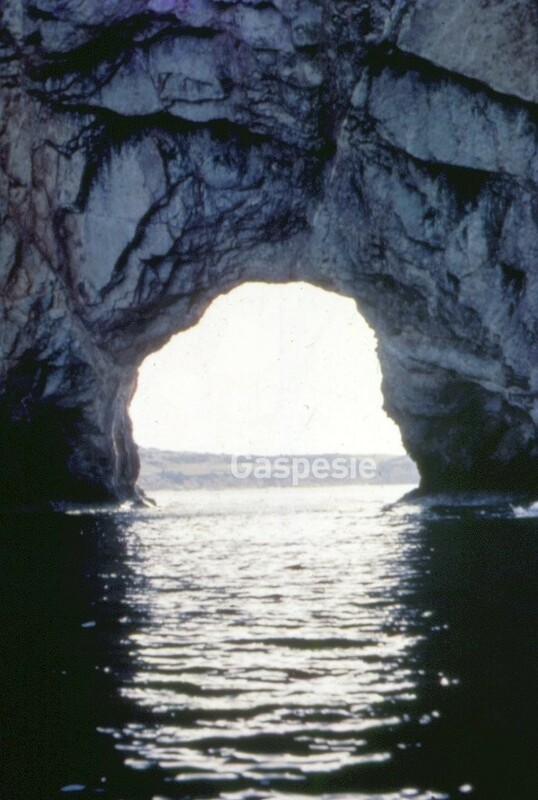 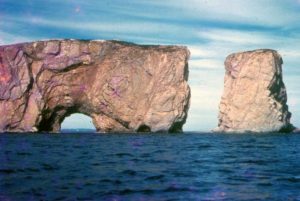 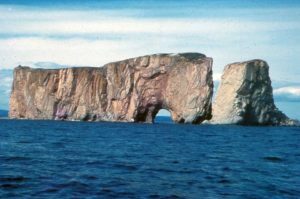 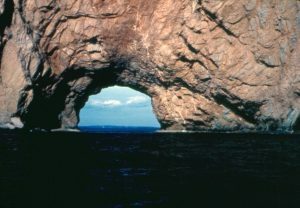 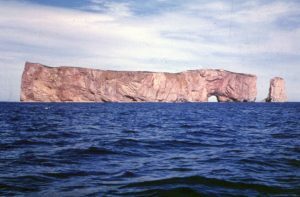 Percé Rock arch, called the “Hole” of the rock, or the “Arch”, view from the sea. 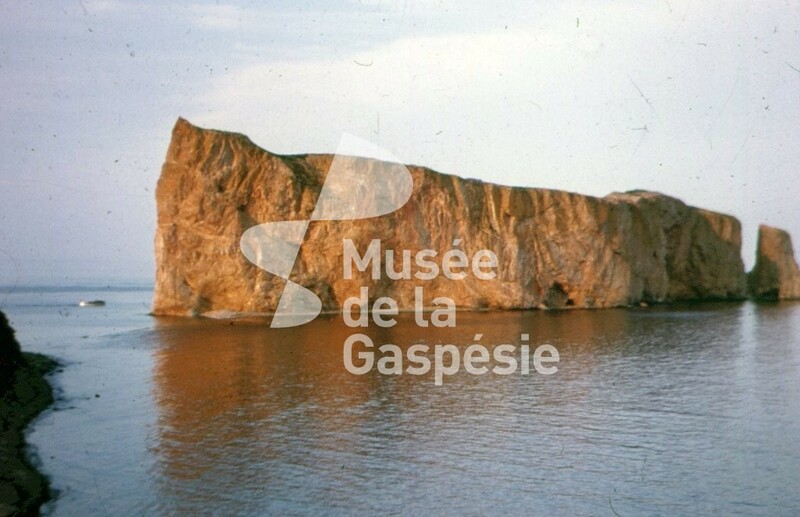 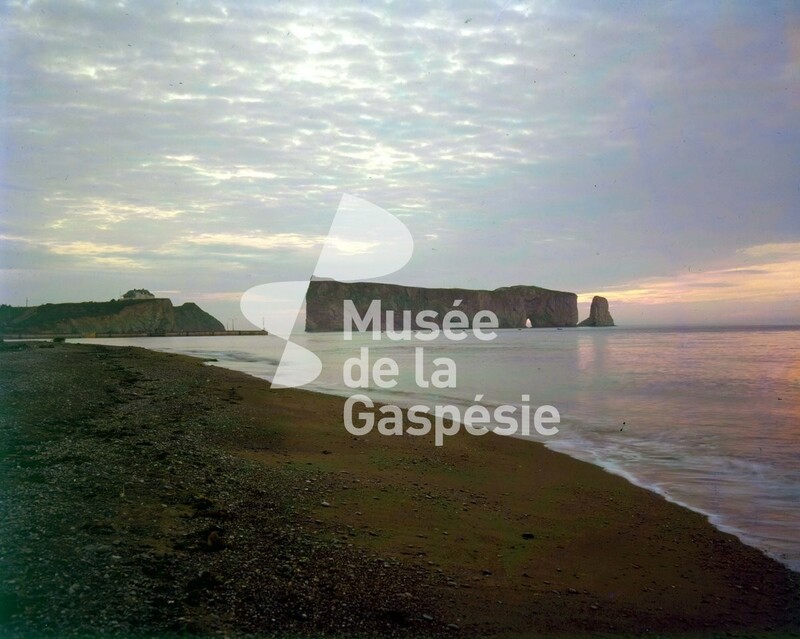 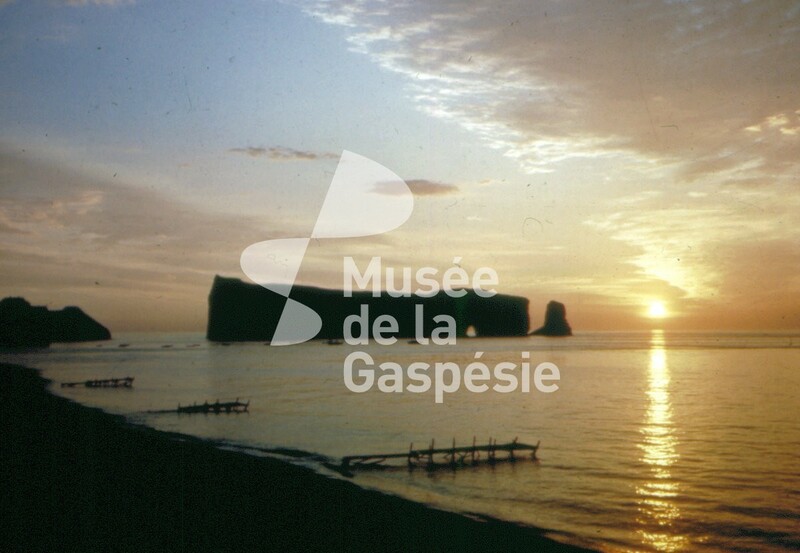 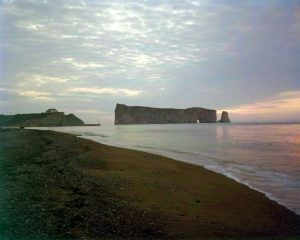 View of Percé Rock from Cap Canon at sunset. 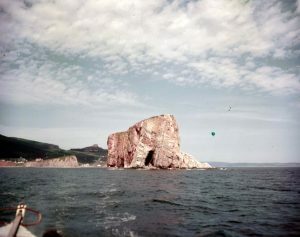 Rear view, from the sea, of Percé Rock. 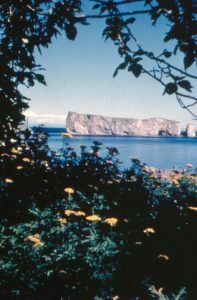 View of Percé Rock from the Anse-du-Sud beach, near the heart of the village. 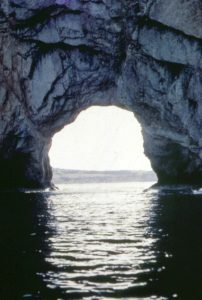 Percé Rock arch, also called the “Hole” or the “Arch”, from the sea. 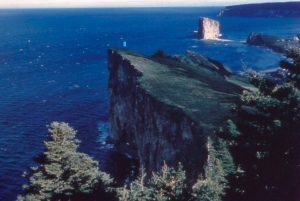 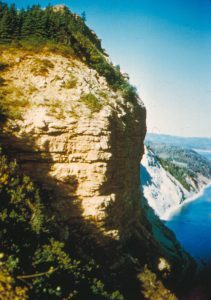 Percé Rock from Mont Joli. 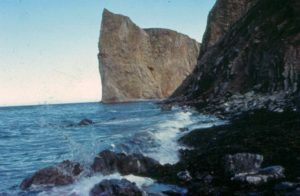 View of Percé Rock at low tide, from the foot of Mont Joli. 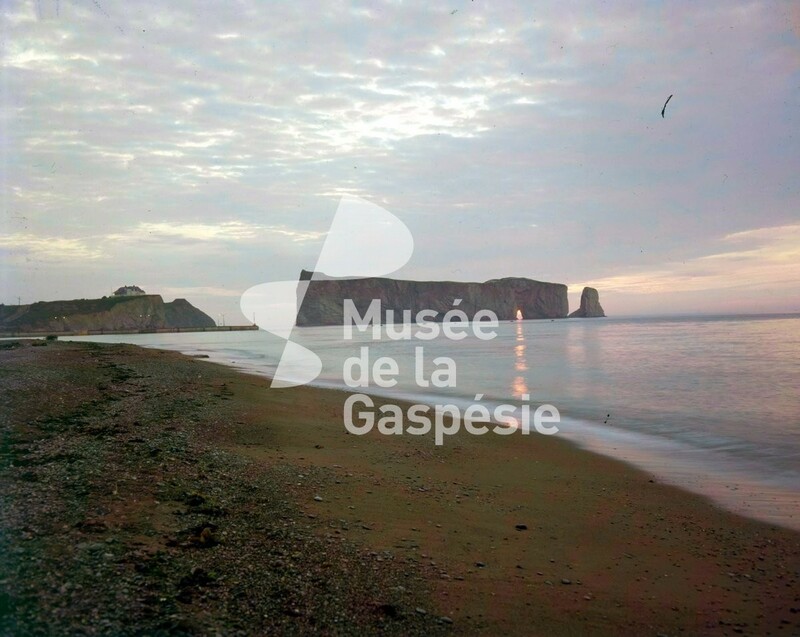 Reflection of sunrise on the water next to Percé Rock. View of Cap-Gaspé taken from Cap Bon-Ami. 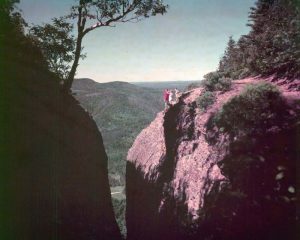 We can see a man and a woman. Mont St-Alban seen from Cap-des-Rosiers, as well as some houses and period buildings, near the beach. 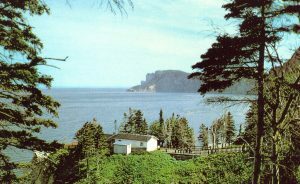 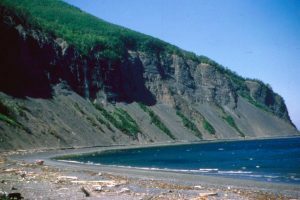 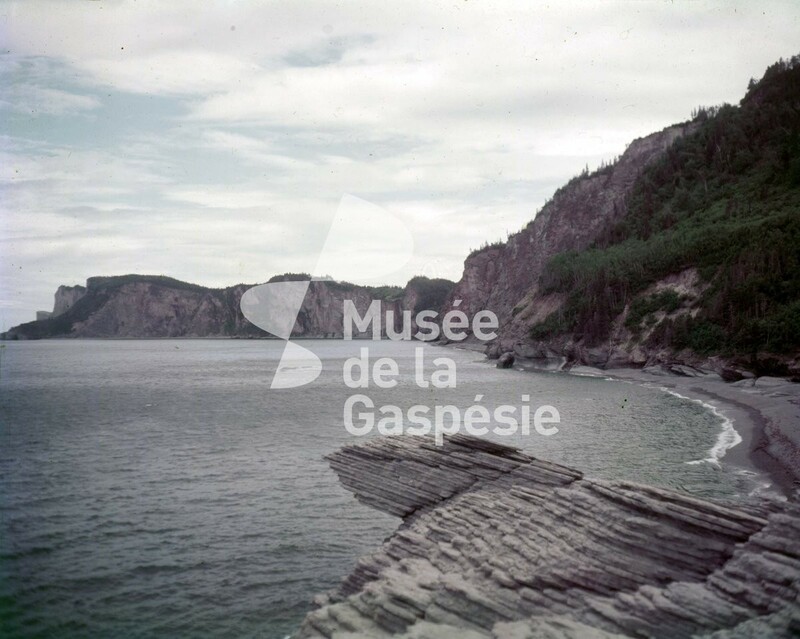 View of Cap-Gaspé, located at the eastern end of Forillon National Park. 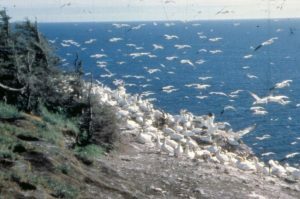 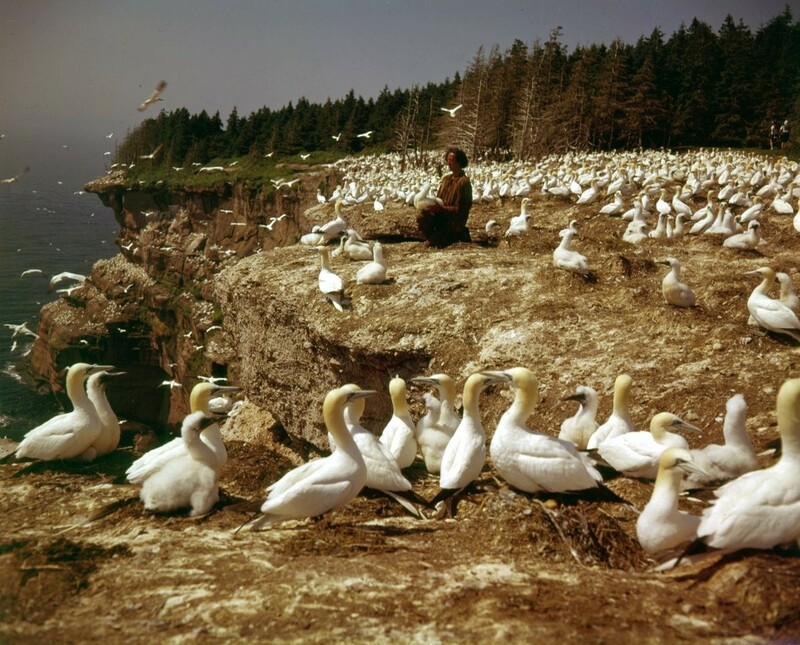 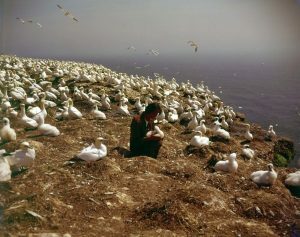 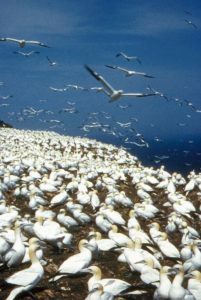 Northern gannet colony on Bonaventure Island cliffs. 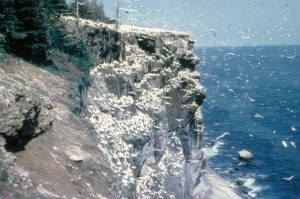 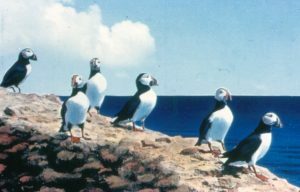 Northern gannet colony and some puffins on the cliffs of Bonaventure Island. Two northern gannets grooming each other on the Bonaventure Island cliffs. 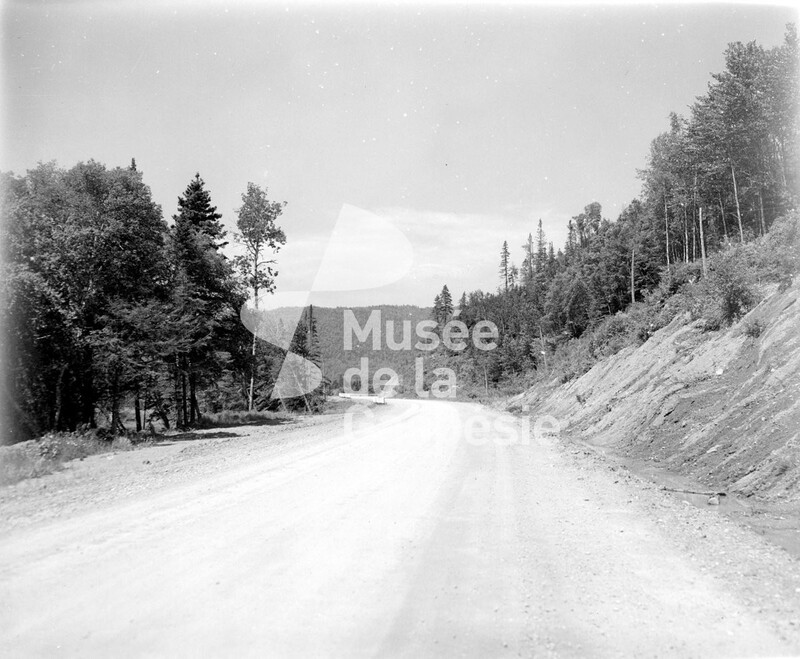 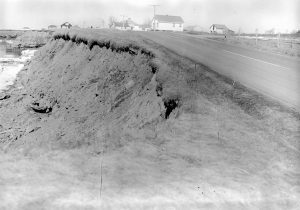 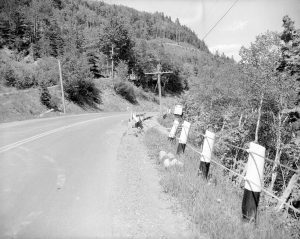 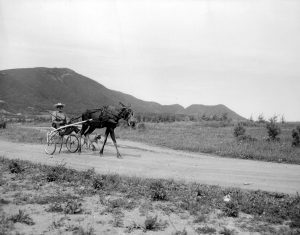 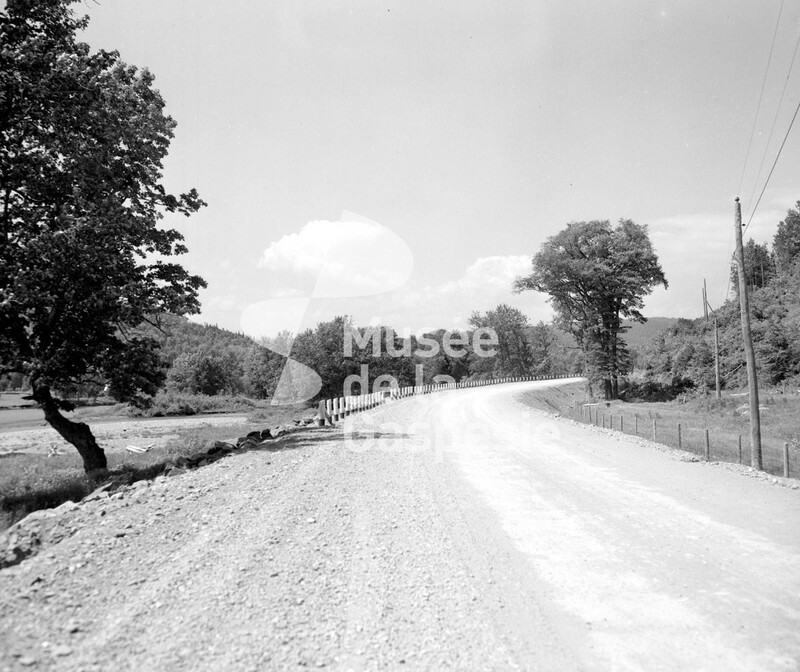 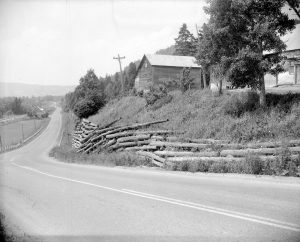 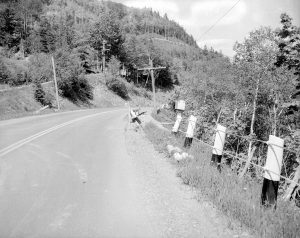 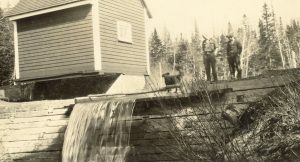 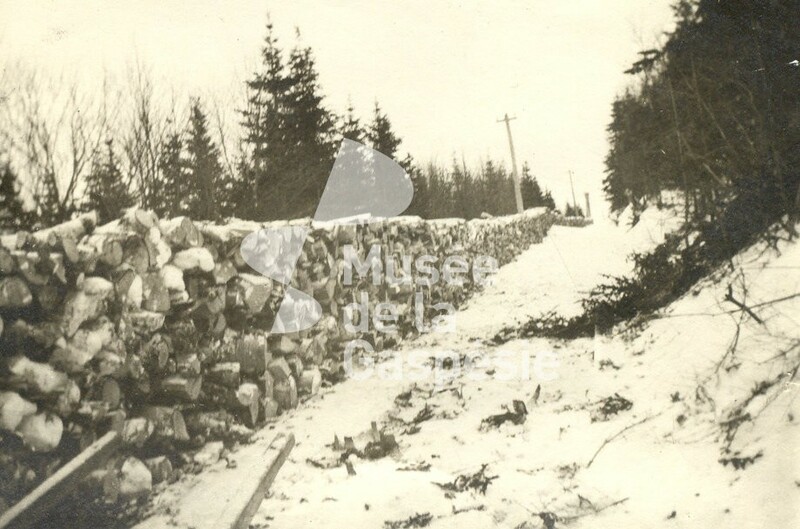 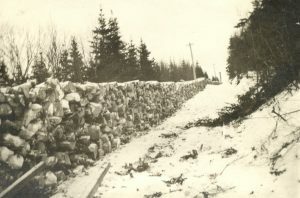 Hwy 132 (formerly Route 6), going in front of Sorel creek, west of Sainte-Marthe (now La Martre). 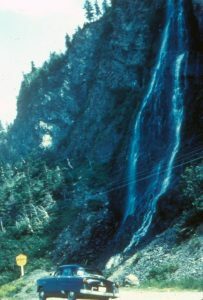 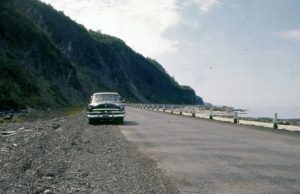 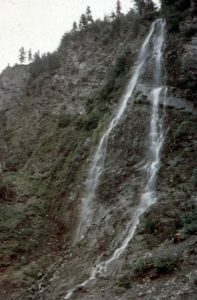 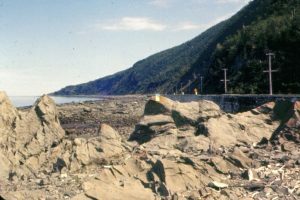 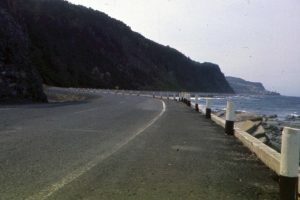 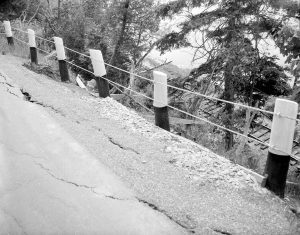 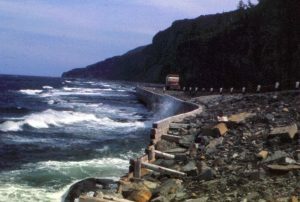 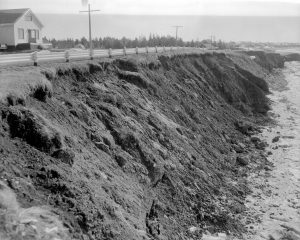 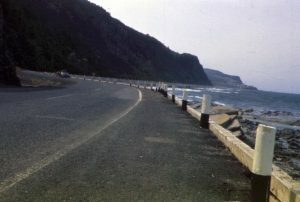 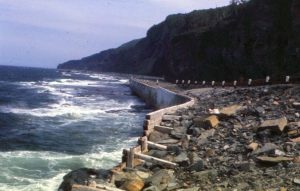 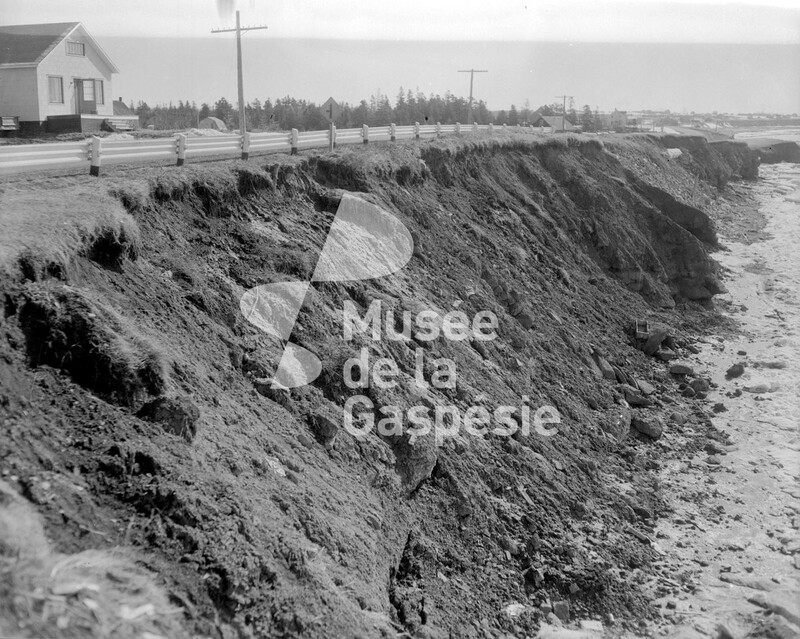 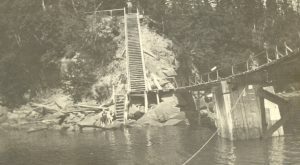 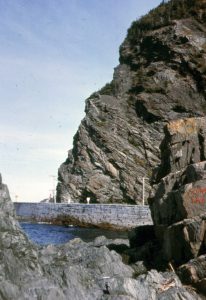 Near Sainte-Marthe (now “La Martre”), Highway 132 (formerly Route 6) runs between sea and cliff. 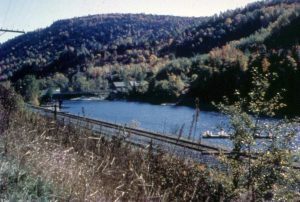 Photograph of the railroad alongside the Matapédia river. 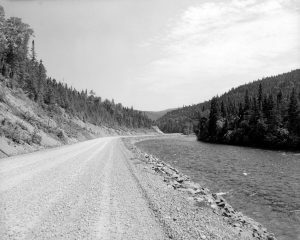 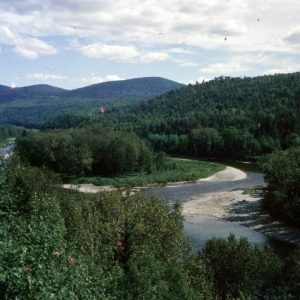 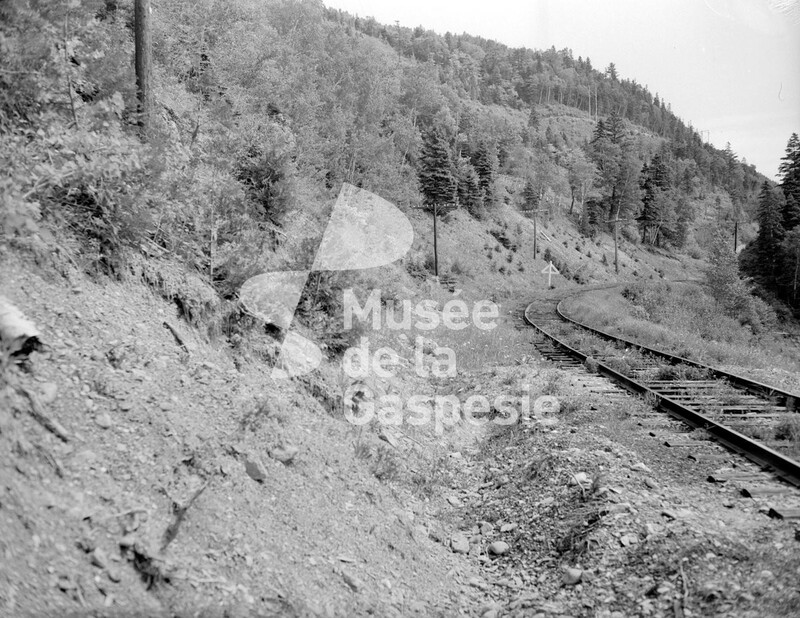 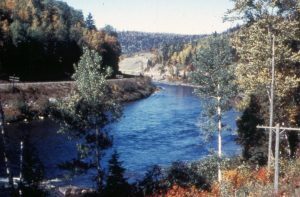 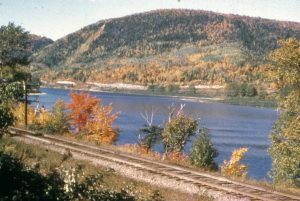 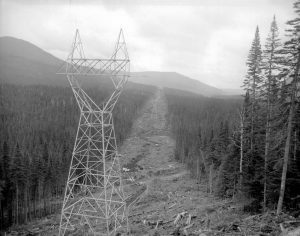 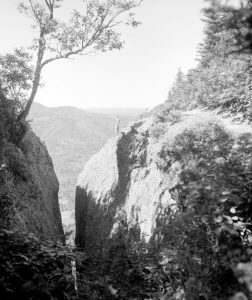 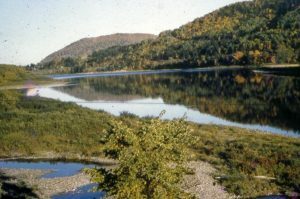 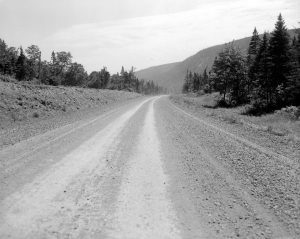 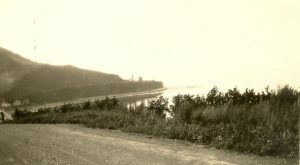 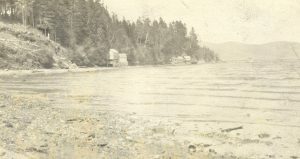 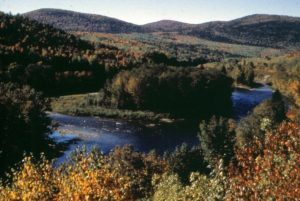 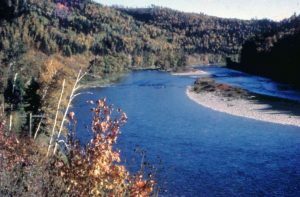 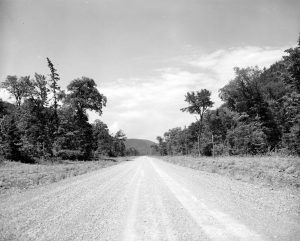 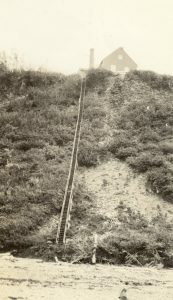 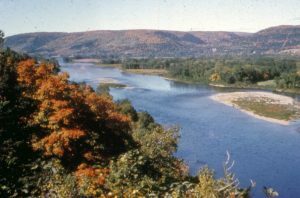 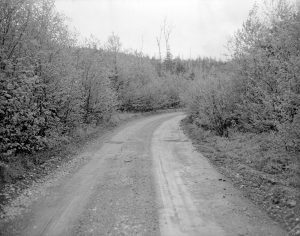 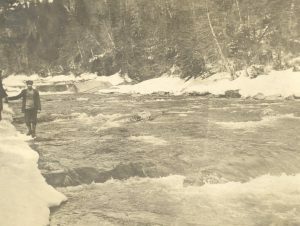 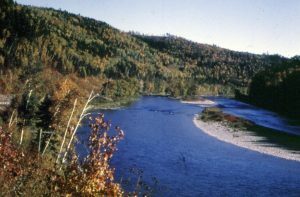 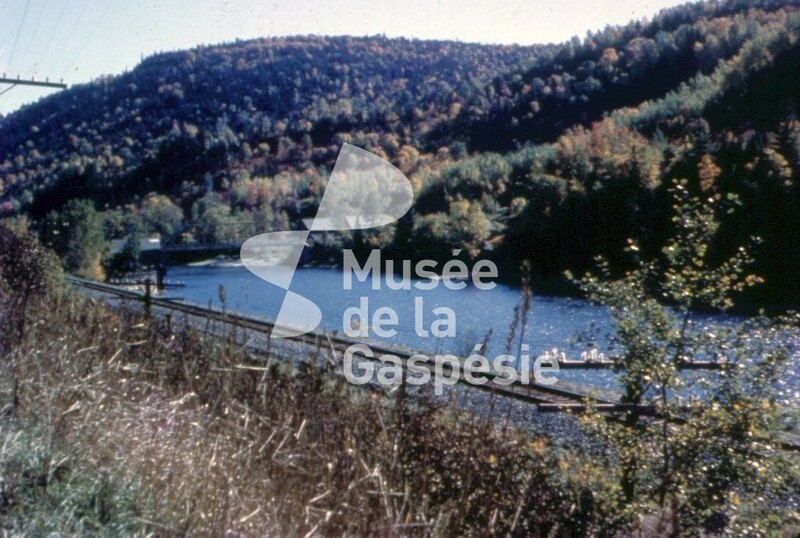 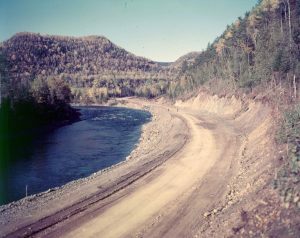 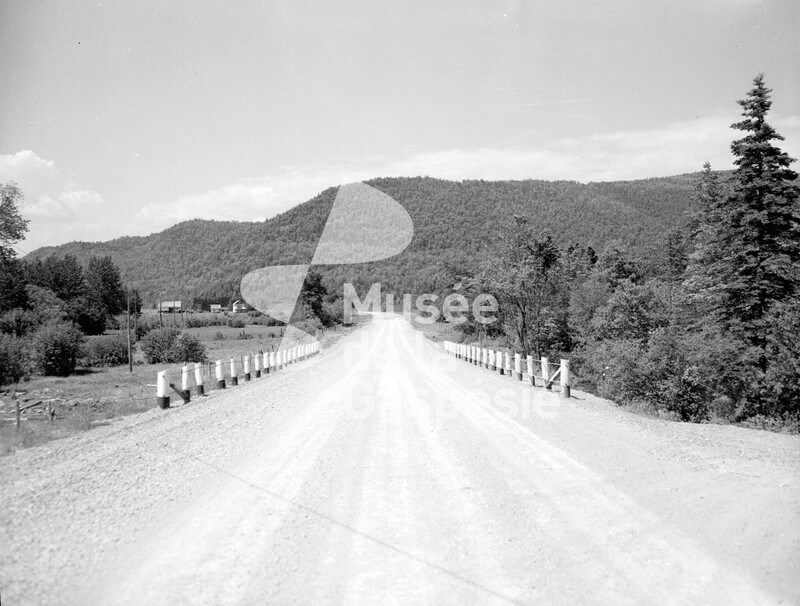 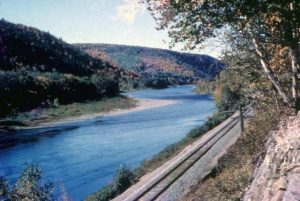 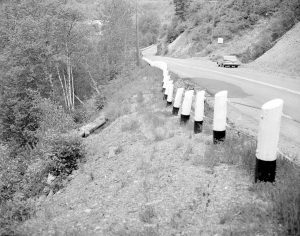 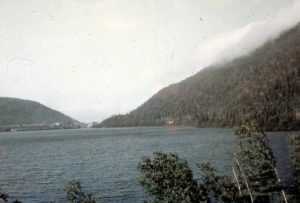 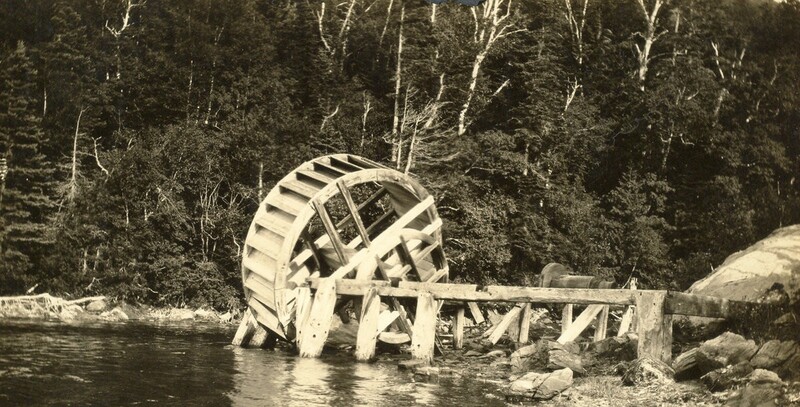 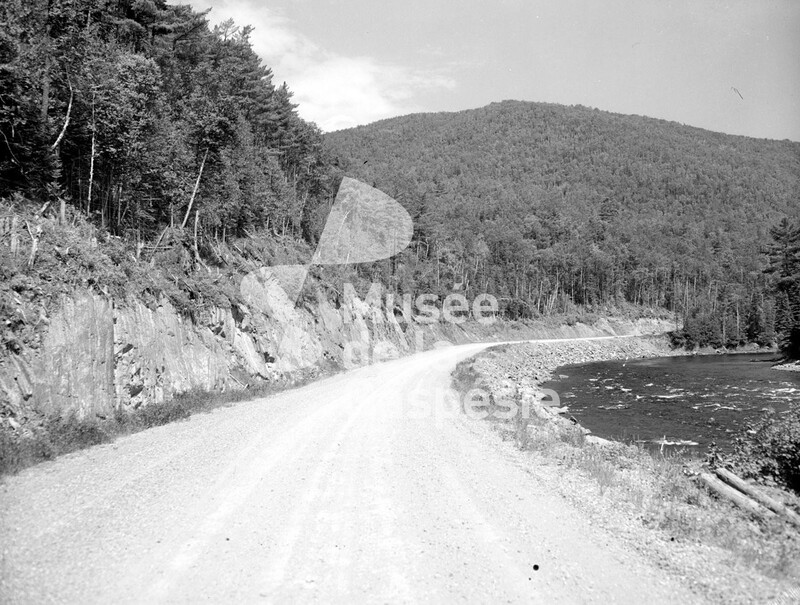 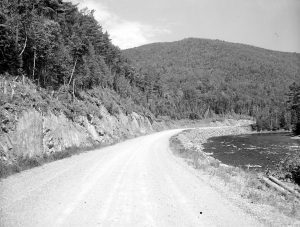 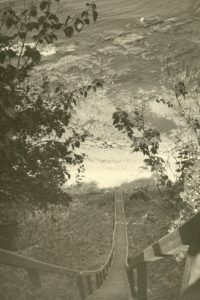 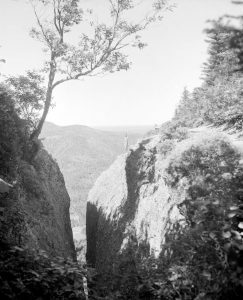 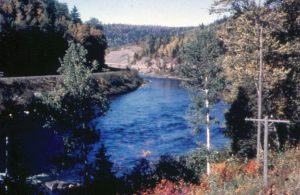 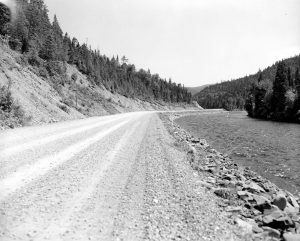 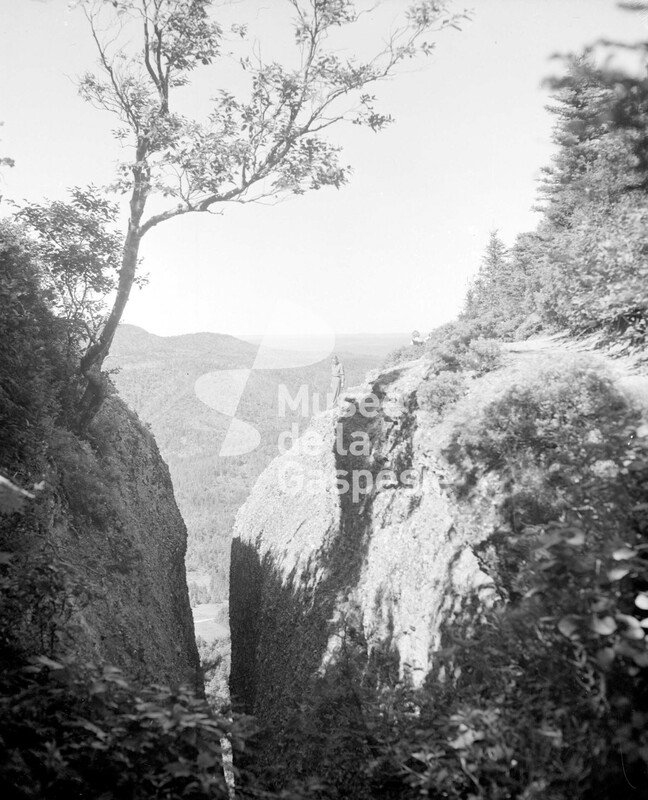 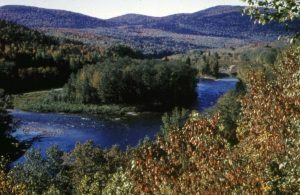 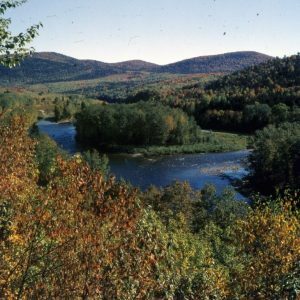 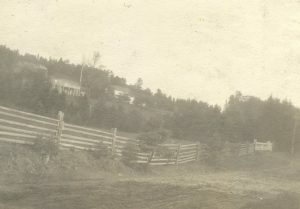 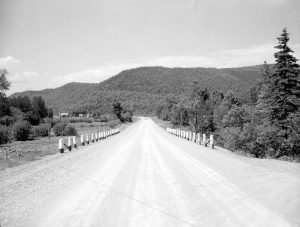 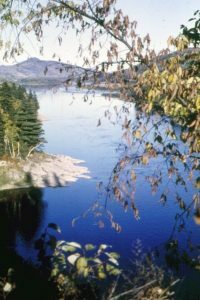 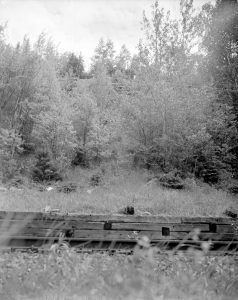 Photograph of the railroad and the road alongside the Restigouche river. 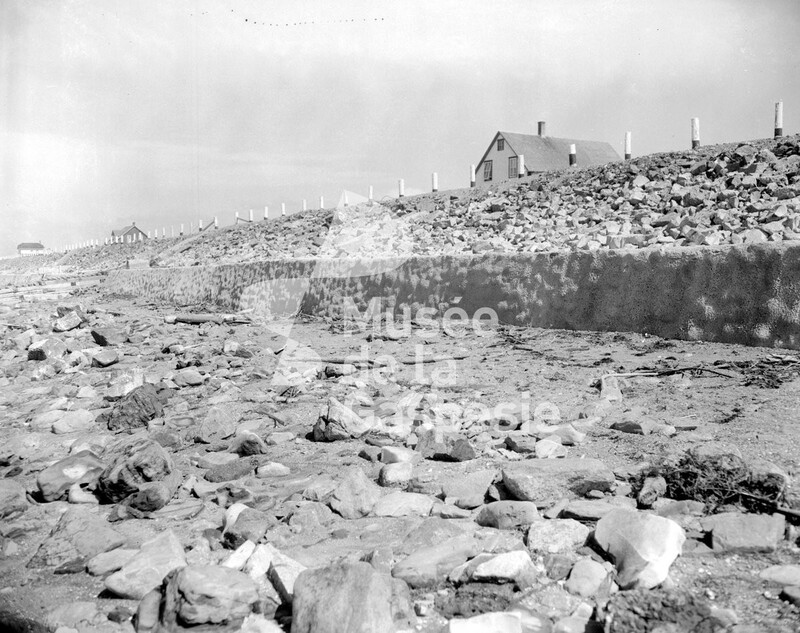 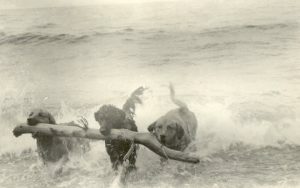 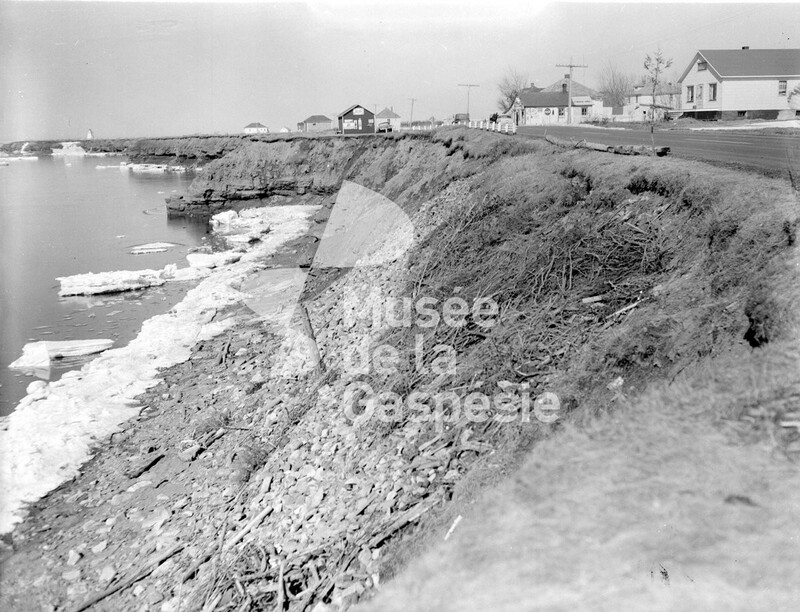 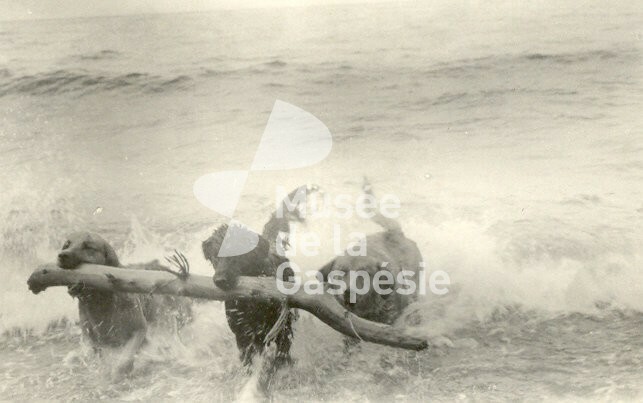 Souvenir photograph of waves in Baie-des-Chaleurs. 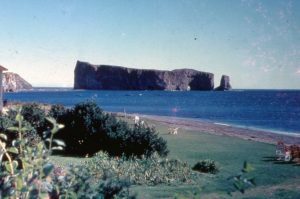 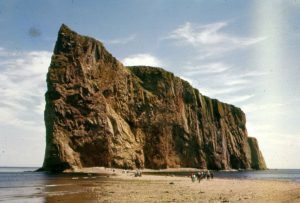 Photograph of Percé Rock and Mont-Joli, seen from the North beach. 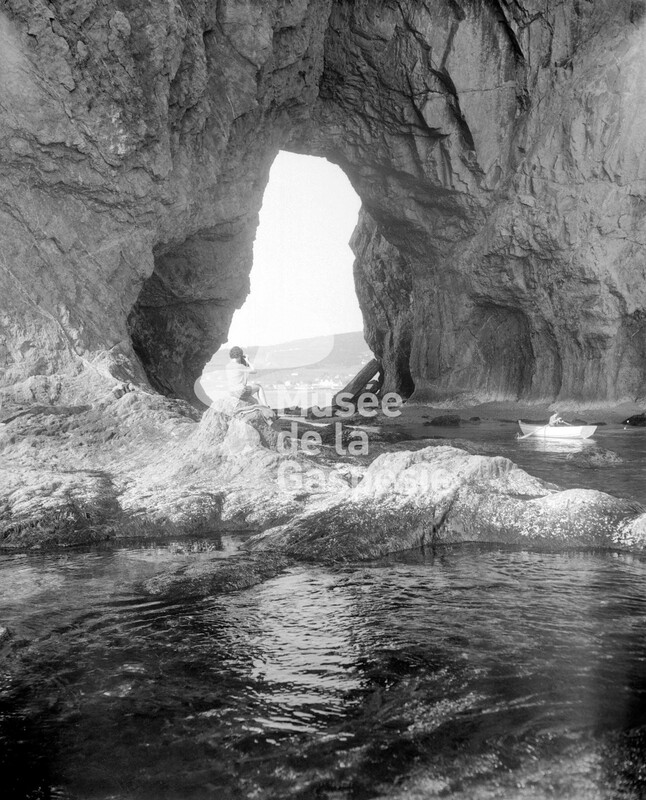 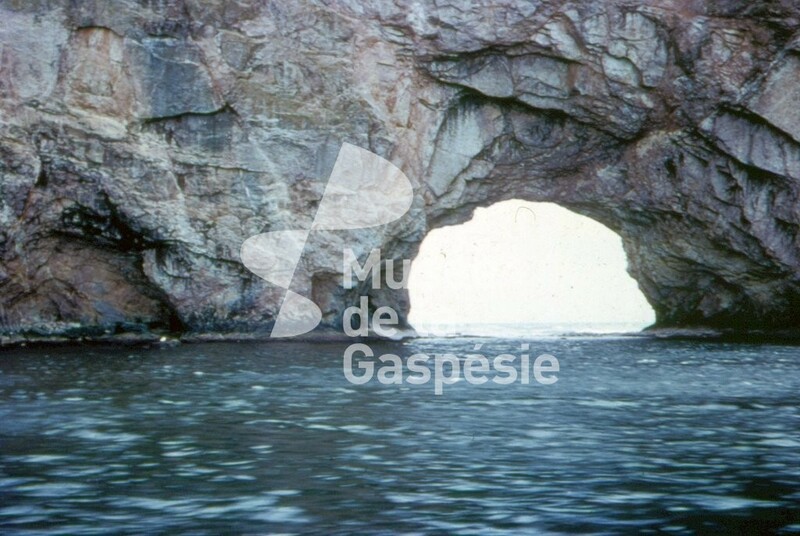 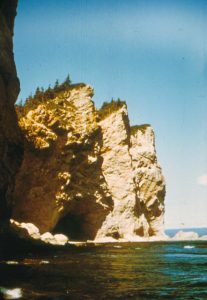 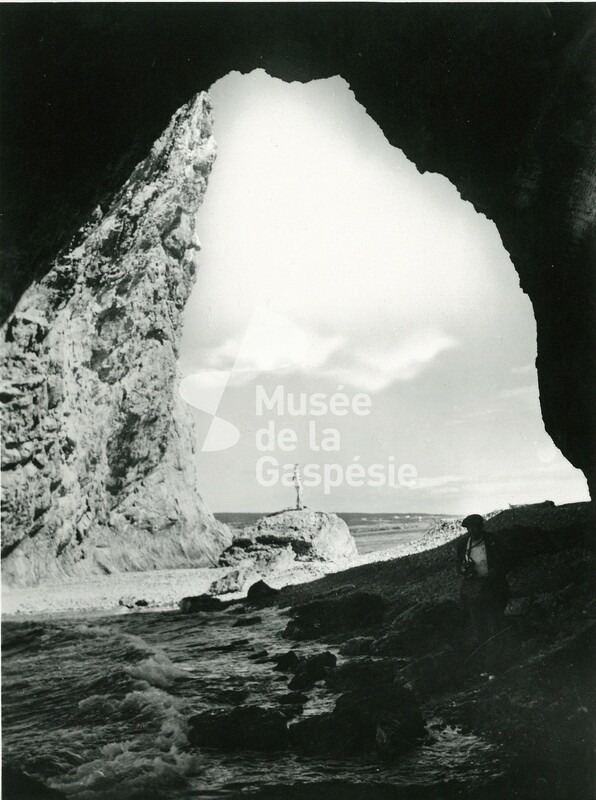 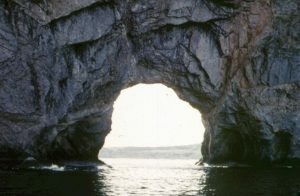 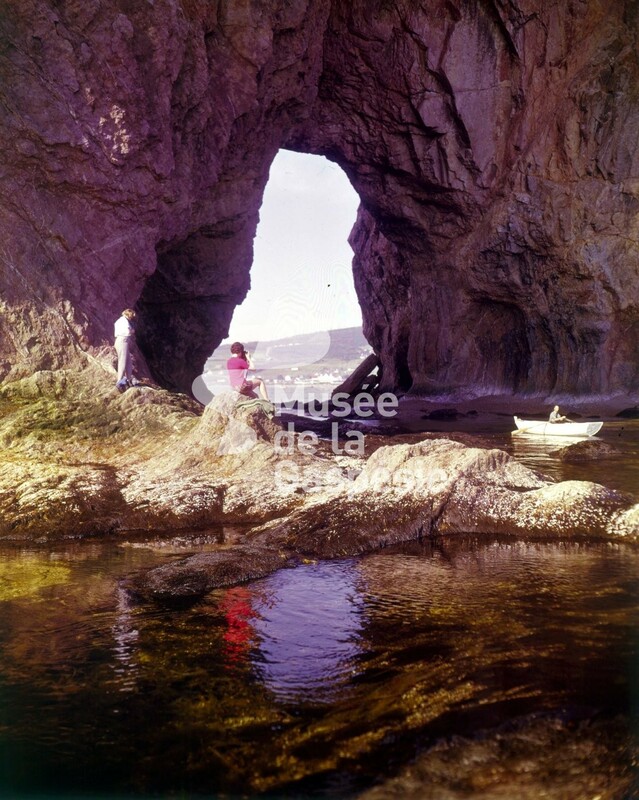 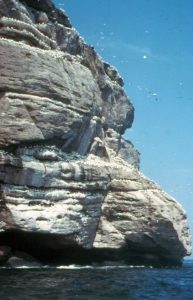 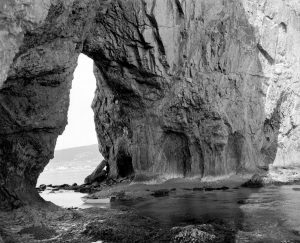 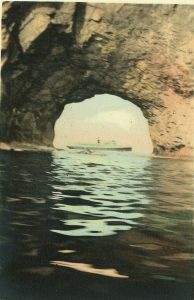 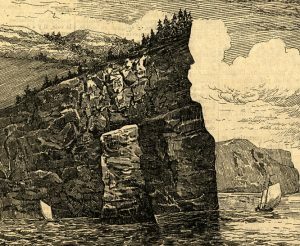 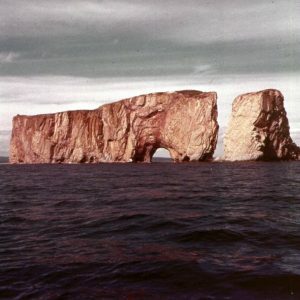 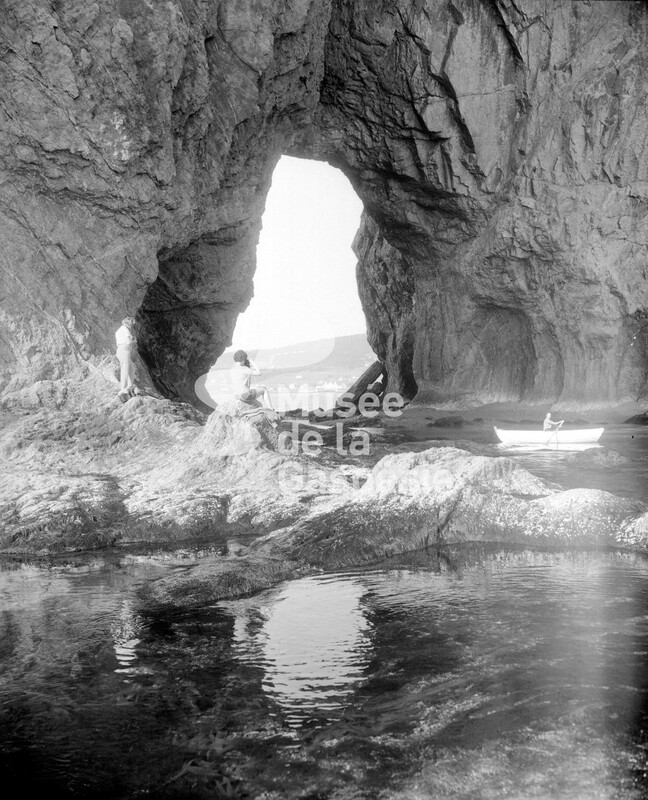 Photograph of the Percé Rock arch. 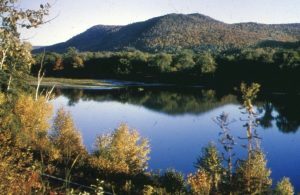 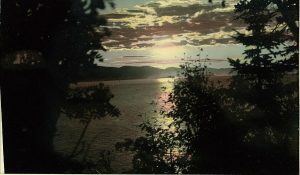 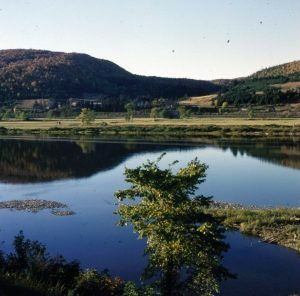 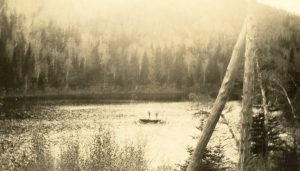 Photograph of a sunset over the Restigouche river. 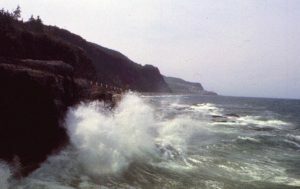 Photograph of waves and stones at water’s edge. 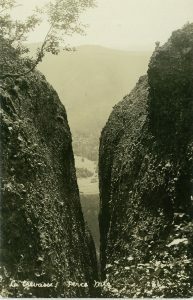 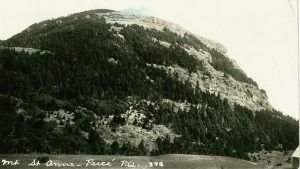 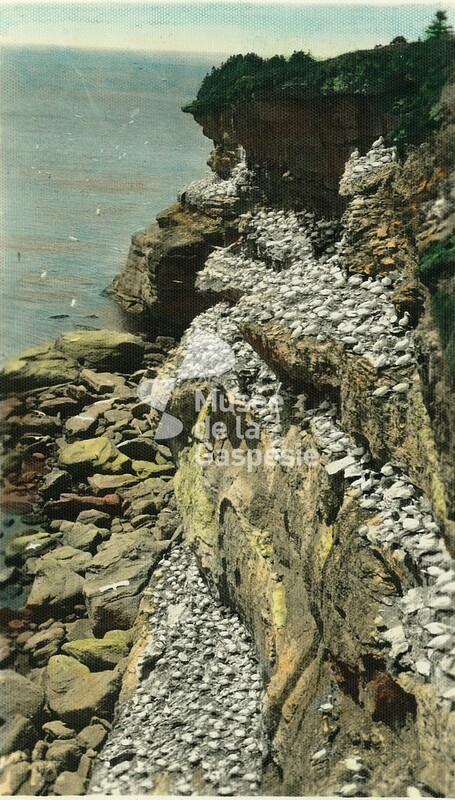 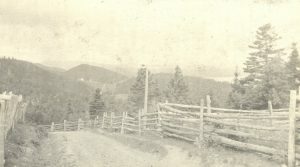 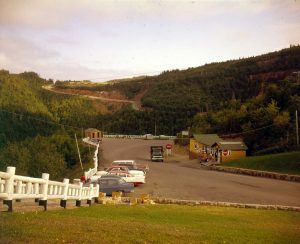 Postcard of a mountain road at the edge of the cliffs. 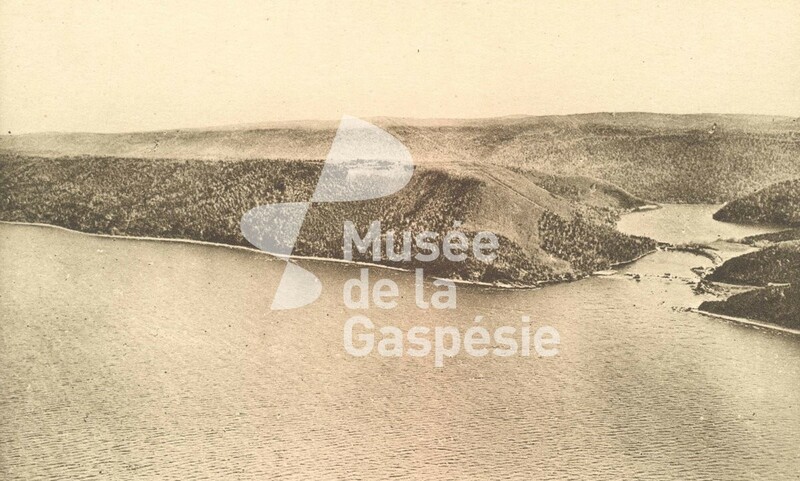 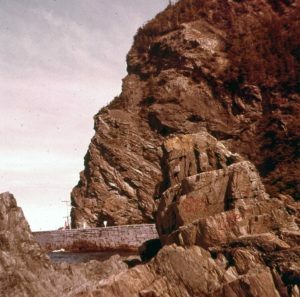 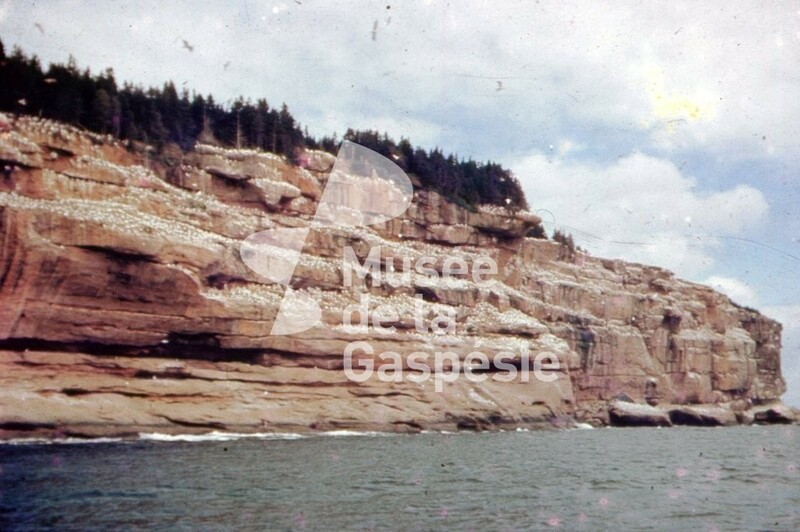 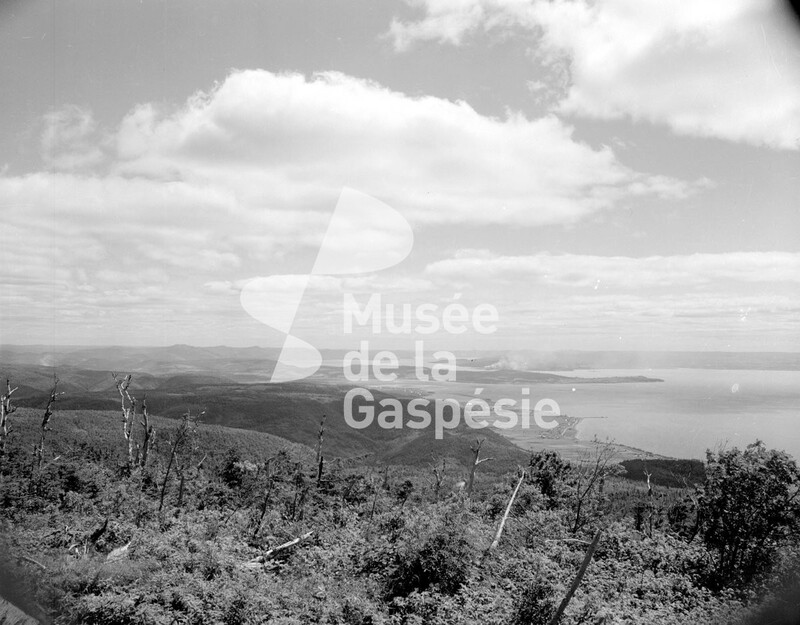 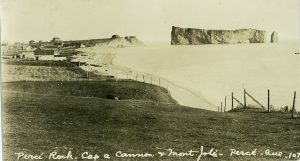 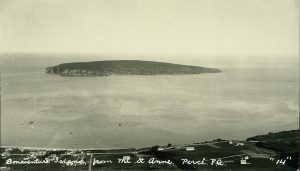 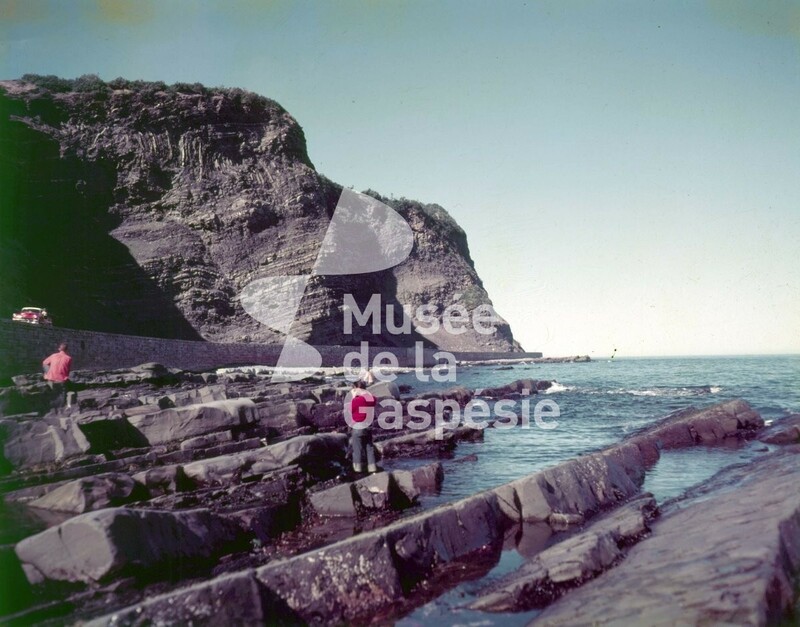 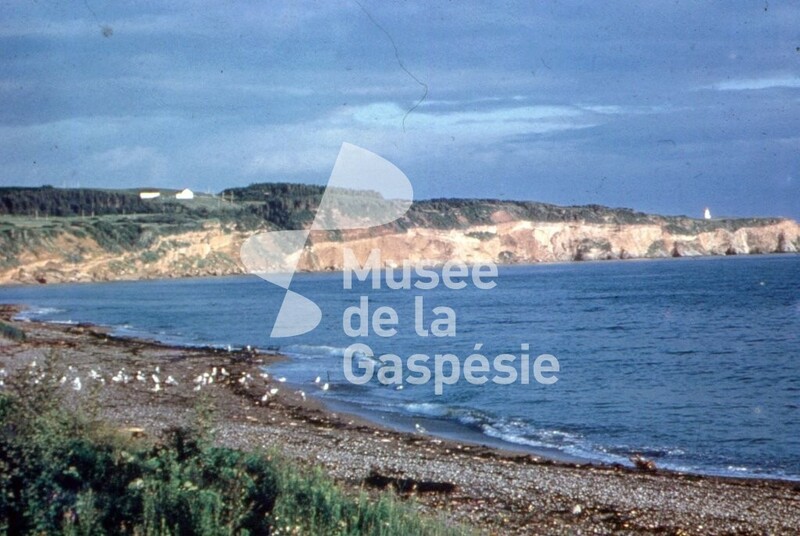 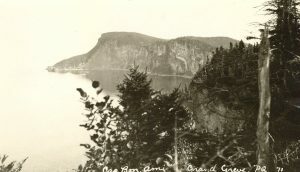 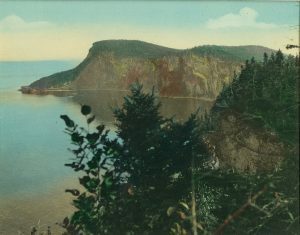 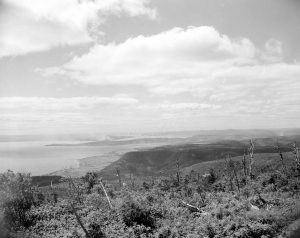 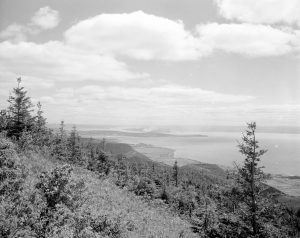 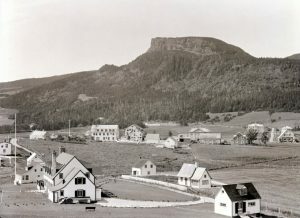 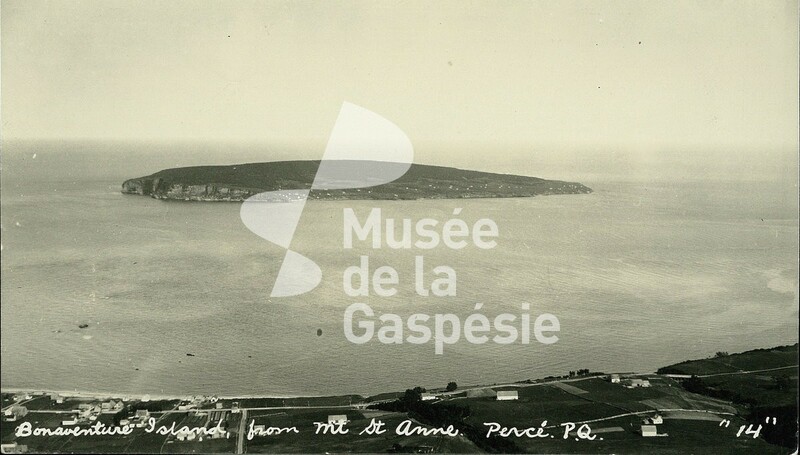 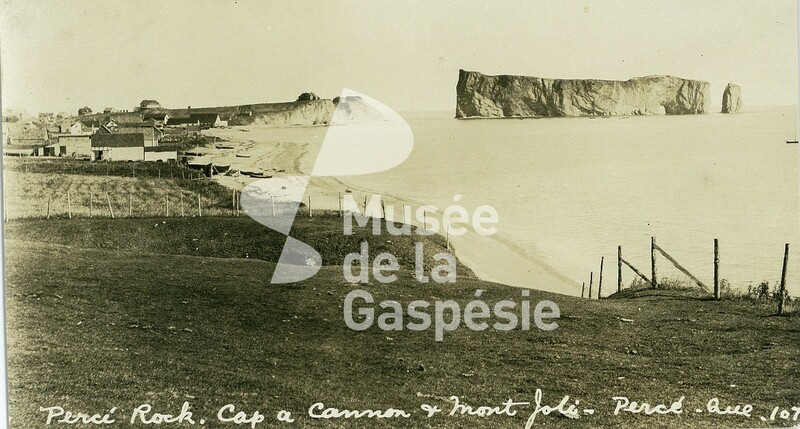 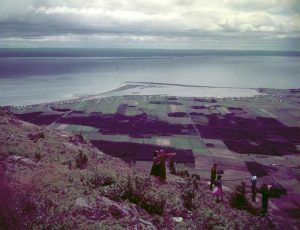 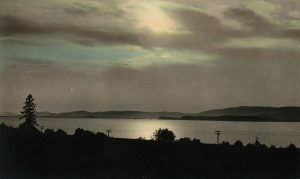 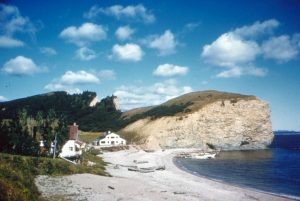 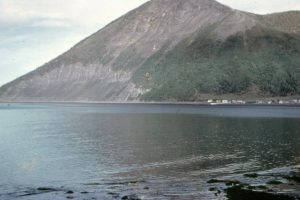 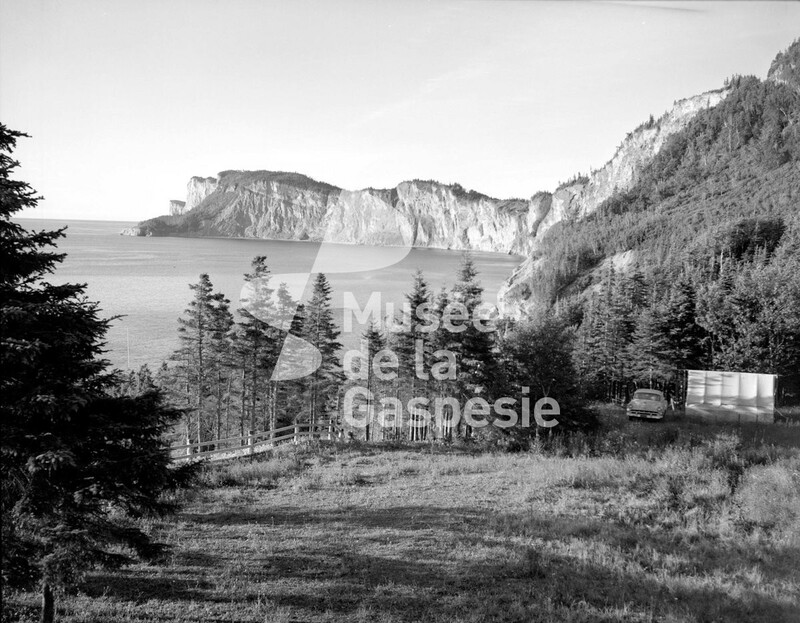 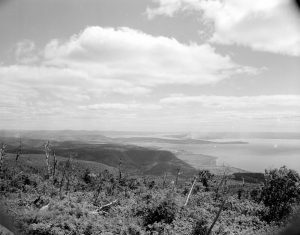 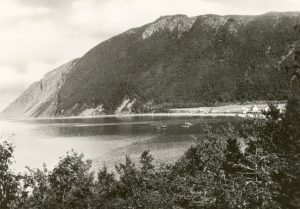 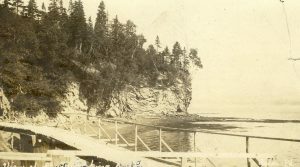 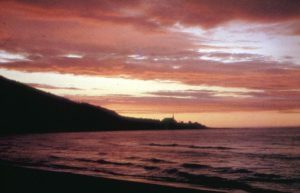 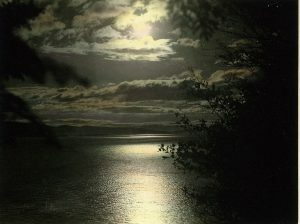 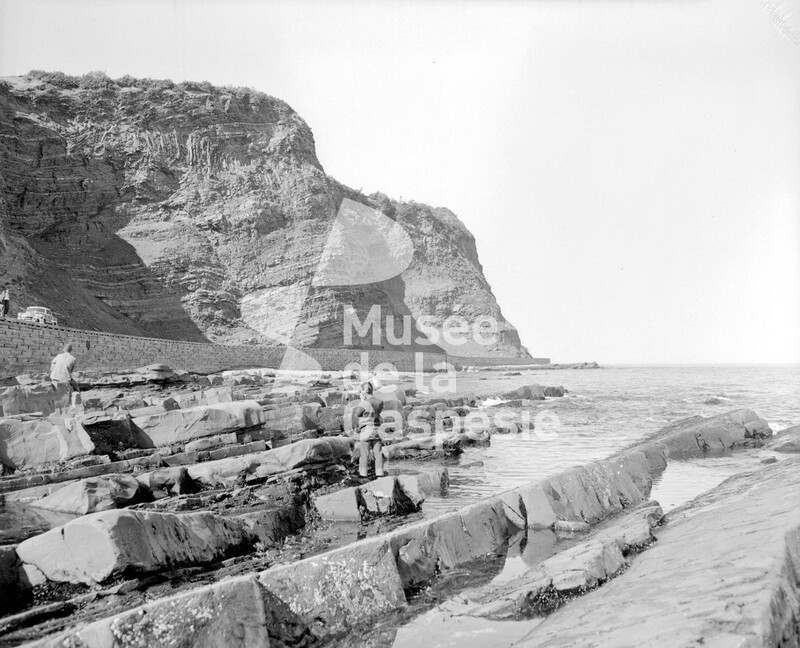 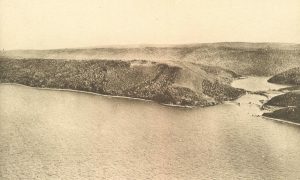 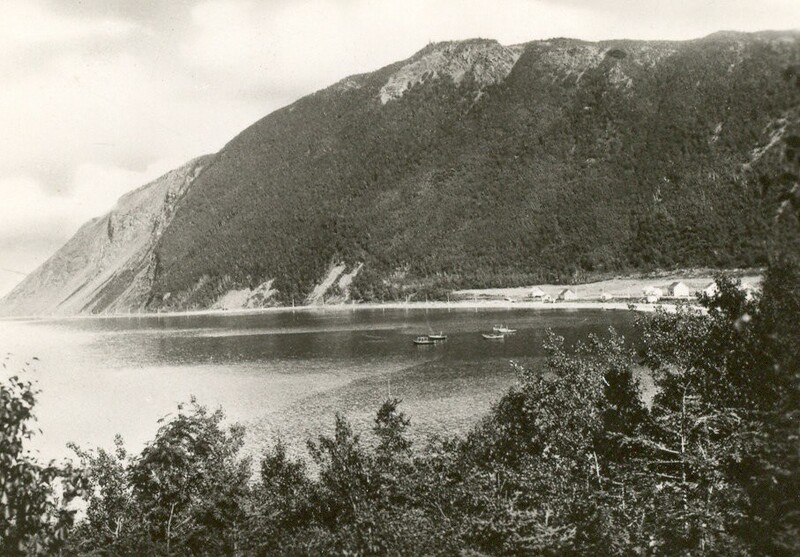 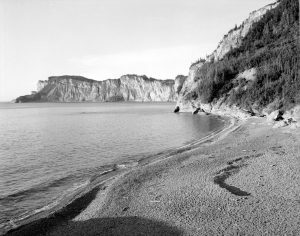 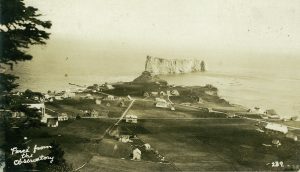 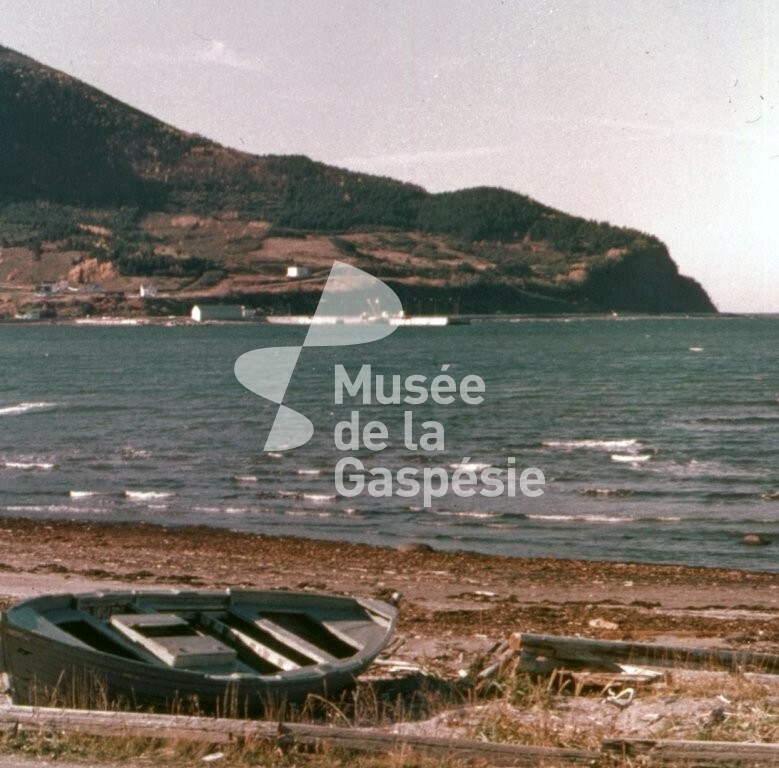 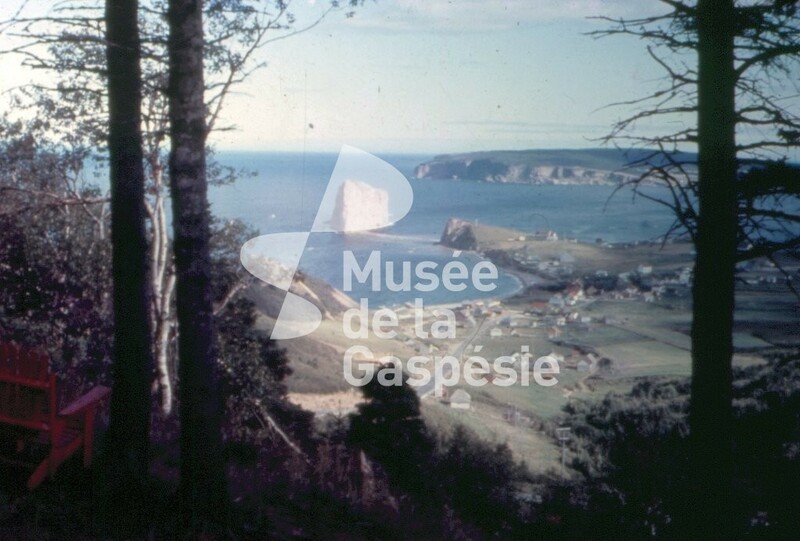 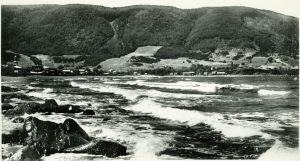 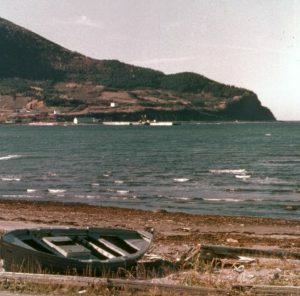 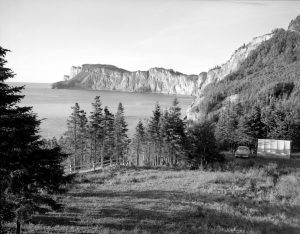 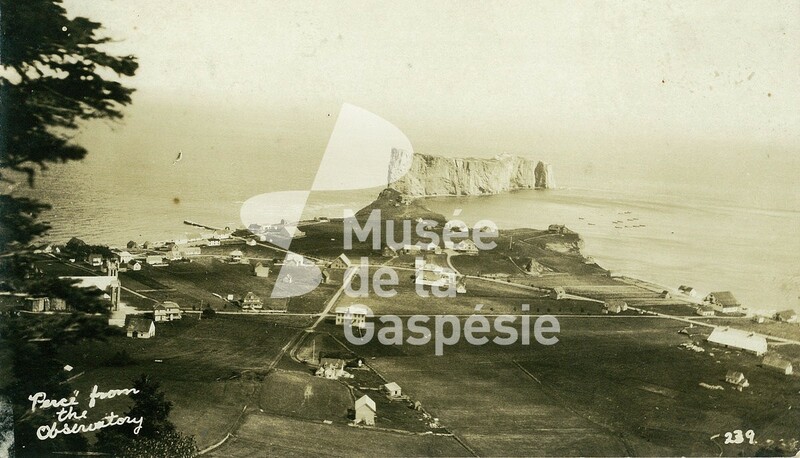 Photograph of Cap-Gaspé, from Cap Bon-Ami. 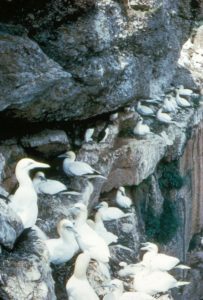 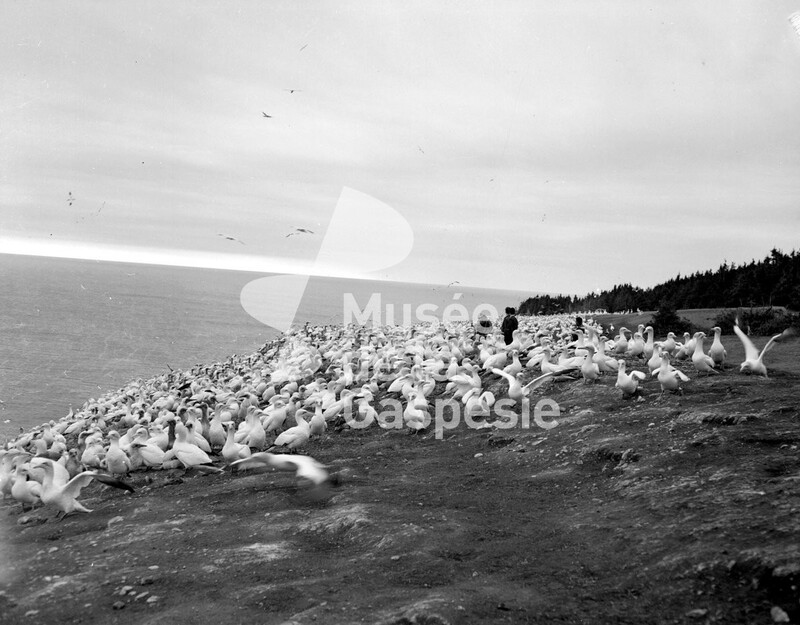 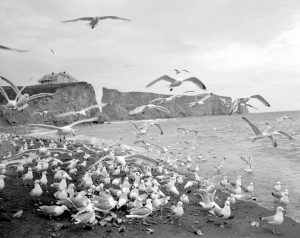 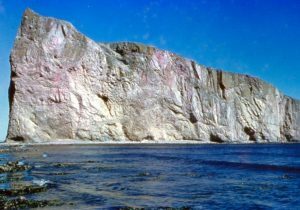 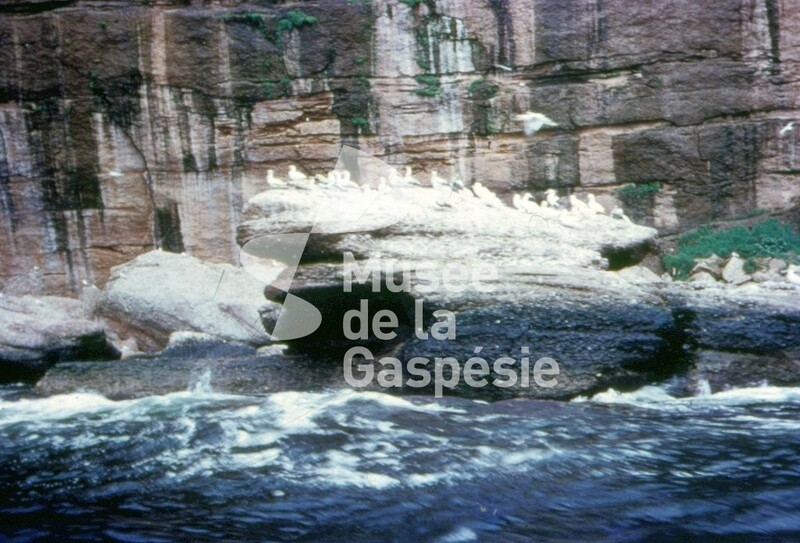 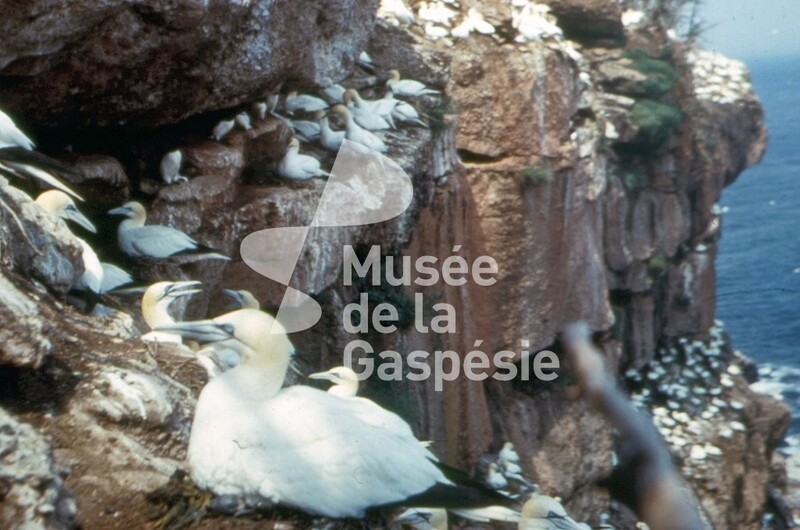 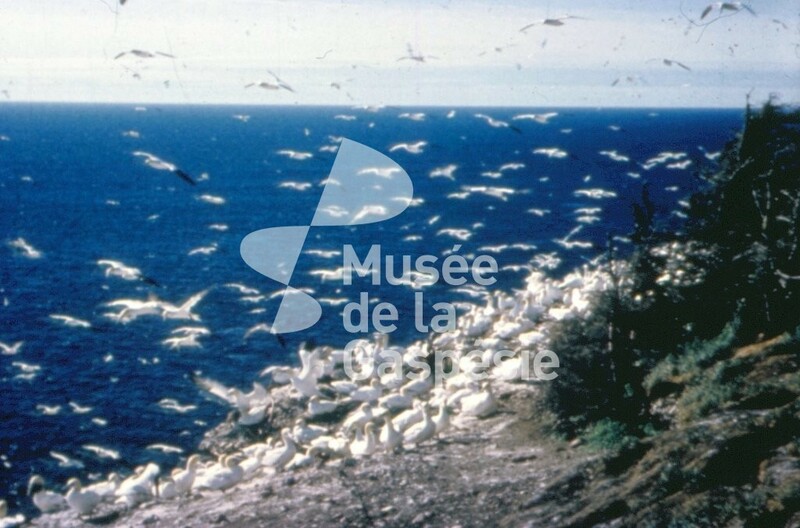 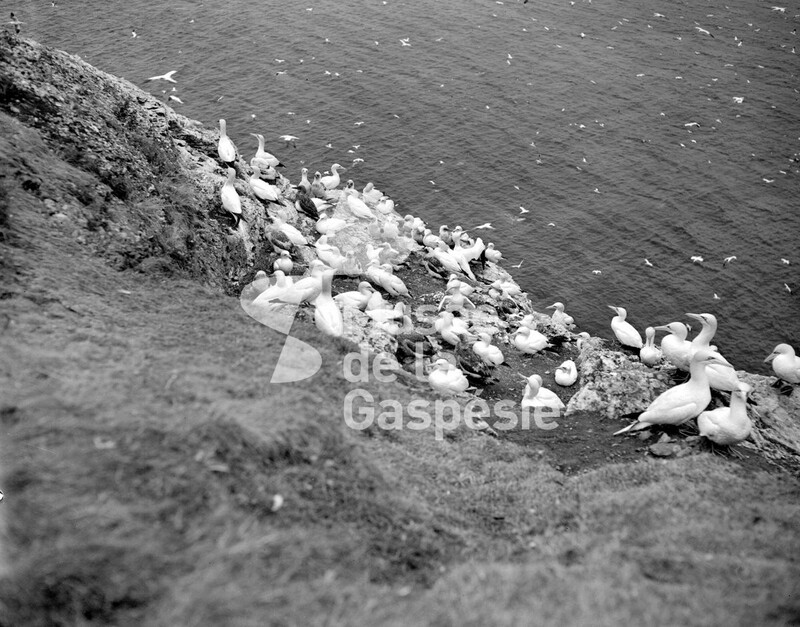 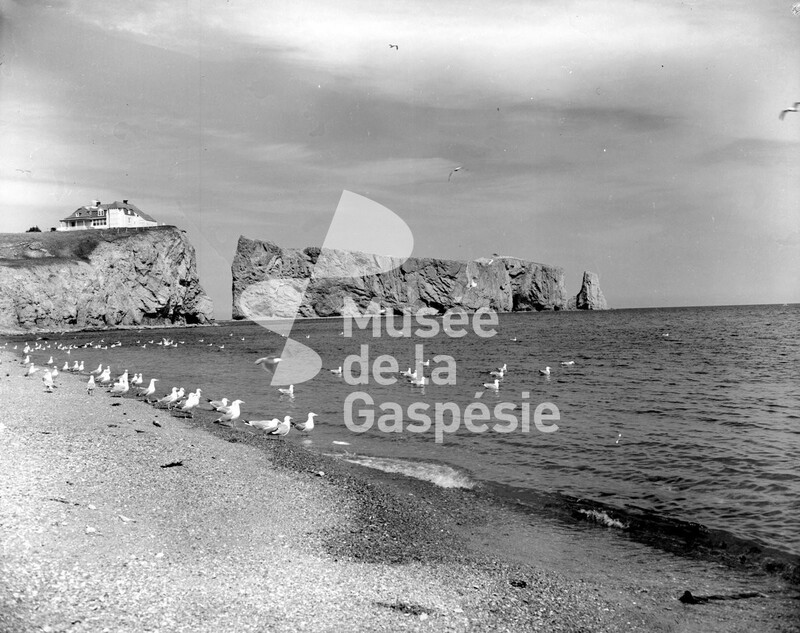 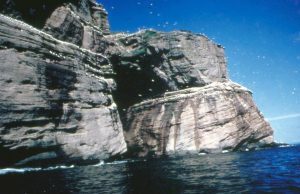 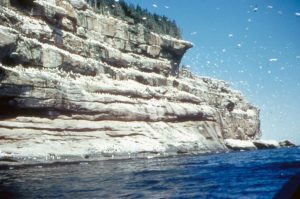 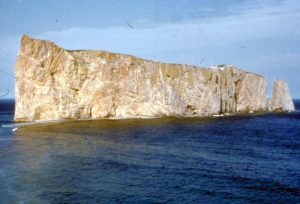 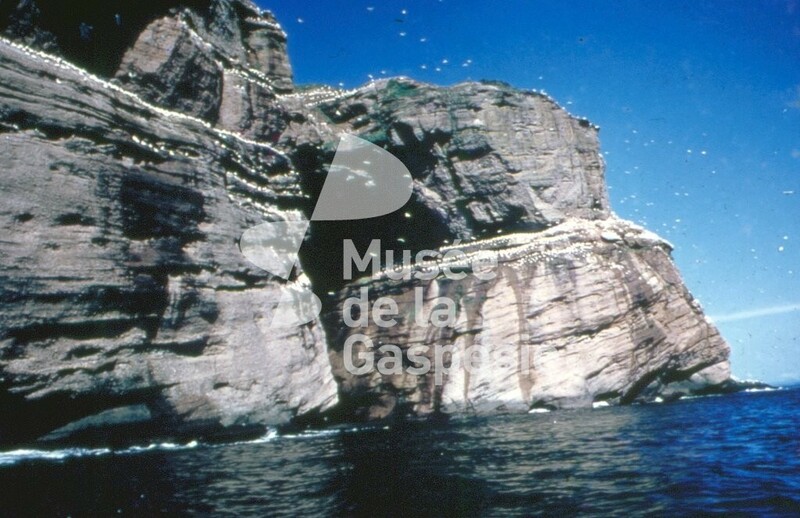 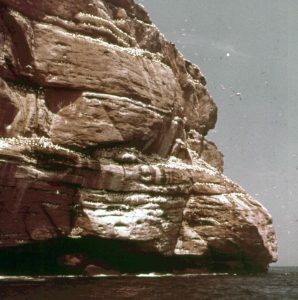 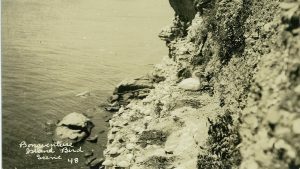 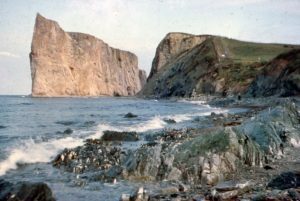 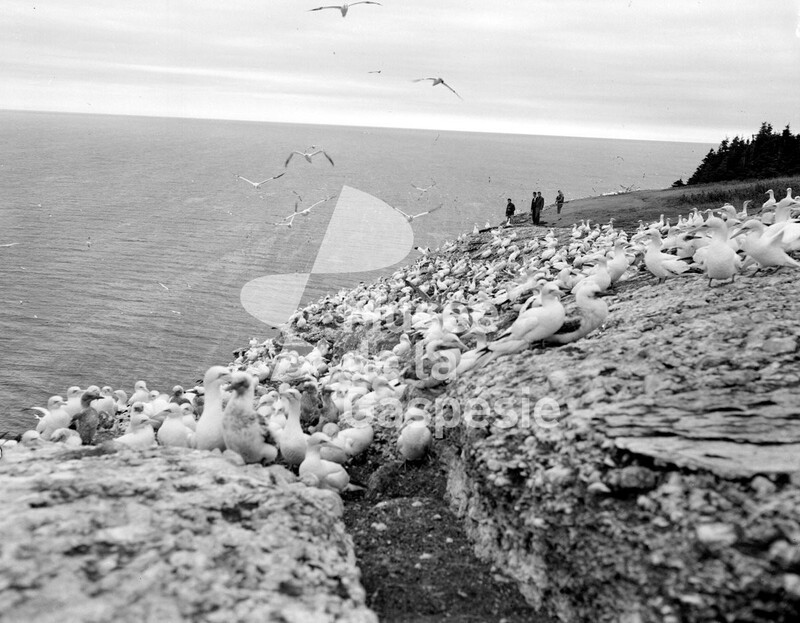 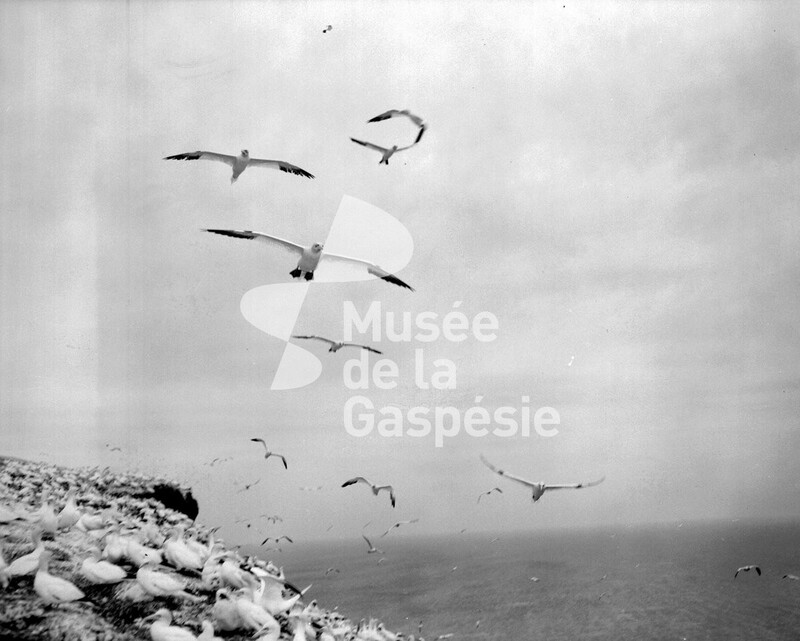 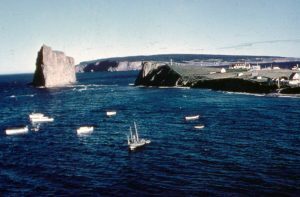 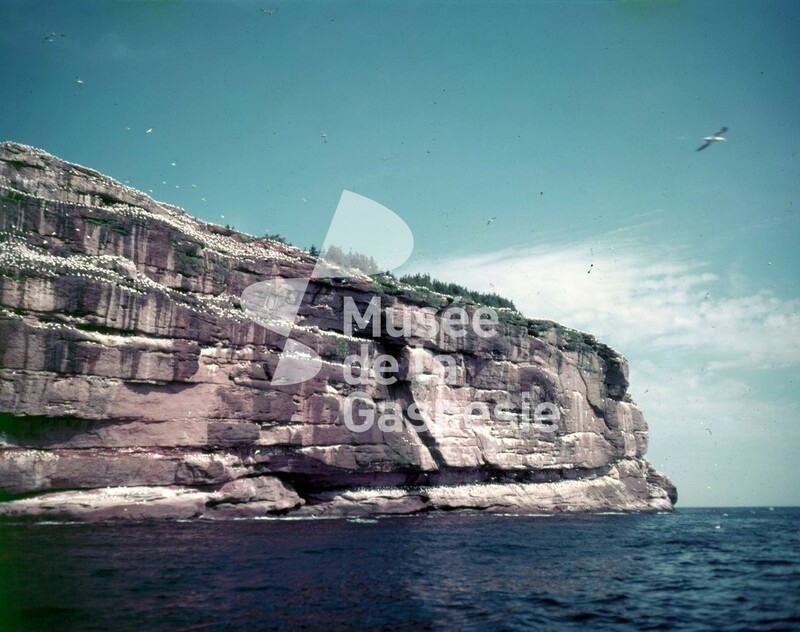 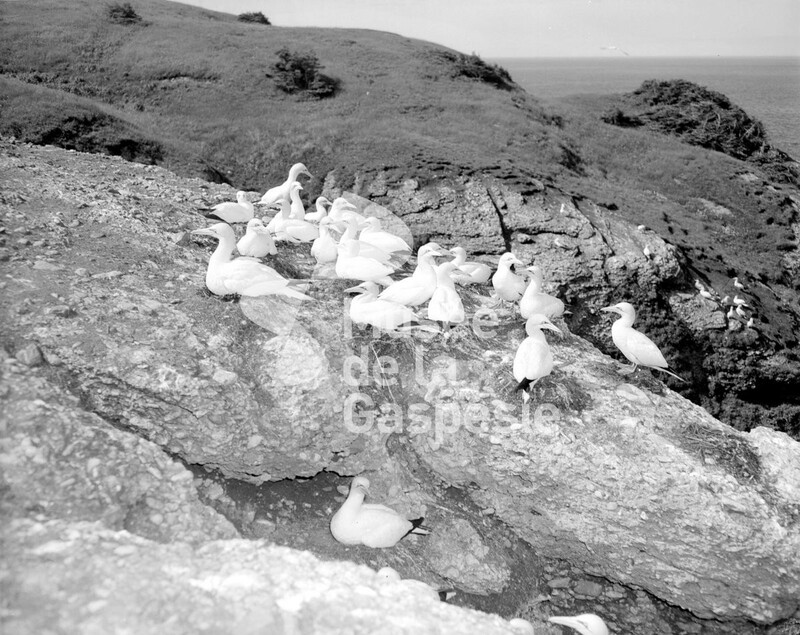 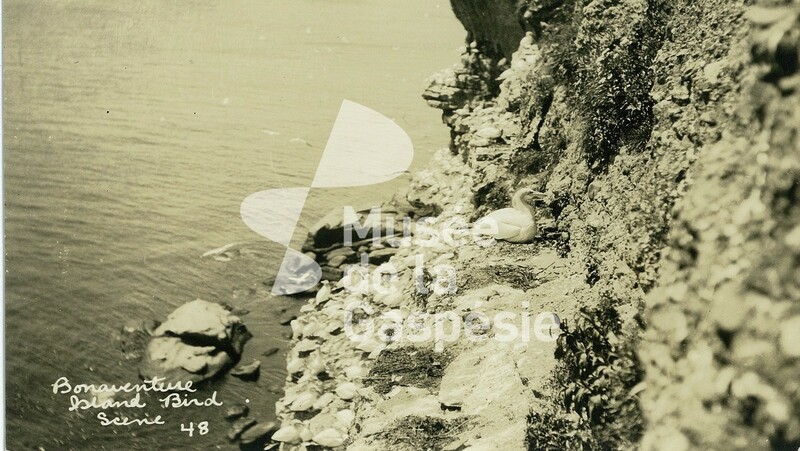 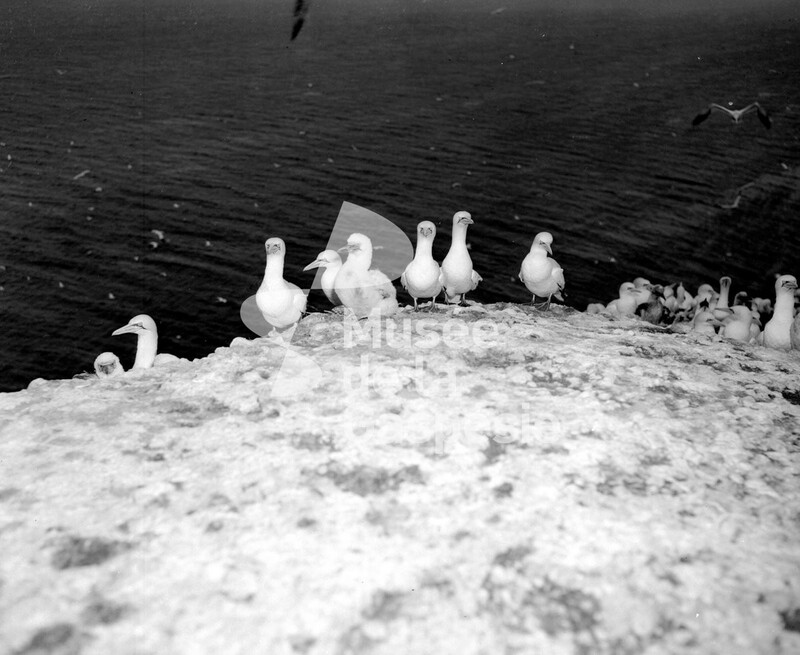 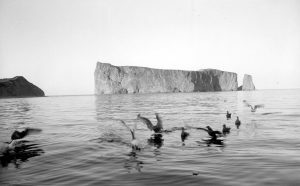 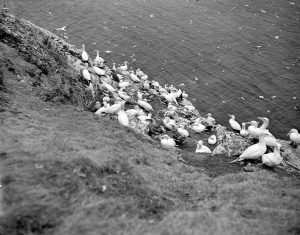 Photograph of northern gannets on the cliffs of Bonaventure Island in Percé. 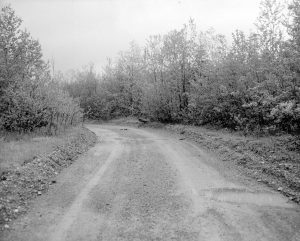 Road bordered by a palissade. L. Lambe et A. P. Low, [186-?]. 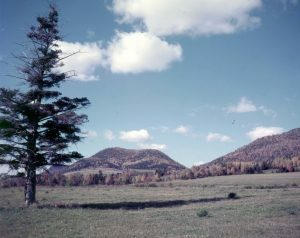 “Notre Dame or Schickshock mountains”. 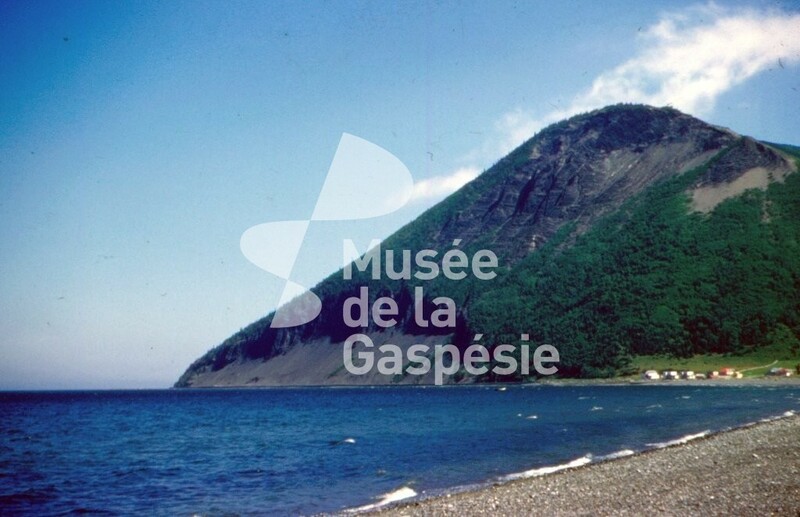 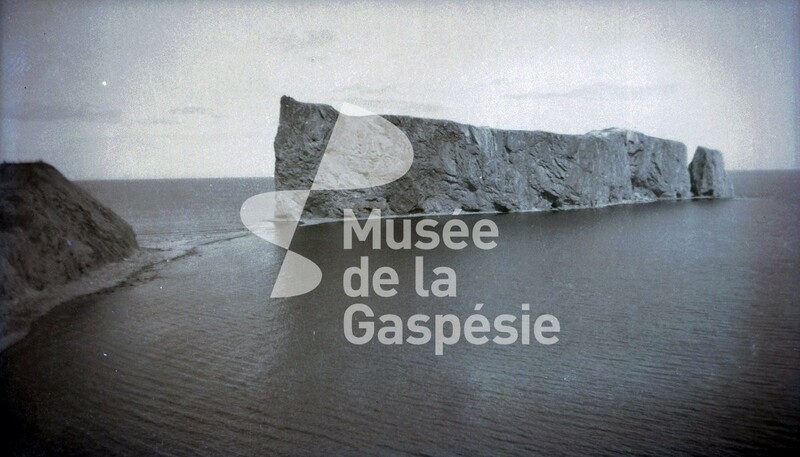 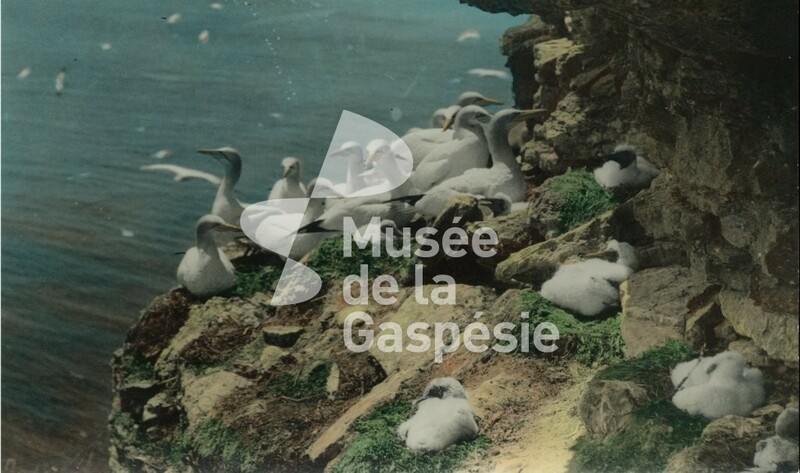 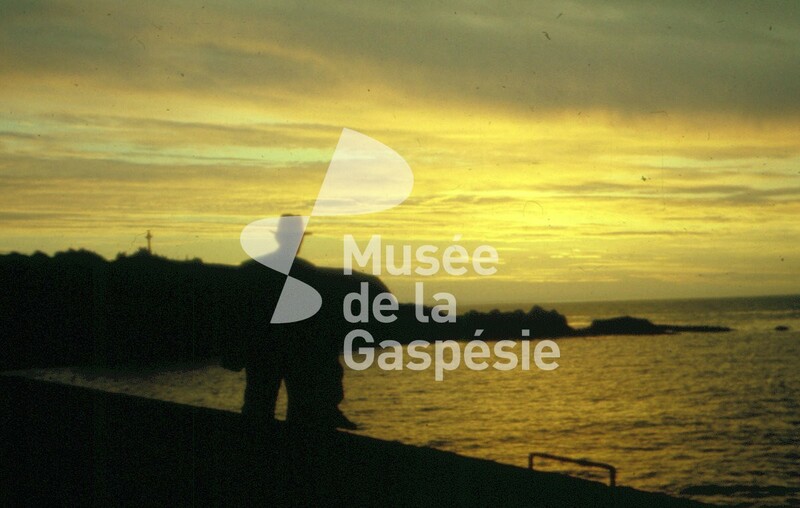 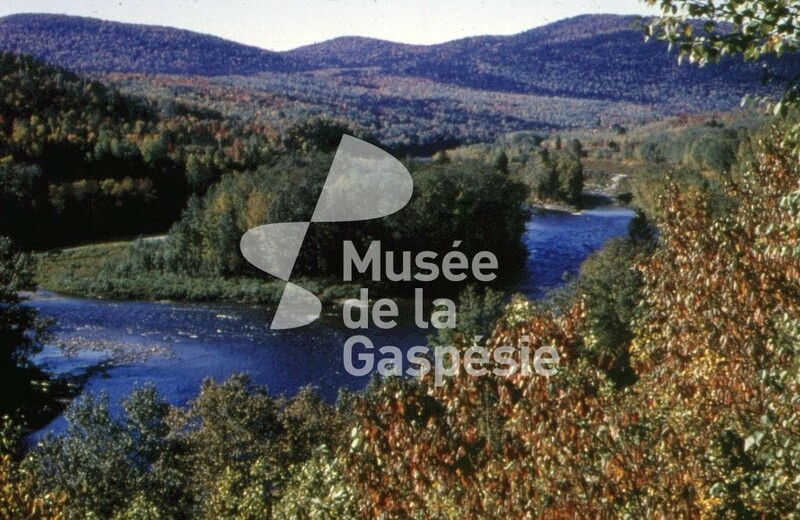 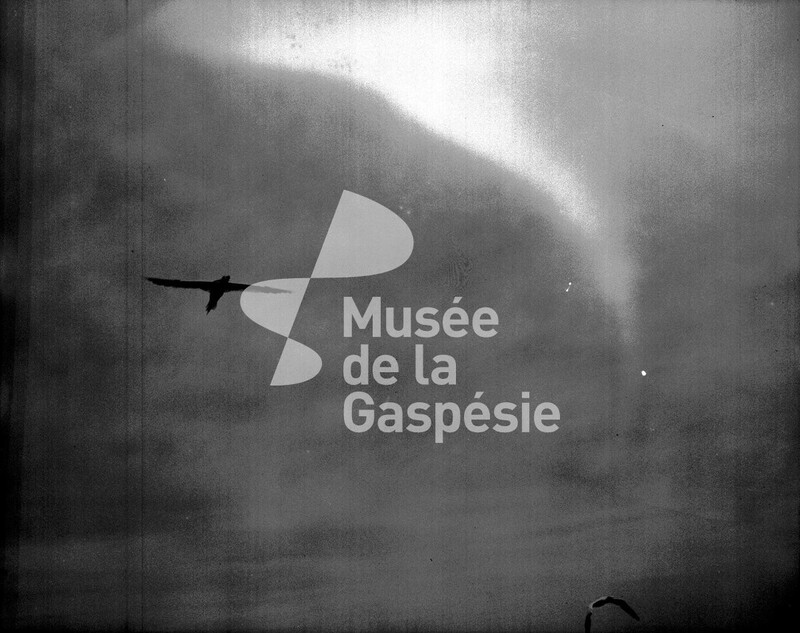 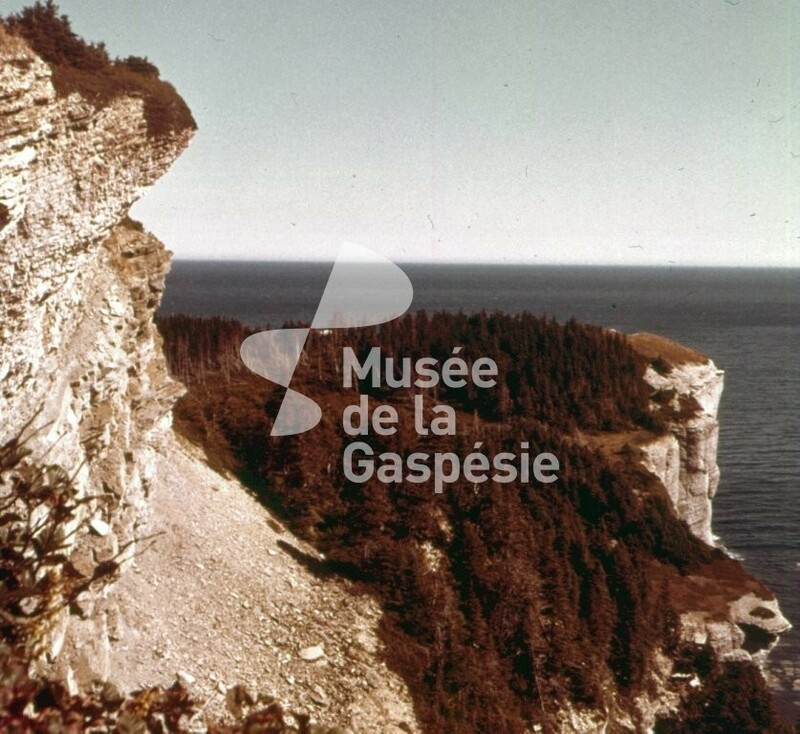 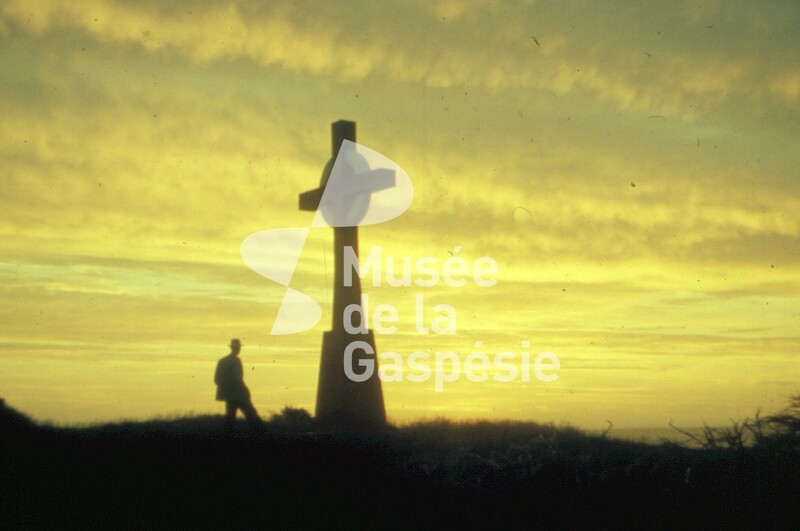 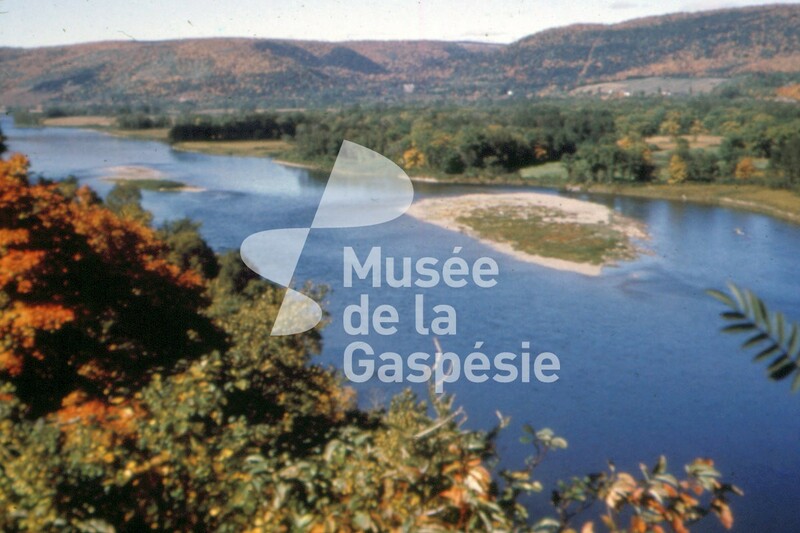 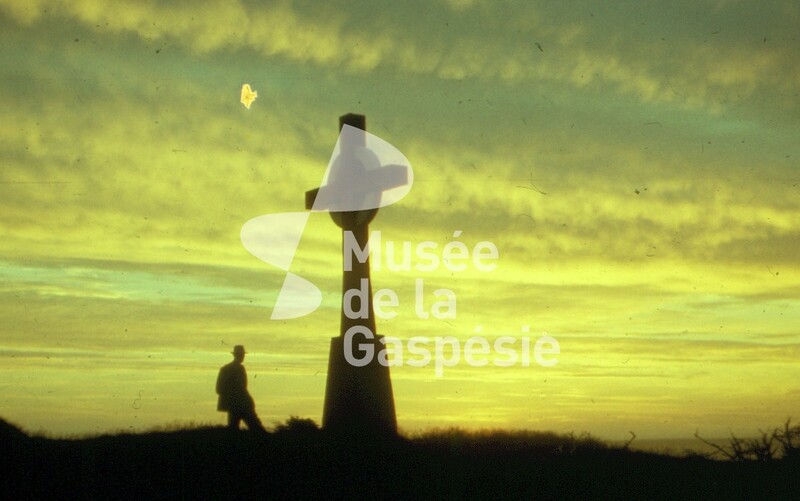 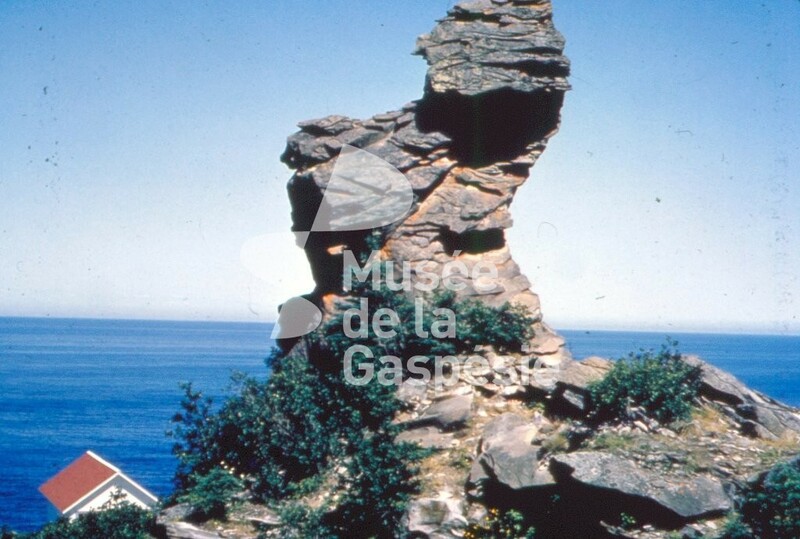 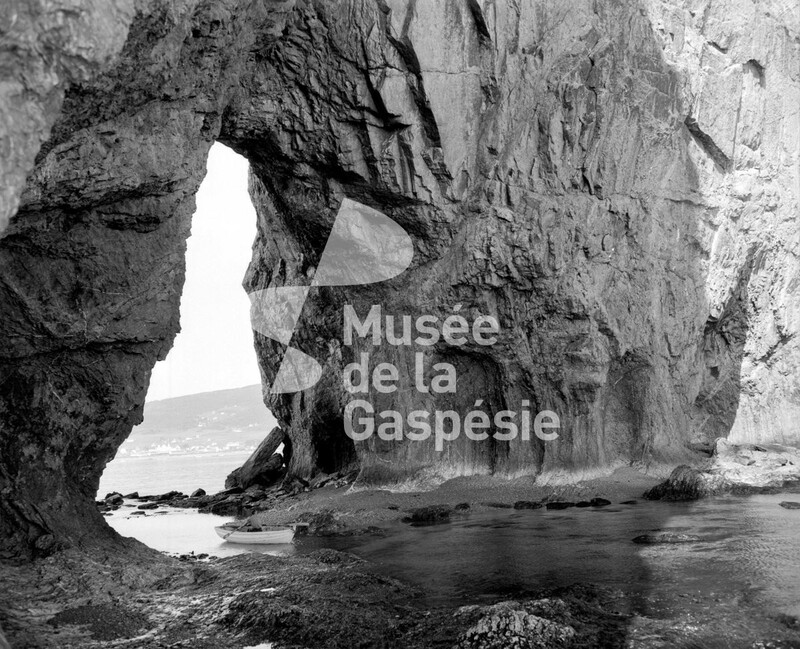 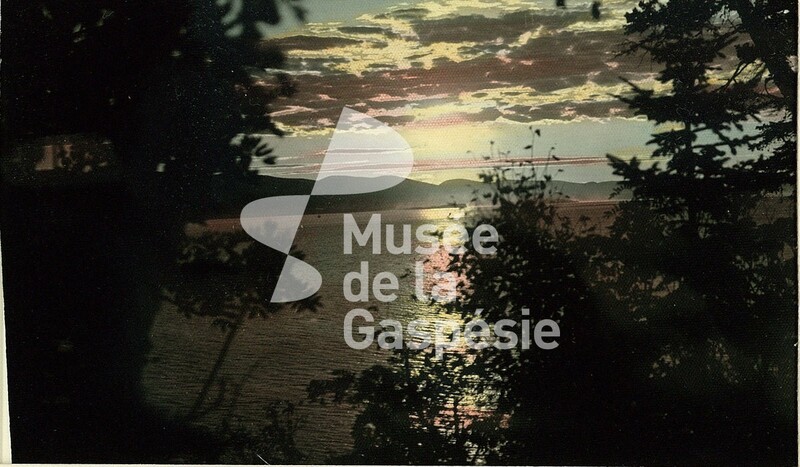 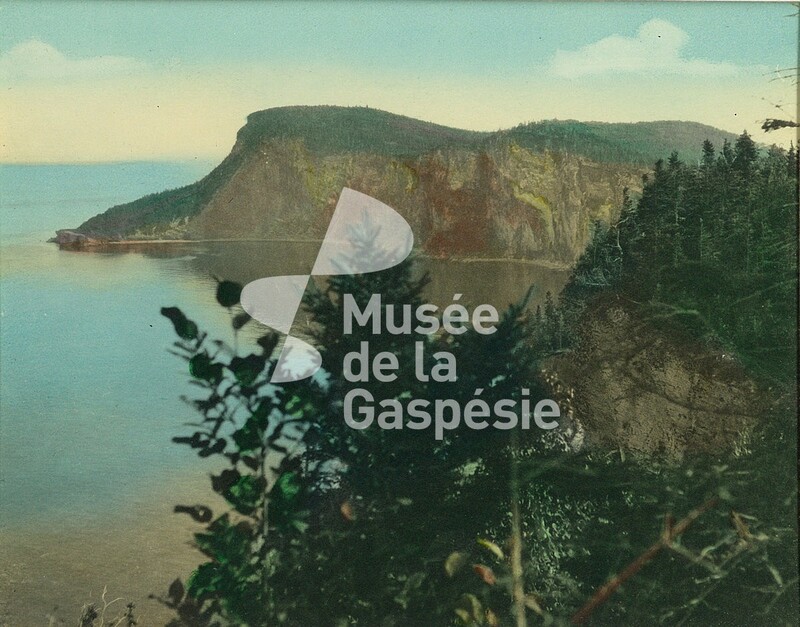 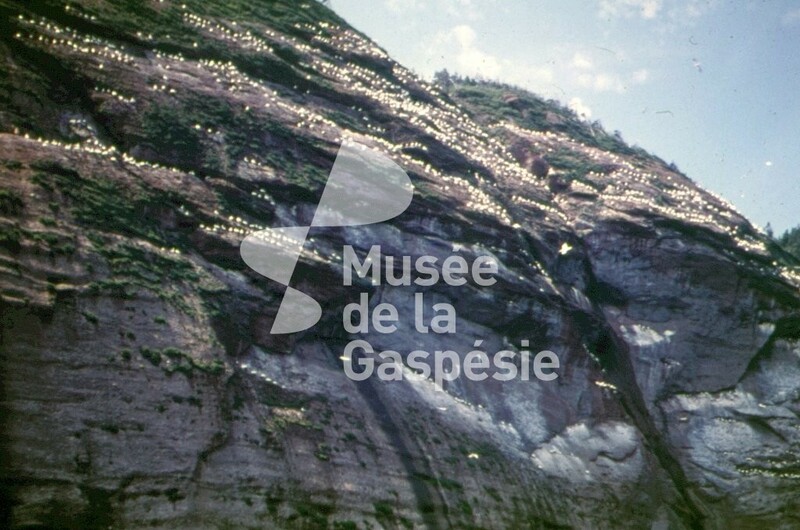 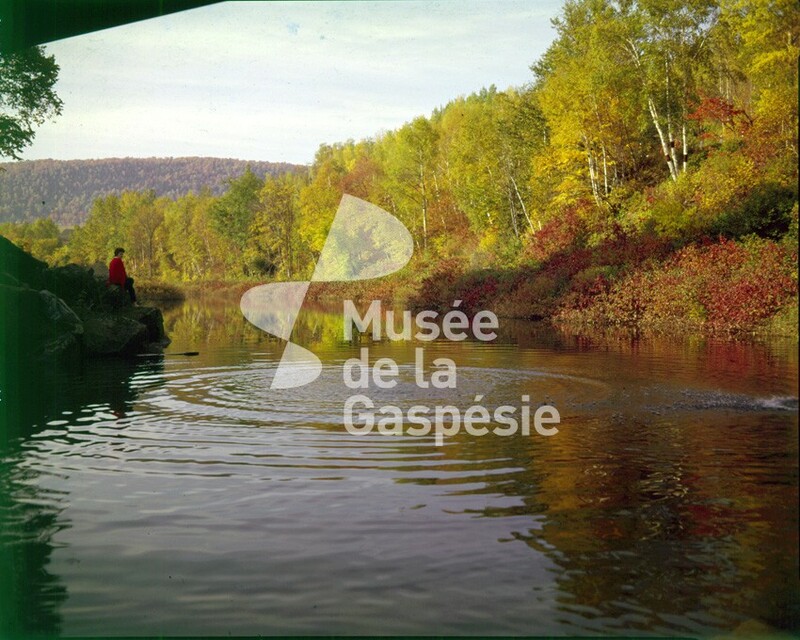 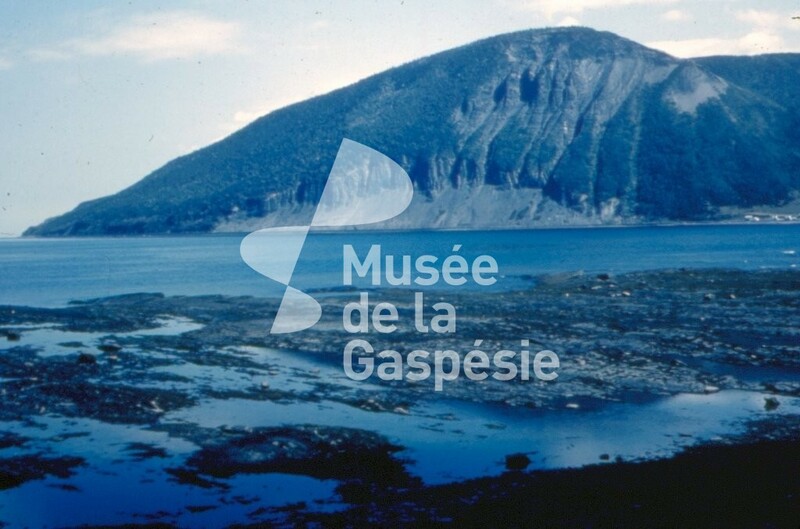 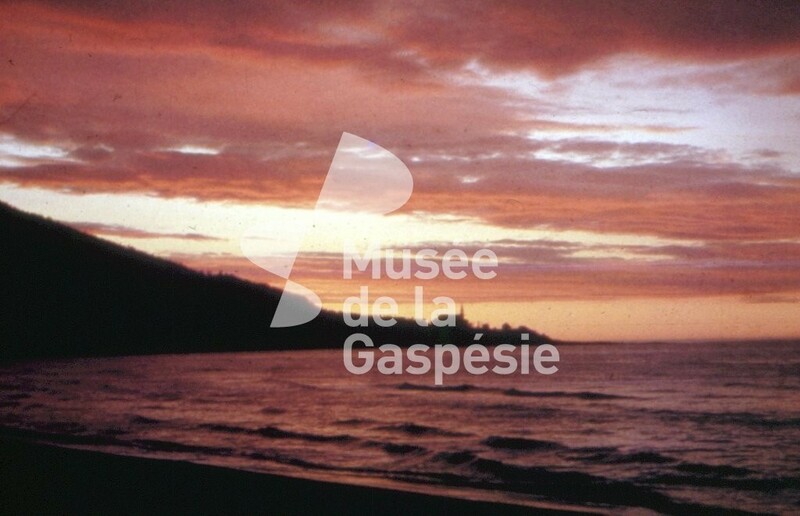 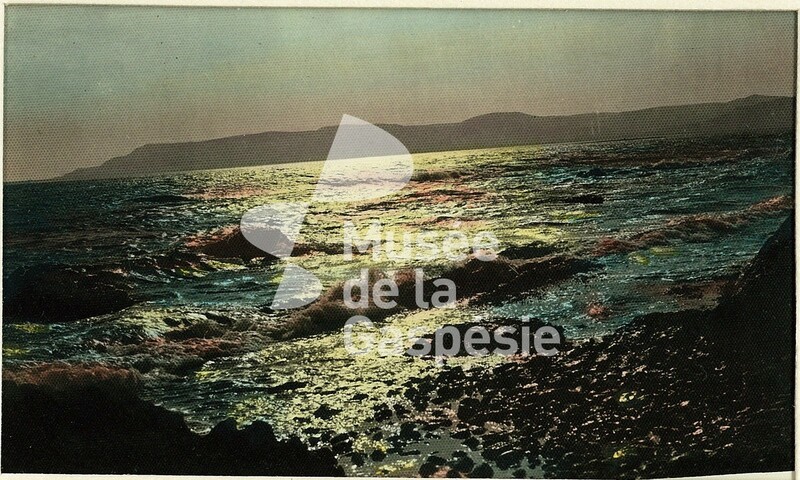 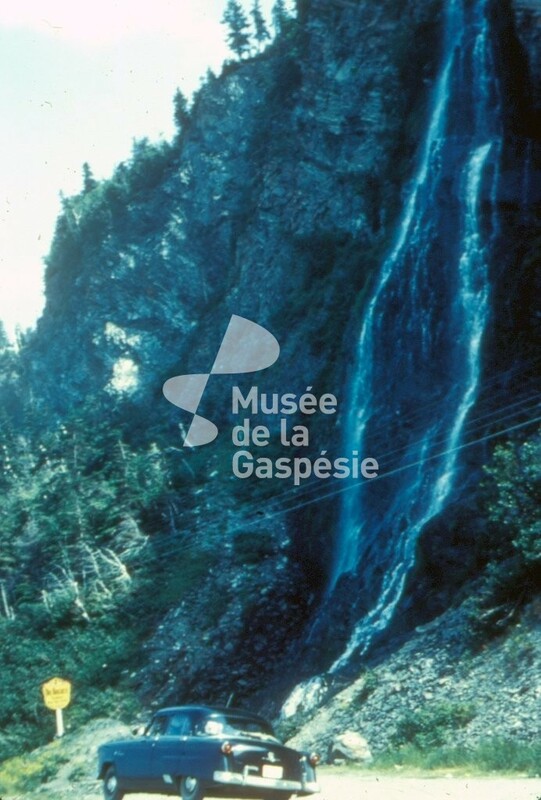 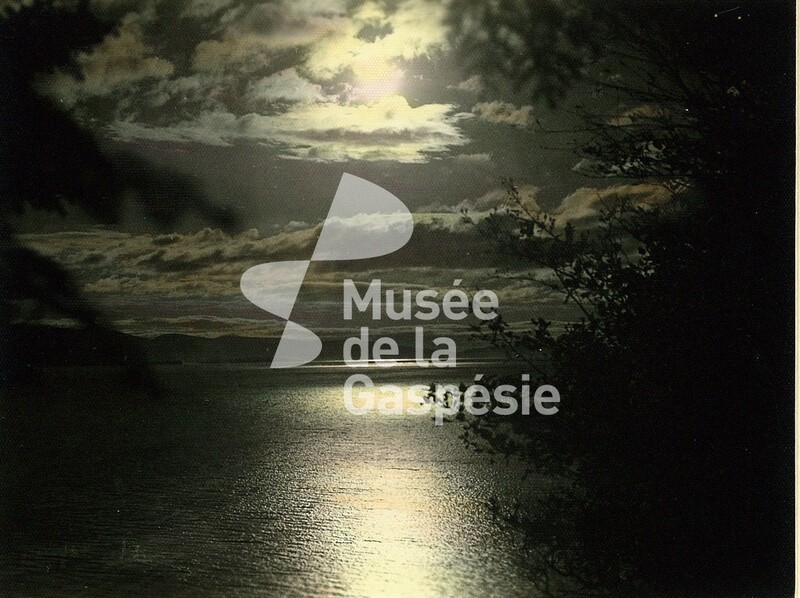 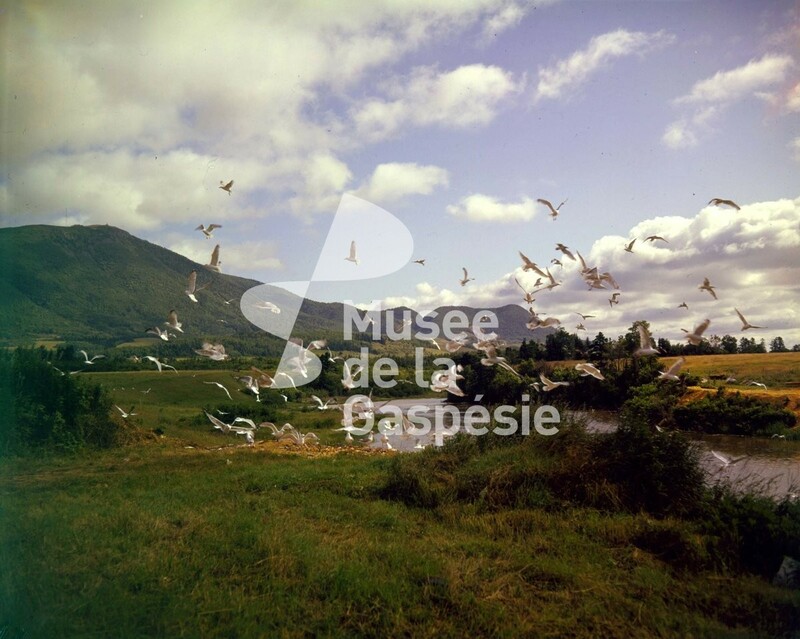 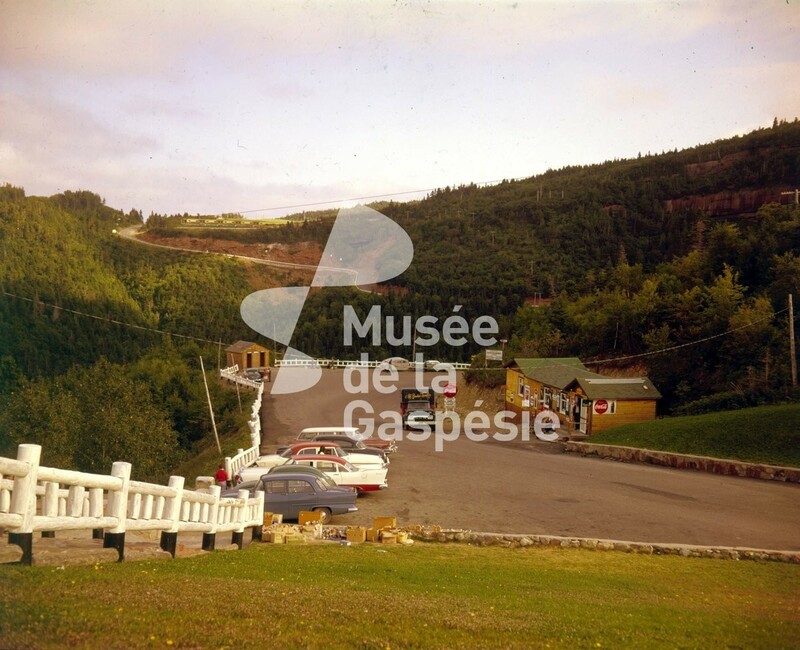 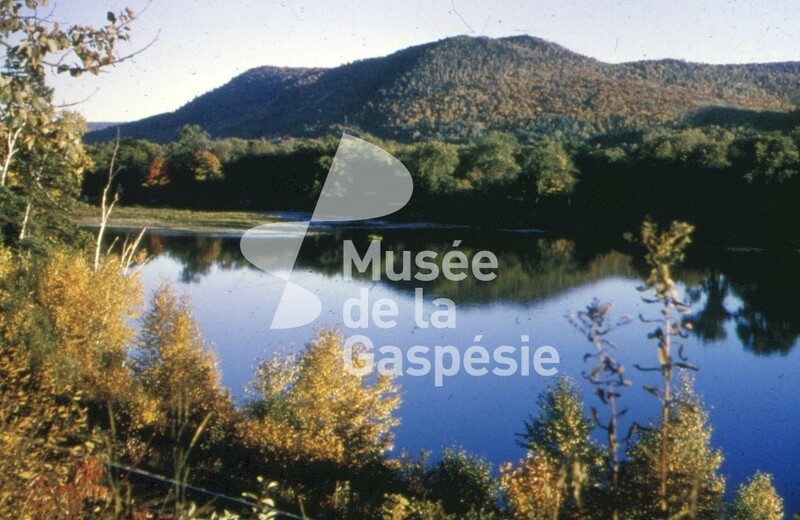 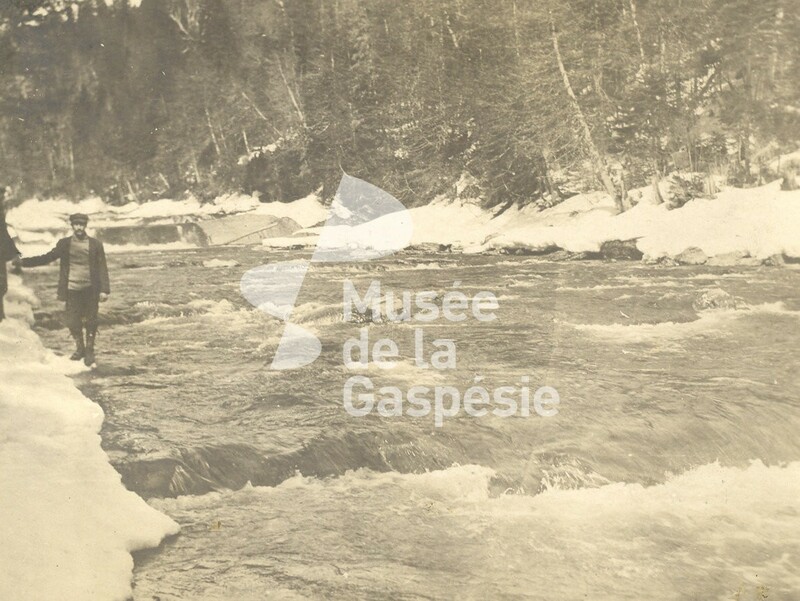 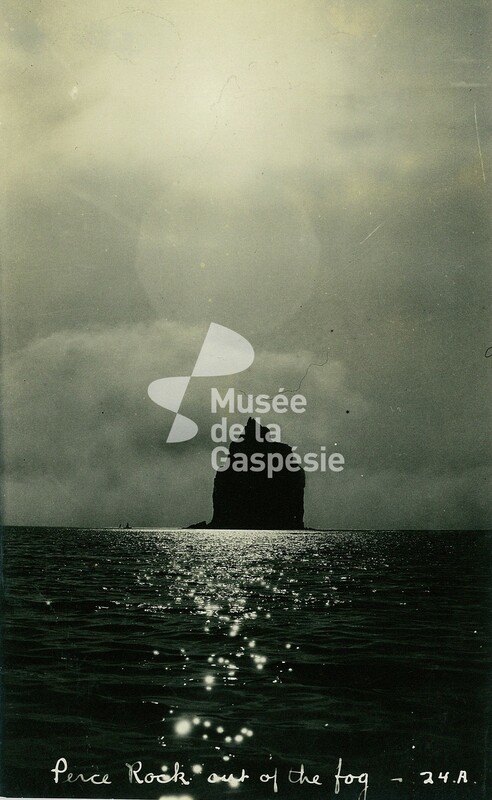 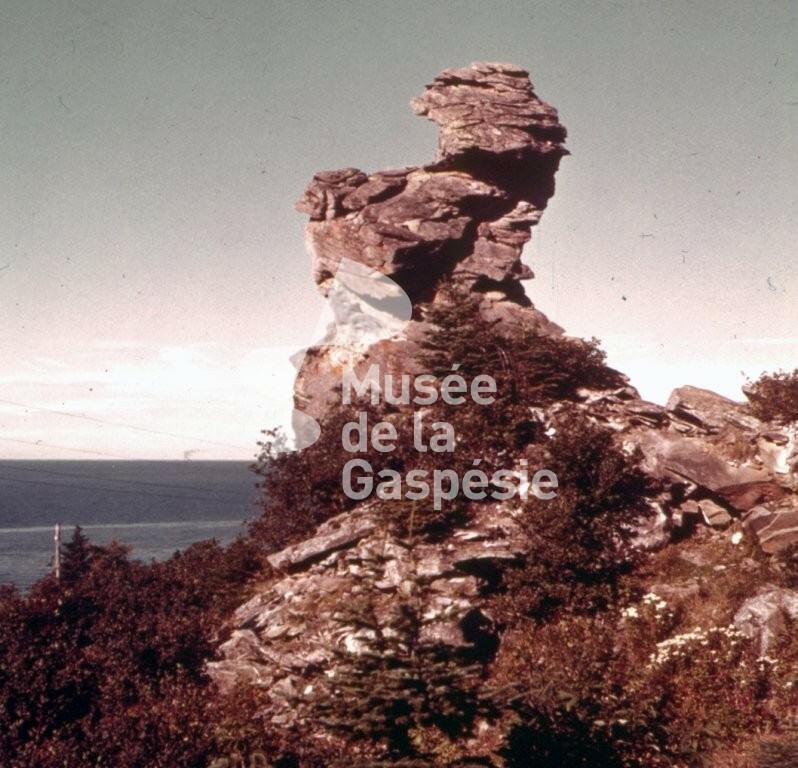 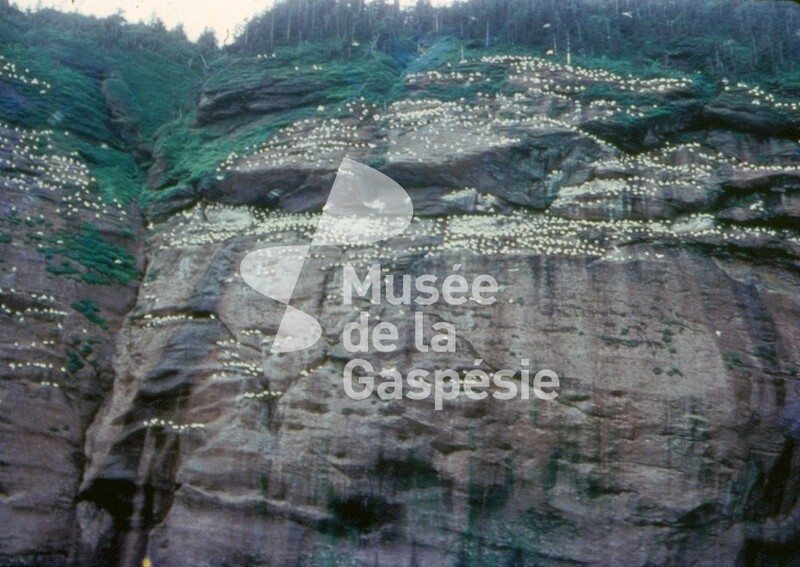 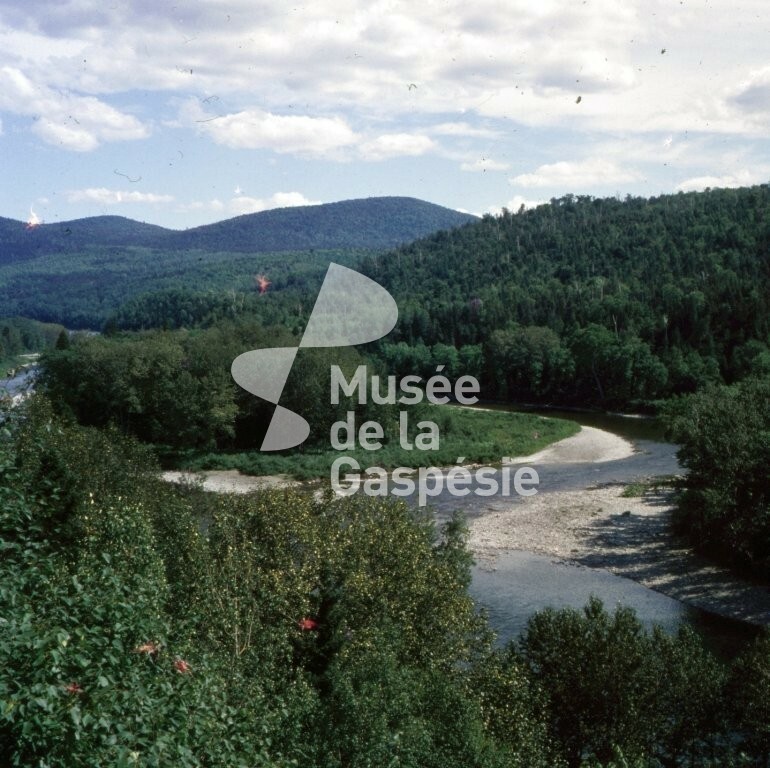 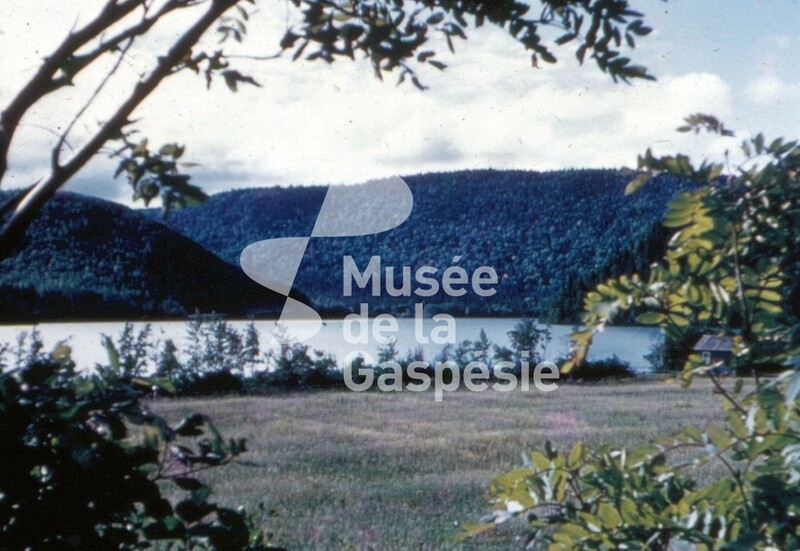 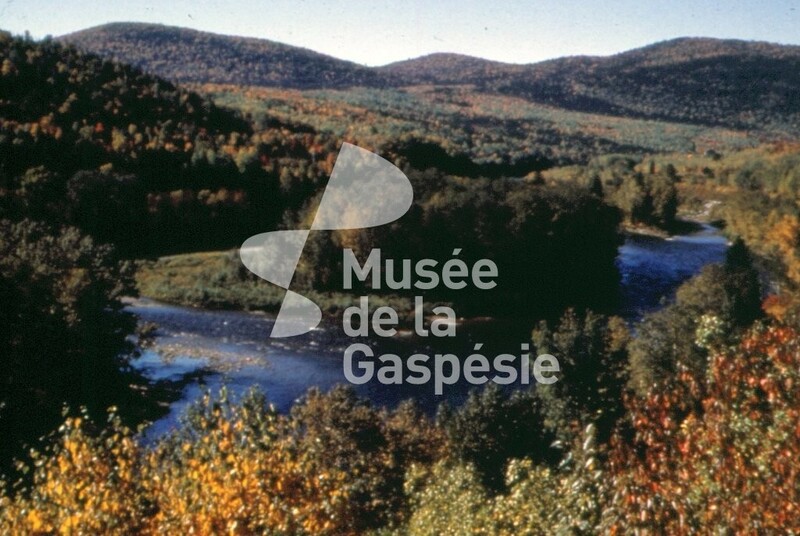 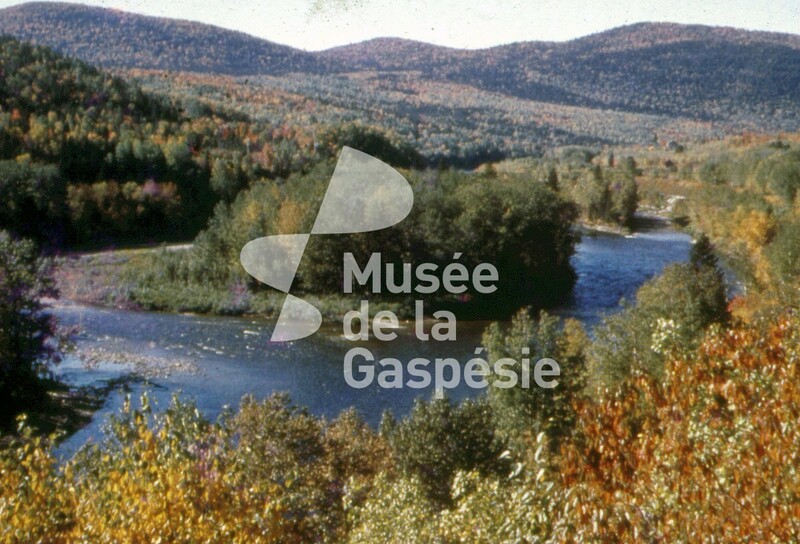 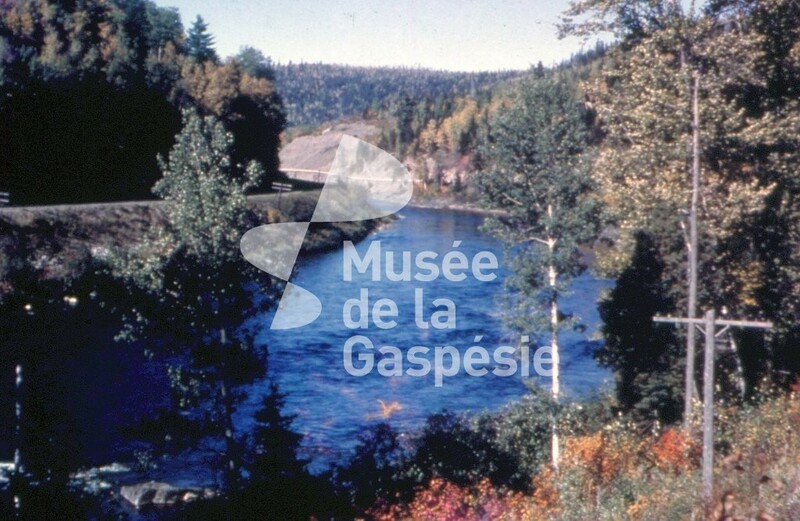 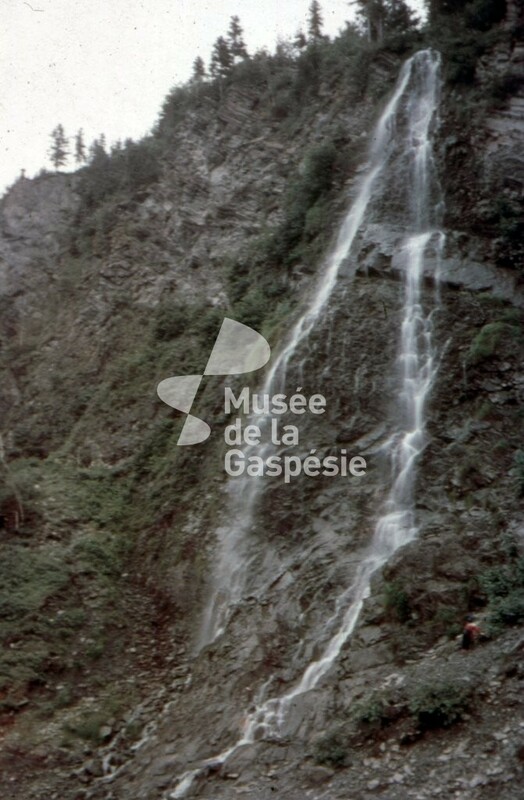 Musée de la Gaspésie. 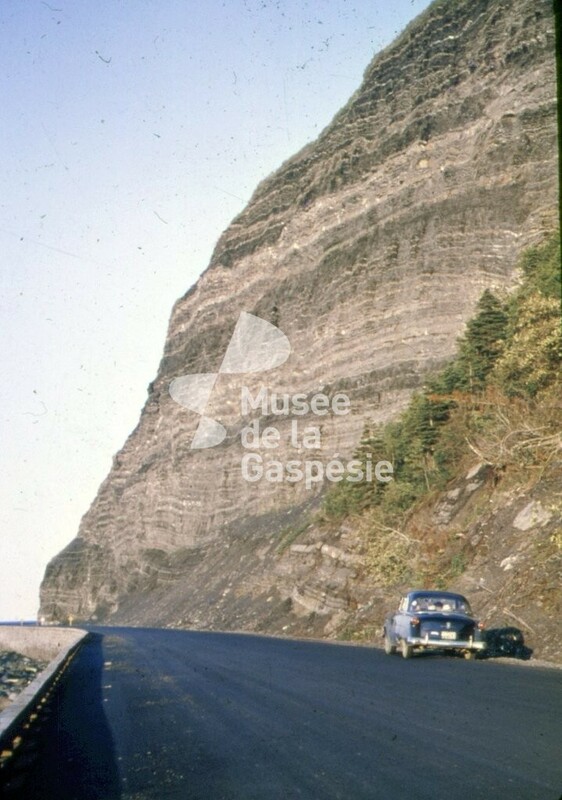 P162 Collection Richard Gauthier. 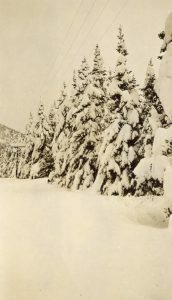 Boîte 5. 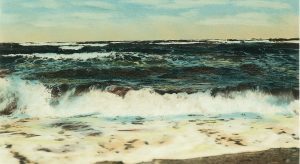 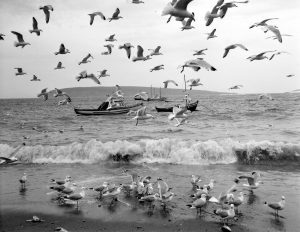 W. Scheuer. 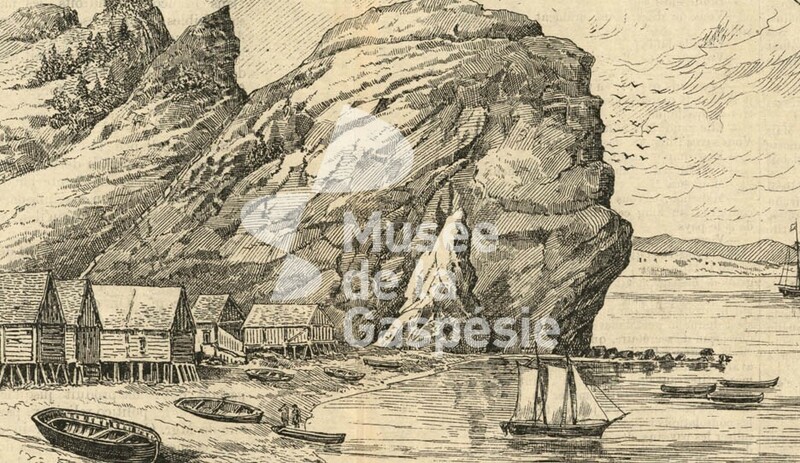 “Phares sur le Saint-Laurent” dans L’Opinion publique, 22 novembre 1877. 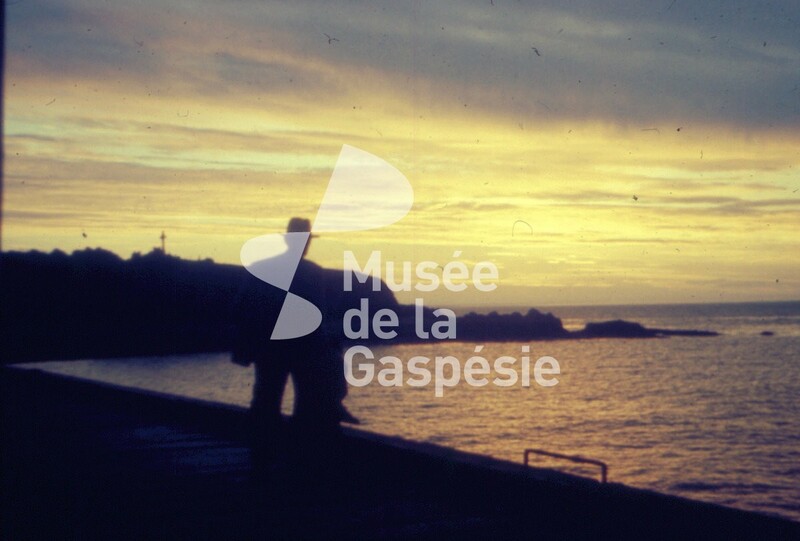 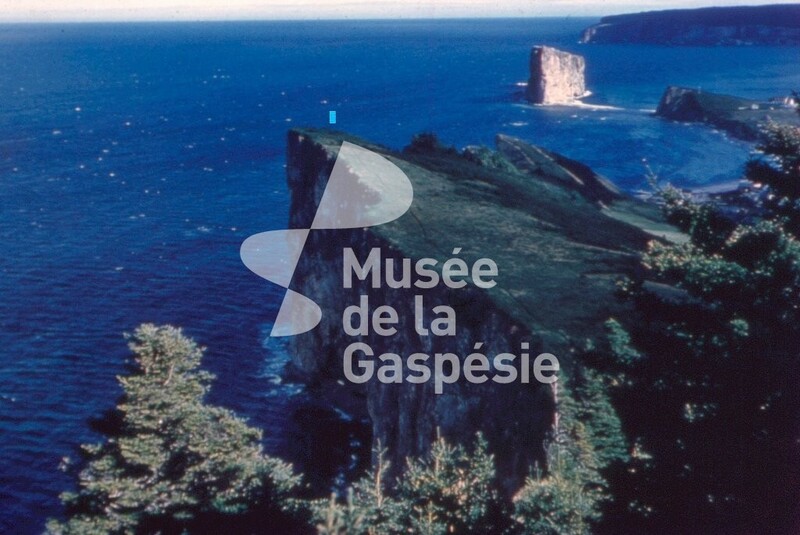 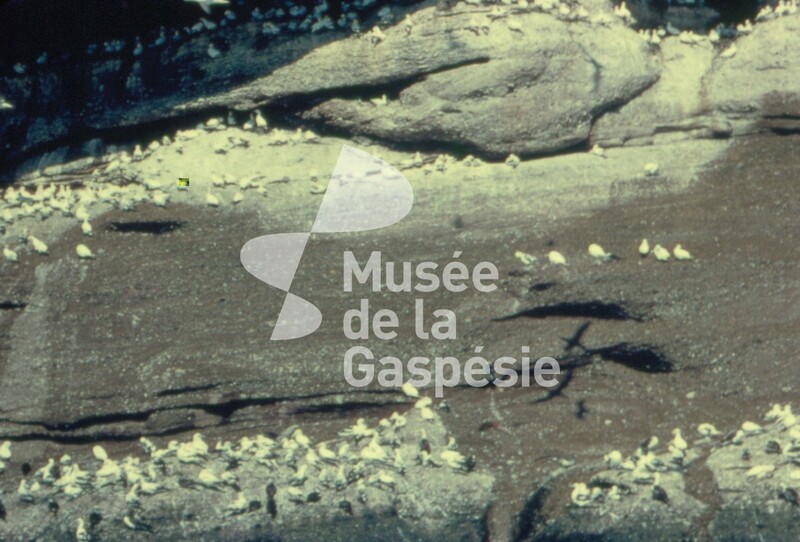 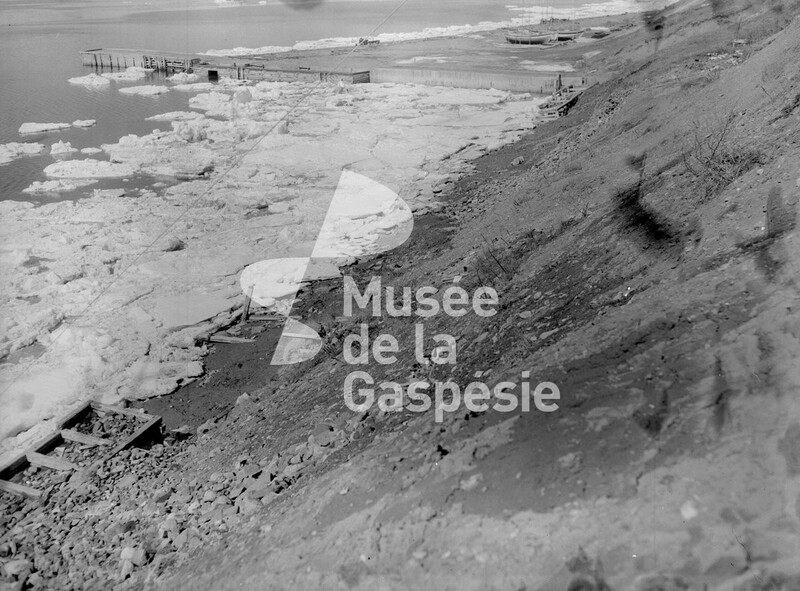 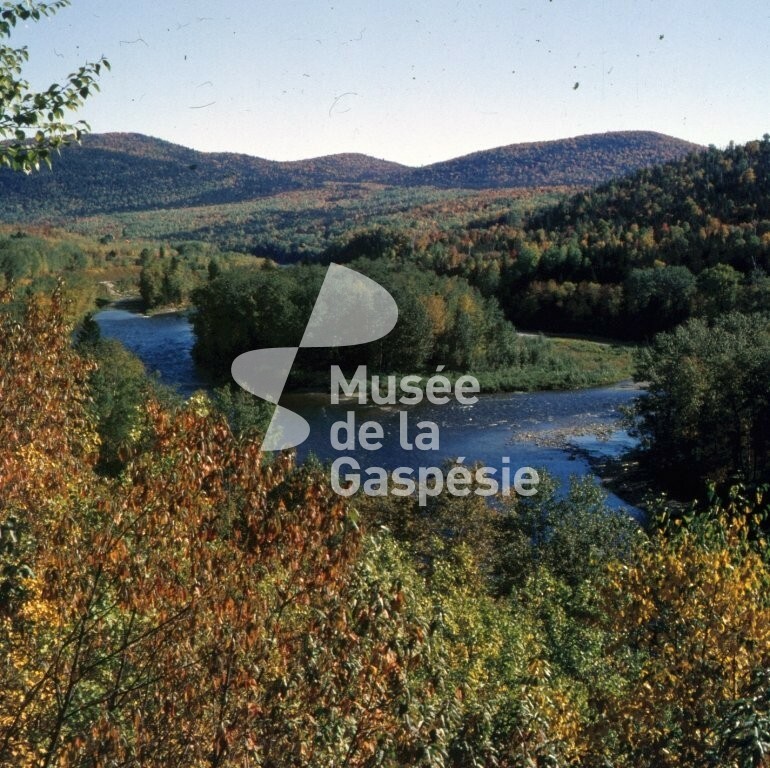 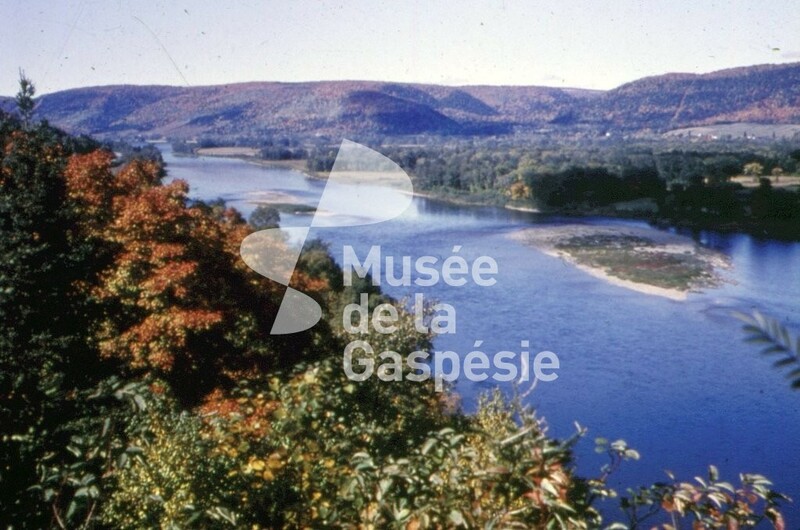 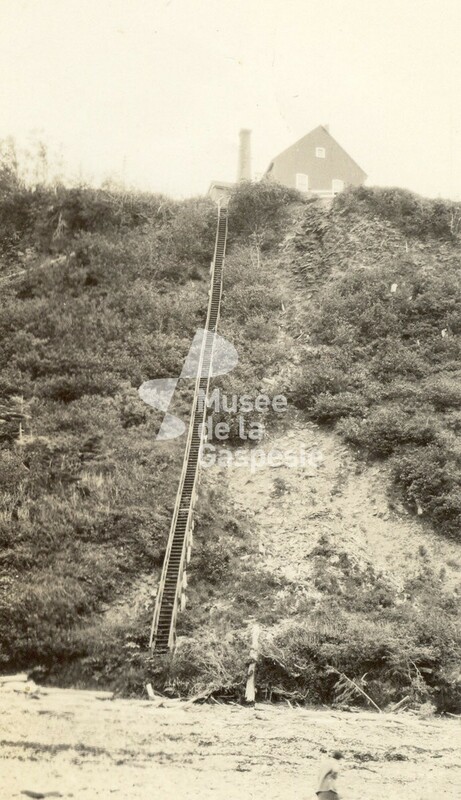 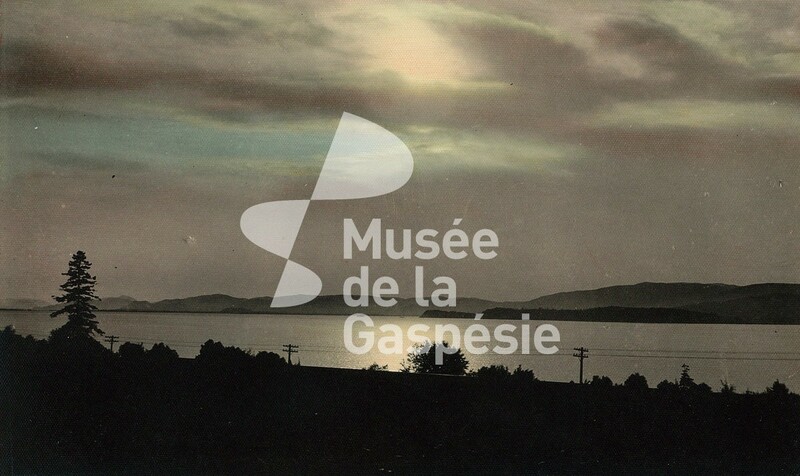 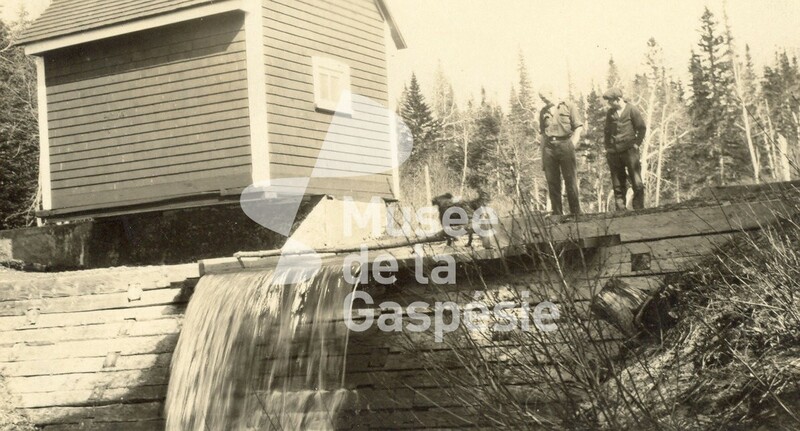 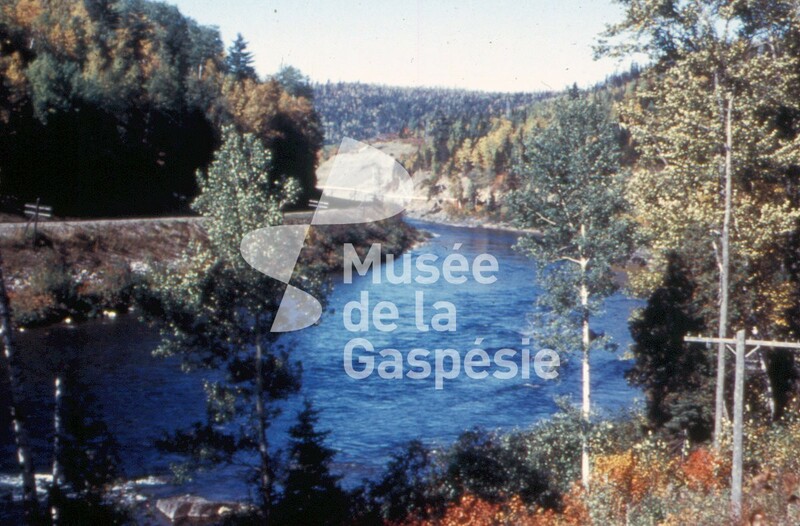 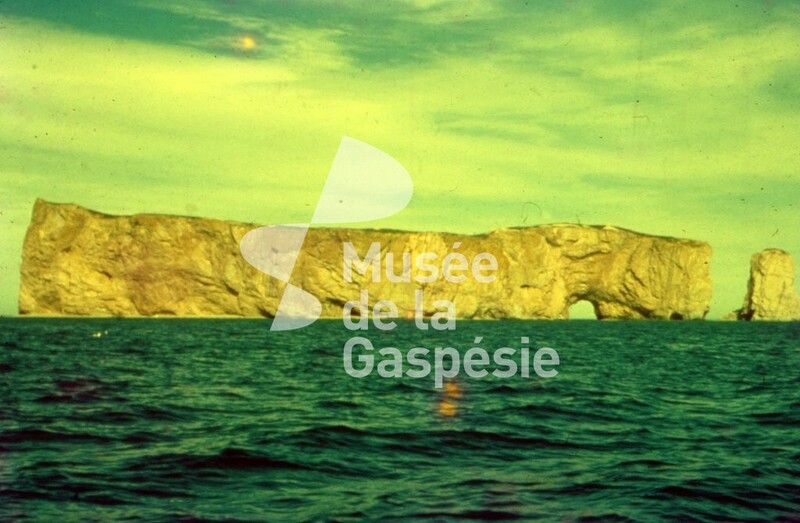 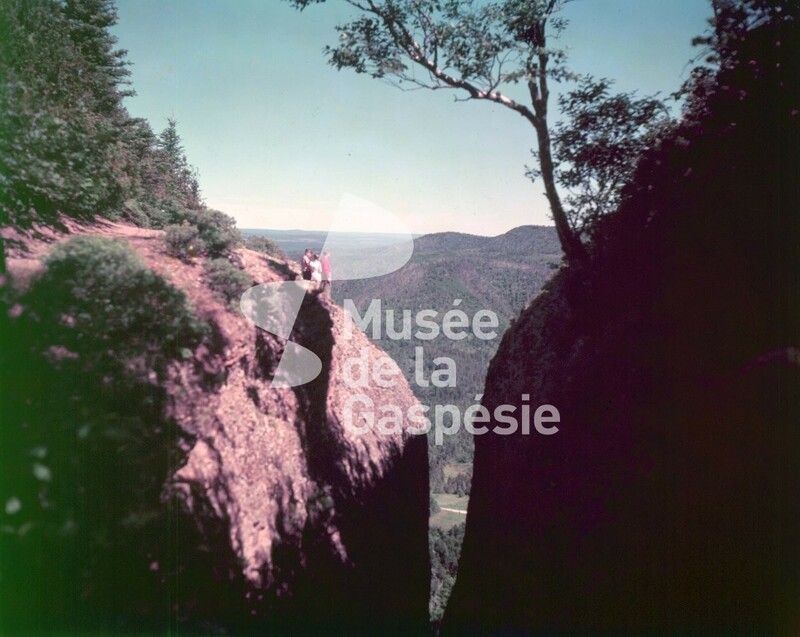 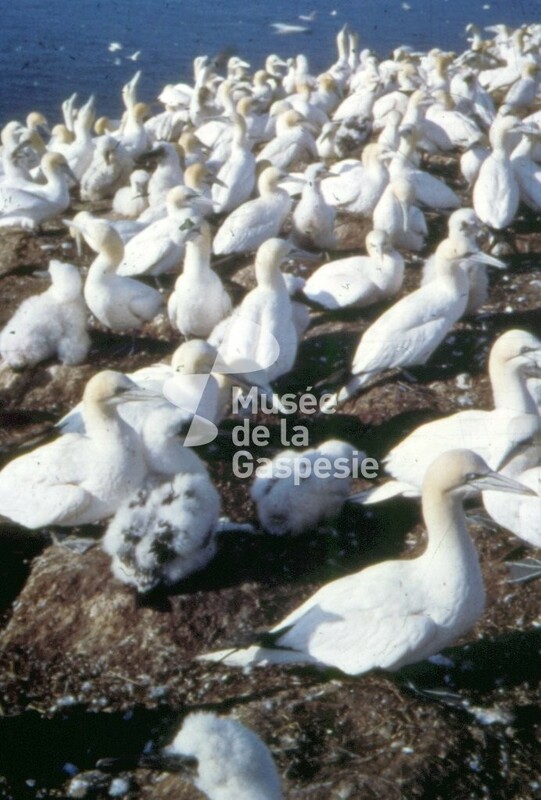 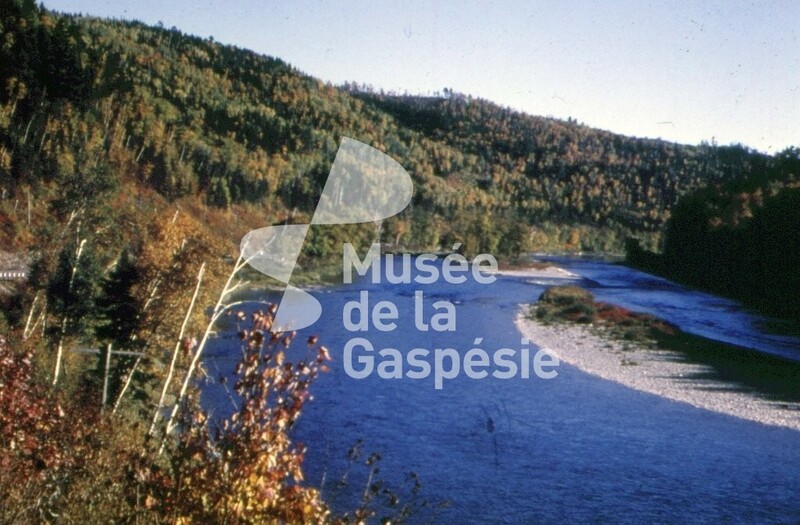 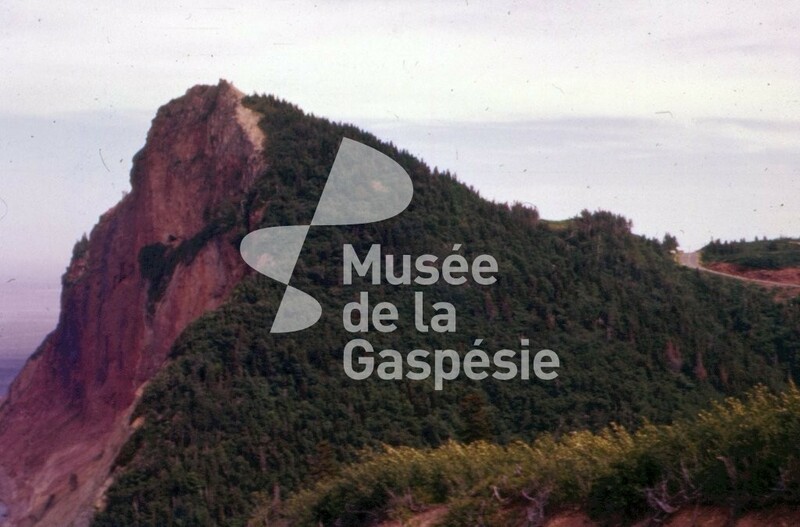 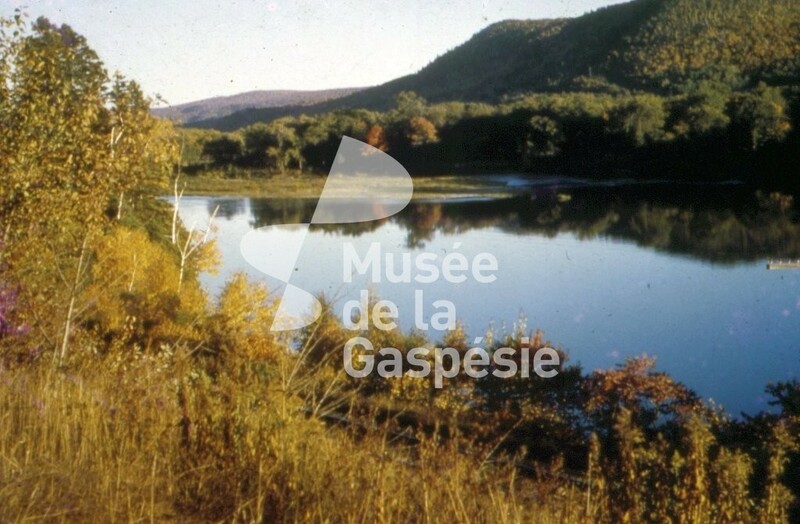 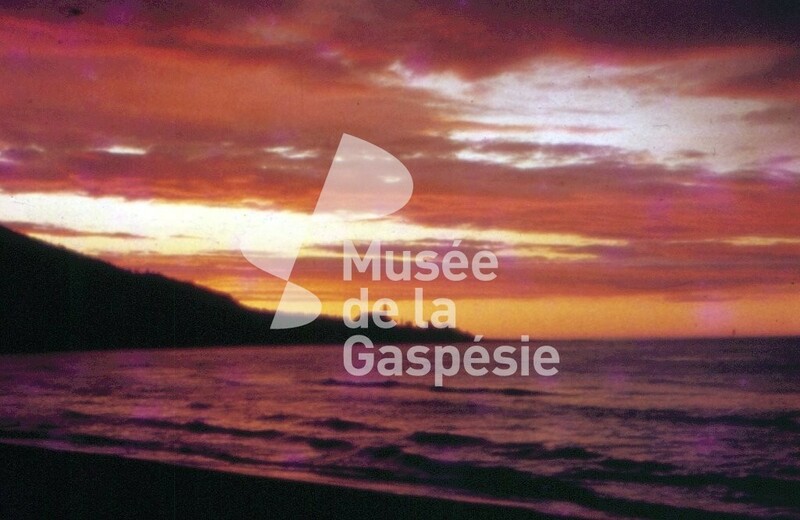 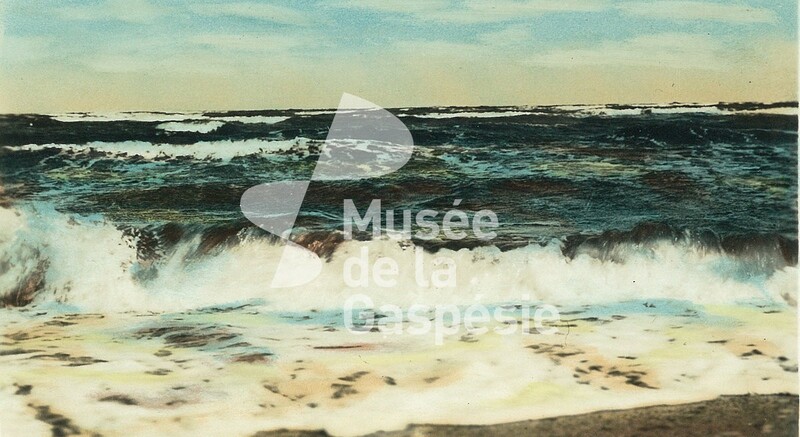 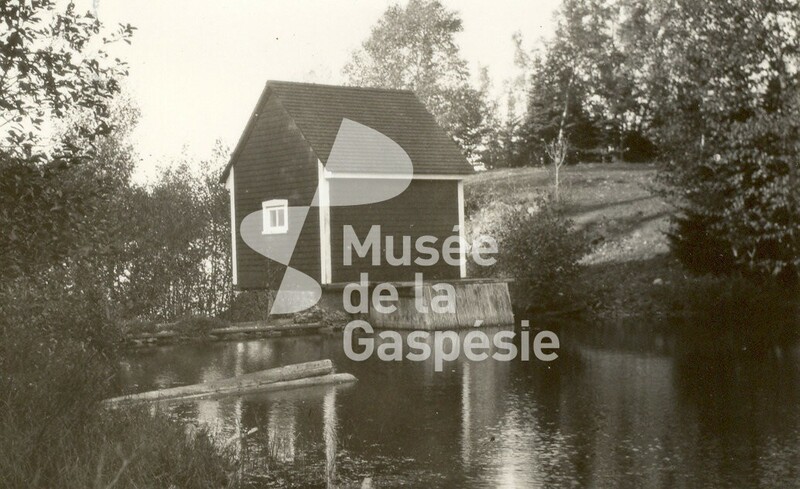 Musée de la Gaspésie. 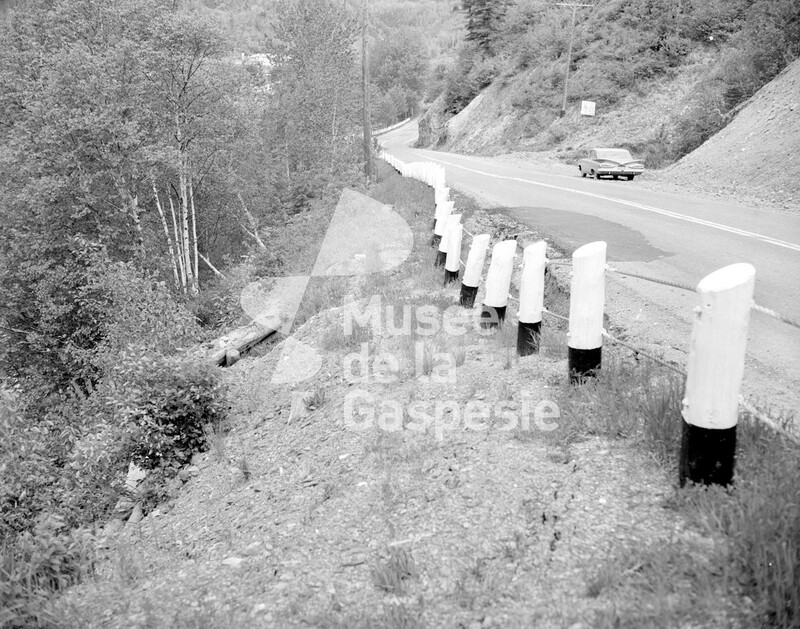 P162 Collection Richard Gauthier. 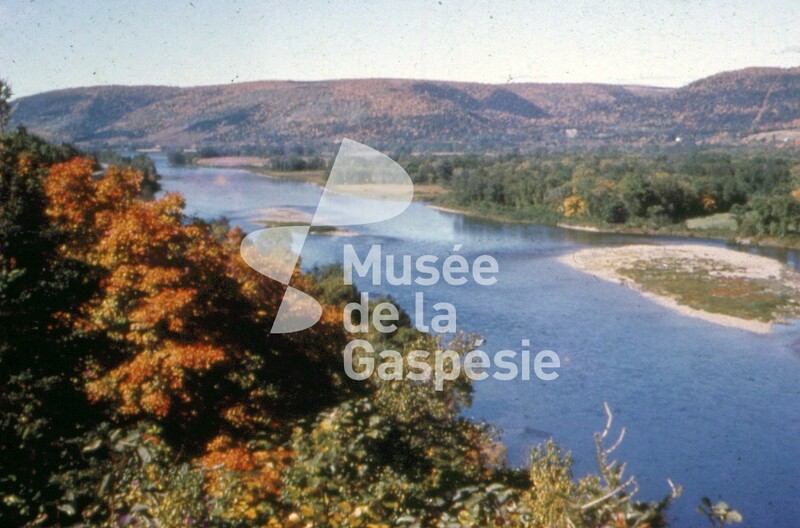 Boîte 1.